If it is longer than it wide, it is called a vertical work (竪物, tatemono?) 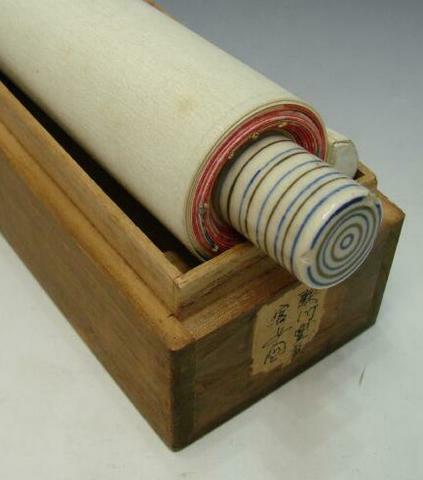 or Standing Scroll (立軸, tatejiku); if it is wider than it is long, it is called a horizontal work (横物, yokomono) or horizontal scroll (横軸, yokojiku). 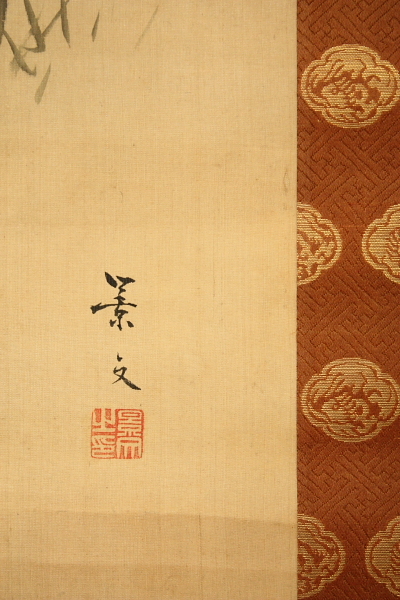 The “Maruhyōsō” style of kakejiku has four distinct named sections. The top section is called the “ten” heaven. 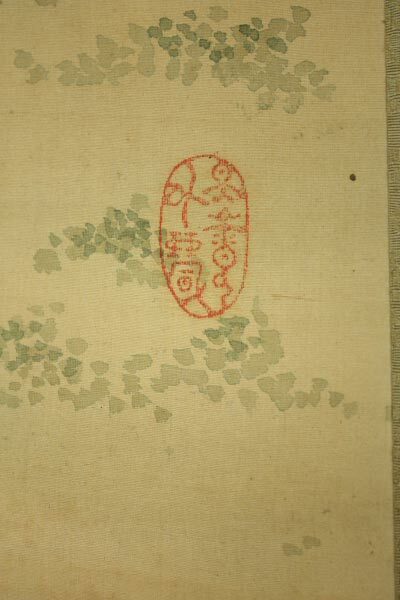 The bottom is the “chi” earth with the “hashira” pillars supporting the heaven and earth on the sides. 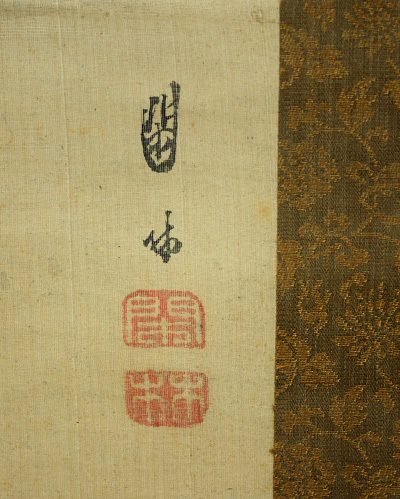 The maruhyōsō style, (not pictured above) also contains a section of “ichimonji” made from “kinran” gold thread.On observation, the Ten is longer than the Chi. This is because in the past, Kakemono were viewed from a kneeling (seiza) position and provided perspective to the “Honshi” main work. This tradition carries on to modern times. 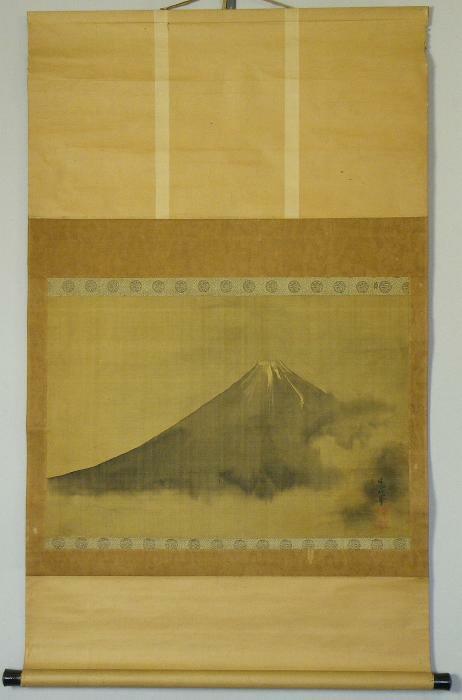 The Taishō period (大正時代, 1912 – 1926) were the last years when traditional Japanese hanging scrolls enjoyed popularity. After Wold War II, together with growing appreciation of Western fashion and life style, as well as the industrialization and rapid development of Japan, the understanding of true Japanese aesthetics has declined dramatically. 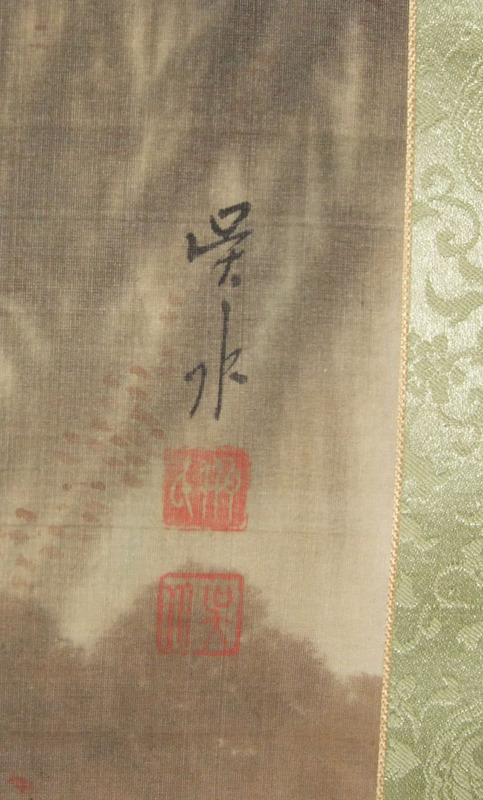 Nowadays, the number of hanging scroll enthusiasts is very small, and the art of calligraphy, once again, has become a secret knowledge pursued only by a few. 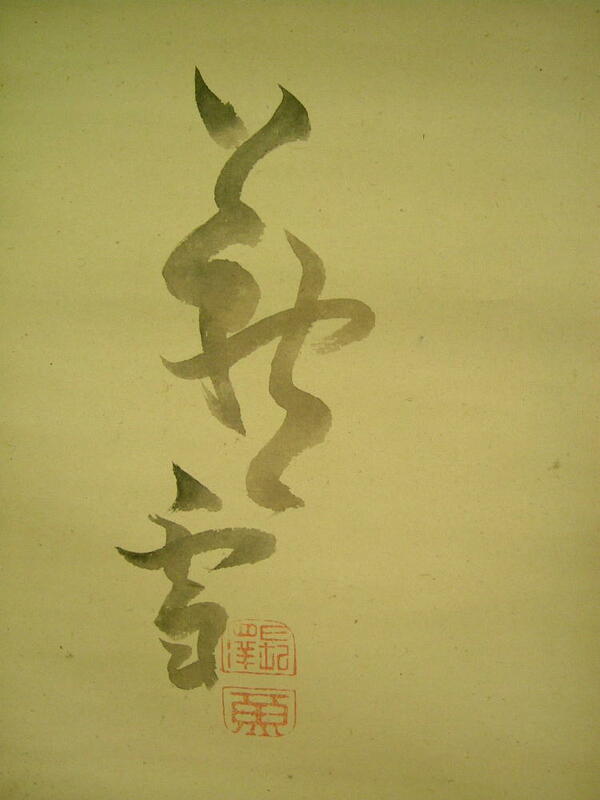 Akamatsu Unrei (1892-1958).Japanese artist.He was born in Osaka. His real name was Yoshisuke. He studied painting with Koyama Unsen and Fujii Tikugai. Asai Seishu (1796-1862) He studied under Shibata Gido & Matsumura Keibun. He made a tour various places such as Nagasaki and his name was known. 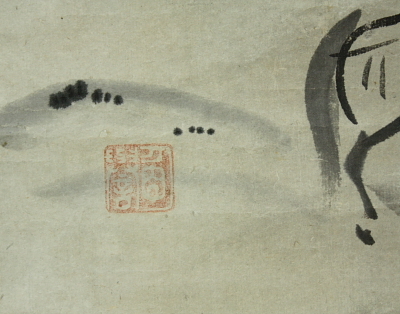 He is skillful in drawing the monkey, and his technique is not inferior to Mori Sosen. 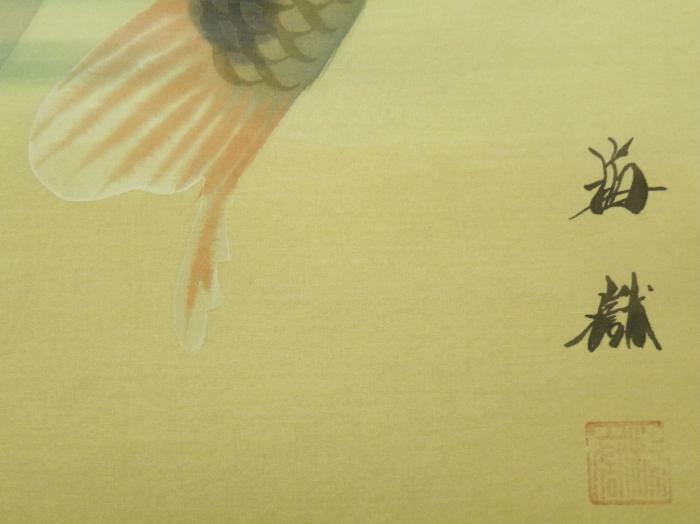 His work was loved by the Owari (Aichi prefecture)feudal lord.Yoshida Kaun & Sosen brothers were his pupils. Bokudo Sato ( 1947-existence ). He is a very famous monk from Hyogo prefecture. He was the chief priest of a famous Fukuju-In temple. The Fukuji-In temple is a smaller Zen temple of great Daitoku-ji Temple. Chikuho Mizuta(1883-1958). He is a very famous Japanese painter from Osaka. He studied under a great painter Chikugai Himejima. And his younger brother Kenzan Mizuta is a famous painter, too. Cho Gettai (1812-1875)He was a eldest son of Cho Gessho, born in Omi (Shiga prefecture). He studied painting under his father. Cho Gessho (1770–1832)He was a pupil of Matsumura Goshun. 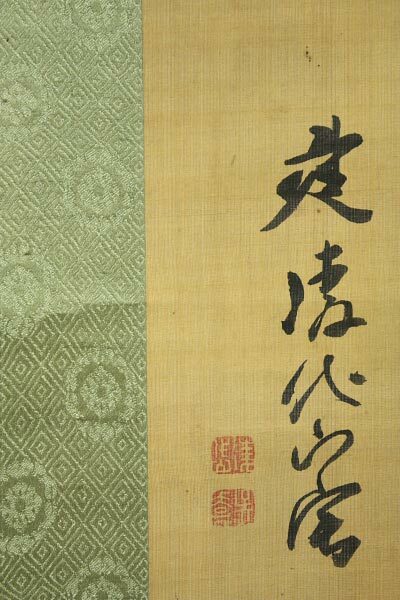 He lived in Nagoya prefecture, painted some works in the castle,the sliding door, and the folding screen, etc. He was on friendly terms with Nagasawa Rosetsu. Daitokuji Meido Sosen (1768-1837)The Rinzai sect Daitoku temple priest. He was 429th head of the Daitoku temples. He was born in Kyoto. He studied painting under Morikawa Sobun. 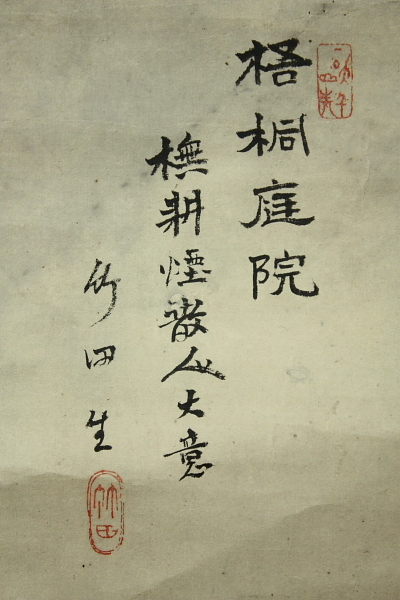 Dong Qichang (1555–1636), courtesy name Xuanzai, He was a Chinese painter, scholar, calligrapher, and art theorist of the later period of the Ming Dynasty. Ebisuya Rikei (act 19th century)He acted in early Showa (1926-1950)period. He was born in Ehime prefecture.He studied under Noda Kyuho.He painted Flower & Birds very well.Rikei researched Takeuchi Seiho’s painting style. Emori Seiun Precise date of birth & death are unknown. He acted in Meiji-Taisho period. He studied under Mori Kanzan. Fujimoto Tesseki (1816-1863) He was a loyalist, calligrapher and painter in late EDO period(Bakumatsu). 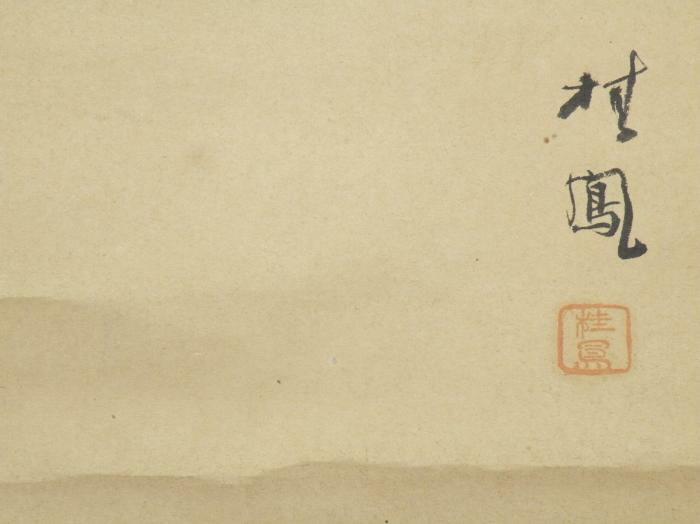 He organized TENCHU-GUMI(19th century pro-Imperial group)in 1863. Fujita Nankei (act 1830-1843) He acted in Kyoto,tempo EDO period. 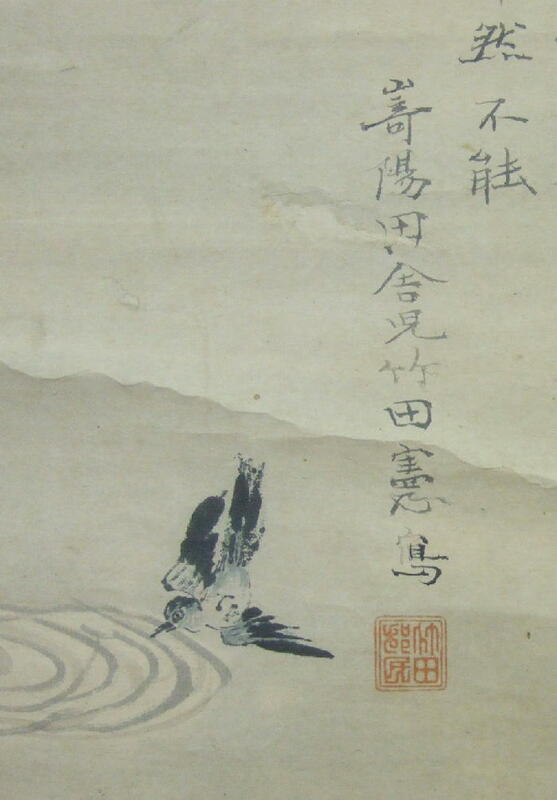 Ganku (1749 or 1756 – 1839), or more formally Kishi Ganku, was a noted Japanese painter of the late Edo period and founder of the Kishi school of painting. He is perhaps best known for his paintings of tigers. 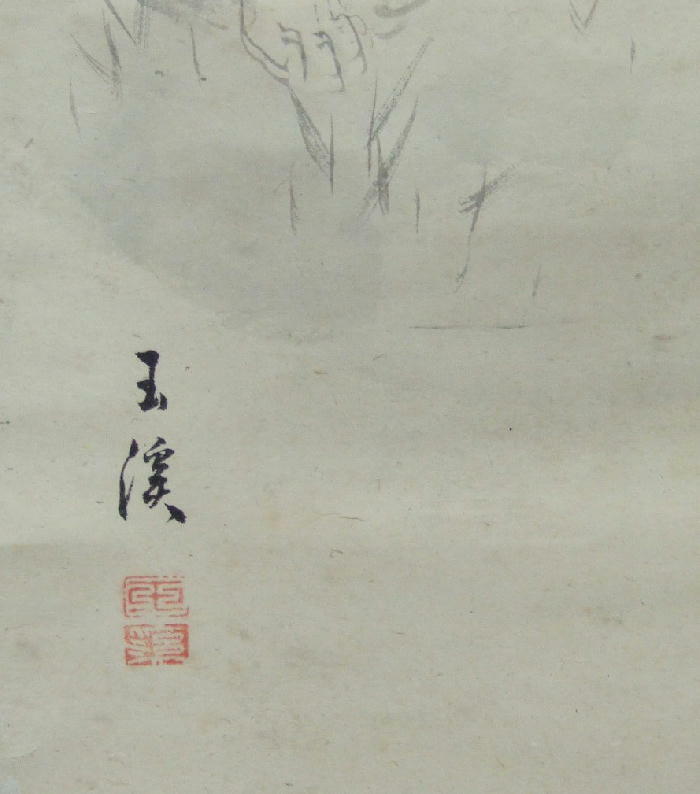 Ganku was born in Kanazawa as Kishi Saeki, studied painting styles including those of Chinese painter Shen Nanpin and the Maruyama school, and arrived in Kyoto around 1780. 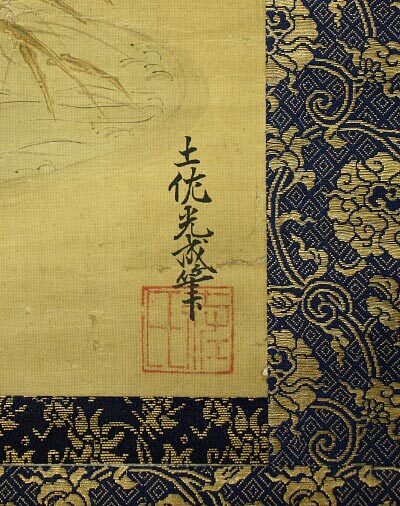 By the late 1700s, Ganku’s paintings were appreciated by patrons that included the imperial family, leading to a position under Prince Arisugawa. 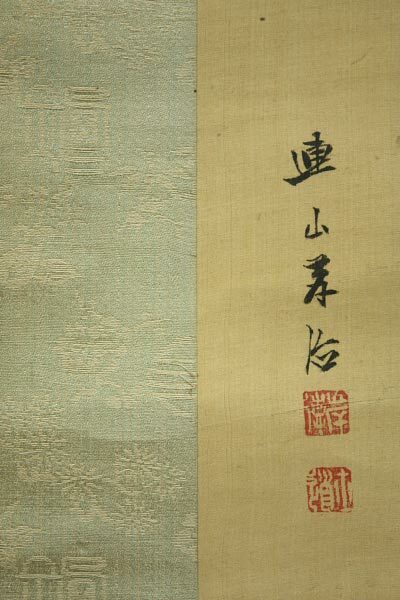 His students included his son, Gantai (1782-1865), son-in-law Ganryou (1797-1852), adopted son Renzan (1804-59), Yokoyama Kazan (1784-1837), Shirai Kayou (fl. 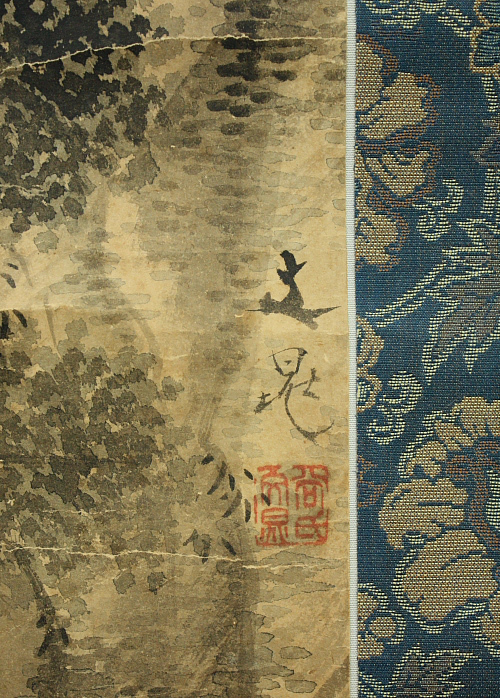 ca 1840-60), and Kawamura Bumpou (1779-1821). He was made honorary governor of Echizen (Echizen no kami,) toward the end of his life. 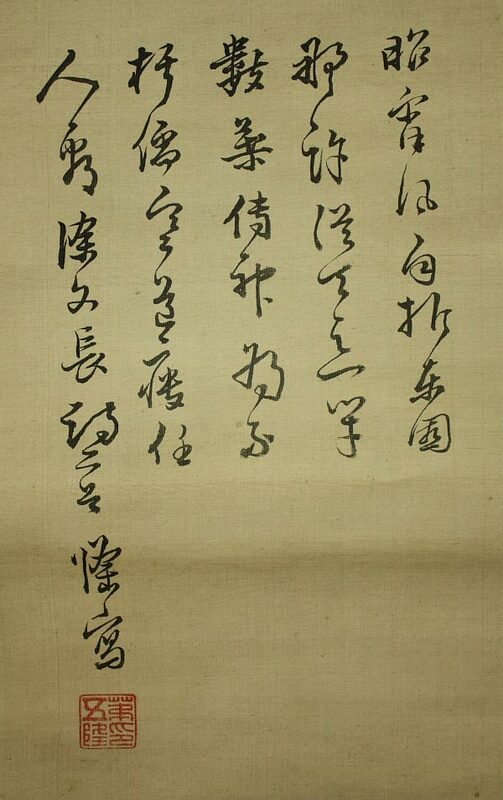 Ganku died on January 19, 1839, in Kyoto. Gochiku Nakabayashi(1827-1913). 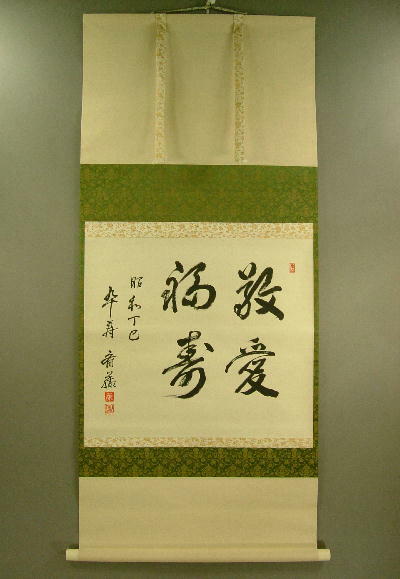 He is a very very famous calligrapher from Saga prefecture. 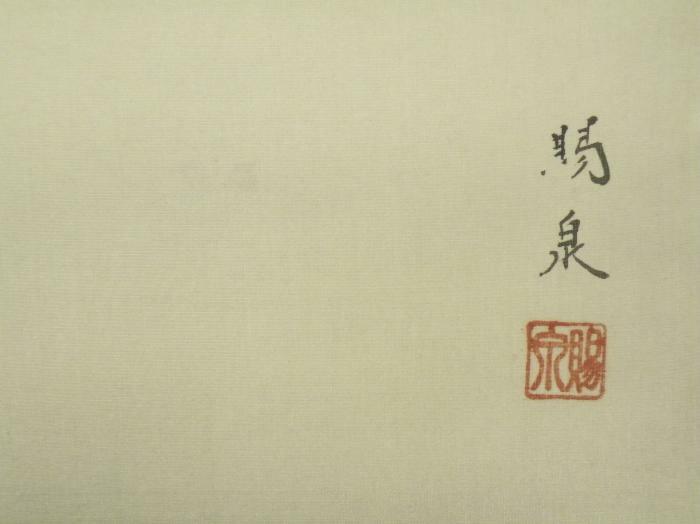 He was named the three major calligraphers of the Meiji era. 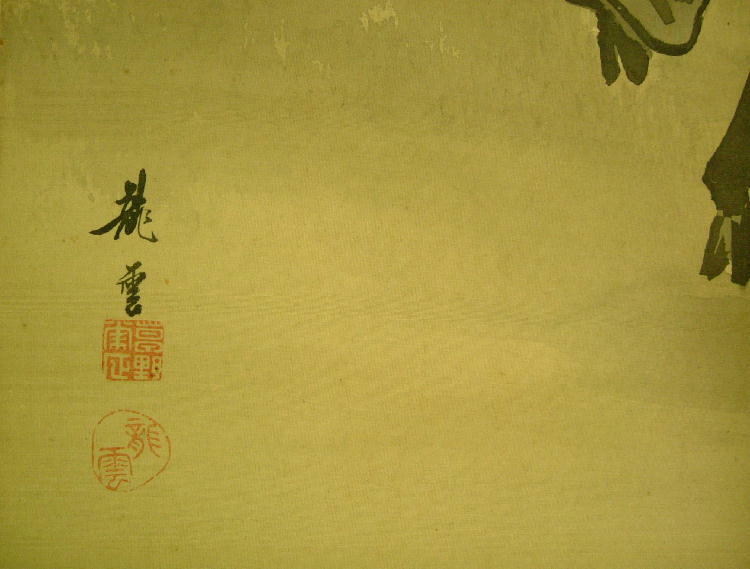 HANABUSA ITCHO (1652 – 1724) Painter at the middle part of the Edo period. Born in Osaka. Learned painting technique from Yasunobu Kano. Became a patriarch of the Iccho school. 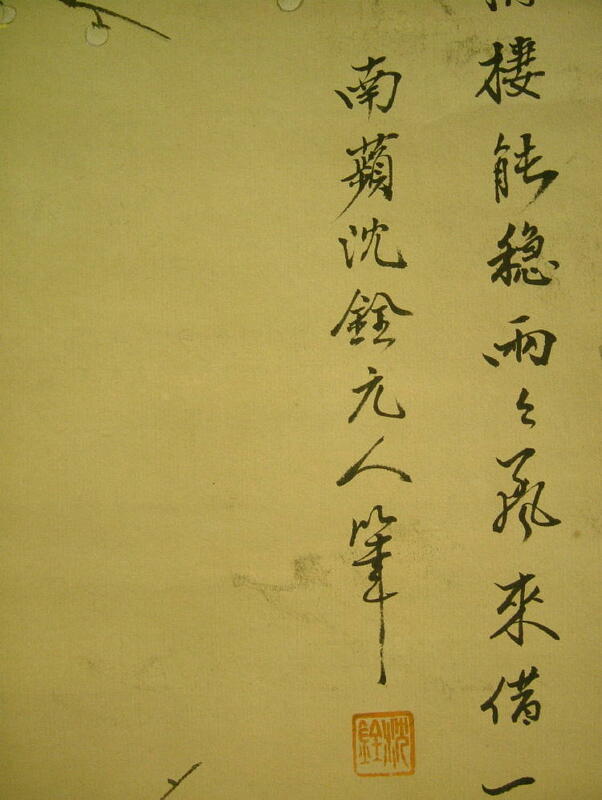 He also learned Haiku poem from Basho Matsuo. His pen name for Haiku is Gyoun. 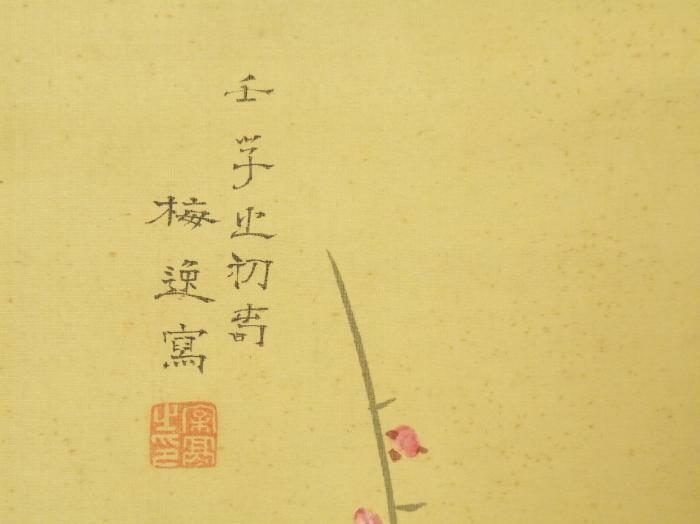 Hanabusa Itcho (1652-1724) was a Japanese painter, calligrapher, and haiku poet. He originally trained in the Kano style, under Kano Yasunobu, but ultimately rejected that style and became literati. He was also known as Hishikawa Wao and by a number of other art-names. Born in Osaka, and the son of a physician, he was originally named Taga Shinko. He studied Kano painting, but soon abandoned the school and his master to form his own style, which would come to be known as the Hanabusa school. He was exiled in 1698, for parodying one of the shogun’s concubines in painting, to the island of Miyakejima; he would not return until 1710. That year, in Edo, the artist would formally take the name Hanabusa Itcho. Most of his paintings depicted typical urban life in Edo, and were approached from the perspective of a literati painter. 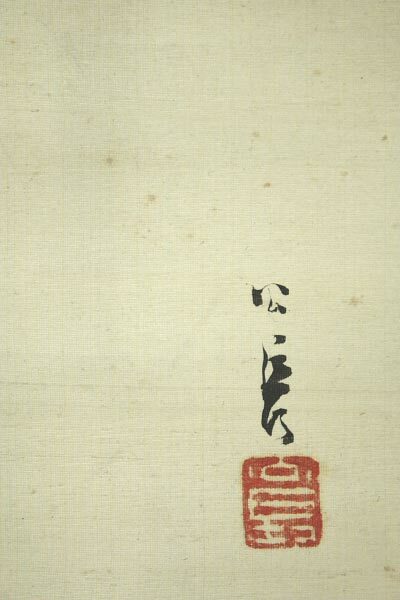 His style, in-between the Kano and ukiyo-e, is said to have been “more poetic and less formalistic than the Kano school, and typical of the ‘bourgeois’ spirit of the Genroku period”. 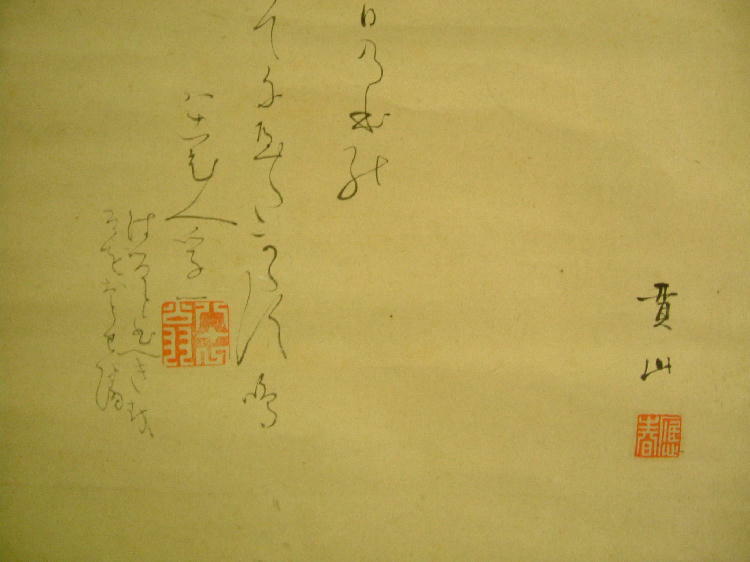 Hanabusa studied poetry under the master Matsuo Basho, and is said to have been an excellent calligrapher as well. Hanabusa Ikkei (1751-1843) He was born in EDO,son of Hanabusa Issen.His real name is Nobushige.Ikkei was a pupil of Ko-Sukoku. Hara Zaisho (1813－1872)He was a a Hara Zaimei’s son-in-law.Zaisho studied painting under Zainei,and he became the 3rd head of Hara-school. Haruki Nanko (1759 – 1839)　was born in Edo. He was in the service of Masuyama Sessai, who paid for his travels to Kansai and Nagasaki.In Osaka he was a pupil of Kimura Kenkadō. 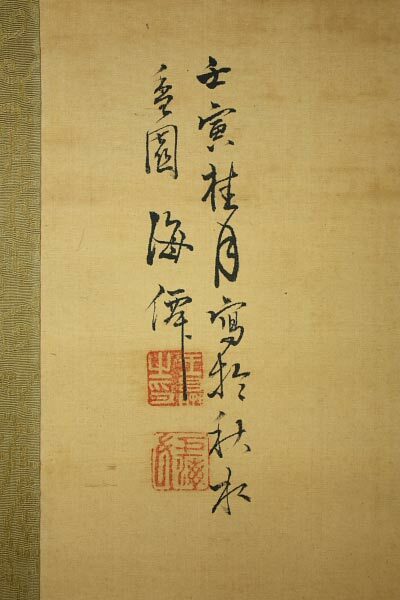 Later he studied the southern Chinese style in Nagasaki. Haruki Nanmei (1795 – 1878)　He was born in Edo in 1795. He studied painting under his father, Haruki Nanko. 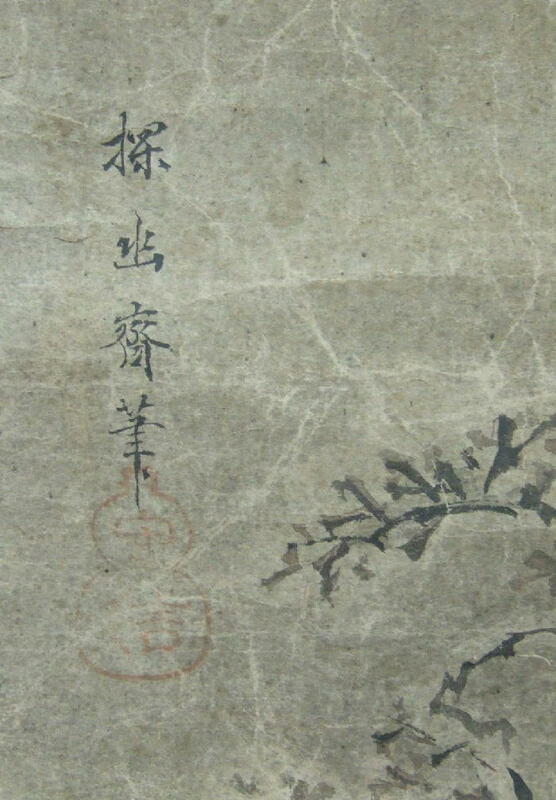 Nanmei became a specialist of kachoga (bird and flower) and Sansui paintings. Haruna Ryushu (1880-???? )school painter. Born in Hyogo prefecture. He studied under Wakabayashi Shokei.He lived in Osaka. Hashimoto Dokuzan (1869-1938)The Rinzai sect Sokoku temple’s superintendent priest.He was born in Niigata.He studied Zen with Tenryu temple’s Gazan.He studied painting with Tomioka Tessai. Hashimoto Gaho , born August 21, 1835 – January 13, 1908 was a Japanese painter, one of the last to paint in the style of the Kano school. Born in Edo, he studied painting under Kano Shosen’in, and was influenced as well by the work of Kano Hogai. He created many works in the traditional style of the Kano school, using color & gold, or otherwise monochrome black ink. But while his paintings are very much the works of a traditionalist, using traditional methods and depicting traditional subjects, Gaho, like Kano. 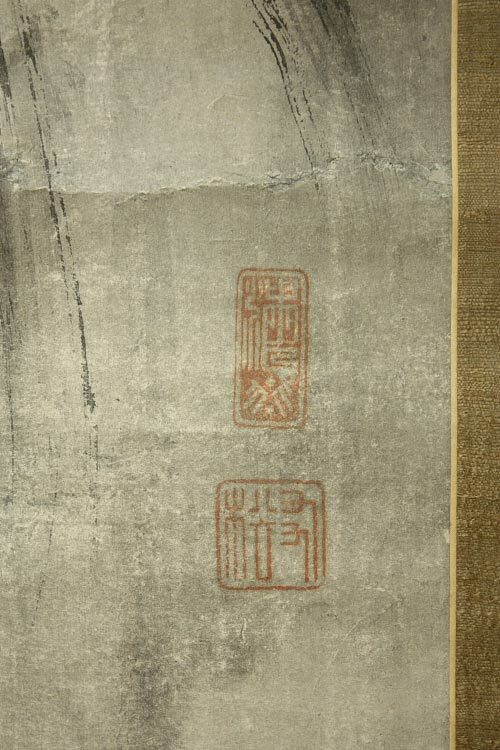 Hogai, incorporated elements of Western art as well. 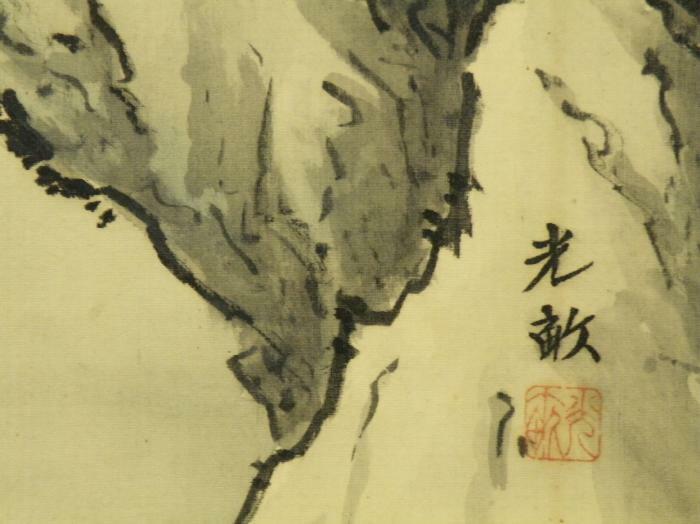 Brush-strokes, various types of detailing, and in particular, attempts at the proper depiction of perspective are evident in Gaho’s paintings and in many others of this period. He opened his own studio in 1860, but the political and economic upheavals surrounding the Meiji Restoration forced Gaho to seek income in other ways than by selling fine art. He produced maps for the Naval Academy, painted on fans, and used his skills in a number of other ways to earn a living. 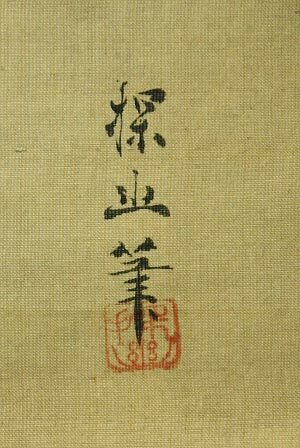 Gaho was invited in 1884, by Okakura Kakuzo, to become the chief professor of painting at the T0kyo Bijutsu Gakko now the Tokyo National University of Fine Arts and Music. 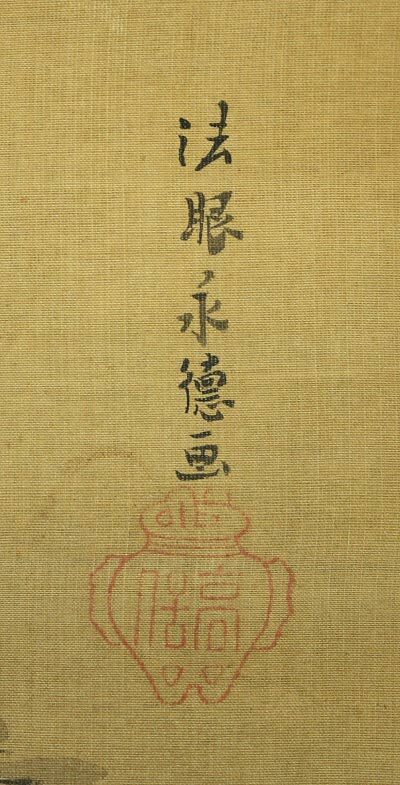 In 1898, Gaho joined Okakura in leaving the Bijutsu Gakko, and founding the Japan Fine Arts Academy. He would teach there until his death in 1908. As a result of his position as chief painting professor, Gaho had a number of important pupils, including Yokoyama Taikan and Kawai Gyukudo. Hashimoto Kansetsu (1883-1945)He was a painter of nihonga (Japanese-style paintings) who was active in the Kyoto art world during the Showa and Taisho eras. 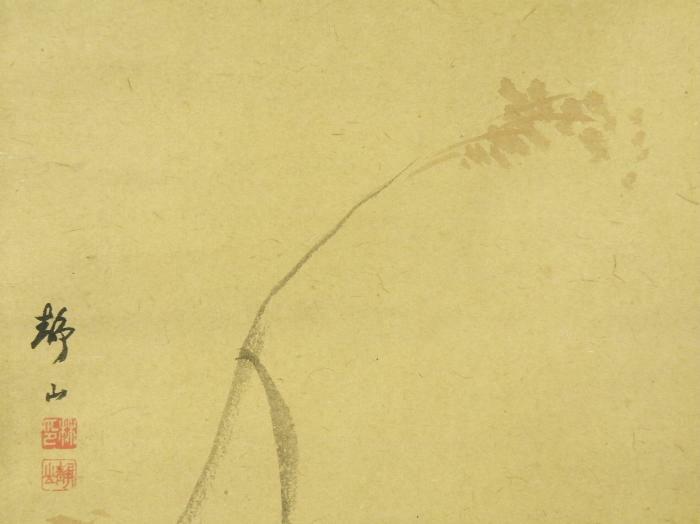 Hatta Koshu (1760-1822) Born in Kyoto.He studied under Maruyama Okyo and excel at figures, flowers and birds painting. He received the honorary title of HOKYO. Hattori Nankaku (1683-1759)Nanga painter .Also a Confucian scholar.Born in Kyoto .At age of 14 to Edo to study under the Confucianist Ogyu Sorai.Later held a minor position in the bakufu(shogunate). 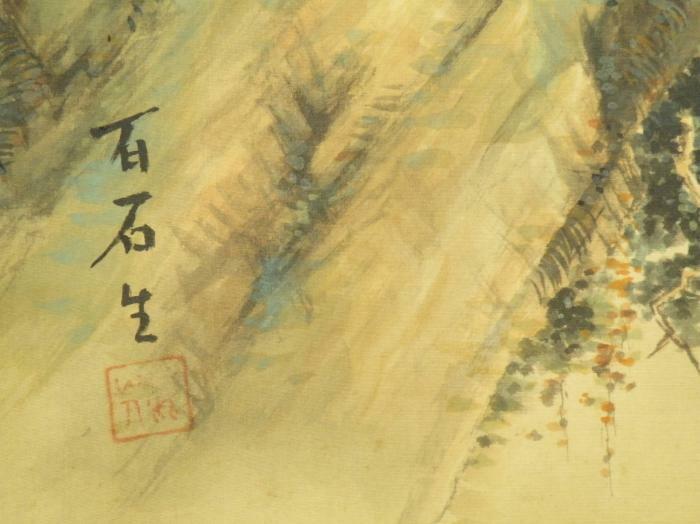 On his own,studied the painting of Shubun and Sesshu.Specialized in landscape and portraiture,working in the Chinese Ch’ing style based on album pantings that had reached Japan through Nagasaki.A pioneer nanga painter. Hyakunen Suzuki(1825-1891). He is a very famous Japanese painter from Kyoto. 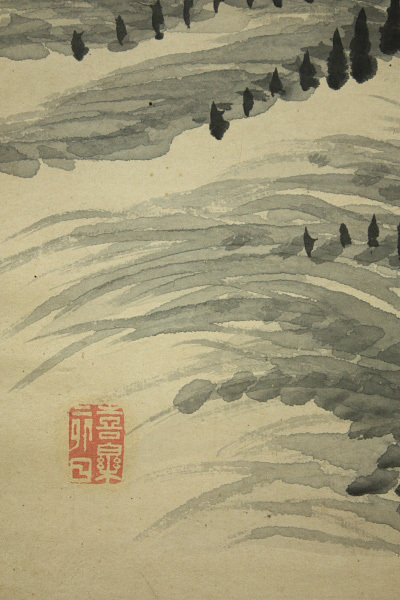 He was good at a landscape painting and a painting of flowers and birds. He brought up many pupils including the son Shone Suzuki. And the pupils were called SUZUKI school painters. Hayashi Gahō (1618 – 1688)He was a child of Tsurusawa Tansaku. He received the title of hogan.His real name was Moriteru. He was a famous and revolutionary Japanese painter and lacquerer of the late Edo period and early Meiji era. In Japan, he is ironically known as both too modern, a panderer to the Westernization movement, and also an overly conservative traditionalist who did nothing to stand out from his contemporaries. Despite holding this odd reputation in Japan, Zeshin has come to be well-regarded and much studied among the art world of the West, in England and the United States in particular. He was a Japanese Neo-Confucian scholar, teacher and administrator in the system of higher education maintained by the Tokugawa bakufu during the Edo period. He was a member of the Hayashi clan of Confucian scholars. He was a Japanese painter also known as Kano Heishiro Sansetsu was apprenticed to Kanō Sanraku, married his daughter, and was adopted by him after the death of Sanraku‘s eldest son. Sansetsu became the leader of the Kanō school. 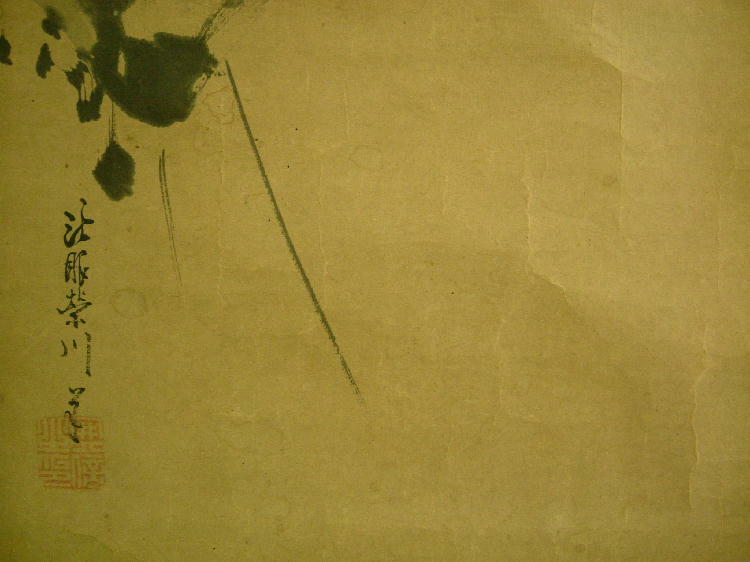 He was a Japanese painter in late Edo period. He was a pupil of Maruyama Oshin. He was a son of Kano Baishun and pupil of Kano Shushin. He was a Tenryu Buddhist Priest. He grew up to study drawing as well as medicine. When he was 19, he went up to Kyoto, where he determined on his loyalty to the Emperor. So, he joined the on-going movement of overthrowing the Shogunate led by Takeuchi Shikibu. 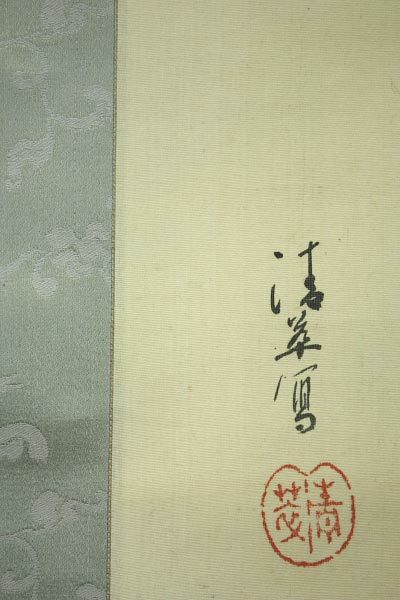 Tenryu Dojin was actively engaged in the movement together with the many Imperial Restoration enthusiasts, such as Yamagata Daisuke.He called himself Shibukawa Kyoan and devoted the rest of his life to reading and writing prose and poetry or drawing. His favorite subjects for drawing were grapes and falcons. Hazama Seigai (1811-1878)Japanese painter. He was studied under Oda Baisen. Hoashi Kyou (1810-1884) He was a leading disciple of Tanomura Chikuden. He was one of last BUNJIN painter. Hokoku Takabayashi (1840-1894). He is a very famous Japanese painter from Tokyo. He was good at a painting of flowers and birds. 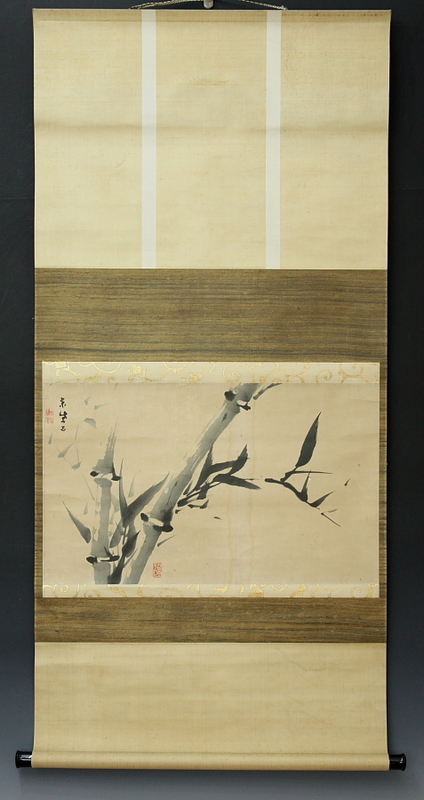 Himejima Chikutei (1895-????) His real name was Hiromichi. He was born in Nara Prf. in 1895. 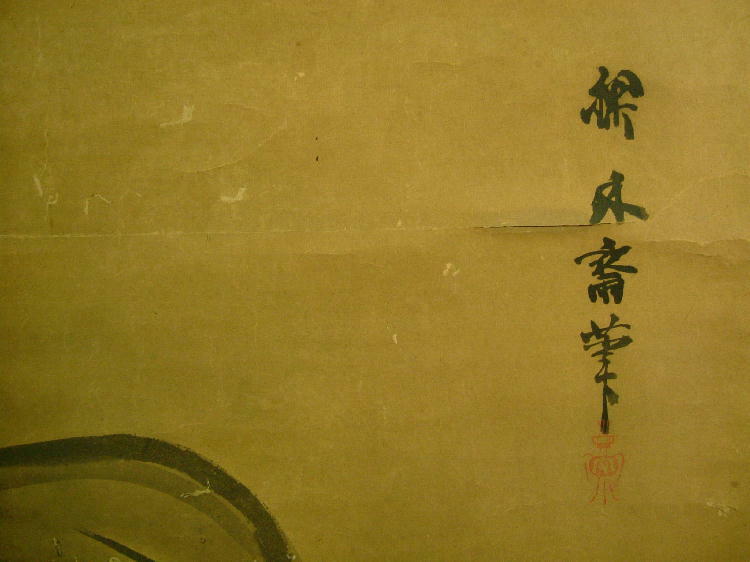 He was the child of Himejima Chikudai, and studied painting with his father. Hineno Taizan (1813-1869) Hineno Taizan was born in Osaka and had a different artist’s name when he was young. Saikai and Kinrin shitou were the two he had used. Trained under the noted Bunjin painter Nukina Suou, and studied the styles of Tetsumon Souou, the great Nagasaki school painter. 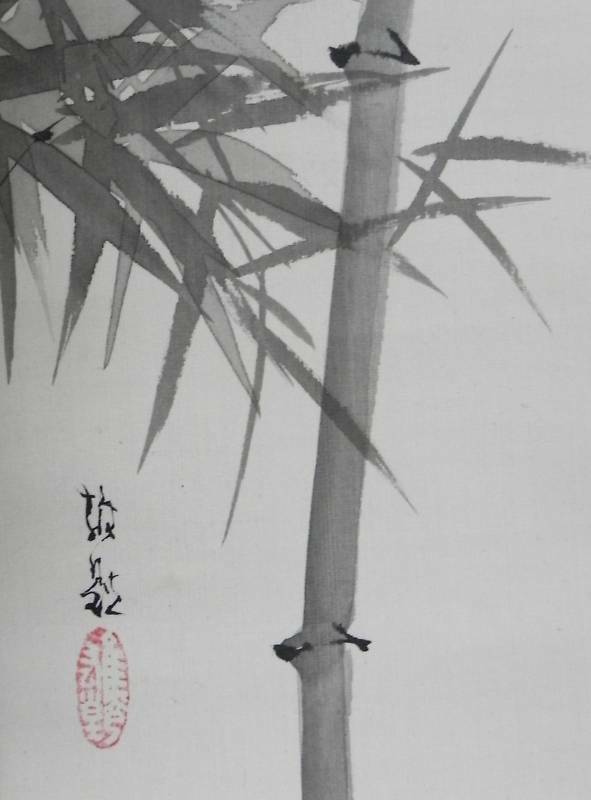 Considered to be the top landscape painters of the Nanga school, Hineno Taizan’s work became highly sought after by collectors for the elegant style and simple form his paintings express. Hirai Baisen (1889-1969) He was born in Kyoto, and graduated at Kyoto Municipal School of Arts and Crafts in 1906. Unlike most young painters who were trained at studios of master painters, Hirai Baisen chose an independent career. His early work shows great vivacity en inventiveness, which declined in his later works. 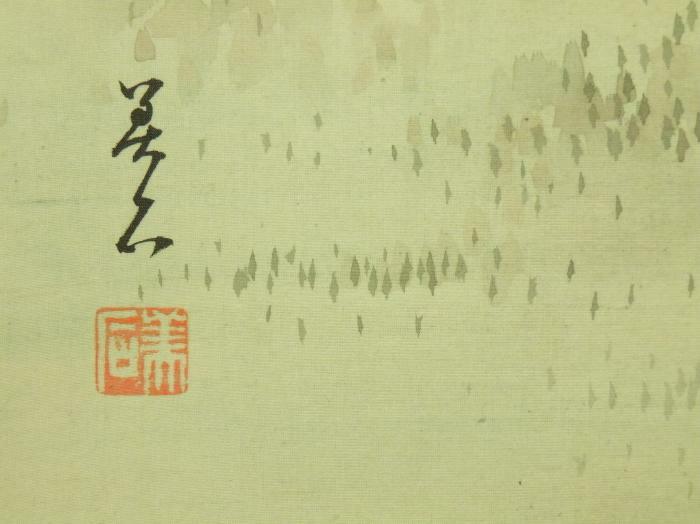 His style seems to have been stifled by the increasingly academic approach in Nihonga painting. His other name is Fujiwara Hiroyuki.He was an eldest son of Itaya Keishu.He became Sumiyoshi Hiromori’s adopted son,and he became the order painter of shogunate in 1781.He had good skill of figure paintings. Hirahuku Suian　(1844～1890) He was born in Akita as the son of the artist Bunro. Suian became painter working in a rather realistic style. His son, Hirafuku Hyakusui, followed the family tradition and became a painter too. Akita in Japan, has a Hirafuku Memorial Art Museum with works displayed by both father and son. Hirano Gogaku (1814-1907)He was born in Oita prefecture.He studied the style of Tanomura Chikeden painting. 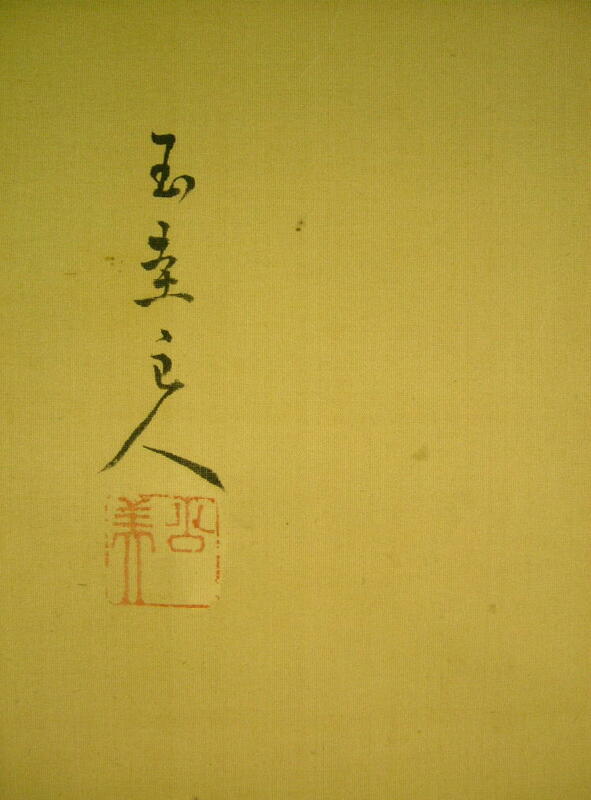 Also he studied Poem & Calligraphy very well. He is also known as the SAN-ZETSU-SO (“three surpassings monk”). Hoashi Kyou (1810-1884)He was a leading disciple of Tanomura Chikuden. He was one of last BUNJIN painter. Hyakunen Suzuki (1825-1891) Suzuki Hyakunen was born and raised in Kyoto, where his father, an astronomer, trained him in drawing astronomical diagrams. Traditionally he is described as a pupil of Edo artist Ōnishi Chinnen, who was a student of Maryama. Ōkyo. This places Hyakunen in de Maryama tradition, but from early in his career his style was eclectic, ranging from Shijō to Kanō styles. 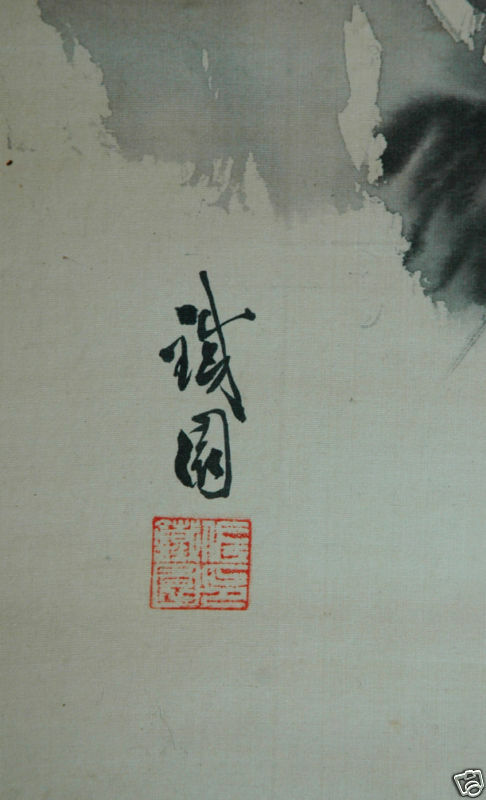 He led a literati lifestyle and his love of Chinese classics are reflected in many of his paintings. His importance is not only determined by his own work, but also by his influence on the careers of others. His best known pupil is his son Suzuki Shōnen; other students were Kubota Beisen and Imao Keinen. At the start of the Kyoto Prefecture Painting School in 18180, he was appointed one of the principal instructors, but rivalry with Kōno Bairei made him resign after one month. 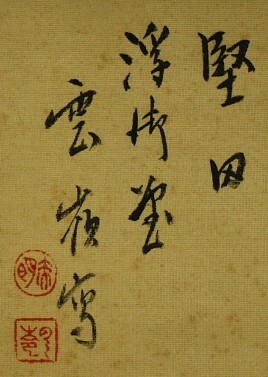 When Bairei too resigned a year later, his son Suzuki Shōnen was appointed. 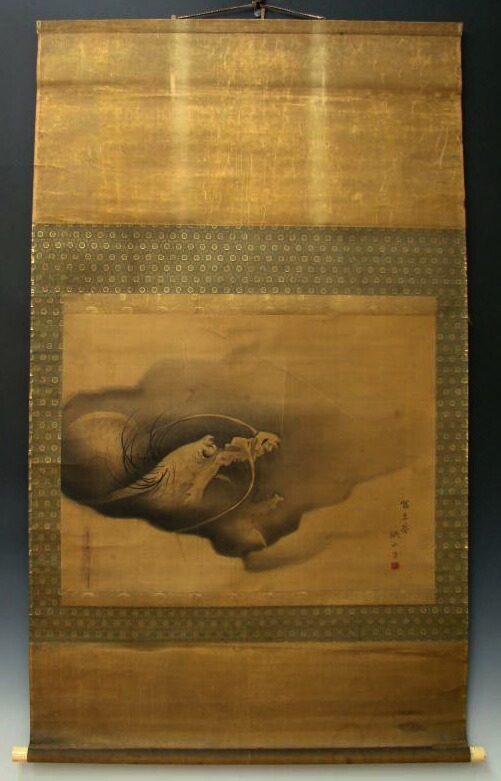 Hyakunen frequently submitted works to major exhibitions of the Meiji period, and won many prizes. 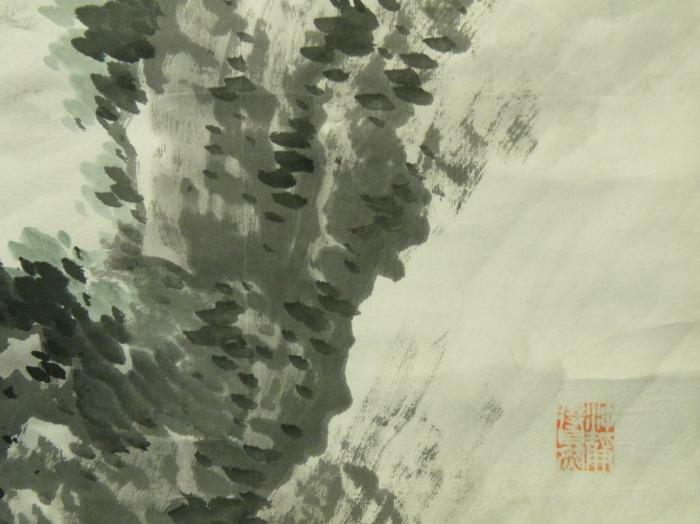 He died unexpectedly on his return journey from Tokyo where he had attended an exhibition. 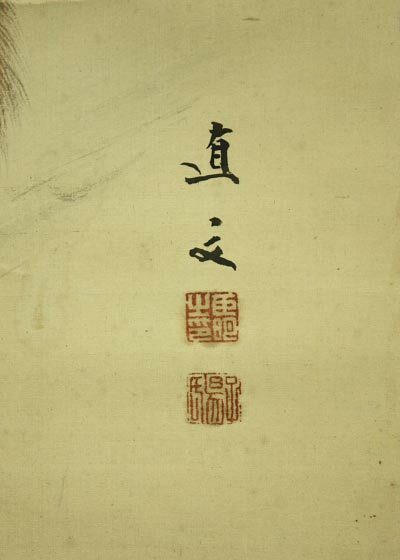 Igarashi Shunmei (1700 -1781) Kano style painter. Born in Niigata prefecture.He studied under Kano Yoshinobu.He received the honorary title of HOGAN. His another name is Go Shunmei. 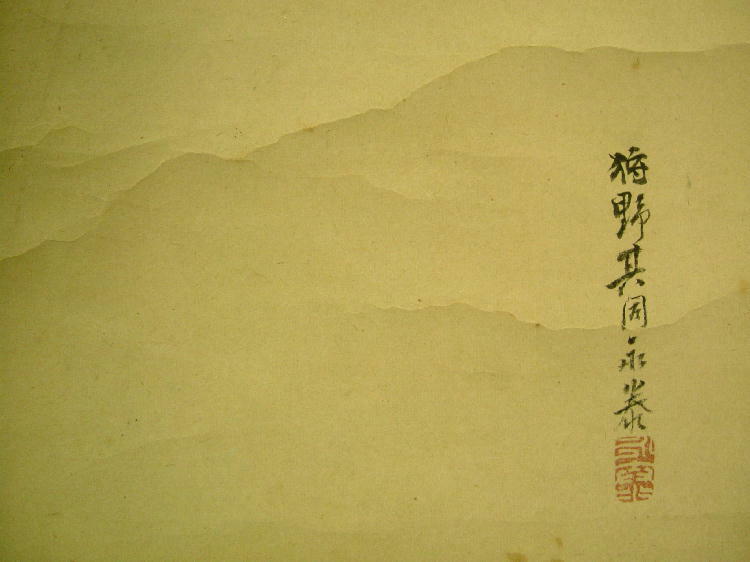 Ikeno Taiga (1723–1776) was a Japanese painter and calligrapher born in Kyoto during the Edo period. Together with Yosa Buson, he perfected the bunjinga (or nanga) genre. 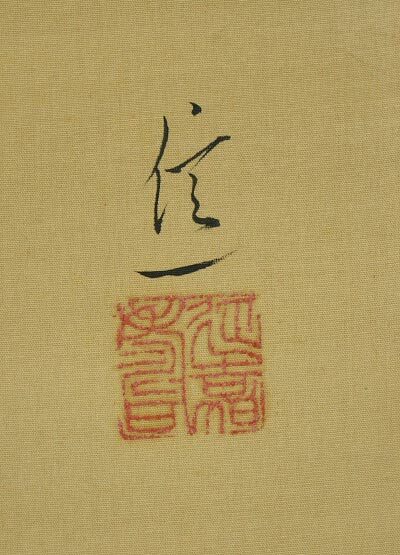 The majority of his works reflected his passion for classical Chinese culture and painting techniques, though he also incorporated revolutionary and modern techniques into his otherwise very traditional paintings. As a bunjin (literati, man of letters), Ike was close to many of the prominent social and artistic circles in Kyoto, and in other parts of the country, throughout his lifetime. Ikegami Shuho (1874-1944)Born in Nagano prefecture.He was a son of Ikegami Shuka.Shuho studied under His father & Araki Nanpo. He painted kacho & Sansui very well. 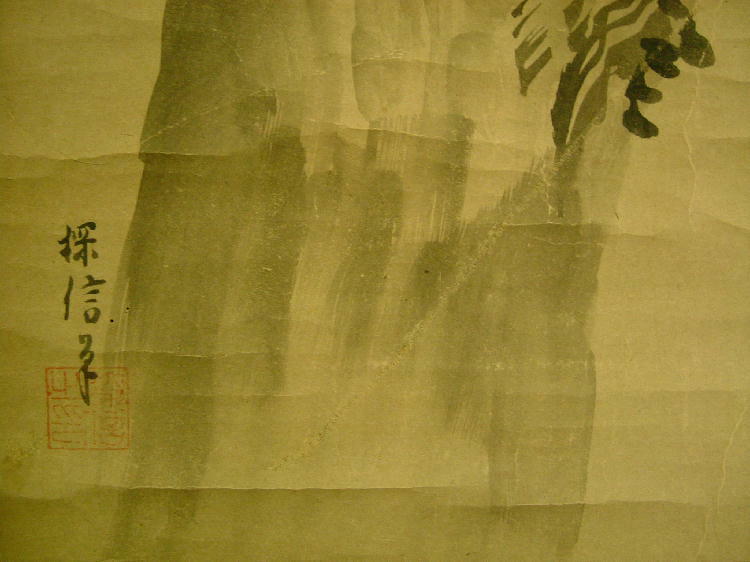 Ikkyū Sojun ZEN(1394-1481) was an eccentric, iconoclastic Japanese Zen Buddhist priest and poet. He had a great impact on the infusion of Japanese art and literature with Zen attitudes and ideals. Imao Keinen(1845-1924)Born in Kyoto, Keinen became a well known painter in the Japanese style. He began teaching at the Kyoto School of Painting in 1880, and later served as a member of the Art Committee of the Imperial Household. 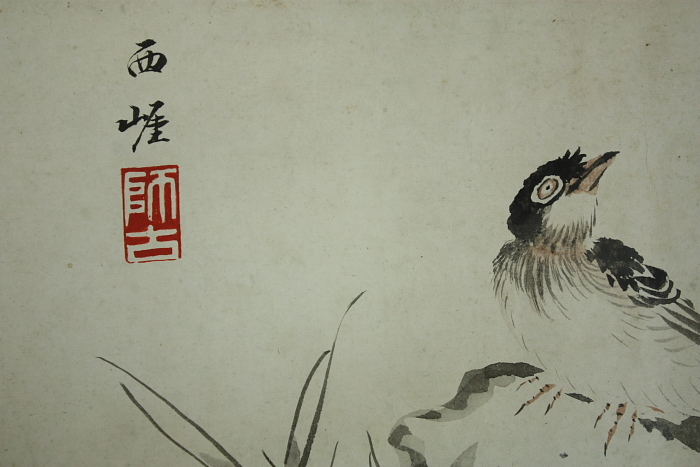 Keinen was best known for his beautiful images of birds and flowers (kacho-e) during the Meiji period. Inada Gozan (1880-1938) He was born in Yamagata prefecture.He was one of the pupil of Terasaki Kogyo’s big four. Ishii Kinryo (1842-1926) Born in Okayama prefecture.He was a pupil of Furuichi Kinga & Okamoto Shuki. Ishikawa Unkei (1887-????) Born in Ibaraki prefecture. Ishida Gyokuzan (1737-1813) He was born in Osaka.He was a pupil of Okada Gyokuzan. 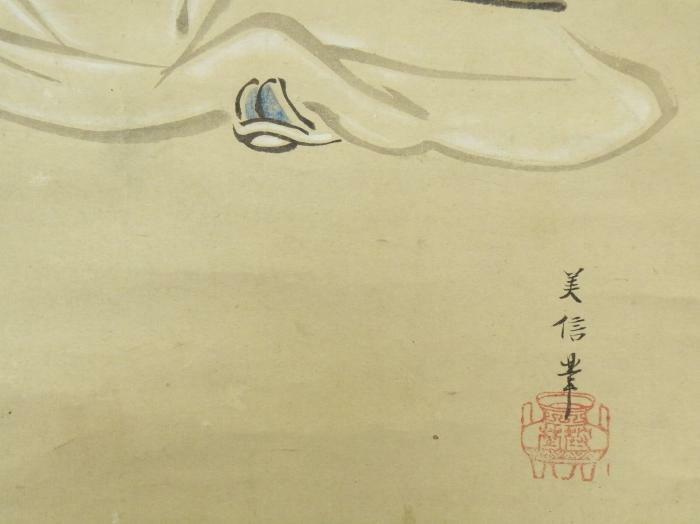 Itaya <Keii> Hironaga (1760-1814) He was the artist of the Tosa sect. He was born in Edo as the child of Itaya Keisyu. He learned the picture from his father and served the Tokugawa shogunate. Itaya <Keii> Hirotoshi (1815-1836) He was the 4th top of artist of Itaya family(Tosa sect). He served as the shogunate order painter.The son of Itaya Hirotaka. 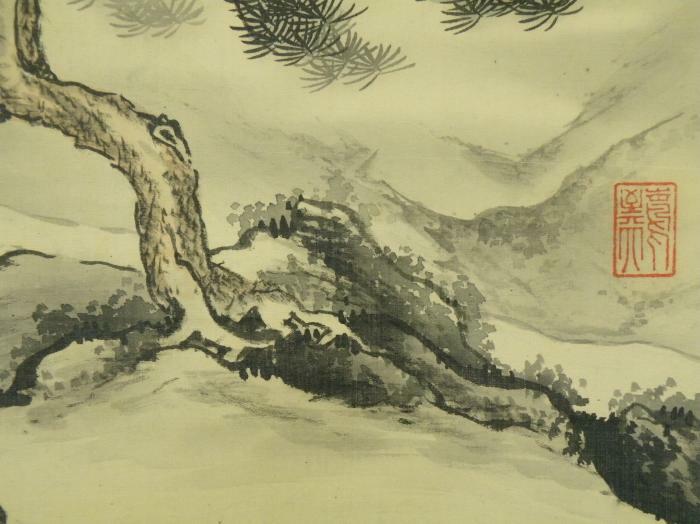 Itō Jakuchū (1716-1800) was an Eccentric Japanese painter of the mid-Edo period. 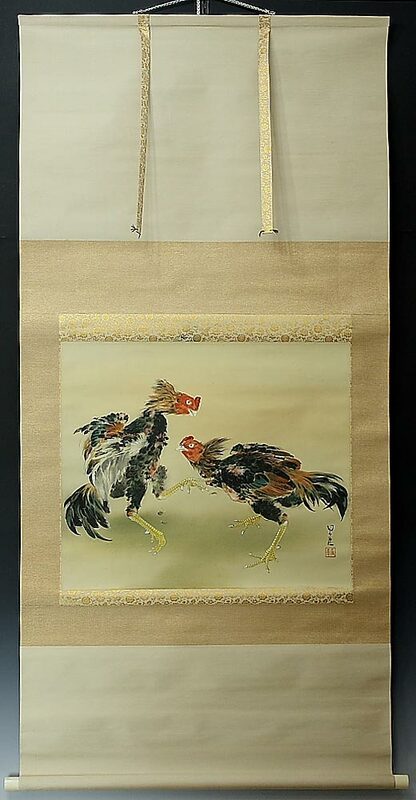 Though many of his paintings concern traditionally Japanese subjects, particularly chickens and other birds, his painting style and methods were heavily influenced by Western painting. Many of his otherwise traditional works display a great degree of experimentation with perspective, and with other very modern stylistic elements. 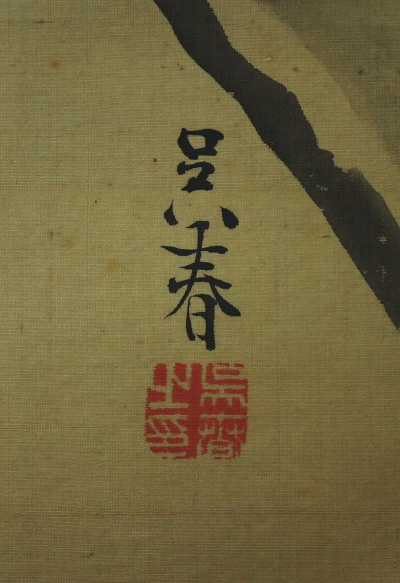 Izawa Kanju Sojun (1895-1954)His pen name is Deiryu-kutsu. 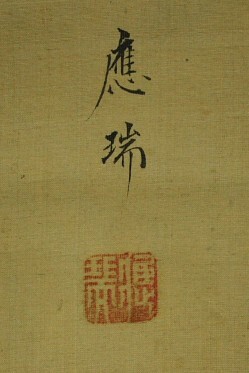 Dharma transmission from Tesshu Chisei. He was ordained as a Rinzai Zen monk by Toshu Zenchu Nantenbo in 1911 in Kaisei-ji. He became the abbot of Kaisei-ji in 1932. 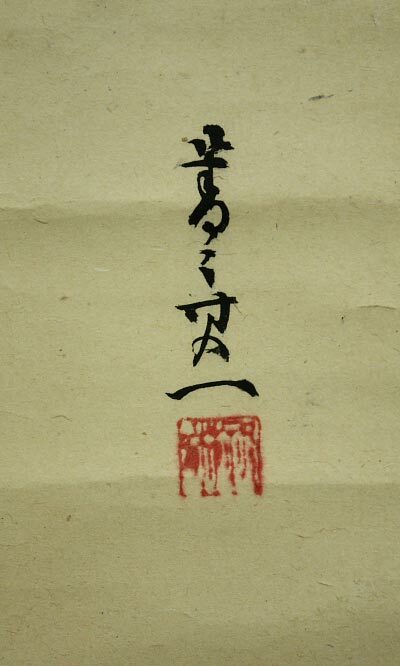 He was invited to be the Zen master of Enpuku-ji monastery in 1937. 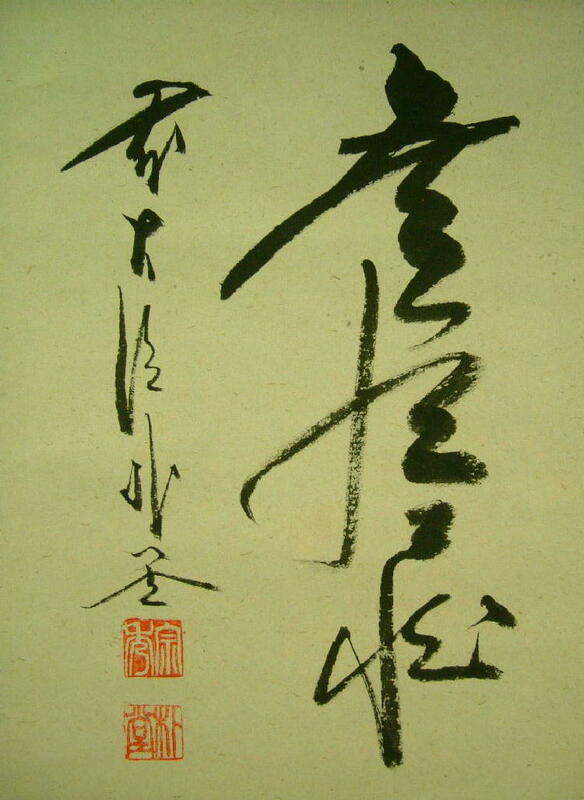 Zen master with a talent for calligraphy, painting and Chinese poetry. Iwasa Koko (1884-1951)Born in Aichi prefecture.He lived in Kyoto.He studied under Taniguchi Kokyo & Takeuchi Seiho. 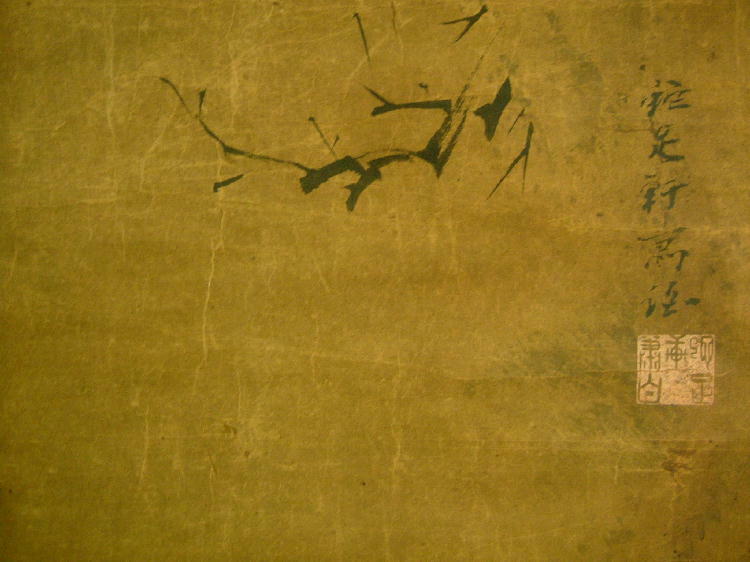 Josetsu (1405–1423) He was one of the first suiboku style Zen Japanese painters in the Muromachi Period (15th century). He was probably also a teacher of Tenshō Shūbun at the Shokoku-ji monastery in Kyoto. 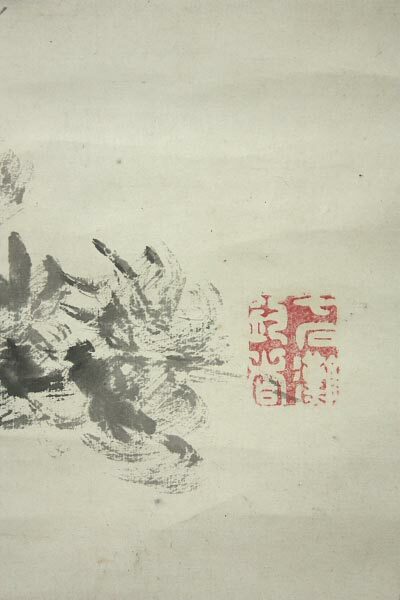 A Chinese immigrant, he was naturalised in 1370 and is known as ‘the father of Japanese ink painting’. Kaihō Yūshō (1533-1615) Kaihō Yūshō, the son of Kaihō Tsunachika, who was a retainer under the Azai clan of Ōmi Province. Yūshō was said to have been a student under the famous Kano Motonobu, which explains where he attained such talent in the art of painting. Afterwards, Yūshō ended up being patronized by Toyotomi Hideyoshi and the emperor Go-Yōzei. 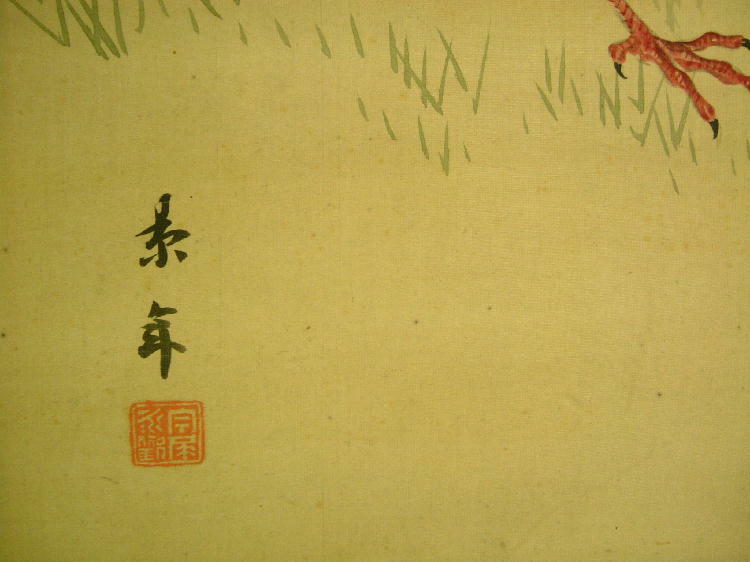 The paintings that Yūshō made were often of the Kano style of art, being very colorful. 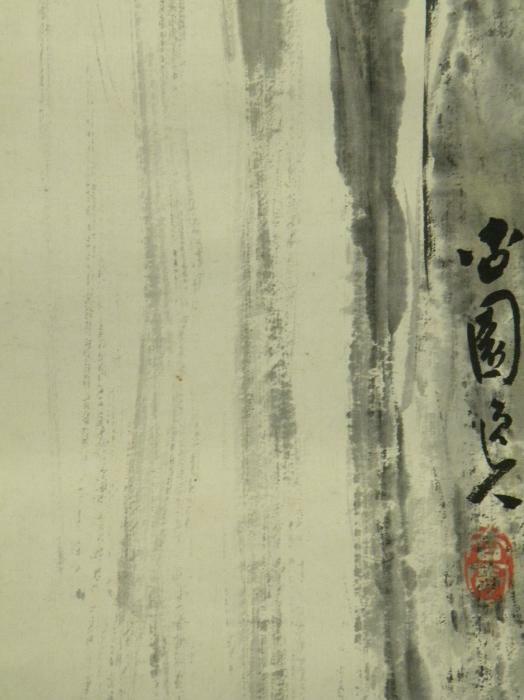 Yusho was also quite proficient in the traditional monochromatic ink style employed by many Zen monks/painters. 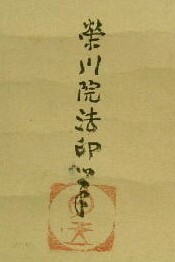 Yūshō died in February 1615 in Kyoto. Kaioku Nukina(1778-1863) He is born in Tokushima, Shikoku and moved to Edo. 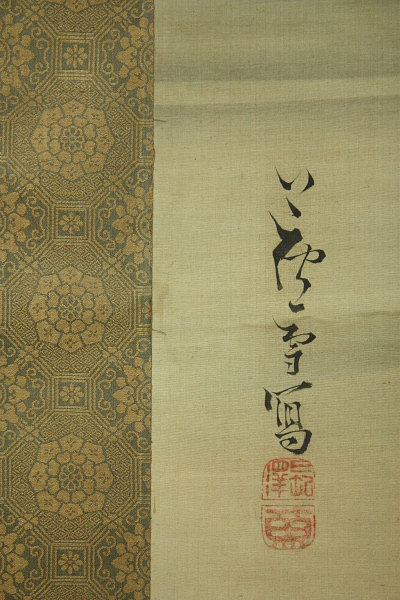 He is one of the famous calligraphy artist just before The end of the Edo period. He studied painting from Kano school. 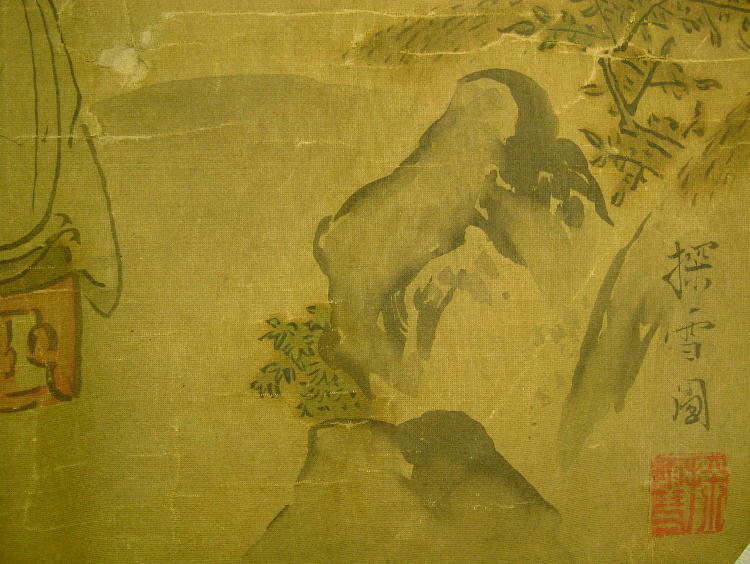 KAKUSHU (1642-1730)　He was a Buddhist priest and painter. He was invited to Takamatsu feudal lord, Matsudaira Yorishige and a lot of pictures were drawn by him. Kamisaka Shoto (1882-1954)Born in Kyoto.He was a younger brother of Kamisaka Sekka.He studied Japanese painting under Kikuchi Hobun and studied European painting under Asai Chu. Kano Tohaku(Dohaku) Aishin　(1772-1821)He was appointed to the rank of Hogen in 1813.He was the 5th head of Surugadai Kano famuly.He was a son of Kano Yoshinobu. Kano <Shushin> Chikanobu (1660-1728) Kano painter. Born in Musashi Province. Eldest son of Kano Tsunenobu, elder brother of Kano Minenobu; his mother a daugter of Kano Yasunobu. In 1678, entered the service of the shogunate. 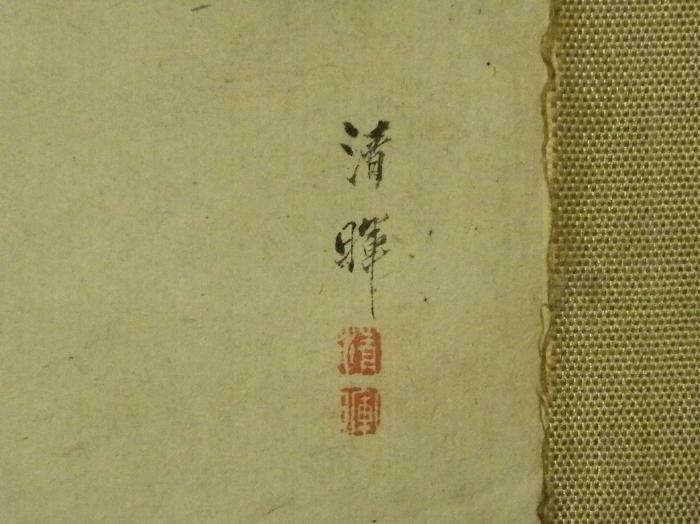 In 1681, worked with his father at Edo Castle. In 1713, succeeded his father as third-generation head of the Kobiki-cho branch of Kano school. 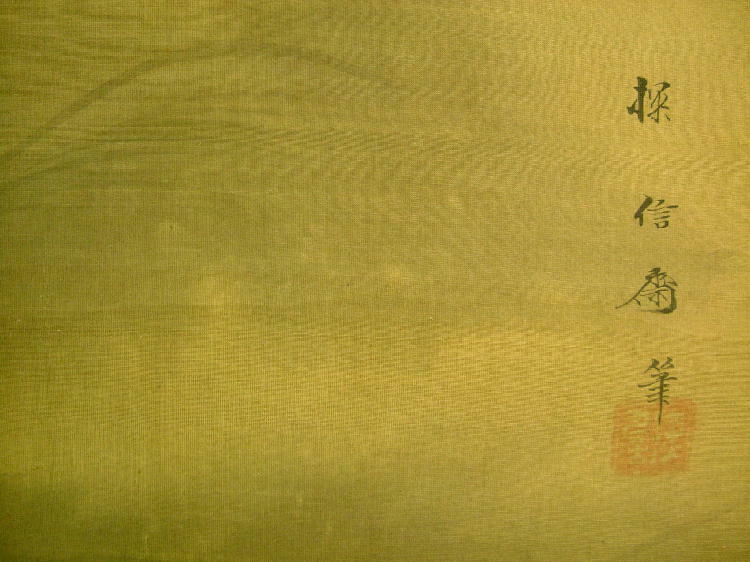 In 1719, received honorary title of Hogan; in the same year, on command of the shogun, painted a screen to given to a Korean emissary. 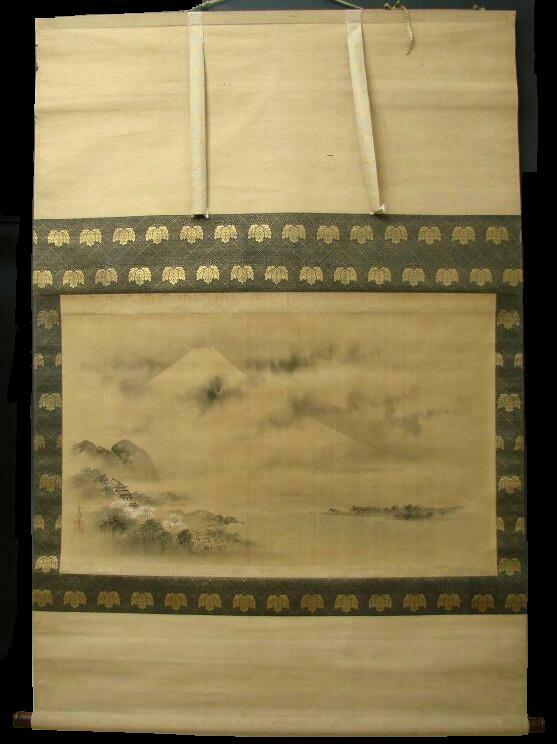 Is said to have painted another screen presented to the king of the Ryukyu Islands. 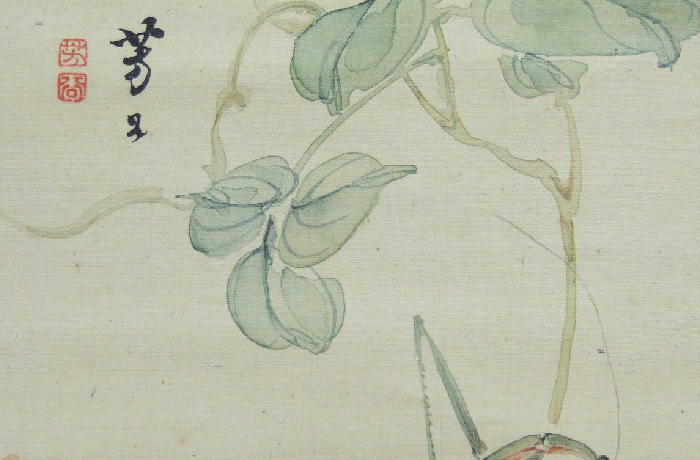 One of his pupils was Toriyama Sekien, teacher of Kitagawa Utamaro. 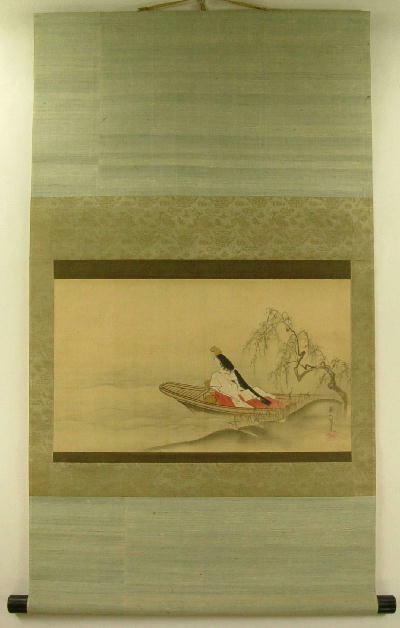 Kano <Baiun>Tamenobu (1657‐1715)Early-Mid term Edo painter. Kano Ujinobu‘s second son.He participated in the production of the paintings of the imperial palace.His real name is Tamenobu. Kano <Eisyuku> Morinobu(1675-1724)He was the 9th head of Nakabashi Kano family. He studied painting under his father, Kano Tokinobu. He succeeded his grandfather’s technique, Kano Yasunobu. Kano Eishin(1830-1844)He was a 10th head of Kyoto Kano family.He was an adopted son of Kano Eigaku.His another names were Gyokuen,Sanyo. Kano <Eisen’in> Michinobu (1730-1790)He was a son of Kano Furunobu. He became the 6th generation head of the Kobikicho line of the Kano school.Also he was a goyo eshi (painter-in-residence) at the shogunal court. 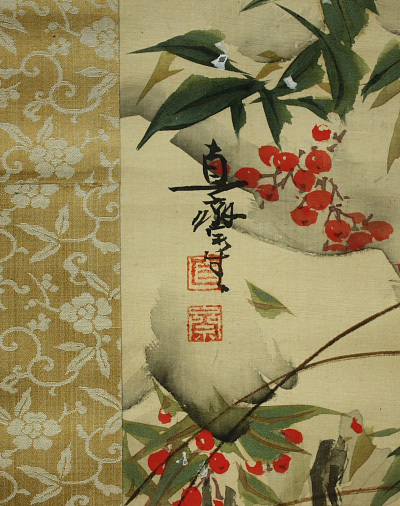 The Kano school is one of the most famous schools of Japanese painting. 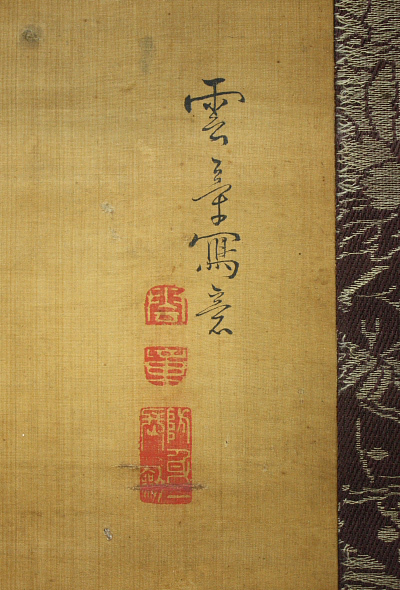 It was founded by Kano Masanobu (1434-1530), a contemporary of Sesshu and student of Shubun. 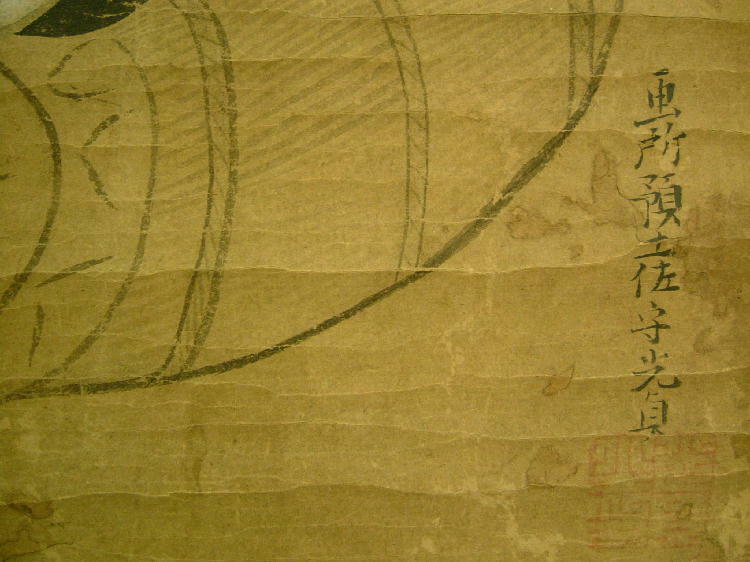 Some scholars write that though Masanobu mastered elements of Chinese painting and of Shubun’s style, he was overall mediocre and lacked the originality and creativity of his teacher. Nevertheless, Masanobu became an official painter in the Shogun’s court, and it was this lofty position which granted the Kano school influence and fame. The artists who followed him improved upon his style and methods, and within a generation the school flourished. 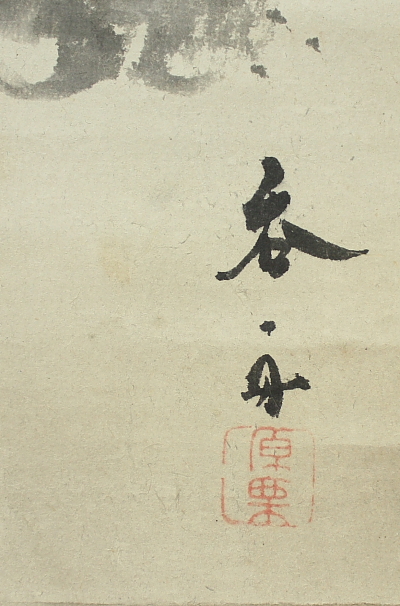 The school’s works are the paragons of Momoyama period art, and while most schools specialize in one style, medium, or form, the Kano school excels at two. Kano painters often worked on a large scale, painting nature scenes of birds, plants, water, or other animals on sliding doors or screens, covering the background with gold leaf. Some of the most famous examples of these can be found at the Nijo Castle in Kyoto. 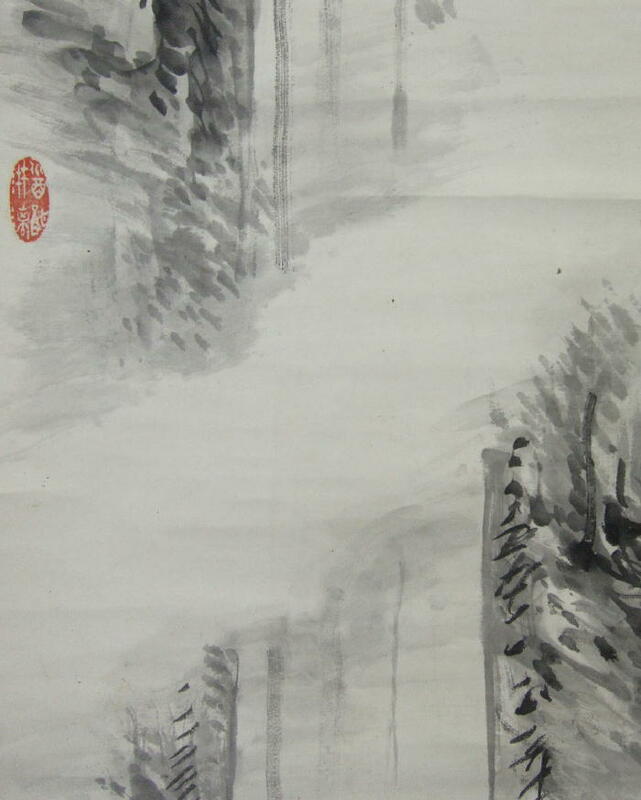 The school is equally renowned, however, for its monochrome ink-on-silk landscapes. 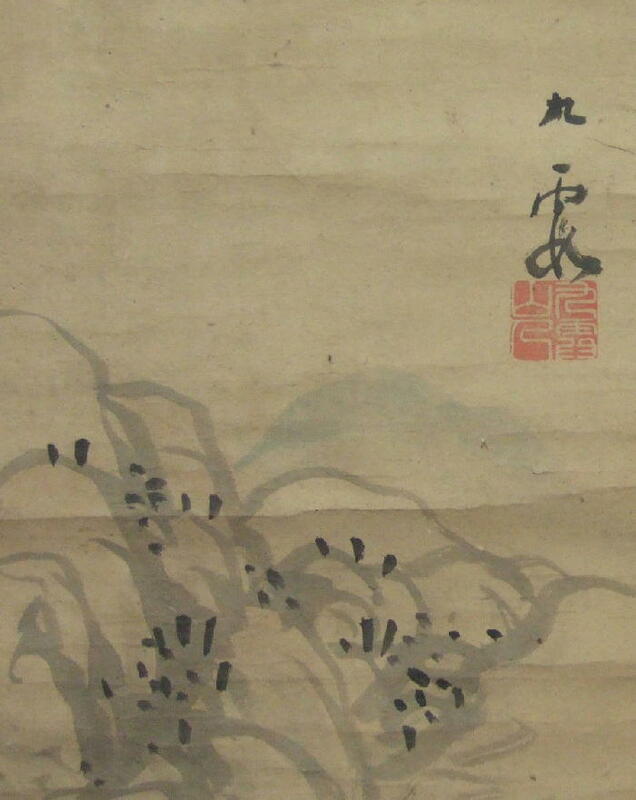 Kano ink painters composed very flat pictures but they balanced impeccably detailed realistic depictions of animals and other subjects in the foreground with abstract, often entirely blank, clouds and other background elements. 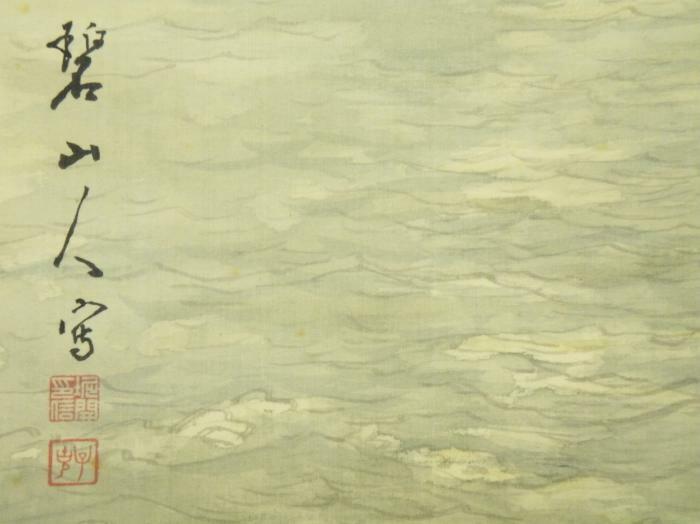 The use of negative space to indicate distance, and to imply mist, clouds, sky or sea is drawn from traditional Chinese modes and is used beautifully by the Kano artists. It is interesting, perhaps, to note the very bold brush strokes and thus bold images that are obtained in what is often a very subtle and soft medium. It is also interesting to note the contrast between these expertly painted monochrome ink paintings and the almost gaudy but no less beautiful gold-on-paper forms these artists created for walls and screens. Kano Eitoku Takanobu (1740‐1795 He was a 12th Kano Eitoku. an eldest son of Kano Hidenobu(1717-1763).He received the honorary title of HOGAN in 1773. He became a top of Nakabashi Kano family after his father,Hidenobu. 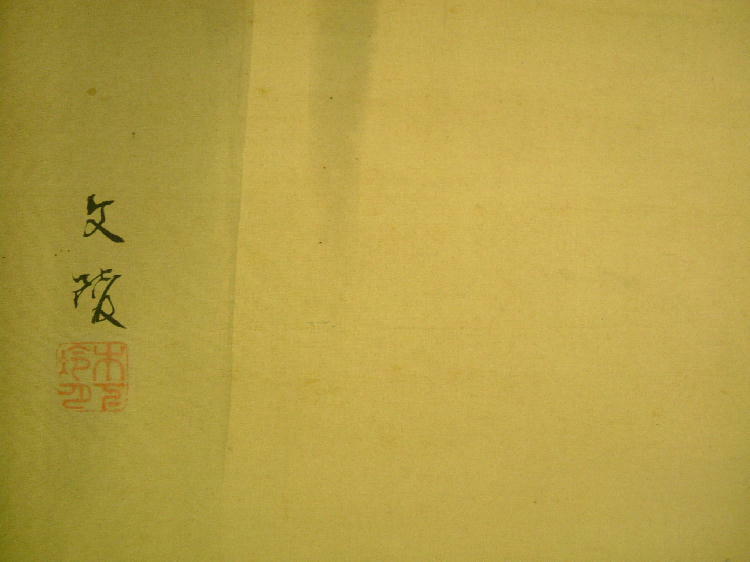 Kano <Fushin> Baiken (1685-1749) Kyoto KANO school painter.He was a son of Kano Baiun(1657‐1715). Kanō Hōgai (狩野芳崖)(1828-1888) was a 19th century Japanese painter of the Kanō school. 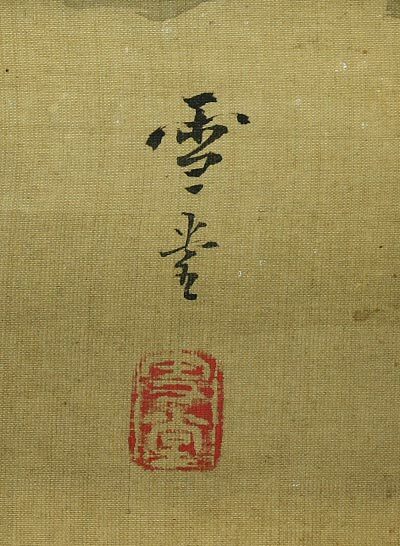 One of the last of the Kanō painters, Hōgai’s works reflect the deep traditions of the school, but also at times show hints of experimentation with Western methods and styles. 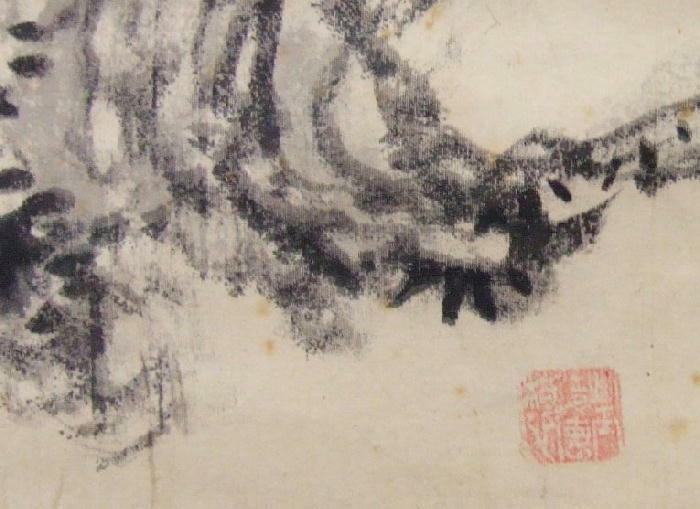 Like his predecessors, Hōgai painted a variety of subjects, but is perhaps most well-known for his paintings of falcons, and of dragons. 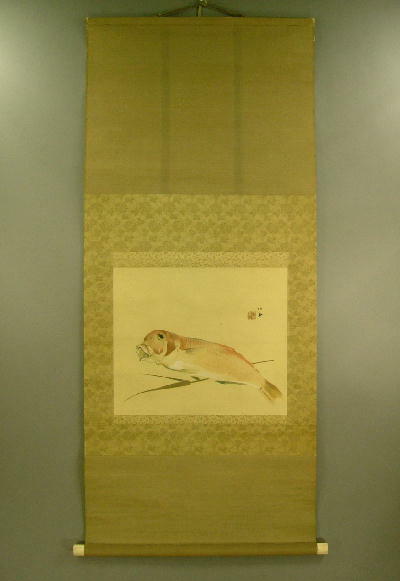 The son of the local daimyo’s chief painter, he was sent at the age of 18 to Edo to study painting formally. He would stay there for ten years, and study under Kanō Shōsenin and other great artists of the time. 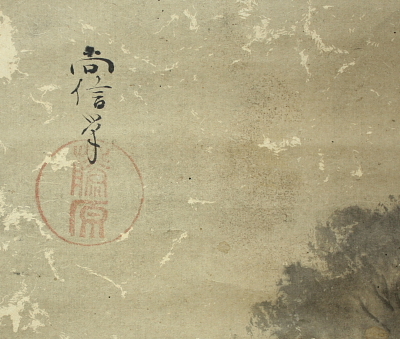 Hōgai would eventually be called upon for such esteemed commissions as ceiling paintings for Edo Castle. He also received the honor of having some of his works displayed at the 1876 Paris International Exposition. However, despite these honors, the economic turmoil created by the fall of the shogunate in 1868 forced Hōgai to seek to support himself with income via more mundane methods. He worked casting iron, reclaiming land, and running a shop selling writing instruments. In 1877 Hōgai returned to Edo, now called Tokyo, and worked for the wealthy Shimazu family; this gave him the opportunity to study works by some of Japan’s greatest painting masters, including Sesshu and Sesson. In 1884, Hōgai attracted the attention of Ernest Fenollosa, an art critic and collector from New England, who befriended him and bought several of his paintings. 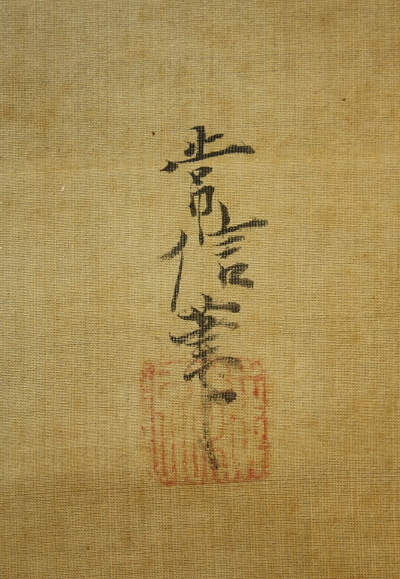 Along with Fenollosa, Okakura Kakuzo and Hashimoto Gahō, Hōgai then took part in a Painting Appreciation Society (観画会, kangakai). The Society was created to draw attention to the traditional Japanese arts, particularly classical art of the Heian and Nara periods which was beginning to be seriously neglected, many works sold or even destroyed due to Japan’s newfound interest in the West. 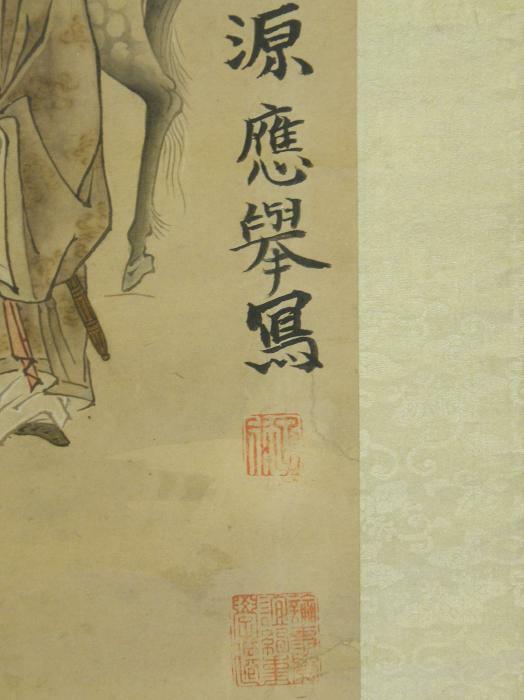 Kano Eiwa (act :18th century)He acted in middle EDO period.He was a pupil of Kano <Eishin> Yasunobu. He received the honorary title of HOKYO. Born in Kyoto, Eitoku was the grandson of Kanō Motonobu (1476-1559), an official painter for the Ashikaga shogunate. He was recognized for his artistic talent at a very young age. 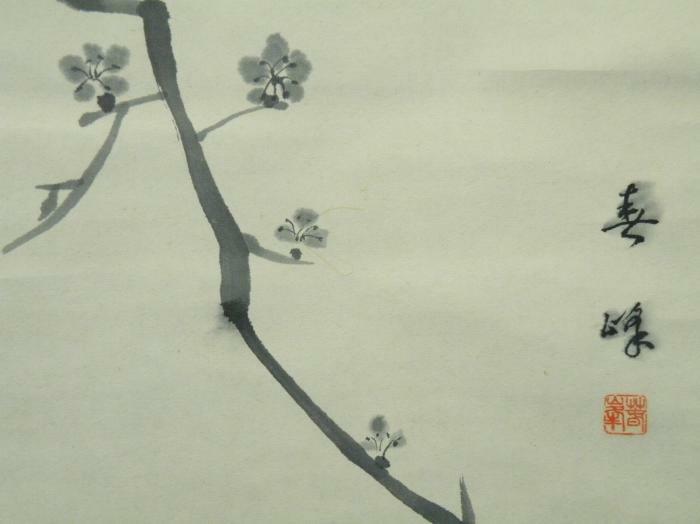 Under Motonobu’s guidance, he developed his grandfather’s style, which had influence from Chinese painting. Collaborating with his father Shōei (1519-92), Eitoku painted the wall panels of the abbot’s quarters in Jukōin, a subtemple of the Daitokuji Zen monastic complex in Kyoto. During his lifetime, Eitoku’s patrons included Oda Nobunaga and Toyotomi Hideyoshi. His standing screen, sliding door, wall, and ceiling paintings decorated Nobunaga’s Azuchi castle and Hideyoshi’s residence in Kyoto and Osaka castle. 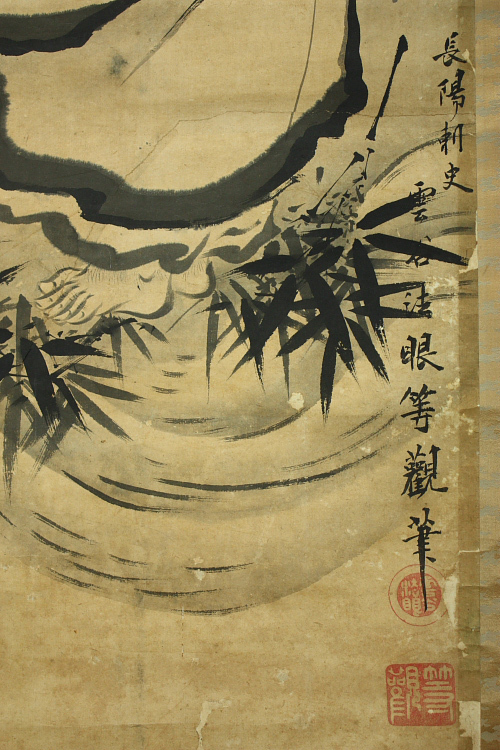 Contemporary accounts indicate that Eitoku was one of the most highly sought-after artists of his time, and received many wealthy and powerful patrons. Maintaining the preeminence of the Kanō School was not merely an artistic feat, but an organizational and political one also. Eitoku was able to secure a steady stream of commissions and an efficient workshop of students and assistants, and at one point successfully intercepted a warlord’s commission of the rival Hasegawa studio. His signal contribution to the Kanō repertoire was the so-called “monumental style” (taiga), characterized by bold, rapid brushwork, an emphasis on foreground, and motifs that are large relative to the pictorial space. The traditional account for this style, codified by Eitoku’s great-grandson Kanō Einō (1631-97) in his History of Japanese Painting (Honcho gashi), is that it resulted partly from the exigencies of Eitoku’s busy schedule, and that it embodied the martial and political bravura of the warlords, Nobunaga and Hideyoshi. 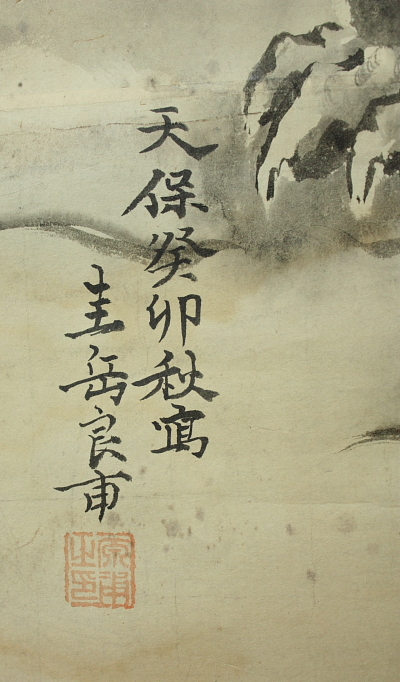 Unfortunately, most of his works were destroyed in the turmoil of the Sengoku period. However, those that do still exist provide testimony to his talent, to the power and wealth of his patrons Nobunaga and Hideyoshi, and to the magnificence of Azuchi-Momoyama culture. 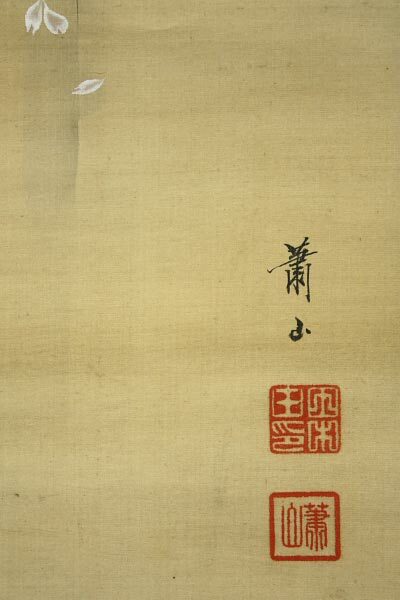 Kano <Kiyohara> Yukinobu (1643-1682)Great-niece of Kano Tan’yu. Her maternal grandparents were Nabe, Tan’yu’s younger sister, and the Kano painter Kotari Joan ( fl first half of the 17th century). Her grandfather and her father, KUSUMI MORIKAGE, were regarded as two of Tan’yu’s four greatest pupils, and Yukinobu herself was apprenticed to Tan’yu by the age of 16. While still apprenticed to Tan’yu, she eloped with a fellow pupil, Hirano Ihei Morikiyo ( fl mid-17th century), and they were both forced to leave the Kano school. Her daughter, Harunobu, also became a talented artist. Kano <Yosen’in> Korenobu (1753-1803) He was a son & pupil of his father Kano Michinobu. he became the 7th generation head of the Kobikicho line of the Kano school. Also he was a goyo eshi (painter-in-residence) at the shogunal court same as his father.He received the honorary title of HOIN. 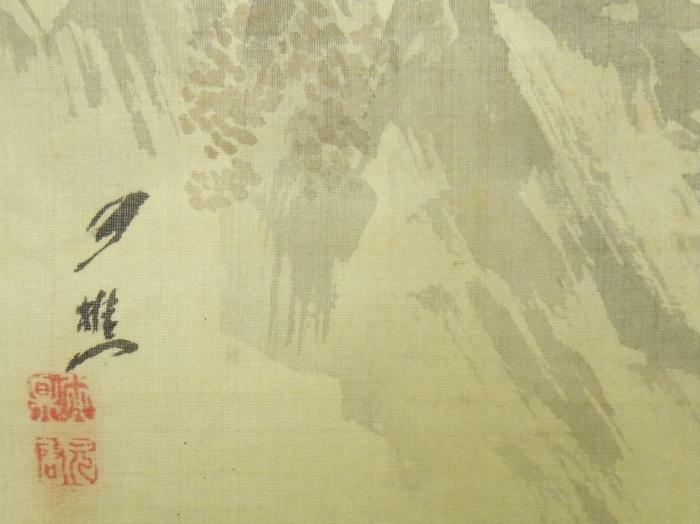 Kano <Ryuhaku>Sadanobu (1665-1722)Painter of middle Edo period. Kano Ujinobu’s third son. His real name is Sadanobu,pen name is Ryuhaku. Because the child of Ryusetsu who was Ryuhaku’s older brother had died early, Ryuhaku became the adopted son. Kano <Shosen’in> Masanobu (1823-1880)Kano painter. Pupil of his father Seisen’in Kano Osanobu; succeeded him as ninth generation of the Kobikicho branch of the Kano school. On receiving title of Hoin, took name of Shosen’in. Teacher of Gaho Hashimoto and Hohgai Kano. Produced a large number of eccentric paintings as well as some delicately colored rather tight landscapes; his style close to that of his father. 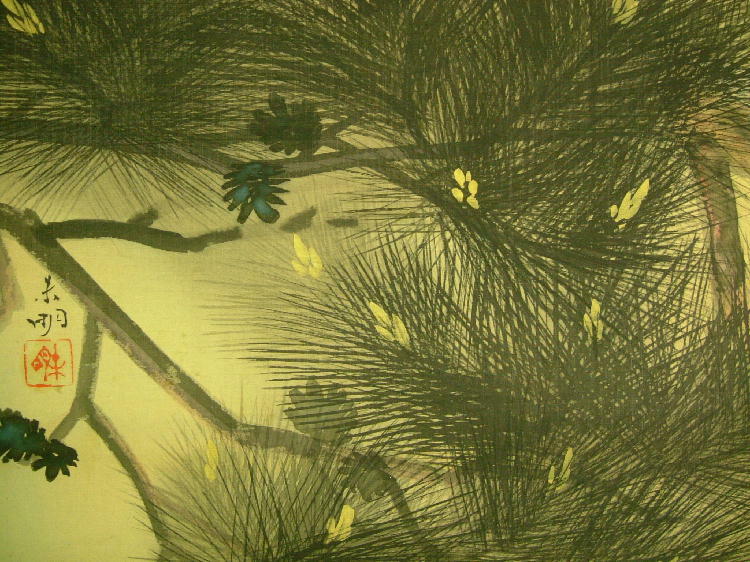 Kano <Shushin> Chikanobu (1660-1728)Kano painter. Born in Musashi Province. Eldest son of Tsunenobu Kano, elder brother of Minenobu Kano; his mother a daugter of Yasunobu Kano. In 1678, entered the service of the shogunate. 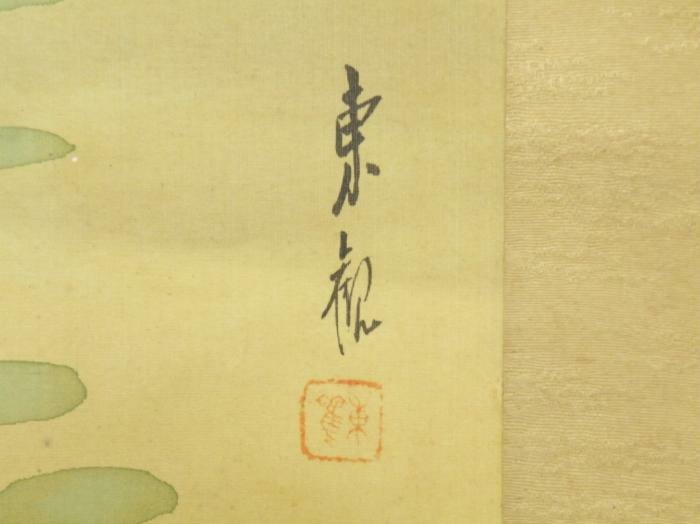 In 1681, worked with his father at Edo Castle. In 1713, succeeded his father as third-generation head of the Kobiki-cho branch of Kano school. 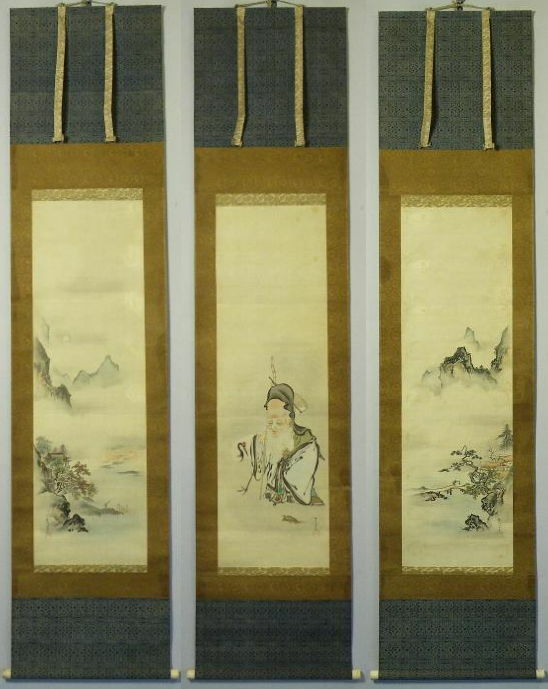 In 1719, received honorary title of Hogen; in the same year, on command of the shogun, painted a screen to given to a Korean emissary. 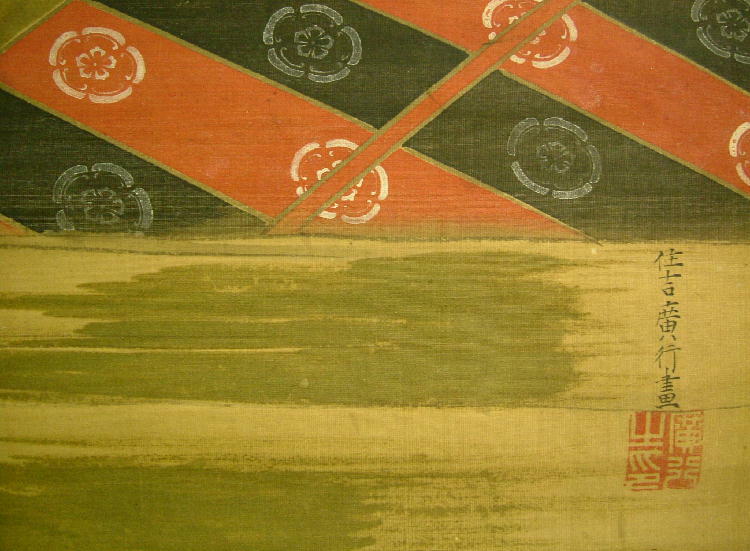 Is said to have painted another screen presented to the king of the Ryukyu Islands. 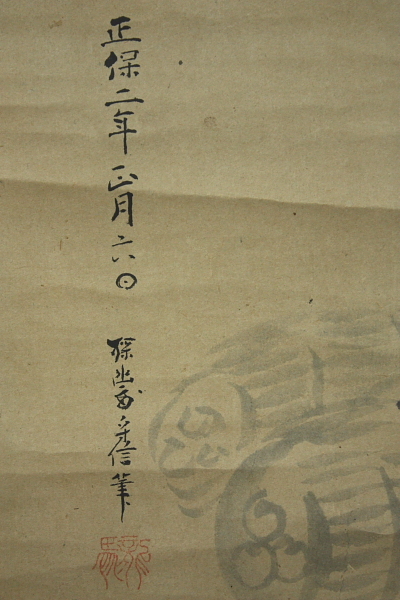 One of his pupils was Sekien Toriyama, teacher of Utamaro Kitagawa. Kano <Kyuhaku> Masanobu (1621-1688) He was the 2nd head of Kyuhaku Kano family.He is the eldest son of Kano Kyuhaku Naganobu.Masanobu studied painting under his father.He painted wild goose very well. Kano Minenobu (1663-1709)He was a second son of Kano Tsunenobu. 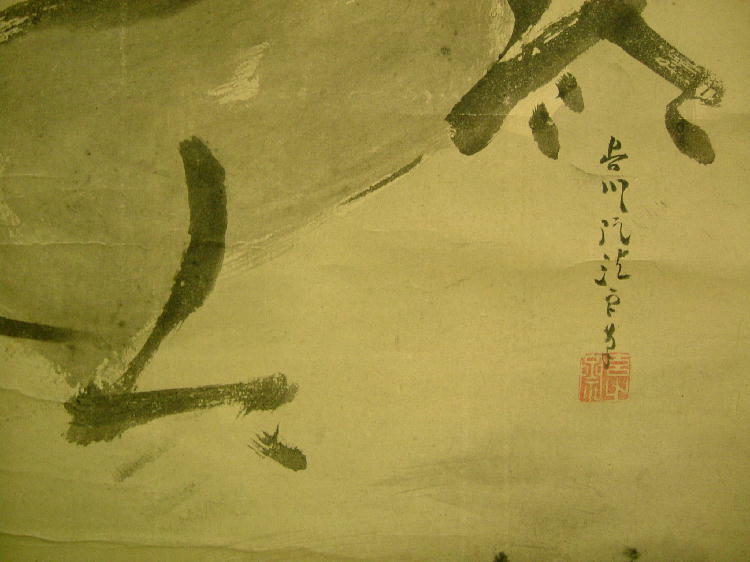 He became a goyo eshi (painter-in-residence) at the shogunal court in 1707.He was a founder of Hamamachi Kano school. Kano <Tansetsu> Morisada (1655-1714) He was a second son of Kano Tanyu. His real name was Morisada. He studied painting under his father. Kano <Eisyuku> Morinobu (1675-1724) He was the 9th head of Nakabashi Kano family. He studied painting under his father, Kano Tokinobu. He succeeded his grandfather’s technique, Kano Yasunobu. Kanō Masanobu (1434? – 1530) was the chief painter of the Ashikaga shogunate and is generally considered the founder of the Kanō school of painting. The Kanō school was a style of painting that maintained dominance over 400 years from Masanobu’s time up through the Meiji Restoration (1868). But it was not truly codified into a distinct style under Masanobu; this took place when Masanobu’s son Kanō Motonobu took over as head of the school. 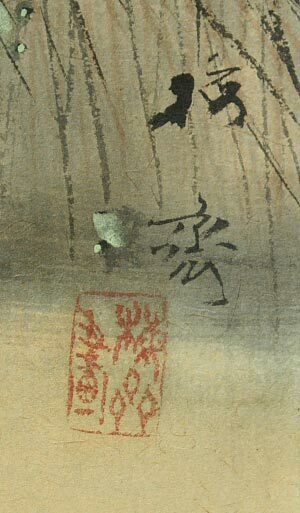 Masanobu was influenced by the priest-painter Tenshō Shūbun, and some sources indicate that he may have received the bulk of his artistic education under Shubun. He worked in the suiboku style, derived from Chinese painting, but added a Japanese touch to the style with more defined forms. Very few of his works survive. 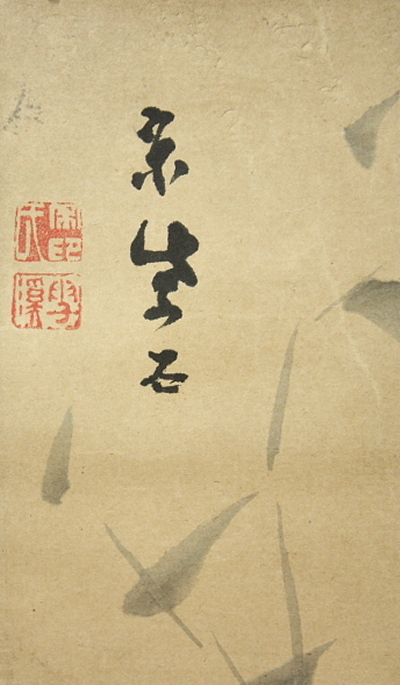 Kanō Masanobu served the Muromachi government as an official painter (御用絵師, goyō eshi), succeeding Sōtan to the post. 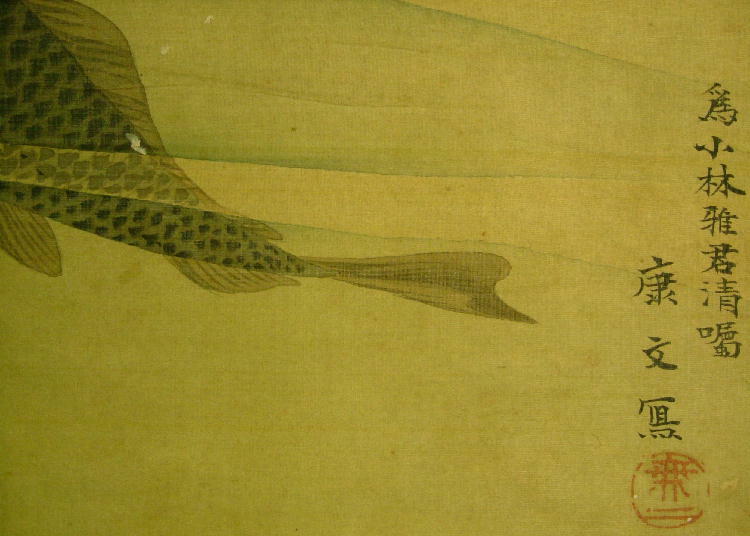 Kanō Motonobu (1476 – 1559) was a Japanese painter. 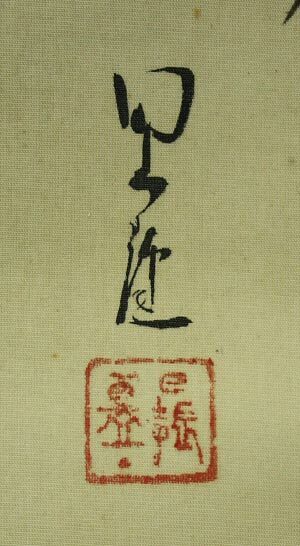 He was a member of the Kanō school of painting.Kano Motonobu’s father was Kanō Masanobu, the founder of the Kanō school. The Kano family are presumed to be the descendants from a line of warriors. The warriors are from the Kano district. The Kano district is now called Shizuoka Prefecture. The forebear of this family is Kanō Kagenobu. He seems to have been a retainer of the Imagawa family. 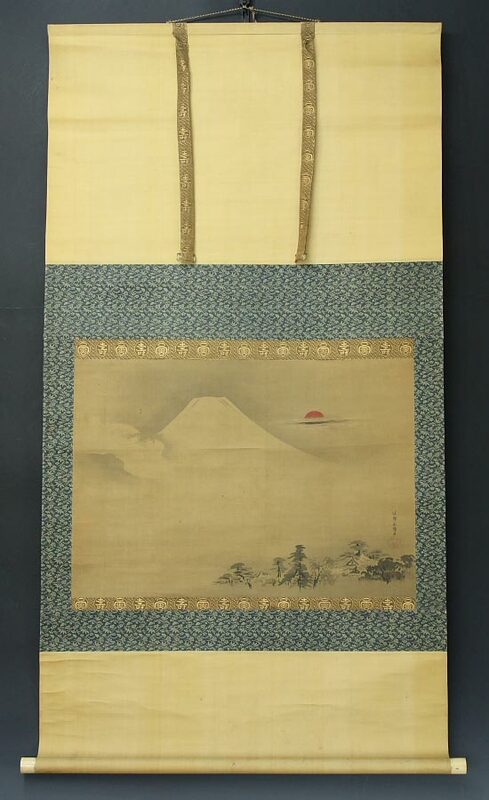 It has been reported that he has painted a picture of Mt Fuji. 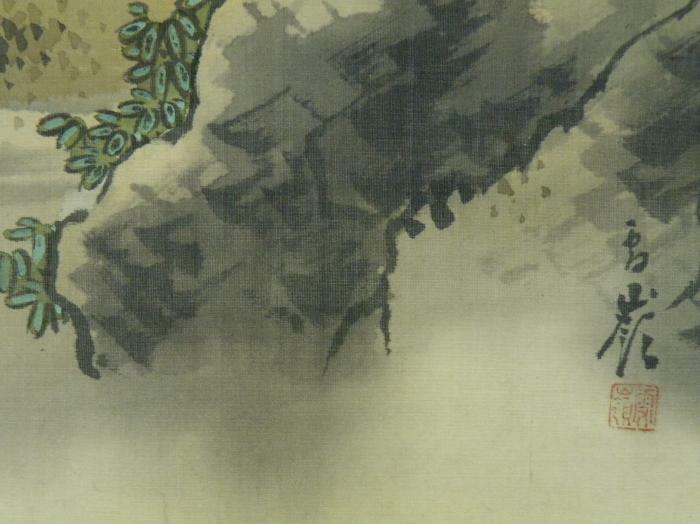 This painting was for a visit to the shogun Ashikaga Yoshinori (1394–1441) in 1432. The Kano family is a family that dominated the painting world from the end of the Muromachi period (1333–1568) to the end of the Edo period (1600–1868).The Kano family is one of the most important lineages in Japanese history. Kano Masanobu, Motonobu’s father, was the founder of the Kano tradition. Kano Masanobu is Kagenobu’s son. 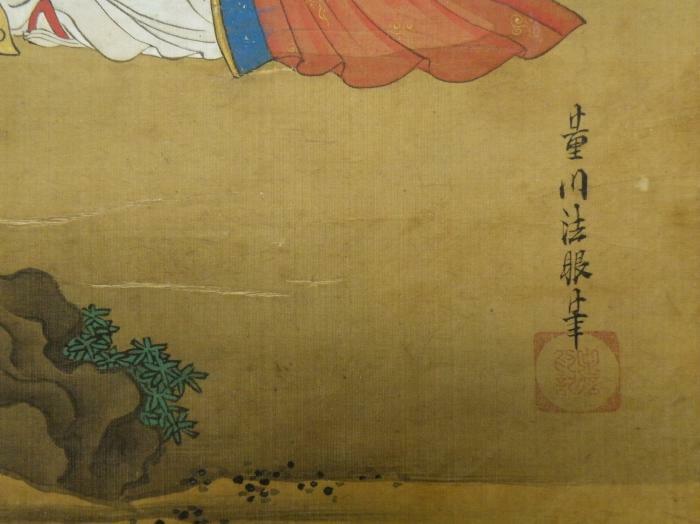 Kano Masanobu was the official court painter to the Ashikaga Shogunate in 1481. 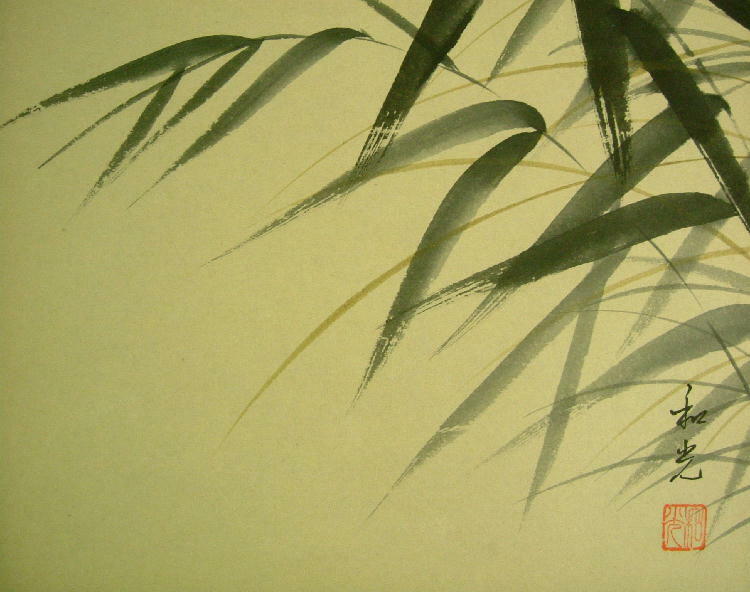 Masanobu was a professional artist whose style is derived from Kanga style. Masanobu’s descendants were the people that made up the Kano School. 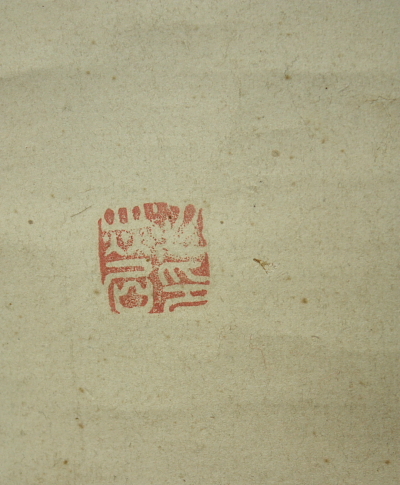 The Kano School had secular ink painters. 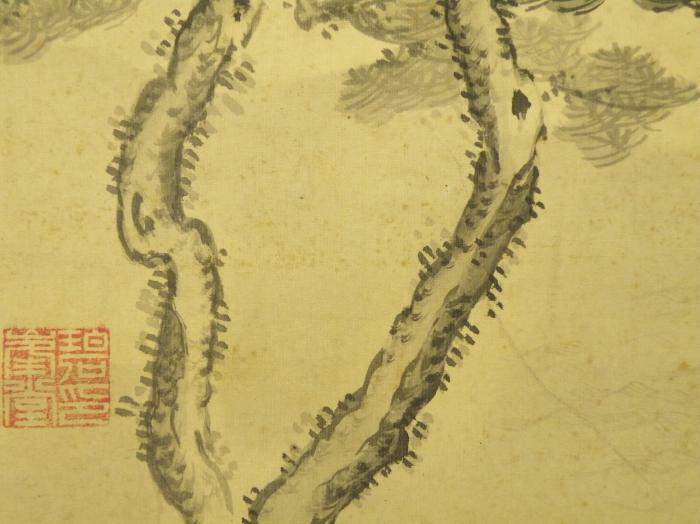 Motonobu was likely trained in Kanga (Chinese-style ink painting) by his father. 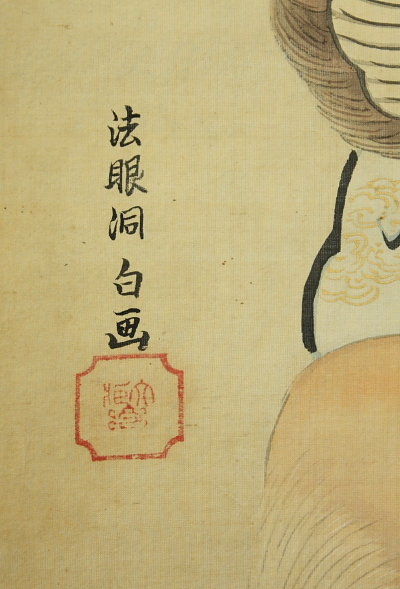 Motonobu also probably acquired his skill as a portrait painter from his Masanobu. 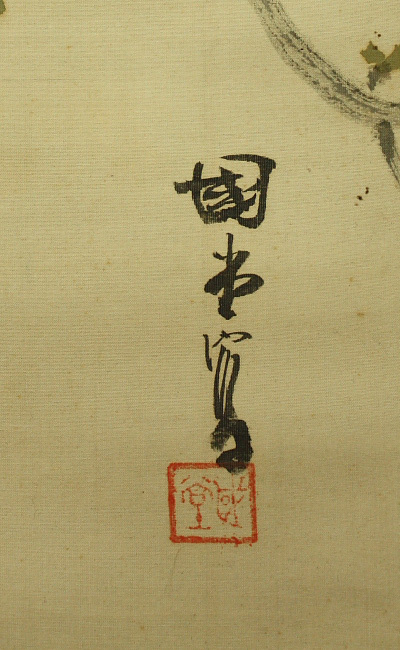 One example of this would be the Priest Tōrin, 1521; Kyoto, Ryūanji. Kano Motonobu formed a formal workshop in the sixteenth century based on Kano tradition. The Kano tradition is now known as the Kano School. This family of artists was supported by becoming fanmakers (ogiza). 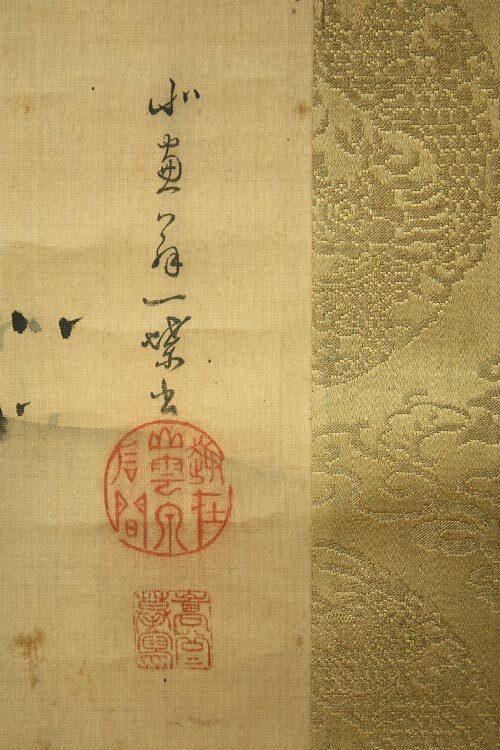 The family gained financial support from Eimyoin, a subtemple of Tofukuji in southwest Kyoto. 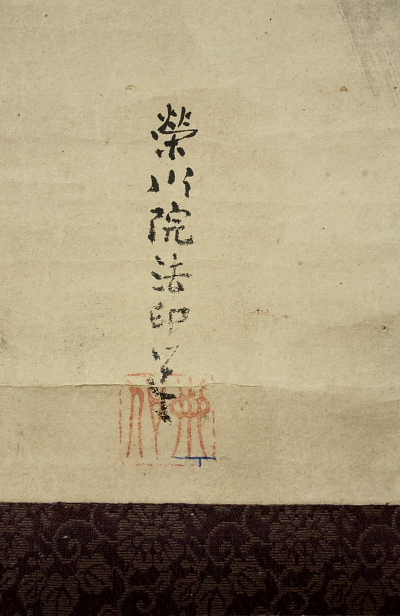 Motonobu was given many commissions for paintings from a variety of sources. His sources included; the Ashikaga government, members of the aristocracy, and major Kyoto shrines and temples. From these commissions; Motonobu was able to develop his painting skills further. Motonobu, like his father, did commissioned for the Ashikaga shoguns. The Ashikaga was a family of military rulers who governed Japan from 1338 to 1573. When Motonobu was only nine he begun to serve the shogun Ashikaga Yoshimasa )1436-90). 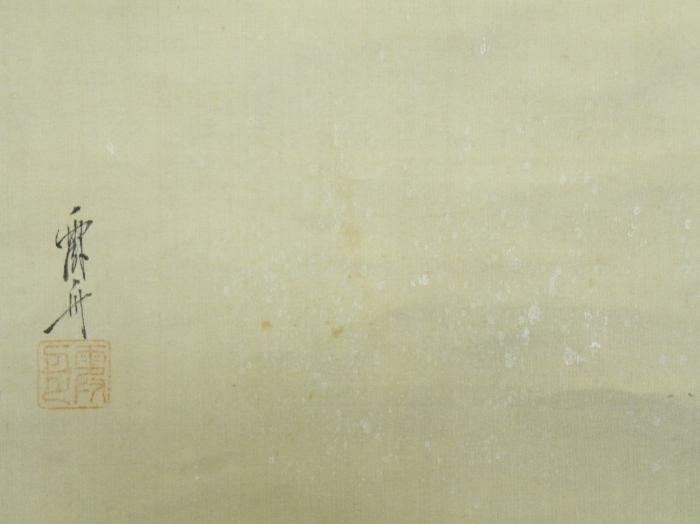 Motonobu then paintined for Yoshimasa’s successors. The successors’ names are as follows: Ashikaga Yoshitane (1465–1522), Yoshizumi (1478–1511) and Yoshiharu (1511–50). 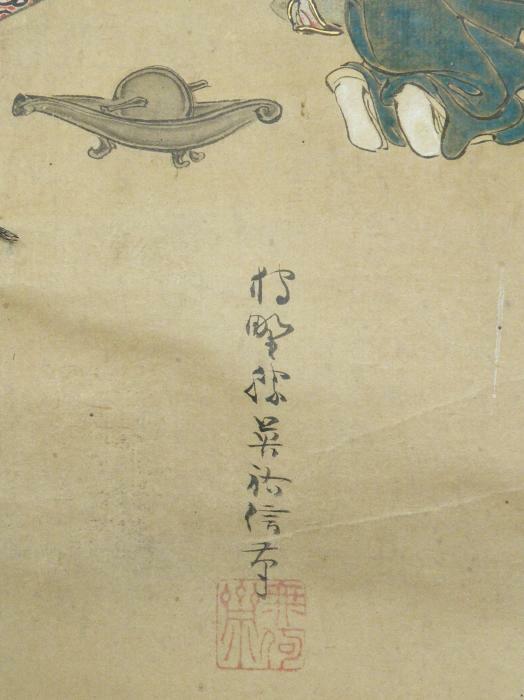 One member of the elite was Hosokawa Takakuni (1484–1531) commissioned Motonobu to paint a set of narrative handscrolls. 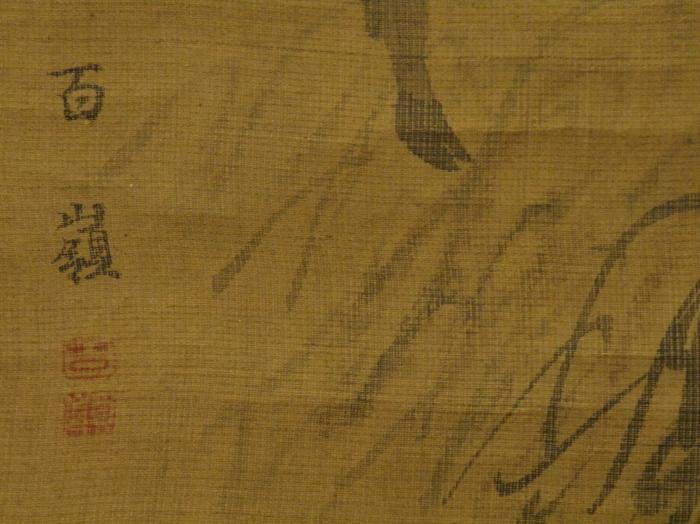 The handscrolls were commissioned in 1513 and are entitled Kuramadera engi (‘Origins of Kurama temple’; untraced). His clients were from the imperial courts and merchant classes in mainly Kyoto and Sakai. 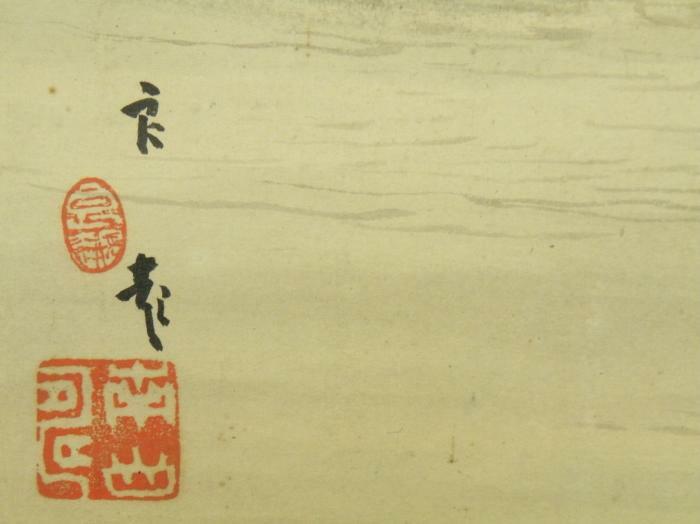 One of Motonobu’s earliest documented contracts was for a set of votive plaques (ema). These plaques depicted the Thirty-six Immortal Poets. It was ordered by a group of Sakai merchants in 1515 for the Shinto shrine of Itsukushima in what is now Hiroshima Prefecture. 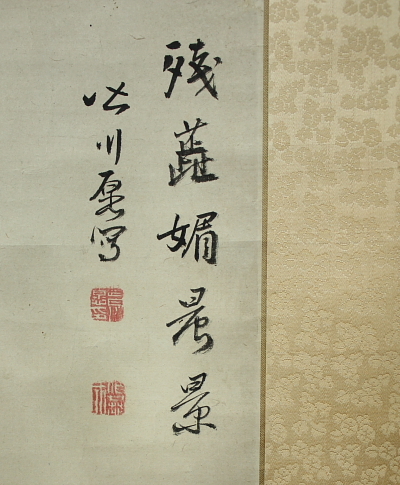 The Sanjōnishi family liked Motonobu’s work and in 1536 they invited Motonobu to give a painting performance. This family was well associated with the imperial court. The performance was done on a two-panel folding screen and performed in front of a group of guests. 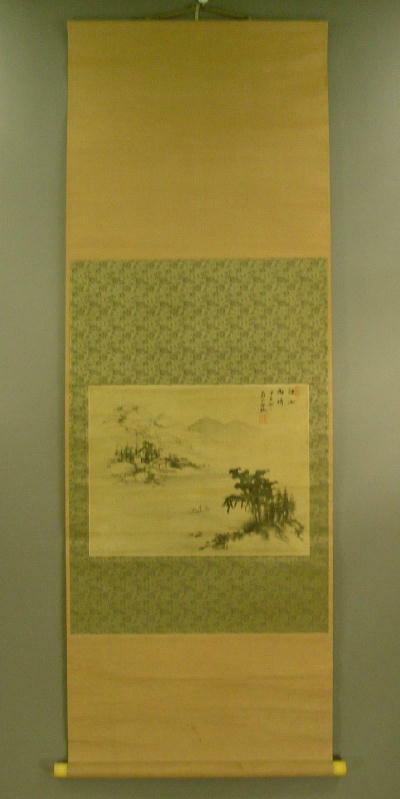 Motonobu presented folding screens to Emperor GoNara (reigned 1526–57). Motonobu had to be flexible to serve each of the patron’s individualistic taste. Motonobu is considered as the patriarch of the Kano School. 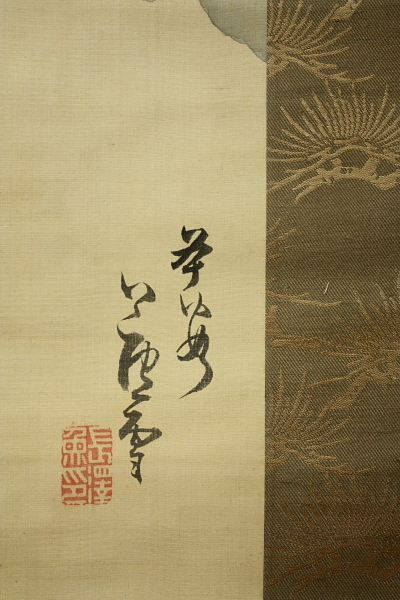 Motonobu played an important role because he combined his artistic talent with versatility. The Kano School is not actually a school, as the title implies, but it is an artistic workshop. The Kano School was organized in a systematic way based on four general characteristics. First, family ties played an integral role. The family tradition has to be pasted down. 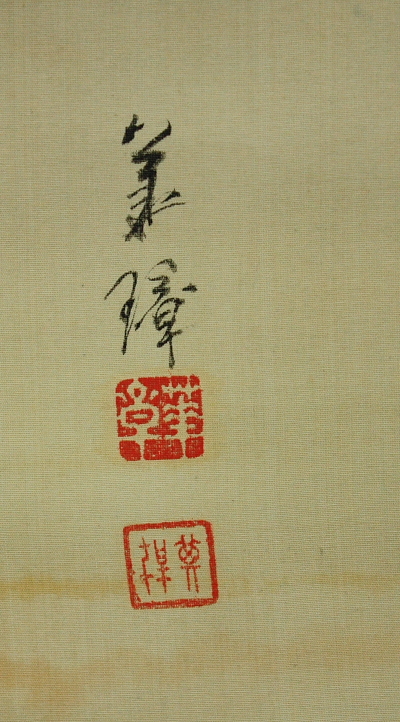 Records of the family were shown through handbooks, craft techniques, and trade secrets. Secondly, the tradition was passed through to a male member of the family. This statement can seem contradictory because the male member could be an adopted outsider. This ensures that the family could have great talent in their guild. The third characteristic is that there has to be a vertical relationship in the guild an example would be father to son. The oldest member has to be the head. This rule carries out the Kano tradition from generation to generation. The fourth characteristic is that bonds and alliances are made through contract or marriage. Sometimes when the guild has an enormous project it is better to collaborate. A contract or marriage makes sure that the family has the adequate means for the project. 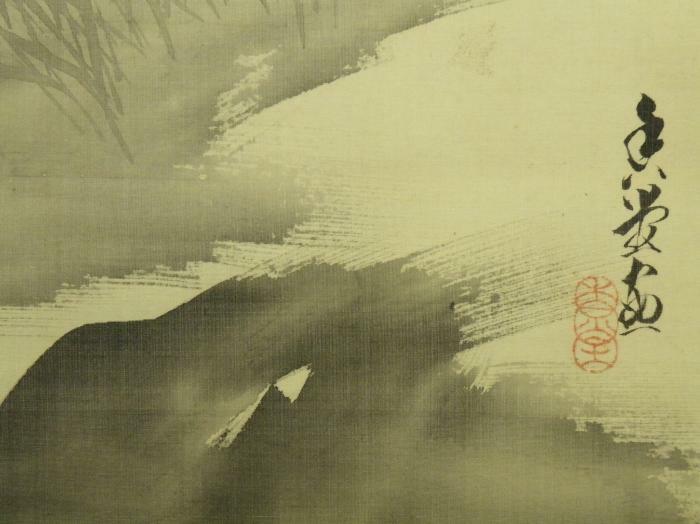 Tosa Mitsunobu, the founder of the Tosa school of painting was Motonobu’s father-in-law. 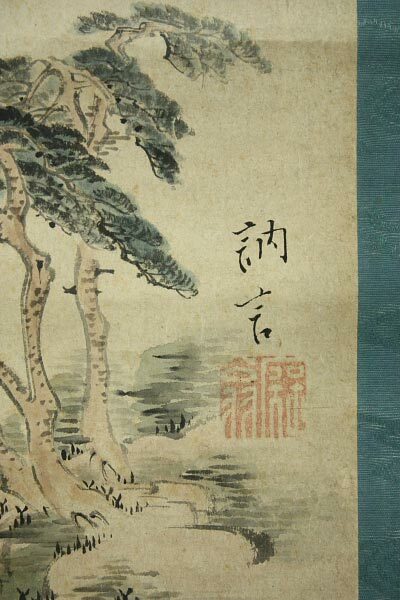 The Tosa School specialized in the Yamato-e (a Japanese painting style). 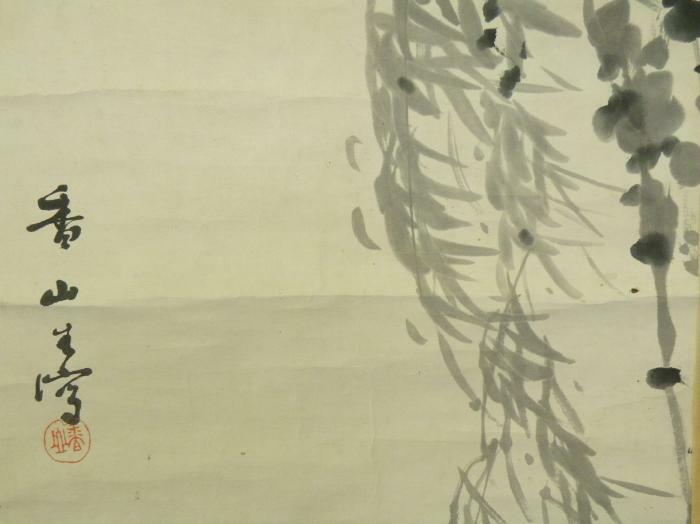 Mitsunobu combing the strong brushwork of suiboku-ga with the decorative appeal of the Yamato-e. 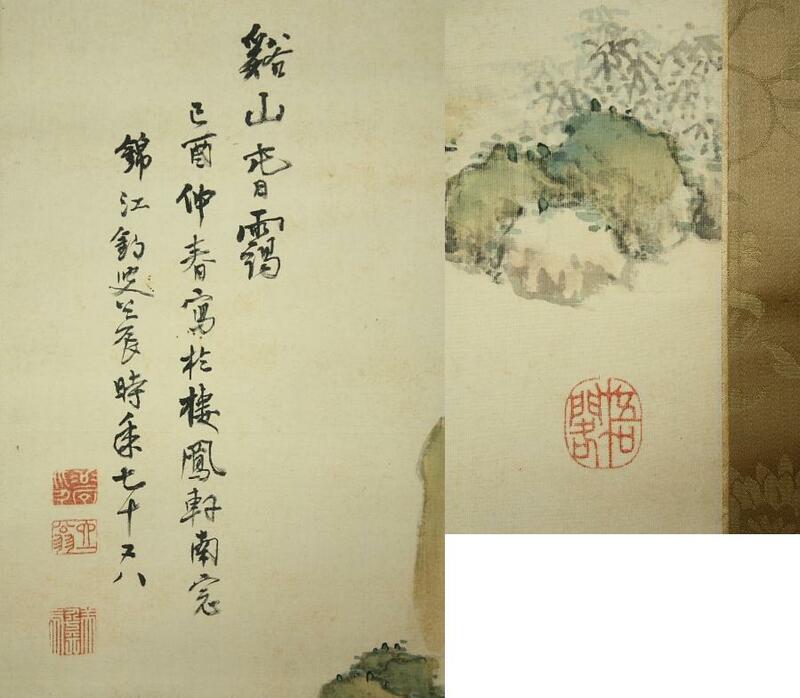 This style was suitable for large compositions and it dominated Japanese painting for the next three hundred years. 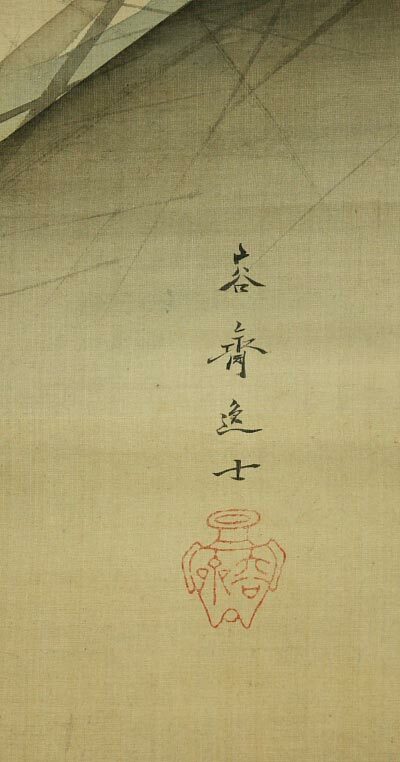 Shinshū (Pure Land) sect of Buddhism. This is unusual because Motonobu was a member of the Nichiren or Hokke sect. 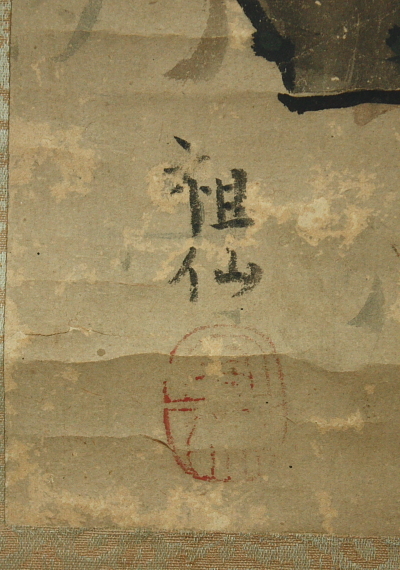 This group was arch-enemies of the Jōdō Shinshū. 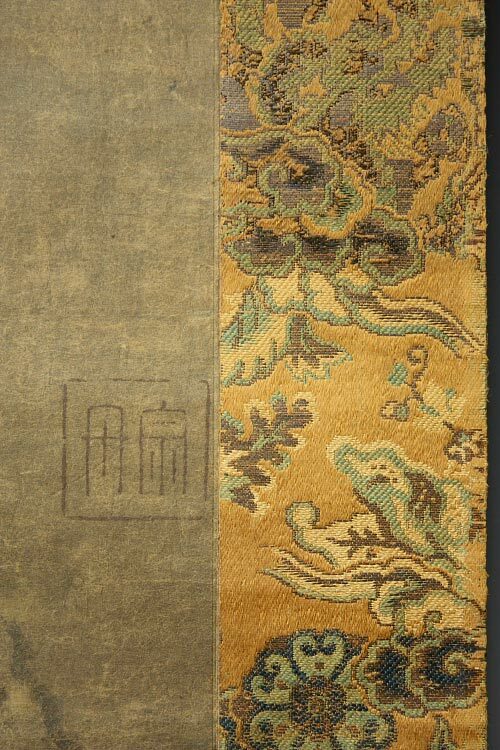 In 1541, Motonobu sent one hundred fans and three folding screens to the Ming emperor as gifts. 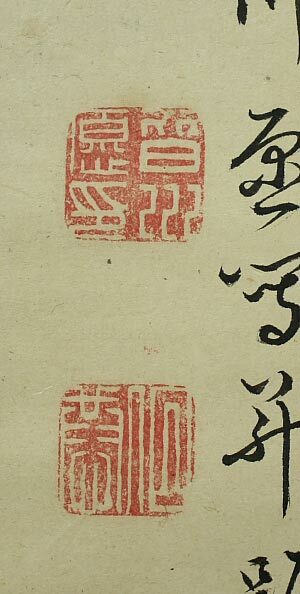 Like his father, Motonobu received a series of honorary court and religious titles, culminating in that of hōgen (Eye of the Law), which he was using by 1546. 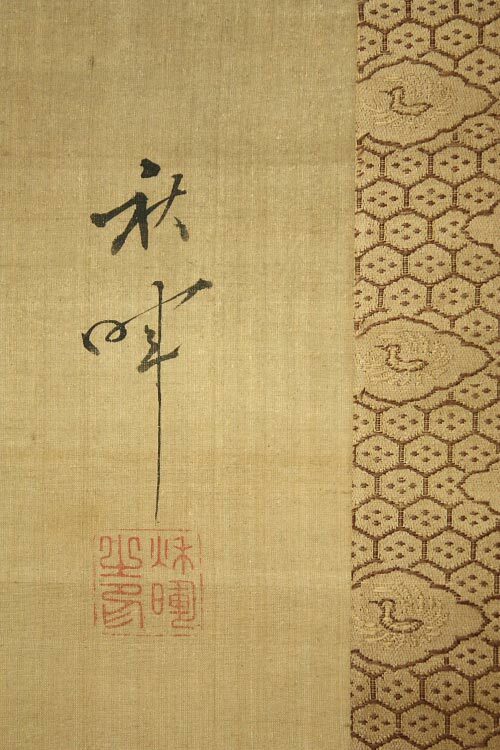 Motonobu trained his workshop which was full of members of his family and other apprentices to execute his many designs. His designs were items like folding fans to the prominent screen-and-wall paintings of the time. The workshop trained other artists by watching the master painter work. The students would watch Motonobu work and would gain experience by helping with commissions. Motonobu gave students the tools necessary for them to succeed. He unified the production of the hereditary members with the other associates in the workshop. One tool was that he standardized his compositions, and only had minor stylistic changes in them. 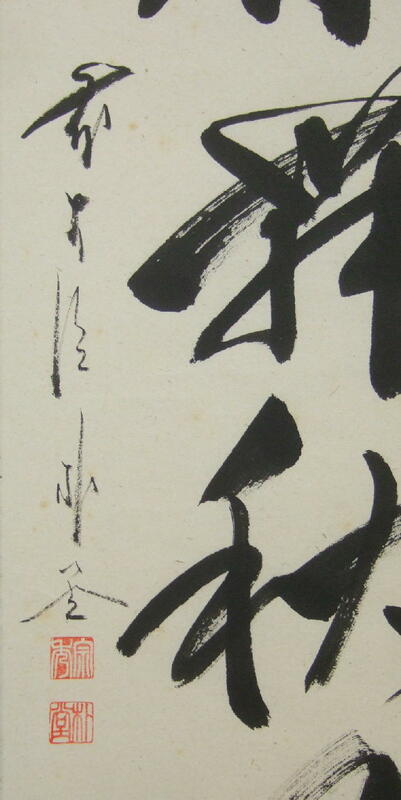 Motonobu also had a style of brushwork that he is very famous for. 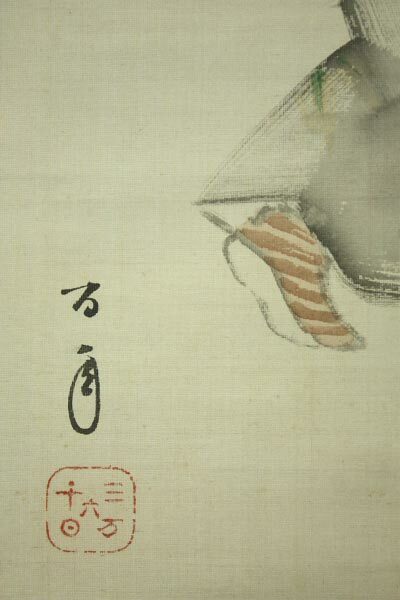 Motonobu’s painting have minimal color in them. The forms are organic, natural, and full of drama. 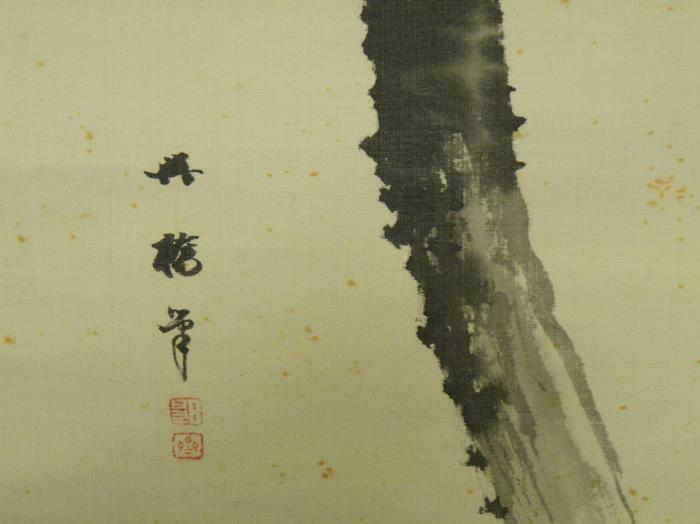 These paintings are also known as suibokuga (sumi-e) monochromatic water-ink paintings. 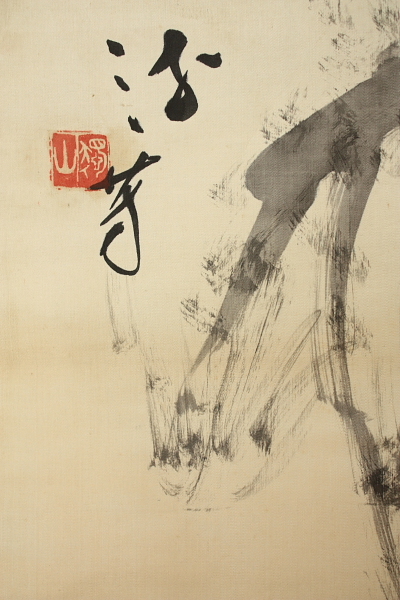 The brushwork is very dramatic and expressive. 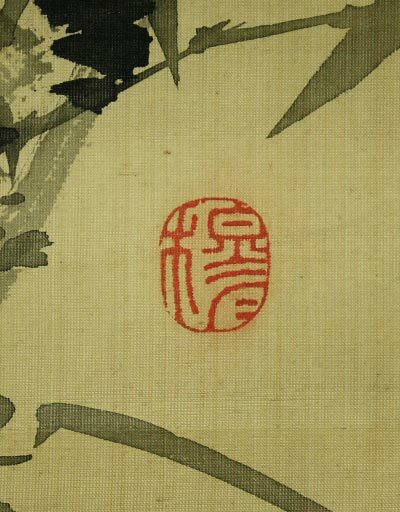 This brushwork is then famous for other generations. What works for one generation works for the next. The students would practice Motonobu’s style daily. Motonobu definitely lived up to the standards of his patrons. For if they didn’t the patrons would have turned them down. 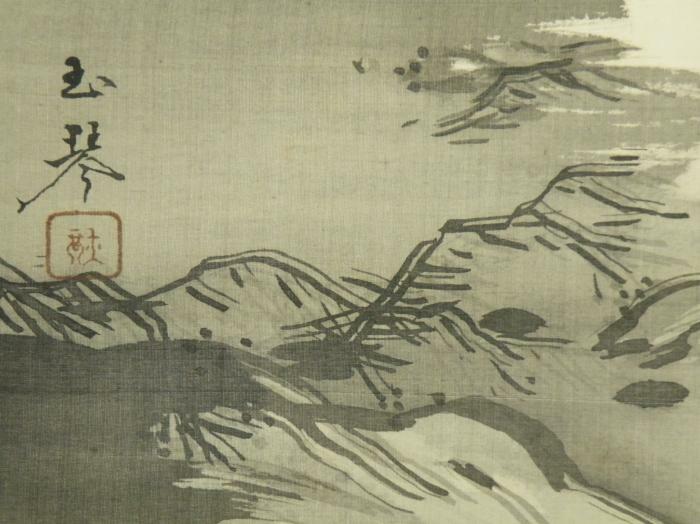 Motonobu was good at producing landscapes. 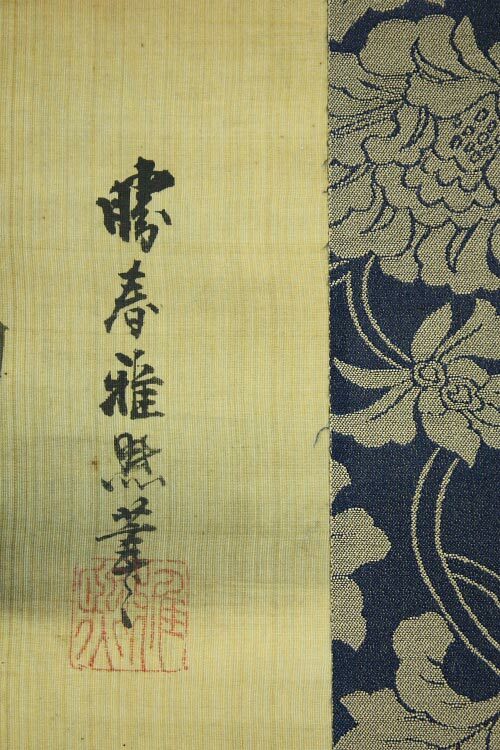 Motonobu introduced heavily stressed outlines and bold decorative patters. These landscapes were produced in both monochrome and in lighter colors. 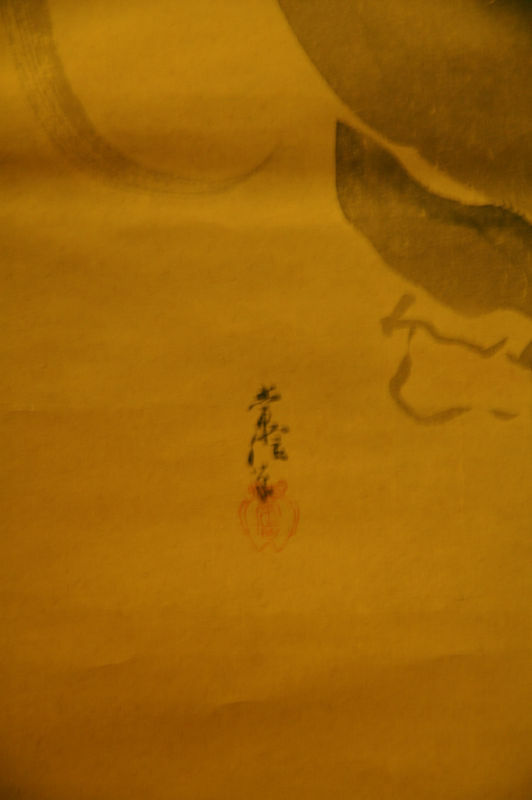 Motonobu was very skillful in and he created a variety of forms. He created figures, and also had flower and bird pictures. 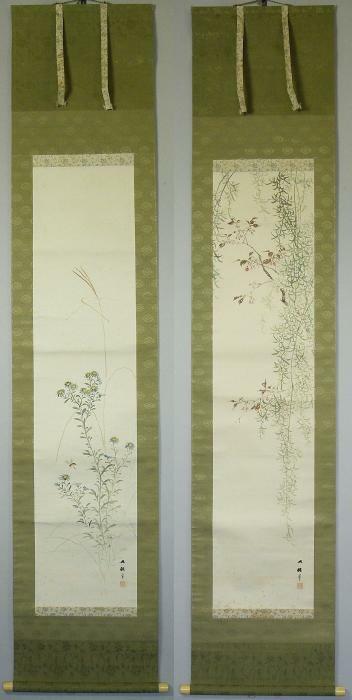 The screen paintings that Motonobu made served as architectural decorations. They appealed greatly to the warrior class. A lot of his paintings are still preserved in temples at Kyoto. 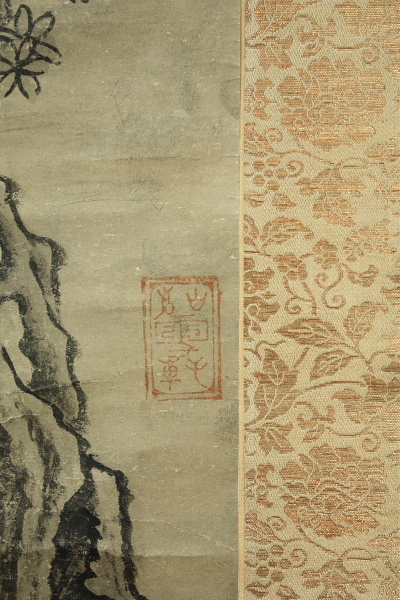 His paintings are on the panels of Reiun-in monastery in Kyoto. Motonobu did the principle rooms in the monastery. The rooms are decorated with landscape paintings in three different styles. The styles are by three different masters. 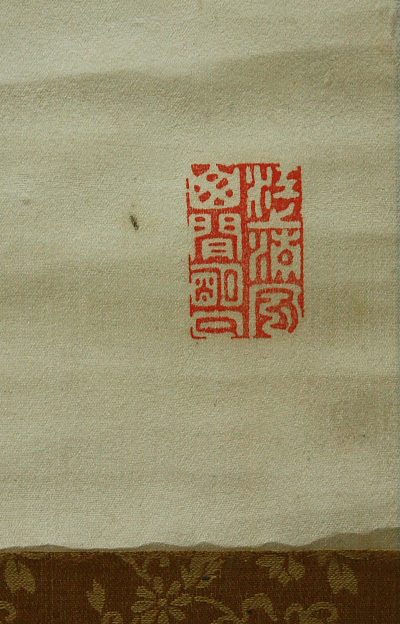 The soft ink-wash style was made by Mu-ch’i Fa-ch’ang (late 12th–early 13th century). 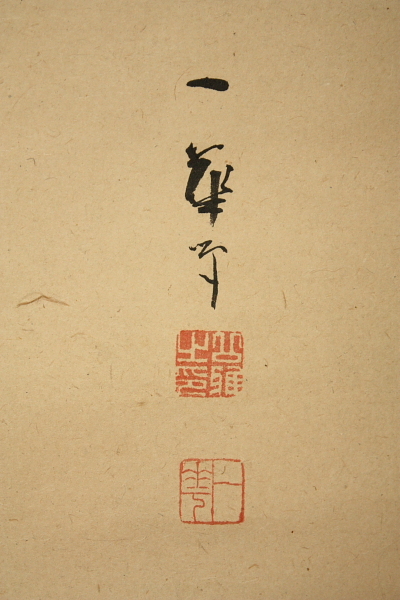 The more rigid, hard, stiff style is produced by Hsia Kuei (1195–1224). 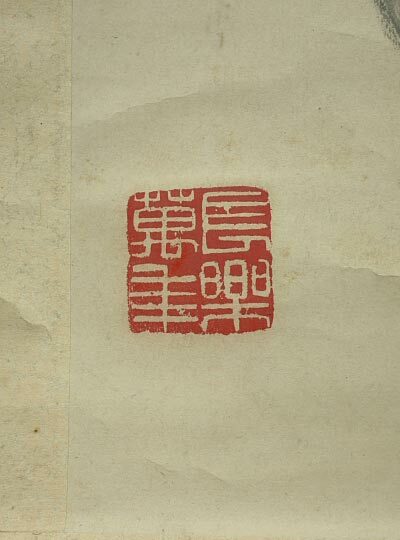 Lastly, the broken ink style was made byYü Chien (c. 1230). 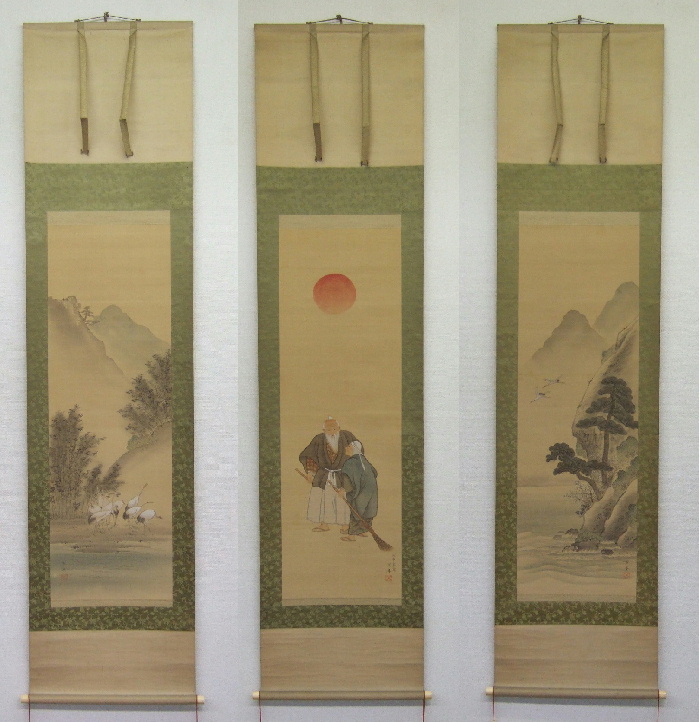 Motonobu’s paintings that were on the sliding panels are now mounted on hanging scrolls. 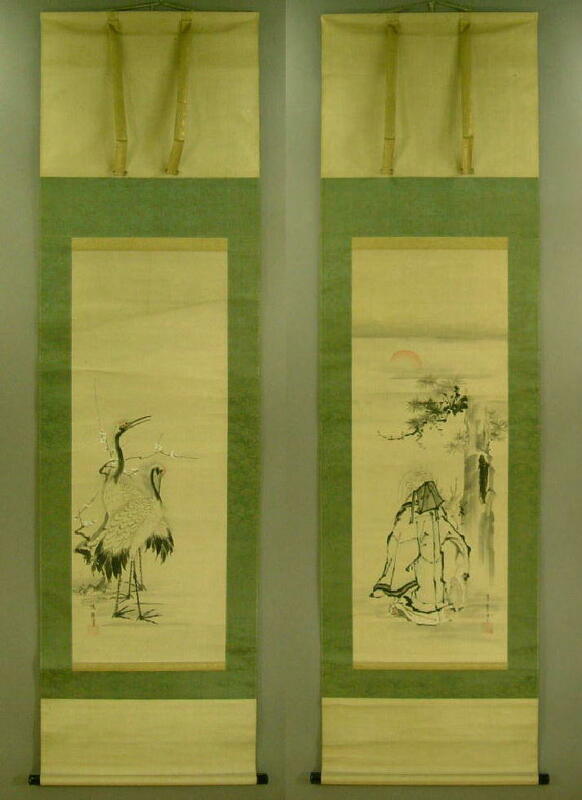 These hanging scrolls include “49 Landscapes with Flowers and Birds.” Also in the Reiun-in monastery are the monumental works of later Kano artists: Eitoku (1543–1590) and Sanraku (1559–1635). 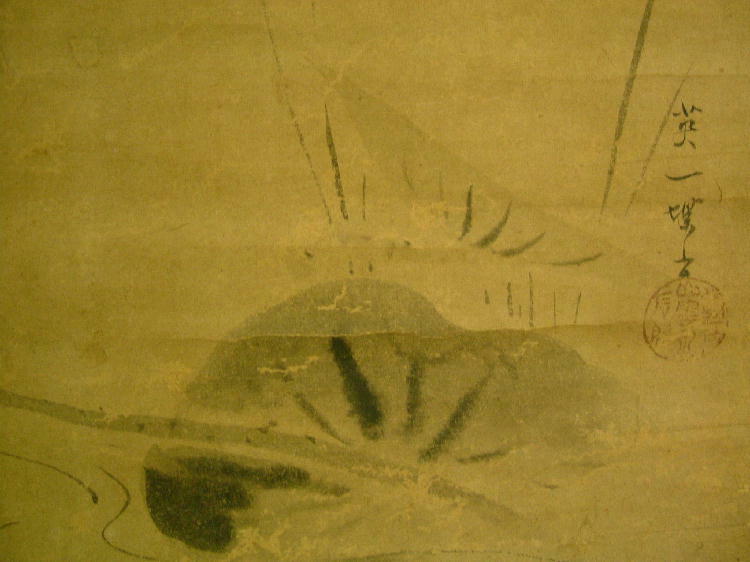 Motonobu had some paintings and in the Yamatoe style. 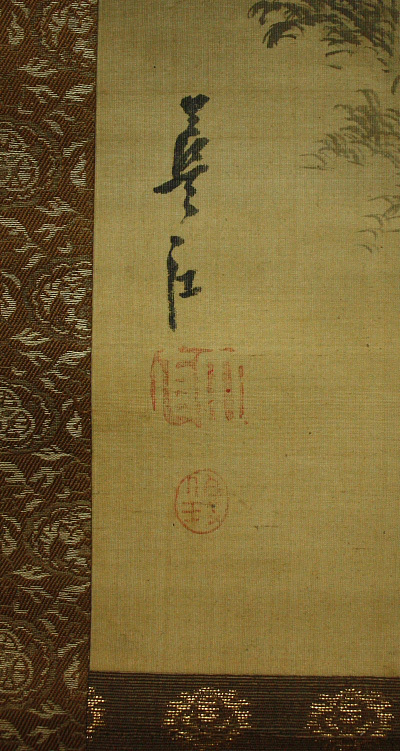 The set of hand scrolls Seiryōji engi (‘Origins of Seiryōji’, 1515; Kyoto, Seiryōji). 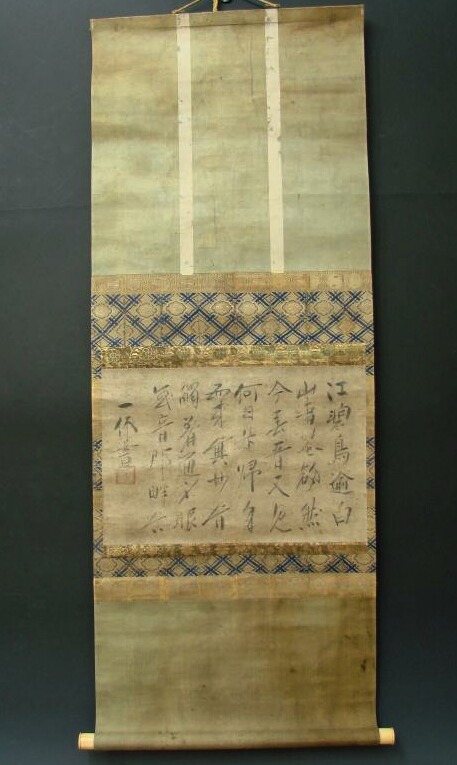 These hand scrolls show that he has a mastery of this style and its conventions. 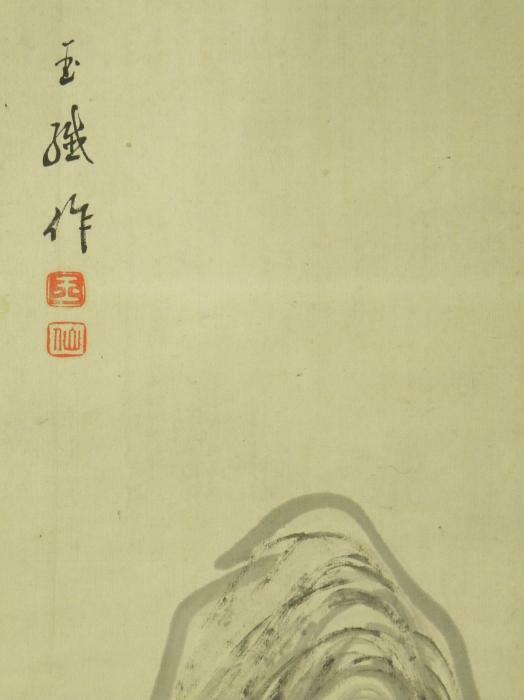 Motonobu was a master of many of the major pictorial styles of his time. 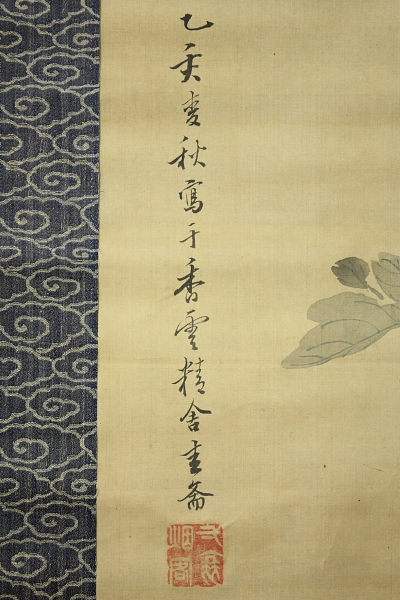 One of Motonobu’s greatest achievements was in the creation of a new technique for painting. 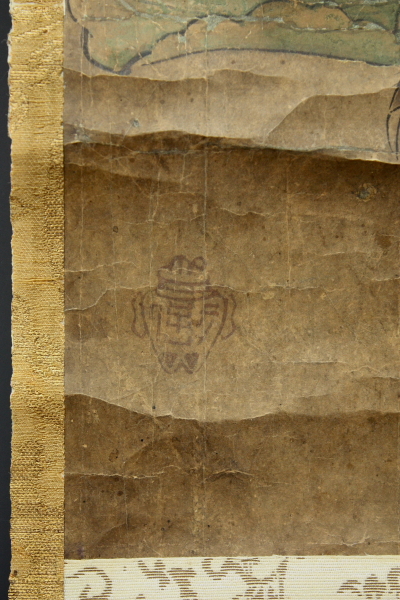 This technique formed the basis for early Kano school style. 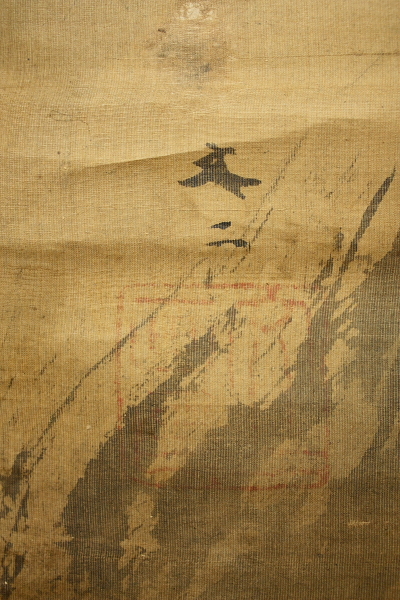 The technique was known as Wakan, a mixture of Japanese and Chinese painting. 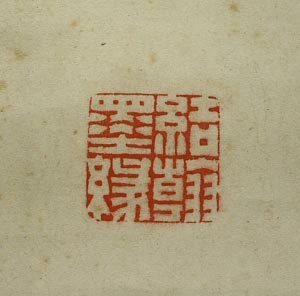 This combination had the spatial solidity and careful brushwork techniques of Kanga. 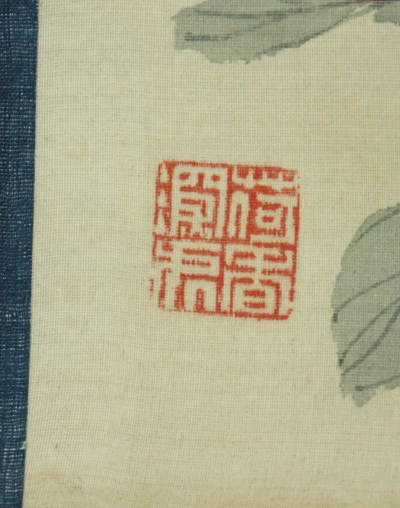 It also had some of the characteristics of Yamatoe style for instance the fine line, decorative patterning. 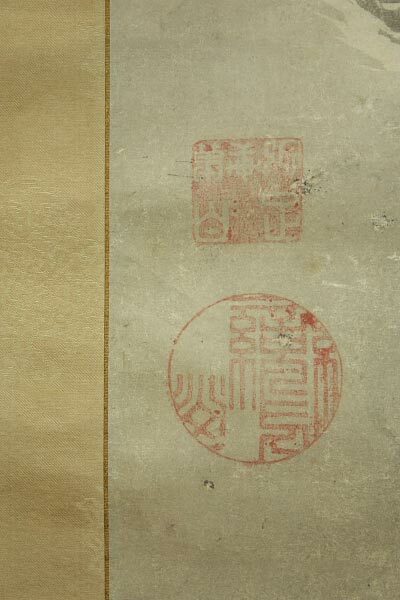 It also had further associations with Yamatoe like the use of colors and gold leaf. The wall panels depicting Birds and Flowers of the Four Seasons shows this combination of style. 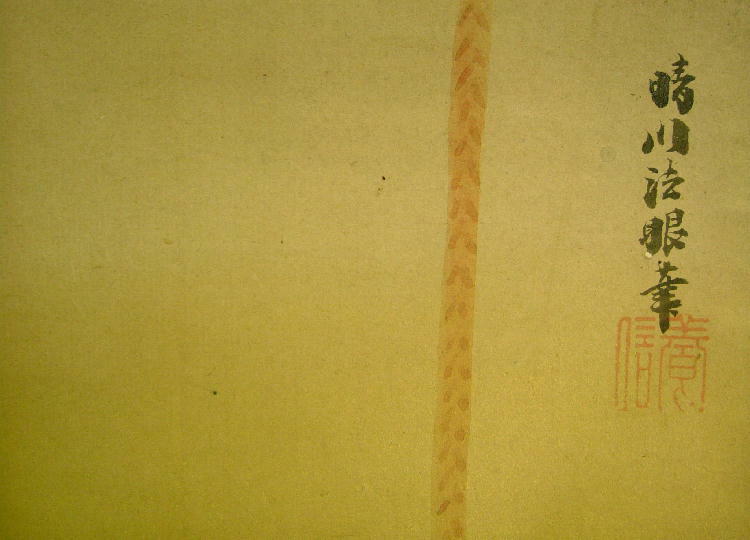 One of these hanging scrolls dates back to c. 1513 (Kyoto, Daitokuji, Daisen’in). 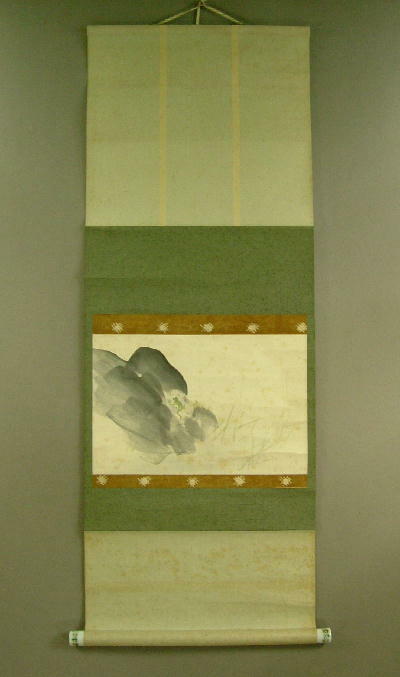 The other hanging scroll dates back to 1543–9 (Kyoto, Myōshinji, Reiun’in). He taught other generations everything he learned. This established some creativity and flexibility in the Kano School. 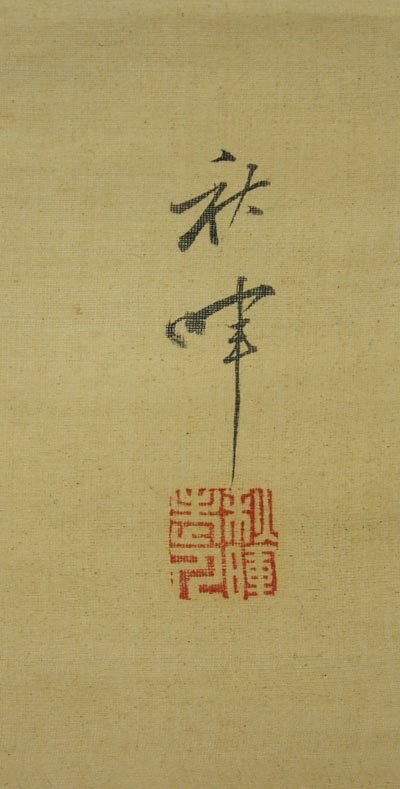 He not only did paintings but he applied three different styles of calligraphy. The first, is a formal style known as shintai (new form). 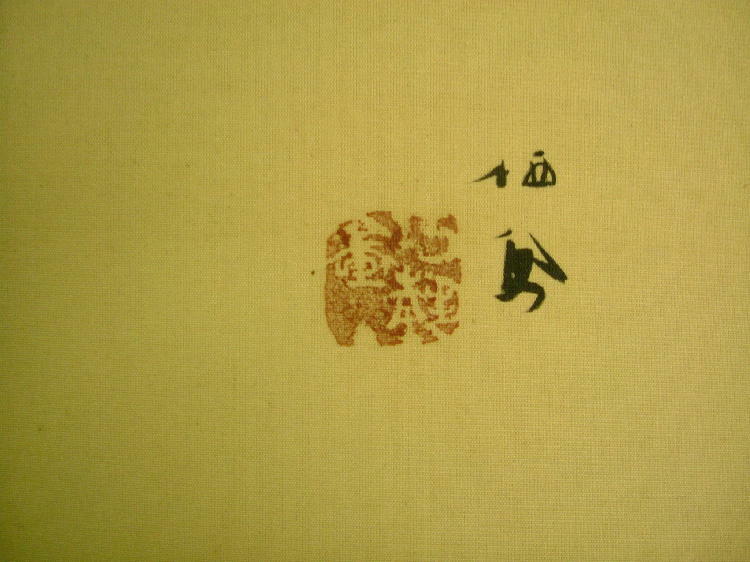 The second and more informal form was known as gyōtai (running form). 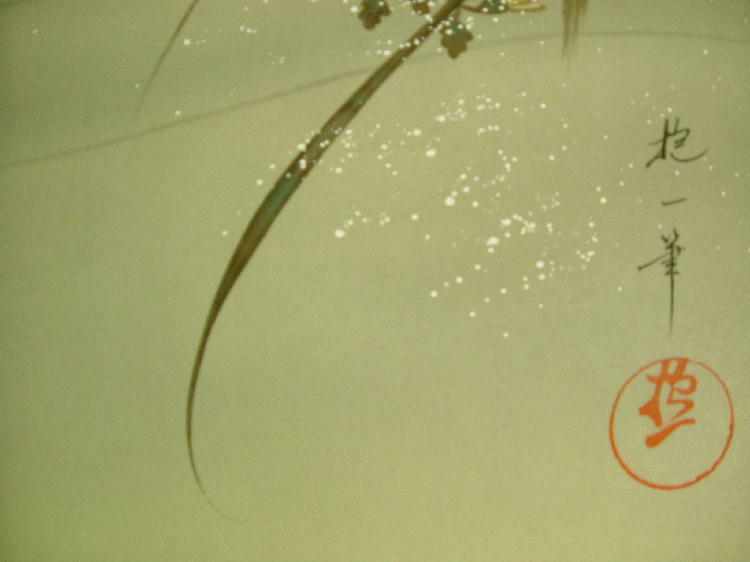 The third form is a cursive style called sōtai (grass form). The Story of Xiang yan (Tokyo, N. Mus.) 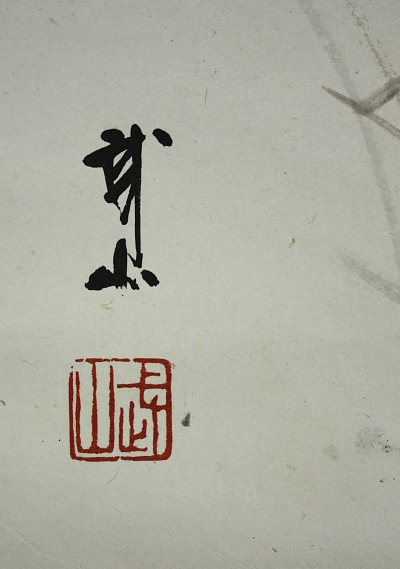 shows the emergence of Kano style, although, it has an underlying Chinese philosophy to it. 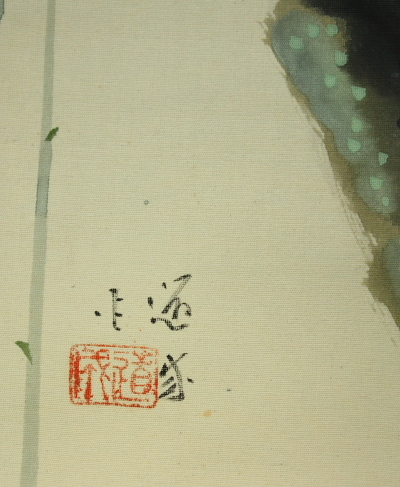 But the figure in the foreground is active and the vertical plane makes the painting Japanese. 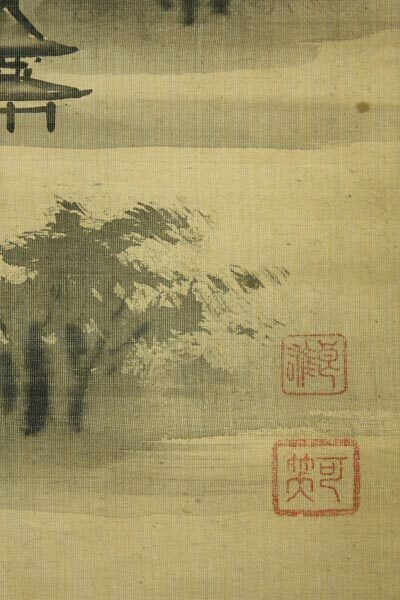 The brushwork and compositional elements also make the painting appear distinctively Japanese. He let others watch him so he cared about future generations developing his unique style. Because of his political connections, patronage, organization, and influence he was able to make the Kano School into what it is today. 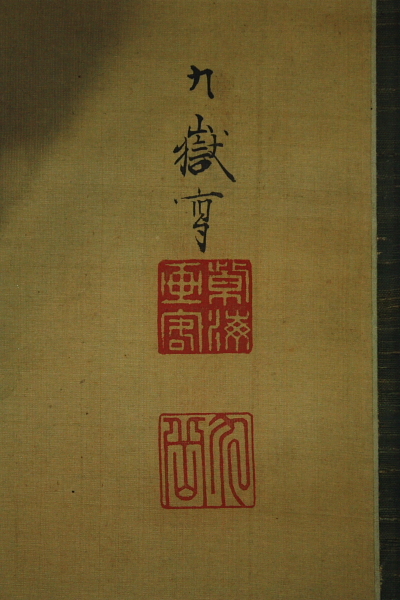 The Kano system of workshops has influenced many generations. 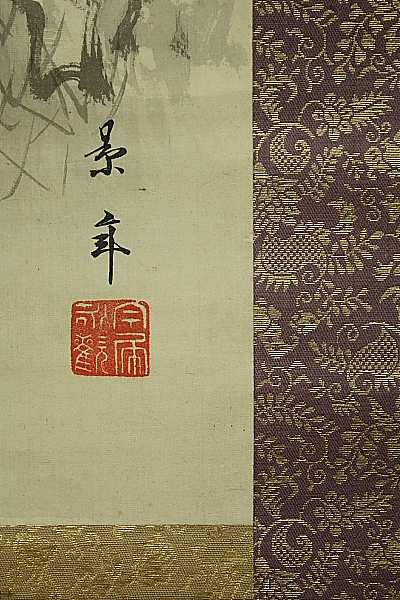 The system was responsible for the training of a great majority of painters throughout the Edo period (1615–1868). 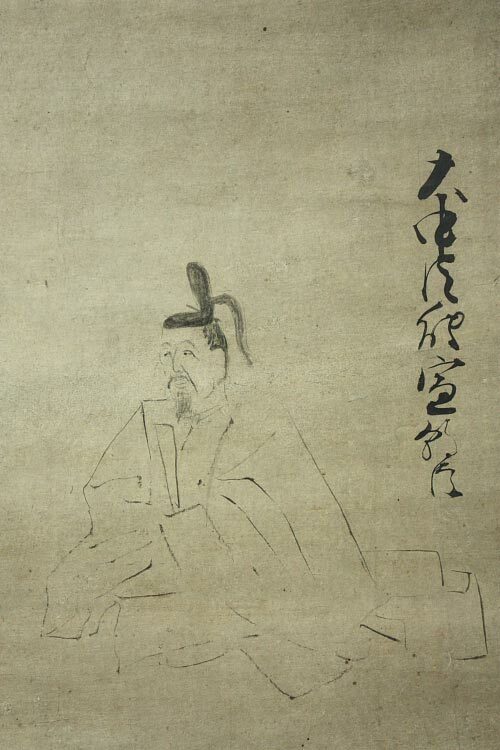 Kano Naonobu(1607 – 1650)Brother of Kano Tan’yu and Kano Yasunobu. 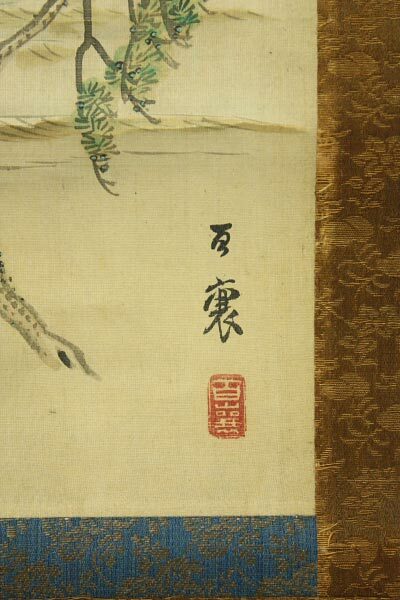 After the death of their father Kano Takanobu (1571-1618), Kano Koi instructed Naonobu and Yasunobu in painting. Since Tan’yu had already become an official painter-in-residence (goyo eshi) to the shogunate in Edo, his brother Naonobu inherited his father’s estate. 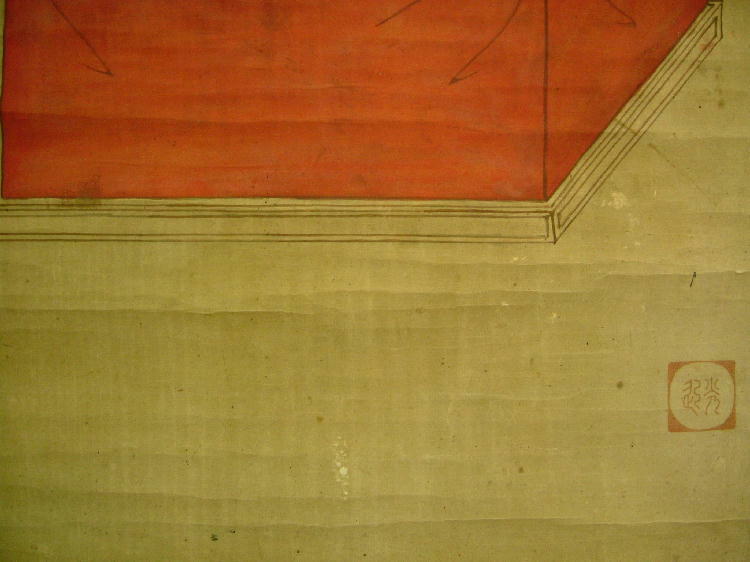 In 1625, Naonobu, along with Tan’yu, Yasunobu, Koi and other Kano artists, worked on the sliding-door ( fusuma) paintings of Nijo Castle in KYOTO. 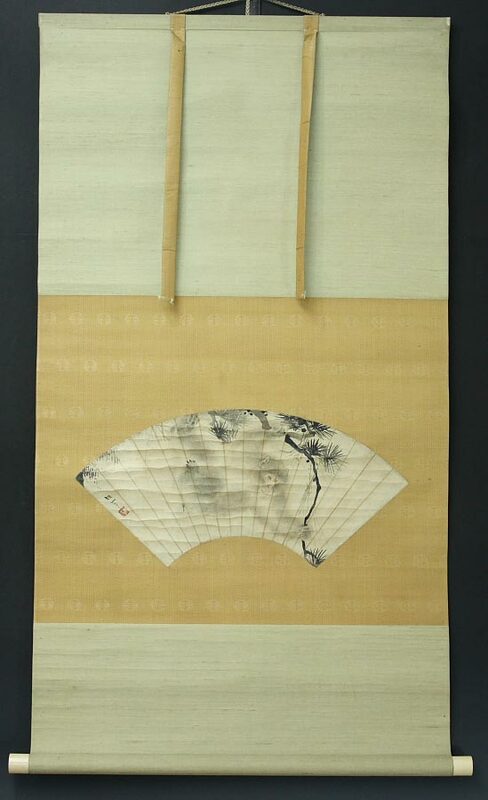 Kano <Shinsho> Okinobu　（acted 1789～1801）He acted Kansei,EDO period. He was granted an audience with the Shogun Tokugawa Ienari. 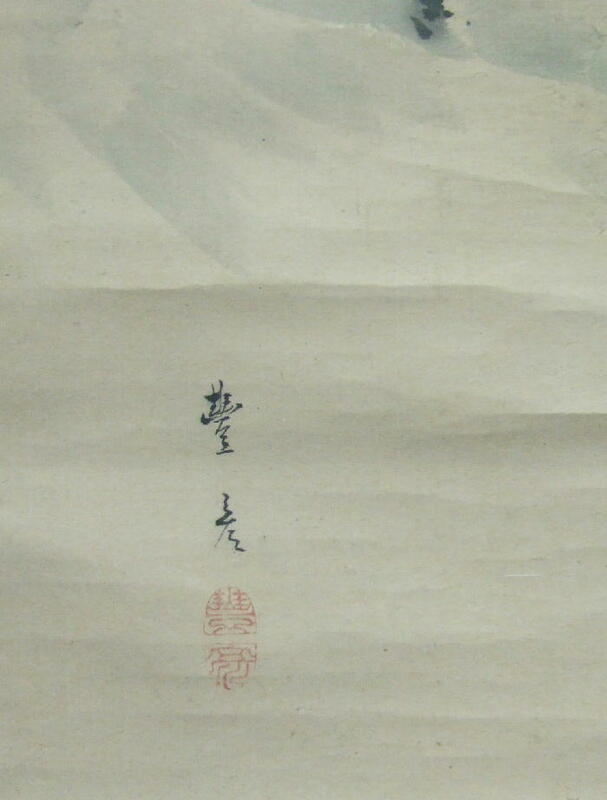 Kano <Tosyun> Yoshinobu (1747-1797) Kano painter. 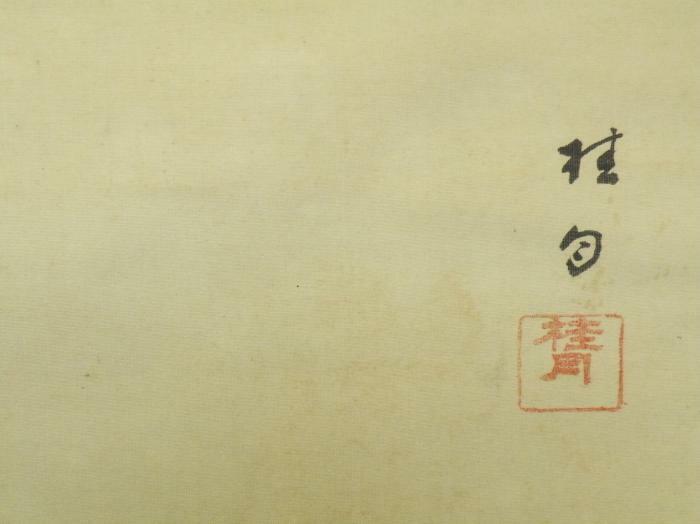 Son of Gensen Kano; became fourth-generation head of the Kano branch at Surugadai in Edo. 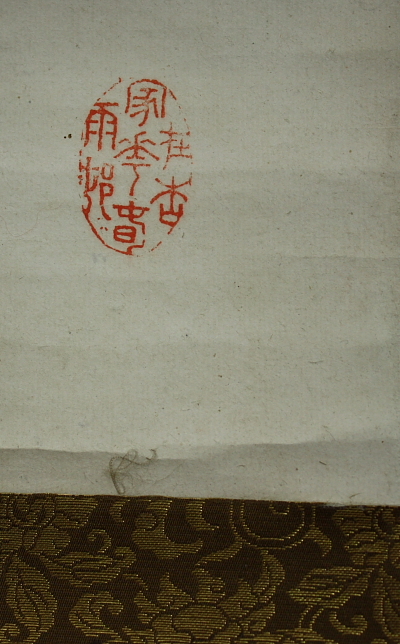 Pupil of Tosyu Kano. 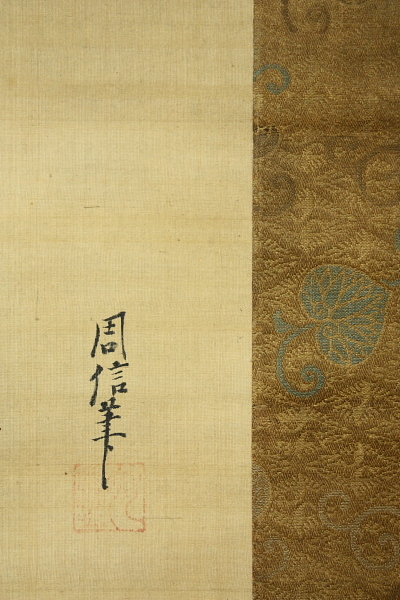 It is recorded that he painted a screen as a gift to the king of Korea from the Bakufu; also known to have worked on the ceilings and walls of the Rinno-ji in Edo. Given title of Hogan. Worked in the styles of Tan’yu and Sessyu. 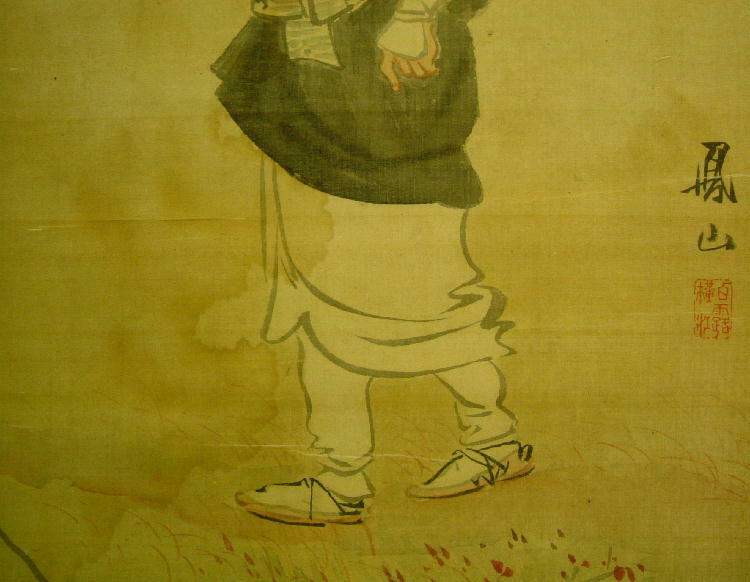 Kano Naonobu(1607 – 1650)Brother of Kano Tan’yu and Kano Yasunobu. 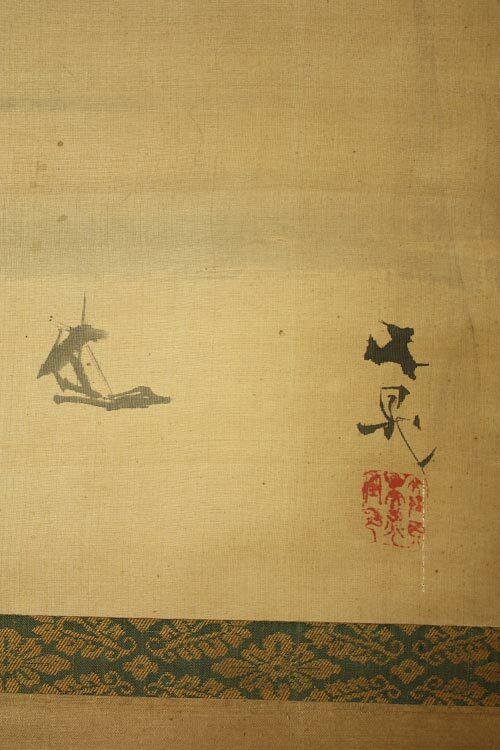 After the death of their father Kano Takanobu (1571-1618), Kano Koi instructed Naonobu and Yasunobu in painting. Since Tan’yu had already become an official painter-in-residence (goyo eshi) to the shogunate in Edo (now Tokyo), his brother Naonobu inherited his father’s estate. 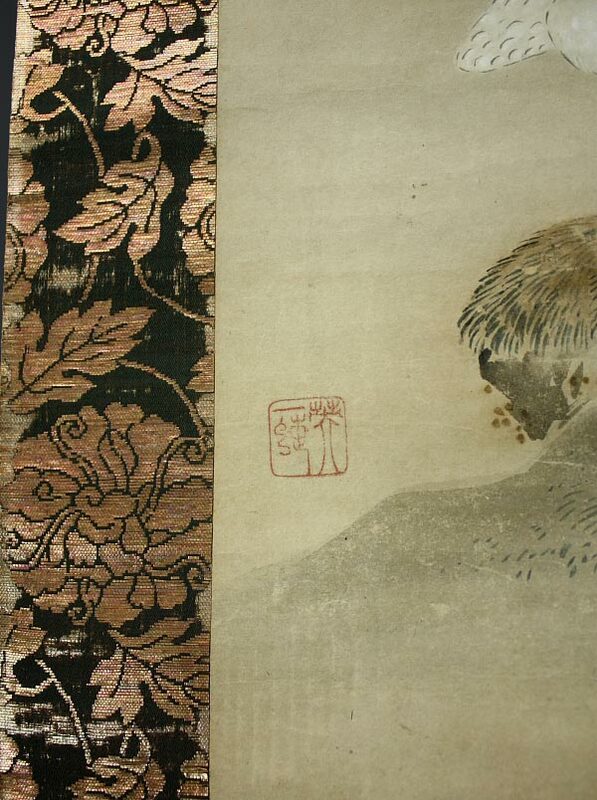 In 1625, Naonobu, along with Tan’yu, Yasunobu, Koi and other Kano artists, worked on the sliding-door ( fusuma) paintings of Nijo Castle in KYOTO. The Kano School flourished because of leaders like Motonobu. 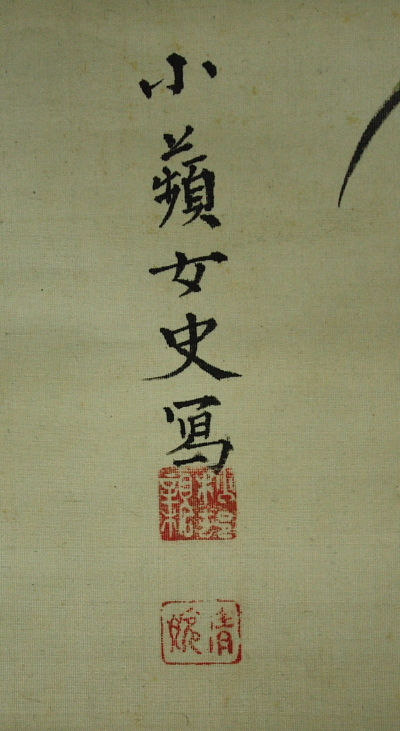 Motonobu’s reputation, talent and developed organizational skills made this possible. The school was founded in the fifteenth century but has had a landmarking impact. The system was patriarchal and modeled after other guilds before its time. Going from one male in a generation to the next. Strict teaching made the Kano School a success. Teaching was a focus in the school and Motonobu stressed. 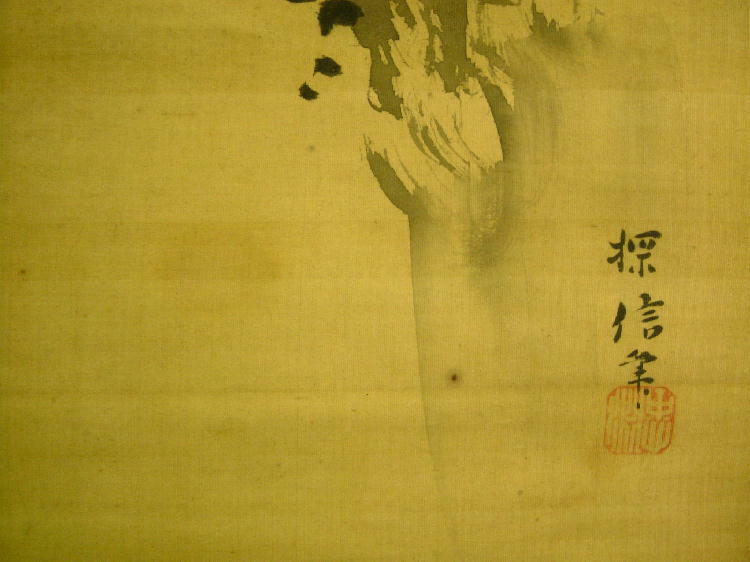 Kanō Sansetsu (1589 – 1651) was a Japanese painter also known as Kano Heishiro. Sansetsu was apprenticed to Kanō Sanraku, married his daughter, and was adopted by him after the death of Sanraku’s eldest son. Sansetsu became the leader of the Kanō school. 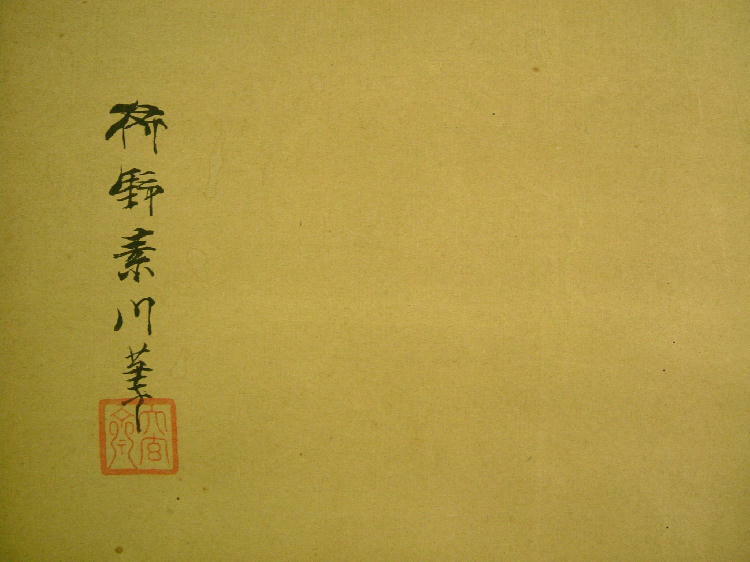 Kanō Shōsen’in (狩野勝川院)(1823-1880) was a Japanese painter of the Kanō school. 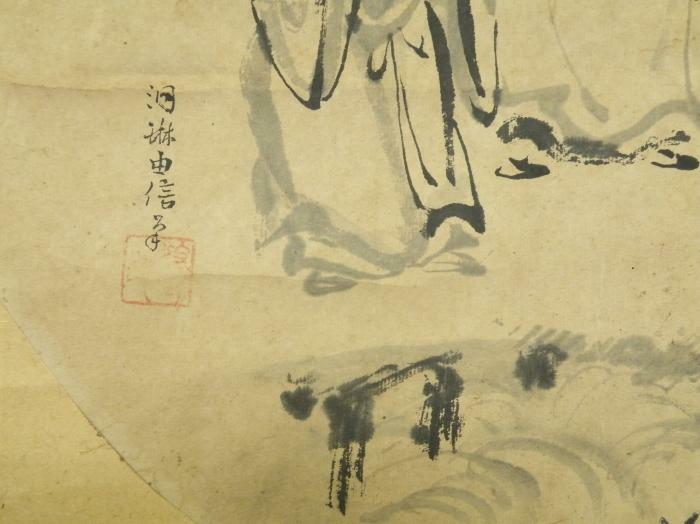 He was also known as Kanō Masanobu and Kamp Shōsen, and took the gō (art-names) Soshōsei and Shōko. 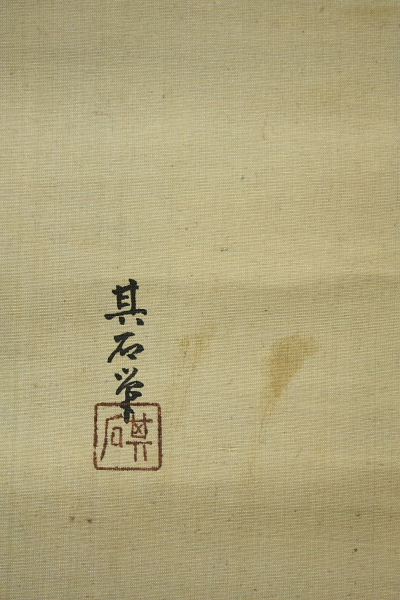 Shōsen’in studied in a studio in the Kobikichō section of Edo, under his father, Kanō Seisen. Kano <Ryomin> Takanobu (act middle EDO<18c>period)His real name was Ikeda.He was a son of Ikeda Yuseki.He studied under Kano Tanshin & Kano Eishuku.He worked at Mito(Ibaraki)clan. 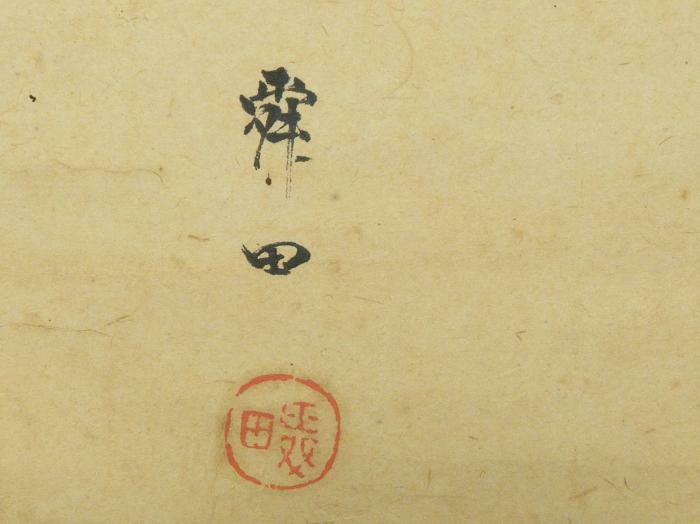 Kano Tangen ( act around 1818 )He was a painter at Edo latter term.His real name is Moriaki. He was a painter of the Tokugawa Shogunate. 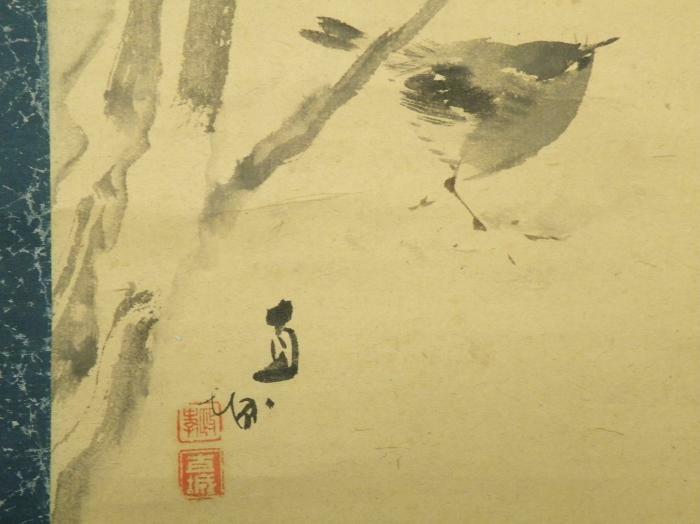 Kanō <Tanshin> Morimasa (1653-1718)He was a Japanese painter. 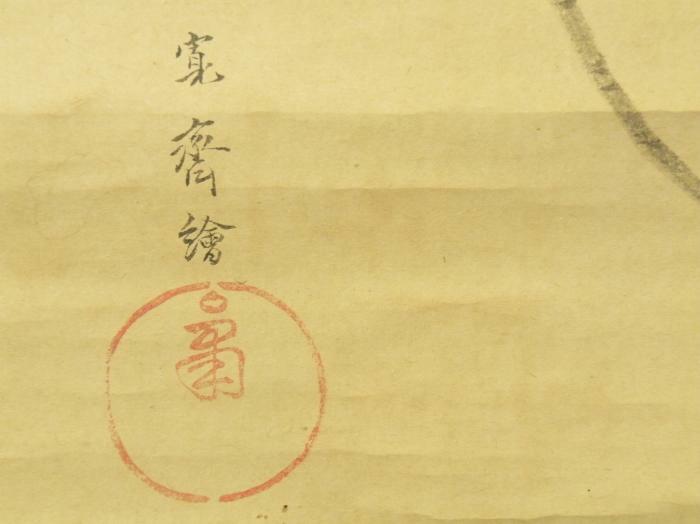 He was the son of Kanō Tanyū by his second wife, and led the Kajibashi branch of the Kanō school after 1674. Kano <Tanshin> Morimichi (1785-1835)He was the seventh generation head of the Kajibashi line of the Kano school. Kano <Tanen> Morinao(1805 –1853) He was a oldest son of Kano Tanshin<Morimichi>. He received the honorary title of hogan. 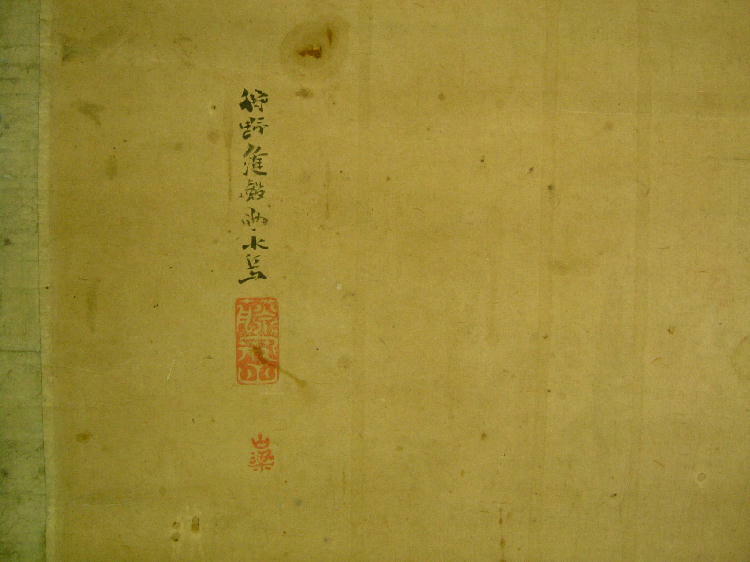 Kano Tan’yu(1602-1674) was one of the foremost Japanese painters of the Kano school. His original given name wasMorinobu; he was the eldest son of Kano Takanobu and grandson of Kano Eitoku. Many of the most famous and widely known Kano works today are by Tan’yu.In 1617, Tan’yu was appointed by the Tokugawa shogunate to become one of the shogunate’s official artists. Over the following years, he was given many highly prestigious commissions. Over the 1620s and ’30s, he created a number of large-scale works for Edo castle, Nijo castle, Osaka castle, Nagoya castle, and Nikko Tosho-gu.Prolific in a variety of painting styles, Tan’yu’s most famous works are probably those he produced for these large-scale commissions. 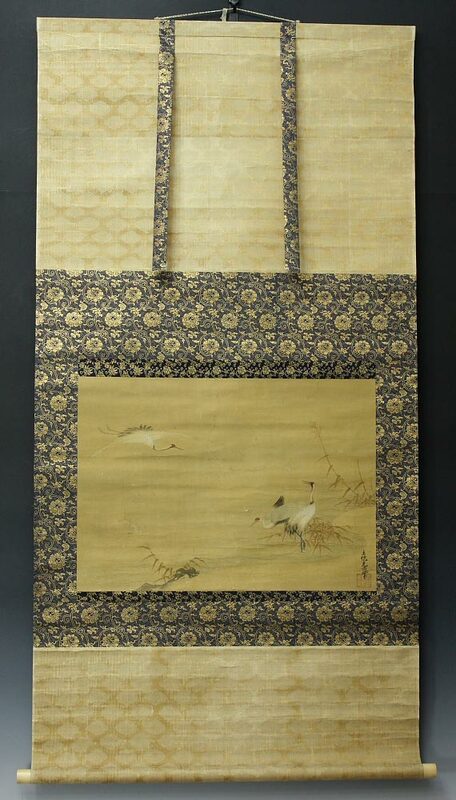 They are screensand panels, prime examples of the Momoyama style, depicting natural subjects such as tigers, birds and plants, in bright colors and with extensive use of gold leaf. The gold, often used to represent clouds, water, or other background elements, would reflect what little light was available indoors, brightening a castle’s dark rooms. 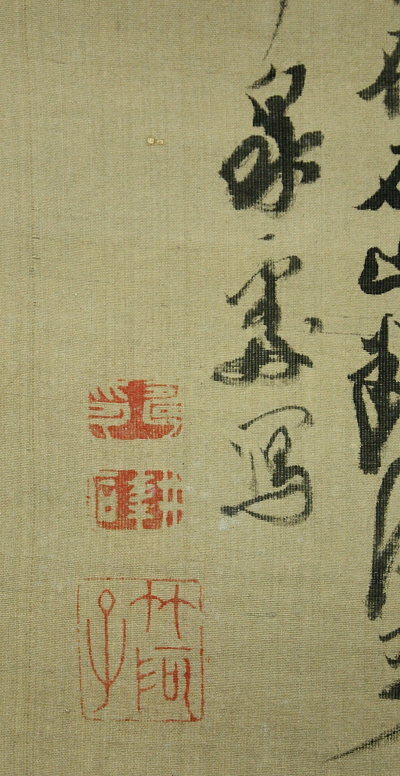 Tan’yu was also accomplished, however, in monochrome ink painting based on the prototypical style of the Muromachi period, yamato-e compositions in a style similar to that of the Tosa school, and Chinese style scrolls. 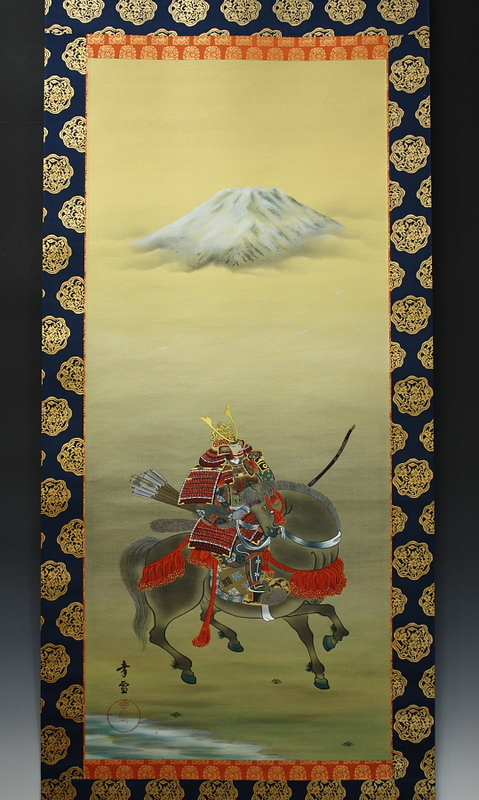 His most famous yamato-e work is a narrative handscroll depicting the life of Tokugawa Ieyasu,the first Tokugawa shogun and major figure in Japanese history. 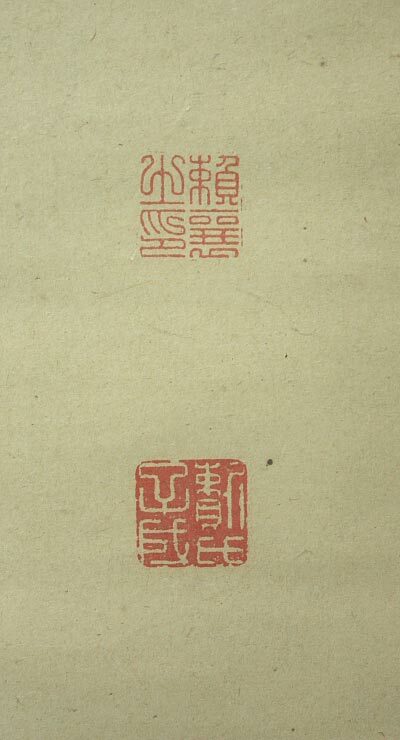 It was after this commission, in 1640, that the artist first took on the “artist name” of Tan’yu. 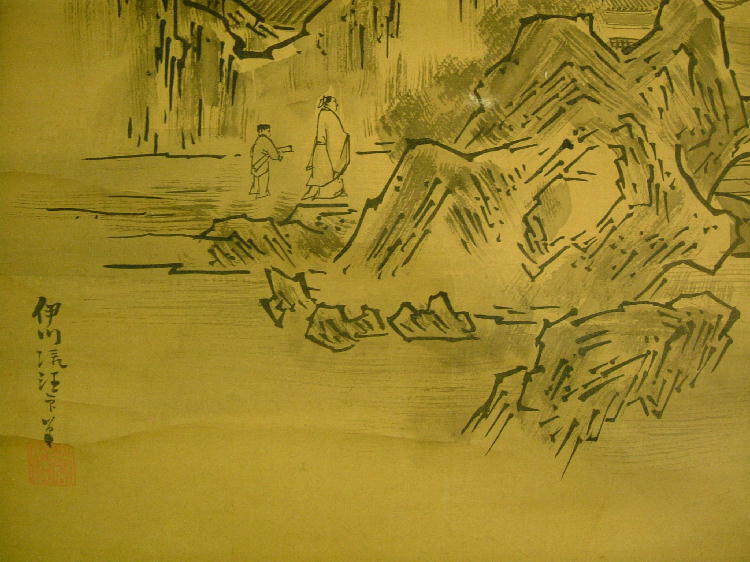 In addition to being a highly honored and respected painter in his own right, Tan’yu was known as a collector and connoisseur of Chinese paintings. He made sketches and kept records of many of the paintings that passed through his studio, brought to him for authentication. Kano Tsurusawa Tanryu (??? ?-1855) He was a child of Tsurusawa Tansaku. He received the title of hogan.His real name was Moriteru. 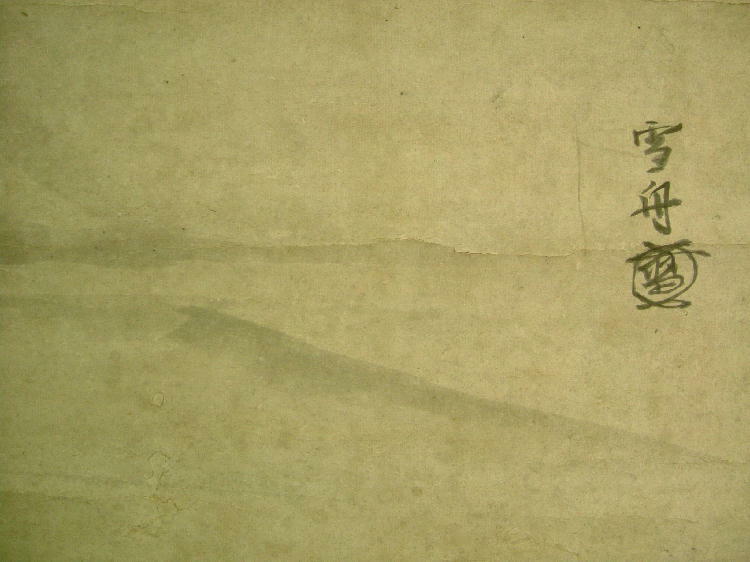 Kano Tosho (act around late edo period : 1801～1868) He was a Shogunate order painter who was a pupil of Kano Toshun. 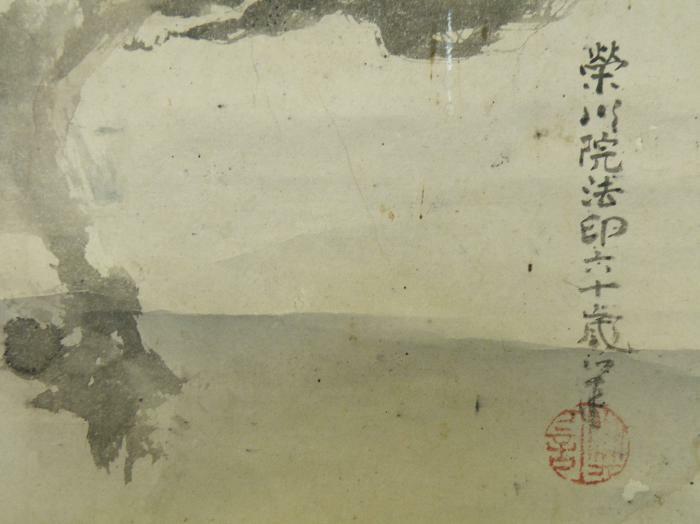 Mochizuki Shosai(1814-1892)& Shimizu Tokoku(1841-1907)studied painting under Kano Tosho. Shimizu Tokoku is his son. KANO TSUNENOBU(1636-1713). Eldest son of Kano Naonobu. After his father’s death in 1650, he became head of the Kobikicho line of the Kano school. 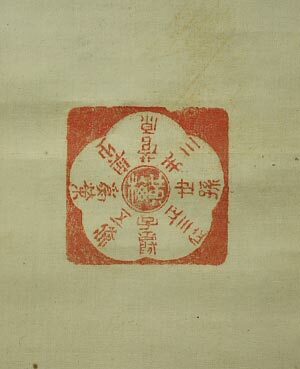 In 1704 he received the honorary title of hogen (Eye of the Law) and in 1709 the most coveted title of hoin (Sign of the Law). He was buried at Honmonji, a temple in the Ikegami area of Edo (now Tokyo) Also his name is YOBOKU or KOSEN. Kano Yasunobu (1613-1685) Brother of Kano Tanyu and Kano Naonobu. He received his formal instruction as a painter from Kano Koi, who had also taught his brothers. At the age of ten he was selected to succeed Kano Sadanobu (1597-1623), the son of Kano Mitsunobu, as head of the Kano school and was given the artist’s name Ukyonoshin, which had formerly been used by Mitsunobu.In 1630 Yasunobu moved to Edo, where he served, like his brothers, as goyo eshi (painter-in-residence) at the shogunal court. He was granted a residence in the Nakabashi district of Edo, where he founded the Nakabashi Kano atelier, one of the four highest-ranking Kano studios. Kano <Yusen> Hironobu (1778－1815) He was a second child of Kano Kansen.He received the honorary title of HOGAN. He became the 5th generation head of the Hamamachi line of the Kano school in 1792. Karasuma Mitsuhiro (1579-1638) He was a head of Karasuma family. 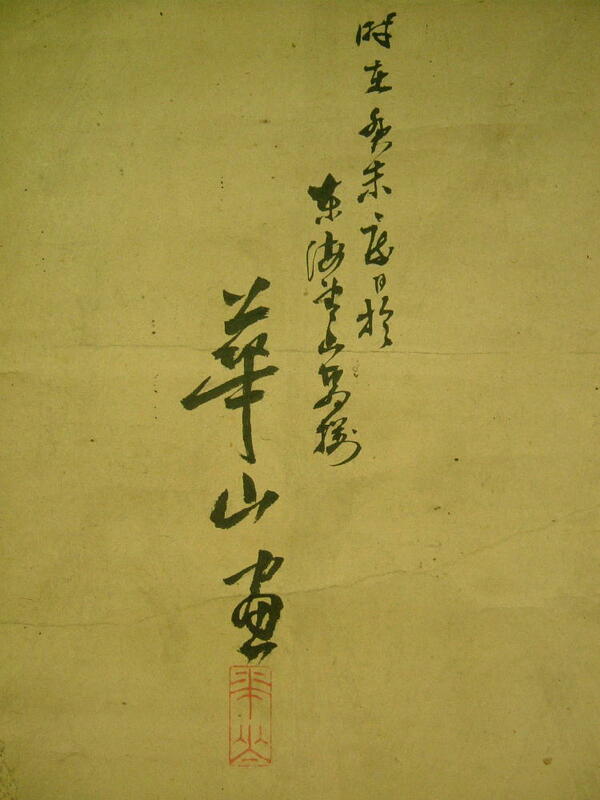 He was a poet,Kugyo and calligrapher. KATSUSHIKA HOKUSAI(1760-1849) Japanese painter, draughtsman and printmaker. His work not only epitomized ukiyoe (‘pictures of the floating world’) painting and printmaking. 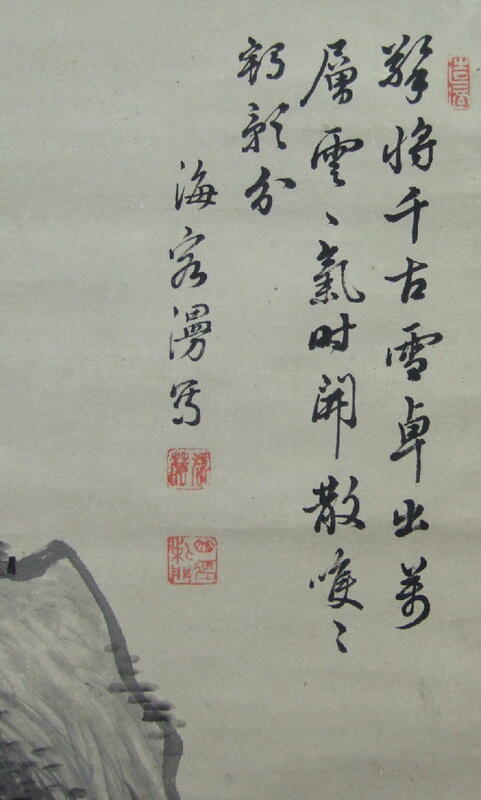 Katayama Hodo (act:18th century)He acted in middle EDO period.He was a pupil of Kano <Zuisen> Sukenobu. Kawabata Gyokusho (1842~1913) was born in Kyoto. He learned MAKIE, a Japanese lacquering technique, from his father who was a specialist of MAKIE. 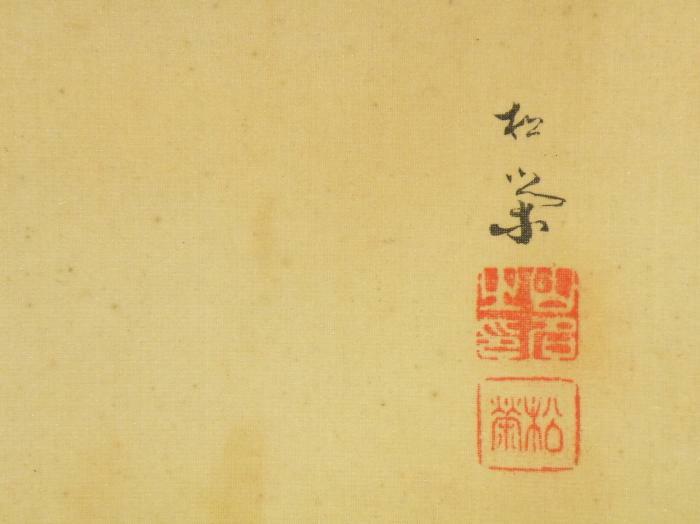 In 1852, he studied the style of the Maruyama School from Nakajima Raisho and Oda Kaisen. Gyokusho also studied Western painting in Tokyo under Charles Wirgman. During his career, he won many prizes in domestic expositions. Kawakita Kaho(1875-1940)Born in Kyoto.His real name is Gen-no-suke.Kaho studied with Kono Bairei and later with Kikuchi Hobun. Kawamura Bunpo (1779-1821)He was a Kishi school painter. 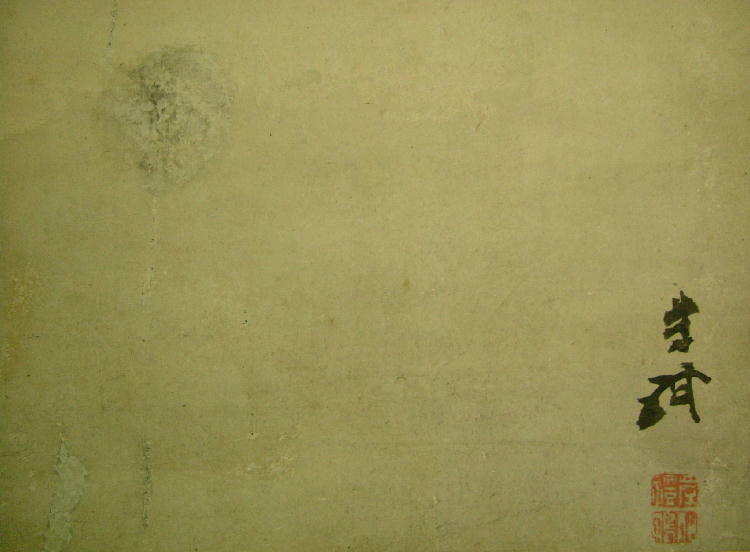 He studied painting under his teacher, Kishi Ganku. He lived in Kyoto. Kawamura Ukoku (1837-1906)He was a painter & judicial officer.His real name was O-shin.He studied painting under Kinoshita Itsuun&Tetsuo Somon.He retiered judical officer in 1898.Later,He was a leading figure in Bunjin painting circles. Kawashima Baikan(1902-1977)Japanese artist.He graduated Kyoto painting specialized school .He studied painting with Syunkyo Yamamoto and painted the scenery/flowers and birds pictures very well. Kawai Gyokudo (1873-1957) Born in Aichi prefecture, Ichinomiya city as the eldest son of a traditional Japanese stationary shop owner. 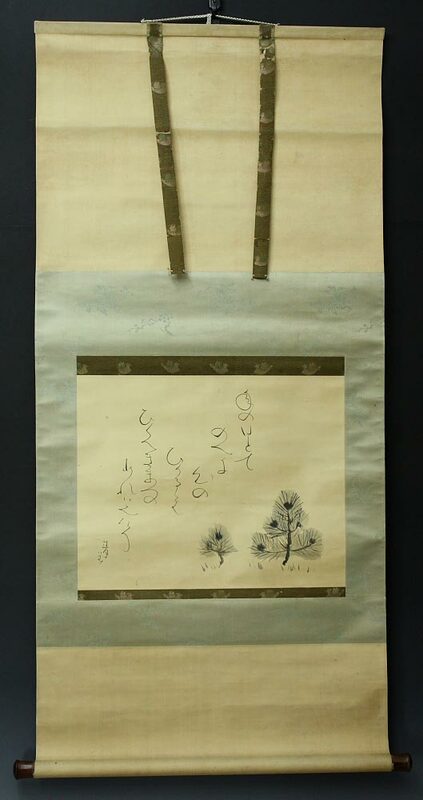 At age 12 Gyokudo was fond of painting and in Kyoto became the disciple of Mochizuki Gyokusen and Kono Bairei learning the Shijo and Maruyama school. It was around age 17 when he first signs his works as Gyokudo. In 1896, he goes to Tokyo and learns more skills from Hashimoto Gaho and Okakura Tenshin and participates in the founding of the Nihon Bijutsu-in. In 1915 he becomes a professor at the Tokyo Bijutsu Gakko (School of Arts) and around that time, he receives the L’ordre national de la légion d’honneur from France, in 1931 the first order of the red cross from Germany and in 1940 the cultural medal of honor from Japan. Gyokudo loved nature and in 1944 he moved to Tama near Tokyo and established his atelier there. Kawanabe Kyōsai (1831–1889) was a Japanese artist, in the words of a critic, “an individualist and an independent, perhaps the last virtuoso in traditional Japanese painting. Kida Kado (1802-1879)His real name is Keisei. His, in another name it is Chikusekkyo, Hanseno. He was born in Gifu Pref. in 1802. He learns the picture from Ganku Saeki in Kyoto and also he learned to Ganryo after the Ganku death. He moves to Nagoya and he becomes the ancestor of a Kishi sect in Nagoya. Kioshita Ituun (1800-1866)He was one of a great three Nagasaki Nanga painter with Tetsuo Somon & Miura Gomon. Kikuchi Hobun (1862-1918)Kikuchi Hōbun was born in Osaka in the Ichitani family, who were professional mounters of paintings. He was adopted into the Kikuchi family and moved to Kyoto. He was first trained by Kanō Hōen, and from 1881 to 1885 he was one of Kōno Bairei’s many pupils. For most of his professional life he was a teacher at the Kyoto Municipal School of Fine Arts and Crafts. He frequently exhibited at the Bunten. He became a judge both at the Bunten and the Teiten. Kikuchi Yōsai (1781-1878), also known as Kikuchi Takeyasu and Kawahara Ryōhei was a Japanese painter most famous for his monochrome portraits of historical figures. Kimura Buzan (1876-1942) He was a Nihonga painter who studied under Kawabata Gyokusho. His work is in the collections of the Museum of Fine Arts, Boston and the Tokyo National Museum. Kinoshita Toshinaga (1649-1716)He was a 3rd feudal lord of HIJI clan in Bungo province(eastern Kyushu).His another name is Toyotomi Toshinaga. Kishi Chikudo (1826-1897)Japanese-style painter. Son of a retainer of the daimyo of Hikone. Lived in Kyoto. Studied first under Eigaku Kano, then with Renzan Kishi, who adopted him as his son. 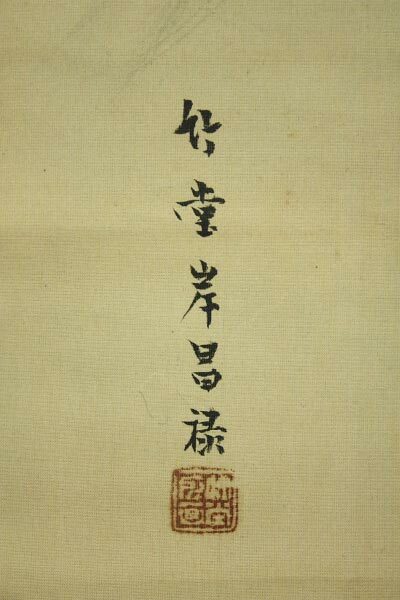 In 1896, appointed to the Art Committee of the Imperial Household. Specialized in landscapes and animals, particularly tigers. His style, based on that of Okyo, comes close to the Shijyo manner, but with modern touches and considerable traces of Western realism. A competent artist. Much admired by the Japanese. KISHI GANTAI (1782-1865)He was the son and student of Kishi Ganku and went on to lead the Kishi school after his father’s death. His works are in held in the collections of, amongst others, the Ashmolean, Victoria, Museum of Fine Arts Boston and the Kyoto Imperial Palace. He was a painter of landscapes, kacho-e and animals, especialy tigers. Kishi　Kyugaku He was a son of Kishi Renzan. precise date of birth is unknown. KISHI RENZAN (GAN) (1805-1859) Renzan Kishi was a painter who lived in Kyoto. He was a pupil of his father-in-law Kishi Ganku by whom he was adopted. 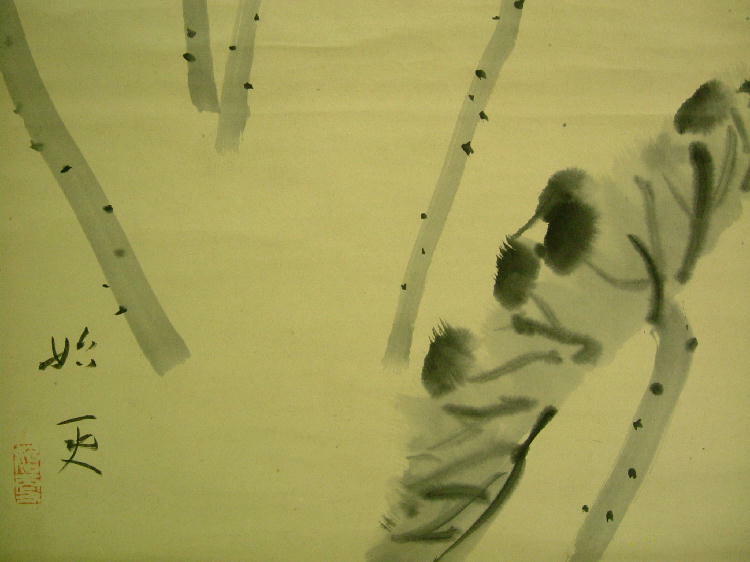 Renzan Kishi specialized in landscapes and nature (kacho-ga) paintings. 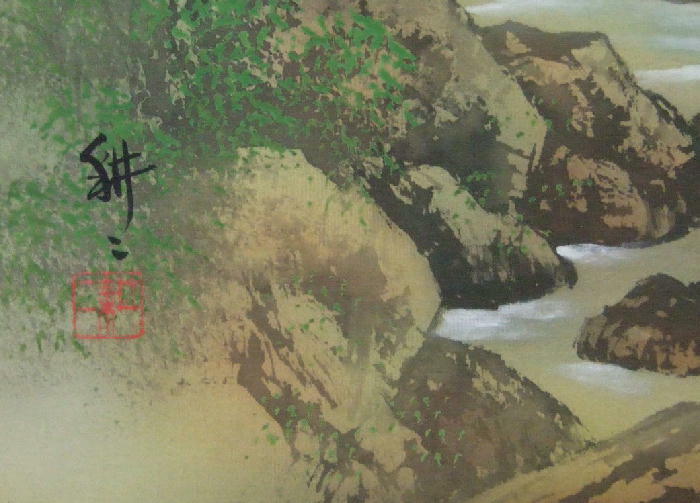 The artist is known for the paintings of wild geese on the walls of the Imperial Palace in Kyoto. Renzan, Kishi 連山 岸 (1805 – 1859)Renzan was born as Toku or Shōtoku in 1805. He lived in Kyoto and was adopted into the Kishi family. 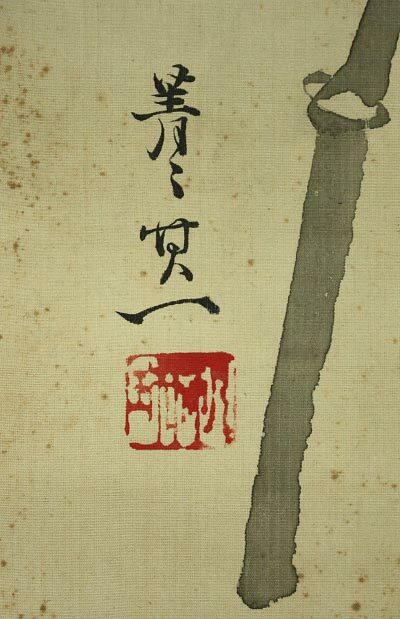 He was trained in the studio of Kishi Ganku, his father-in-law, together with Ganku’s son Kishi Gantai, Yokoyama Kazan, Minwa Bumpō and Shōdō. Together they were the second generation of the famous Kishi school. Of all the followers of the Kishi school Renzan has the greatest reputation in Japan. He rose to a position of some importance in Kyoto. 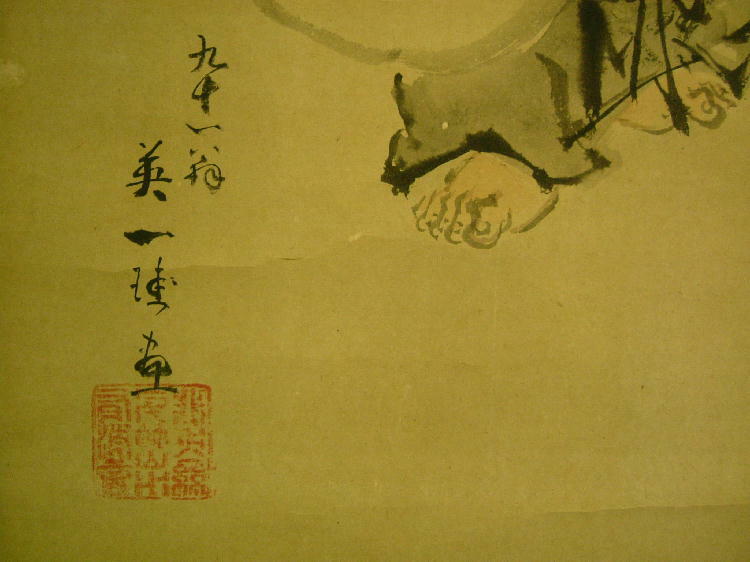 Where Kishi Ganku’s style is strongly influenced by the influence of the traditional style of the Chinese painter Nanpin, the second generation was more open to modern influences. 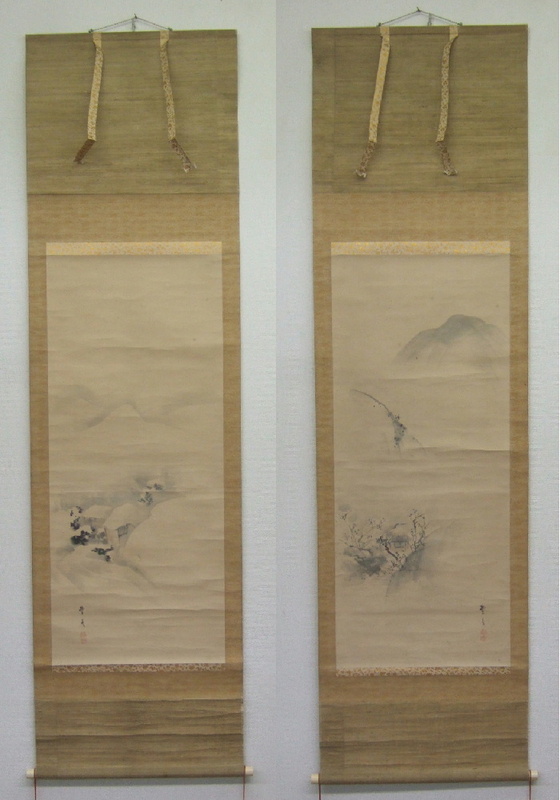 Renzan’s work starts off in the Ganku style and gains in freedom, softness and quality in the artistic communication with the Shijō school, which developed at the same time. After Ganku’s death he was the leader of the Kishi school, together with his brother-in-law Kishi Gantai. Recurring themes are landscapes, animals and birds, which, like the best of Shijō, show a great intuitive feeling for the true nature of his objects. His best-known pupil is Kishi Chikudō. He died in 1859. Kitagawa Utamaro (1753 – 1806) was a Japanese printmaker and painter, who is considered one of the greatest artists of woodblock prints (ukiyo-e). His name was romanized archaically as Outamaro. He is known especially for his masterfully composed studies of women, known as bijinga. He also produced nature studies, particularly illustrated books of insects. Kobori Gonjuro (1625-94)He was a Kobori Enshu’s third son,Master of the tea ceremony of Edo period. Direct retainer of the shogun of the Tokugawa Shogunate. 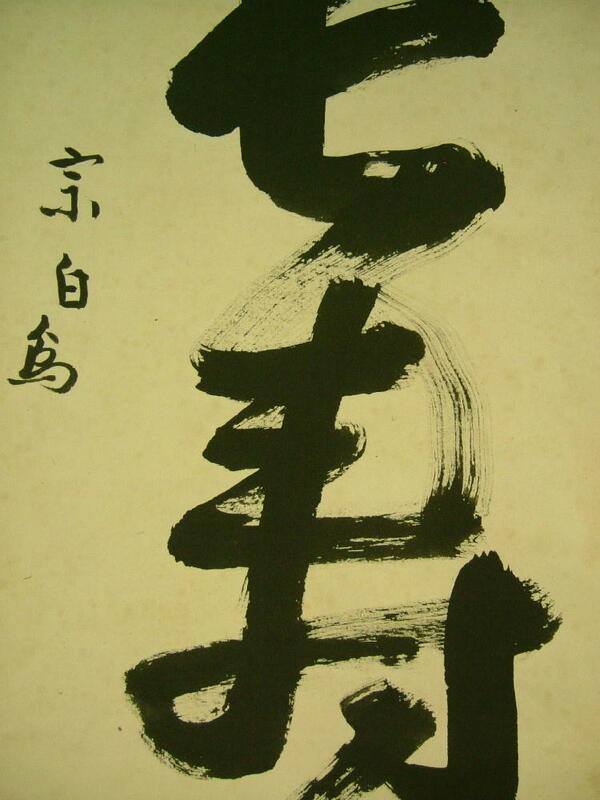 He studied the tea ceremony and calligraphy under his Kobori Enshu. 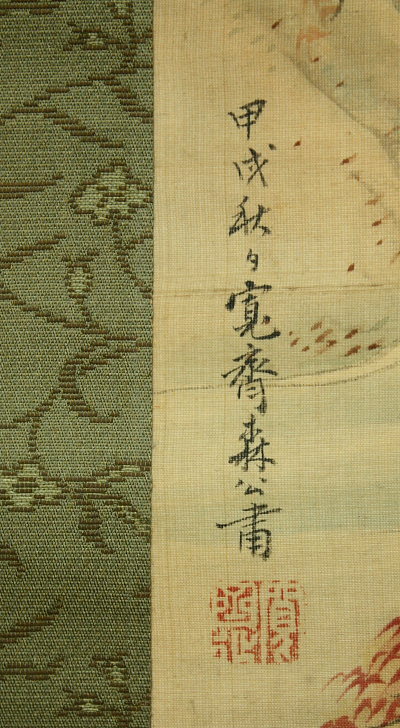 Komai Gen Ki (Komai Yukinosuke, 1747-1797) was an outstanding pupil of Maruyama ōkyo (1733-95). 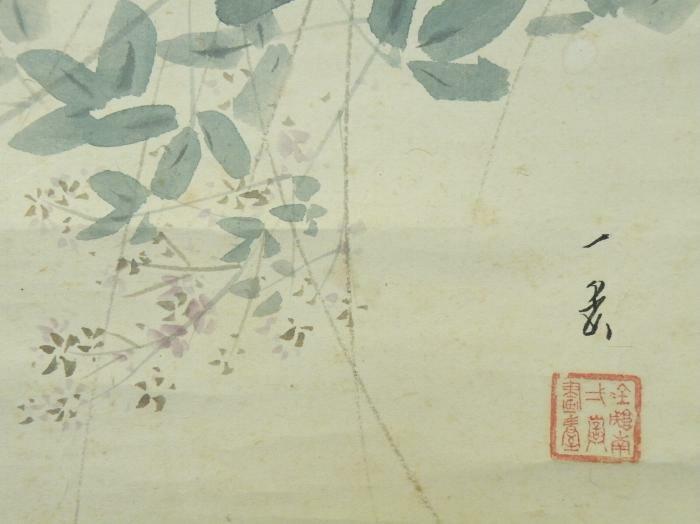 He was most celebrated for his elegant paintings of human figures, especially beautiful Chinese women. The subject of this scroll, with its grotesque, yet comic monsters and apparitions, is unusual among his works. Kameda Bōsai (1752–1826) He was a Japanese literati painter. 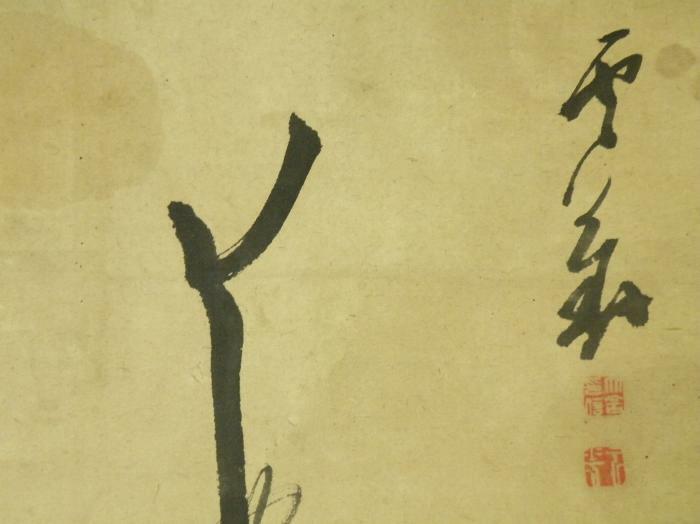 He originally trained as a Confucian scholar, but spent the second half of his life as a literati and artist. The book Mountains of the Heart contains many of his most famous paintings. Kokan Meiyo (1653-1717) He was a Jo-do sect Buddhist priest at Kyoto Ho-onji temple.His another name was Kyoshu.He studied painting under Kano Eino. 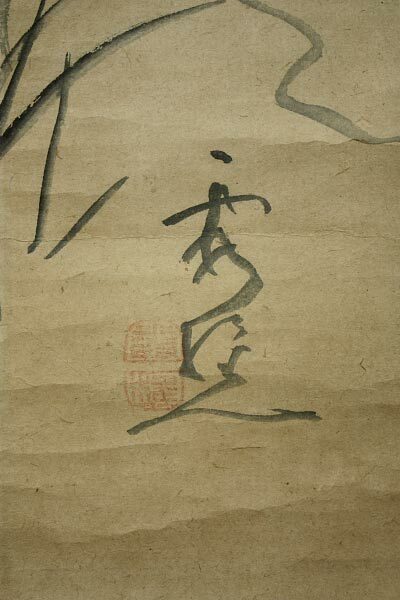 He loved Sesshu style of painting and he painted many Sansui,figure painting,especially Daikoku in his later years. Koko Fukuda ( 1883-1959 ). He is a very famous Japanese painter from Tokyo. He is a pupil of famous painter Eiko Satake. Kono Shuson (1894-1987) The Japan Nanga-in chairman/the managing director. He was born in Ehime Pref. He studied painting with Tajika Chikuson. Konoe Nobuhiro (1599-1649)His another name was Ōzan.He was a kugyō or Japanese court noble of the Edo period. He was born as the fourth son of Emperor Go-Yōzei. His mother was Empress Dowager Chūka, Konoe Sakiko in birth. Nobuhiro was adopted to Konoe Nobutada, his maternal uncle, since Nobutada had no legitimate heir. Konoshima Ôkoku (1877-1938) He was born in Kyoto. 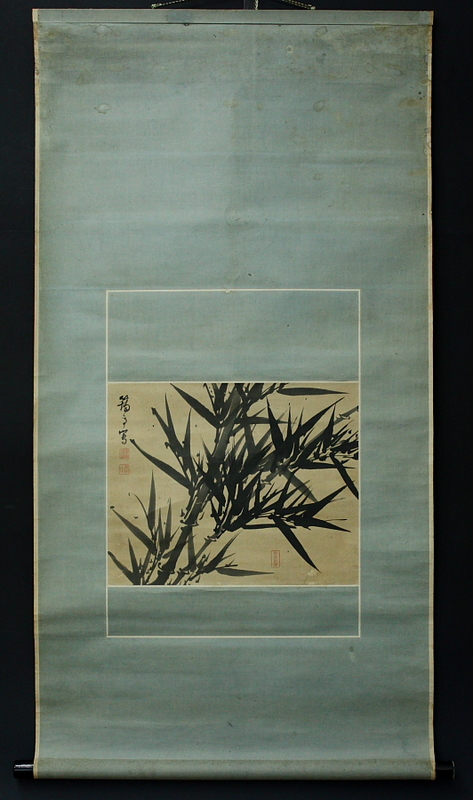 As a second son he was sent to study at the local industrial school, but his urge to paint prevailed and in 1893 he gave this up and became a pupil of both Imao Keinen (Shijô school) and of Yamamoto Keigu, a Confucian scholar of Chinese calligraphy and medicinal herbs. His work shows great energy and diversity and a strong personal style, his excellence particularly showing in his treatment of animal subjects. Kubota Beisen (1852-1906)He is mainly known as a painter, a pupil of Suzuki Hyakunen. Together with Kôno Bairei he founded the Kyoto Prefectural School of Painting in 1880 (where he also taught), and – again with Bairei – the Kyoto Bijutsu Kyôkai in 1890. 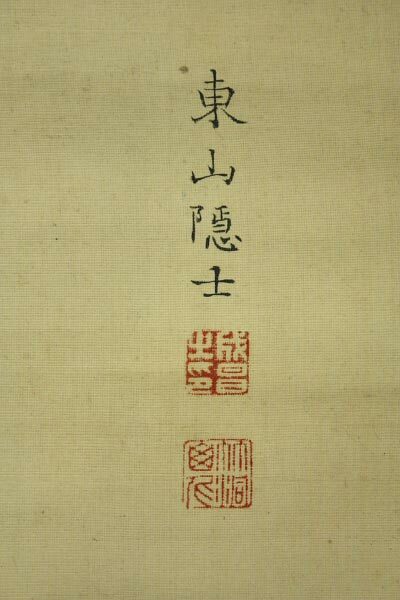 In 1894 he became an illustrator with the army and he actually accompanied the troops during the war with China in 1894-5. Kumashiro Hibun (act circa 1781-1788) He was a son of Yuhi (Kumashiro Hi) (circa 1712-1772).His another name was Shukuzan.He acted around Tenmei,EDO era (1781-1788). Kunii Kosetsu (1919-????) He was born in Gifu prefecture.He painted figure & Buddhist paintings well.He opend one-man show at gallery many times. Kuze Toone (1746-1818)He was a Kugyō which is the collective term for the very few most powerful men attached to the court of the Emperor of Japan in Edo eras. Kyosai Oda ( 1845-1912 ). He is a very famous Japanese painter from Nagoya-city Aichi prefecture. He is a son of the famous painter Kyosho Oda. And his son Kyoitsu Oda is a famous painter, too. They are the clans of the lineage of a great painter. 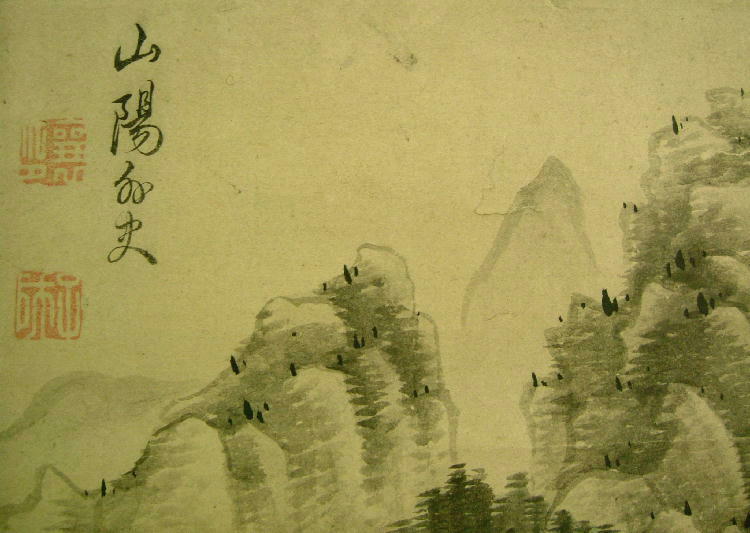 Miyazaki Kinpo(1716-1774)He had good skill of Bokuchiku painting. Maekawa Bunrei (1837-1917) He was born in Kyoto. His father is Maekawa Gorei that was the pupil of Matsumura Keibun. He mastered the Sijyo sect following the guidance of the father. 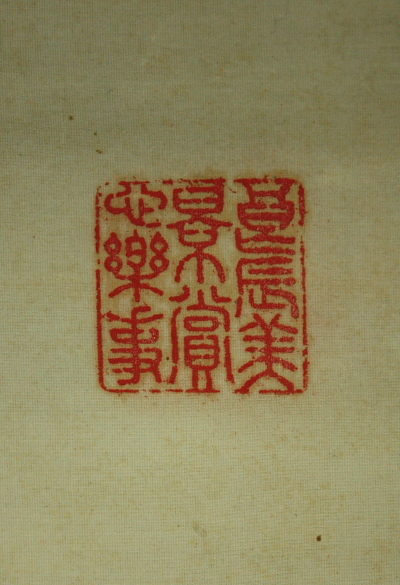 He managed even the picture in China ink in the late year. Maruyama Ōkyo (1733–1795), born Maruyama Masataka, was a Japanese artist active in the late 18th century. 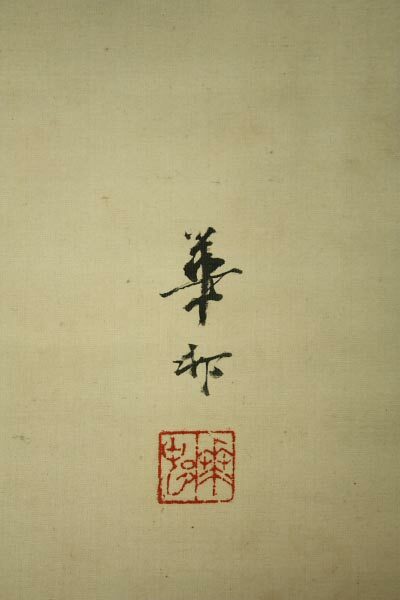 He moved to Kyoto, during which he studied artworks from Chinese, Japanese and Western sources. A personal style of Western naturalism mixed with Eastern decorative design emerged, and Ōkyo founded the Maruyama school of painting. Although many of his fellow artists criticized his work as too slavishly devoted to natural representation, it proved a success with laymen. Maruyama Oshin (1791-1839)He was the son of Kinoshita Ojyu and the grandson of Maruyama Okyo. He was the adopted son of Maruyama Ozui who was the oldest son of Okyo. Oshin succeeded to the head of the Maruyama School as he demonstrated his high skill of painting especially in “flower and bird” and “portrait” paintings. Maruyama Ôzui (1766-1829)He was the eldest son and pupil of Maruyama Ôkyo (1733-1795), founder of the leading Kyoto painting school. He adopted Ôshin, son of his brother Ôju as his son. 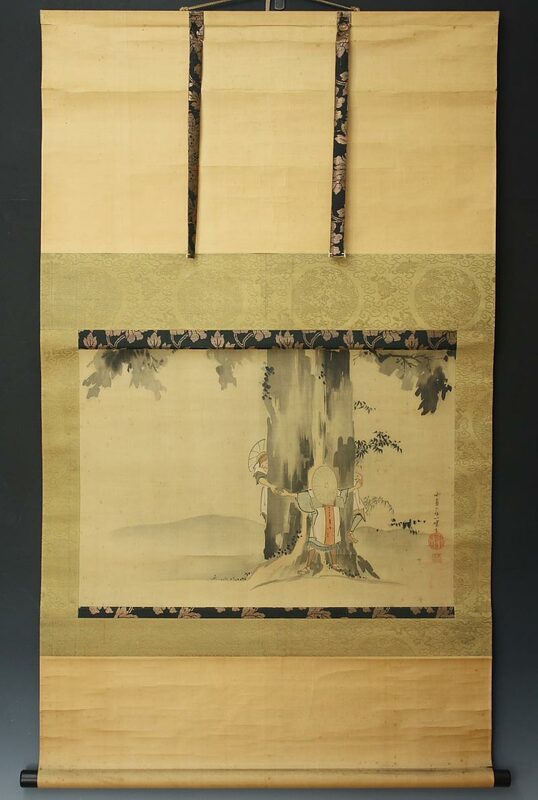 In the 1790s he was commissioned to paint some of the fusuma (sliding doors) for the restauration of the imperial palace in Kyoto. He followed his father’s style faithfully. Matsumura Gekkei: He was the founder of the Shijo school with a painter of the middle in Edo era. 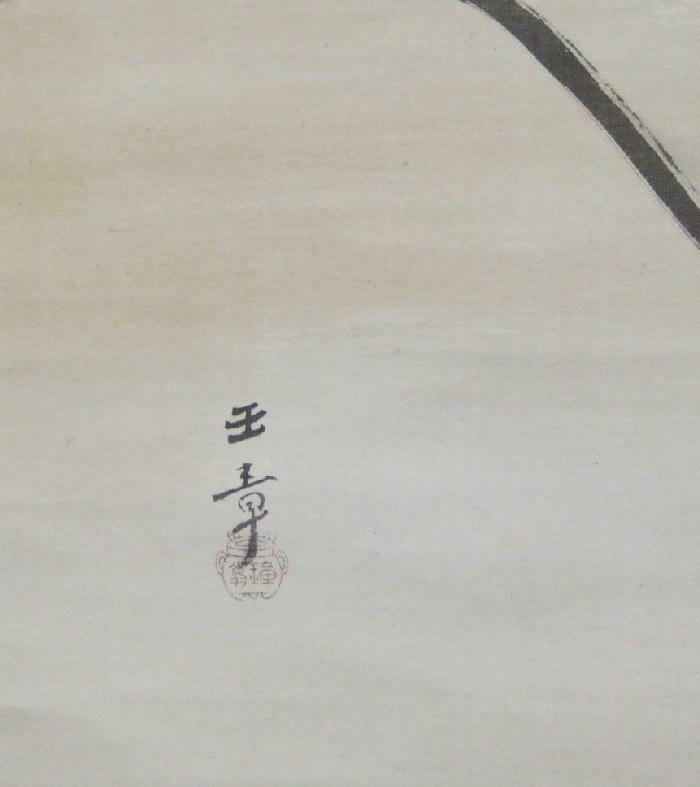 In the beginning,he began as a painter with name of Matsumura Gekkei but he changed his name to GOSYUN in chinese fashion afterwards.He becomes the forefather of Kyoto Japan painting circles ranging in the present age. Matsumura Goshun (1752-1811) was a Japanese painter of the Edo period. 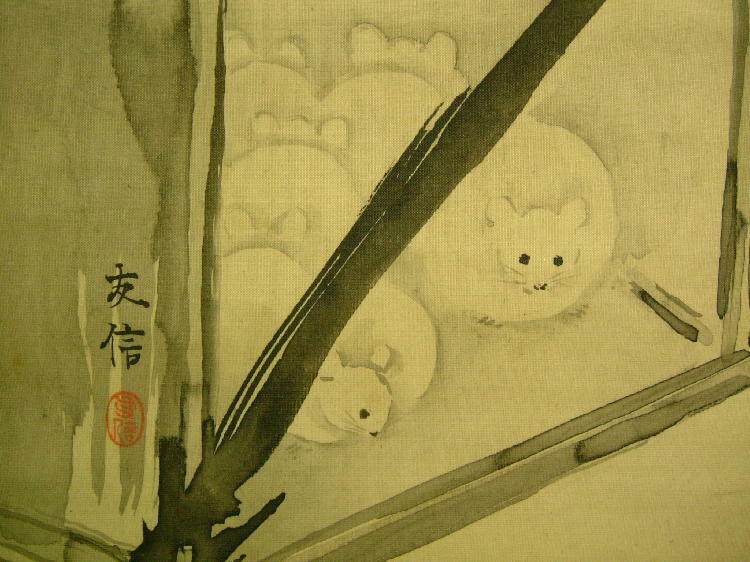 He was fostered by the painter Yosa Buson, who praised him as “a young, major artist”. He lived in Osaka from 1781, but returned to his birthplace Kyoto for a short while when news of Buson‘s illness reached him. Matsuura Maisetsu (1886-1970)She was born in Hiroshima. 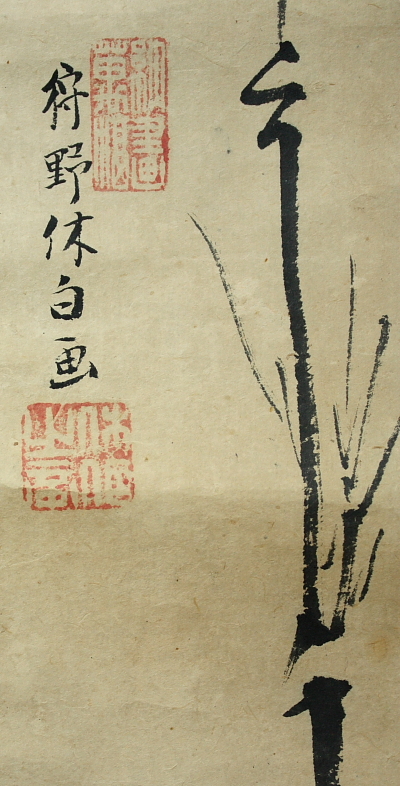 Her first exhibited in 1909, and its known to have exhibited in Osaka in 1914. The rest of her career she worked in Osaka. She is mainly known for her depictions of girls, although she also painted landscapes. Her works are in the famous Fukutomi Taro collection. Matsuno Baizan (1782-1857) He studied painting under Iwai Seisai & Kano Yosen’in. He became a Buddhist priest(Shinshu-sect :Jodo-ji temple in Gifu prefecture). He went to EDO and received the title of hogen. 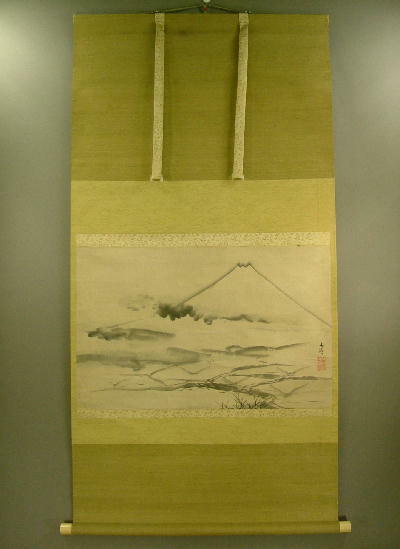 He was good at the painting of Mount Fuji. 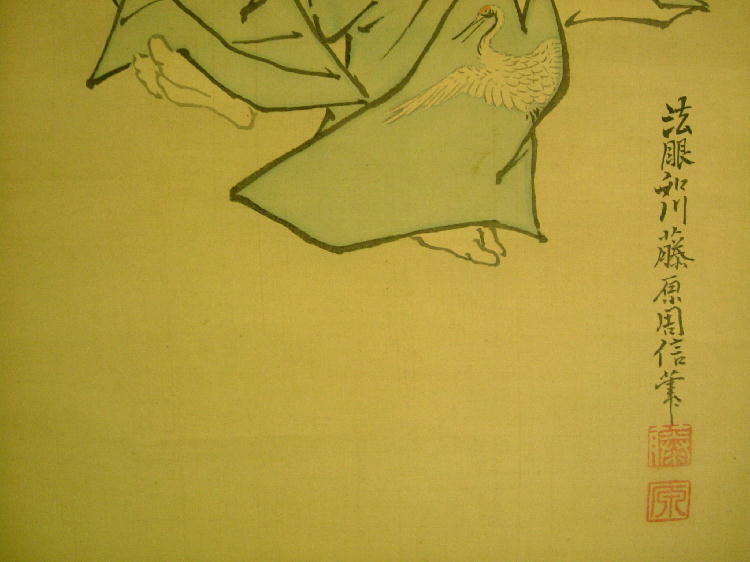 Matsuo Bashō (1644 –1694) was the most famous poet of the Edo period in Japan. 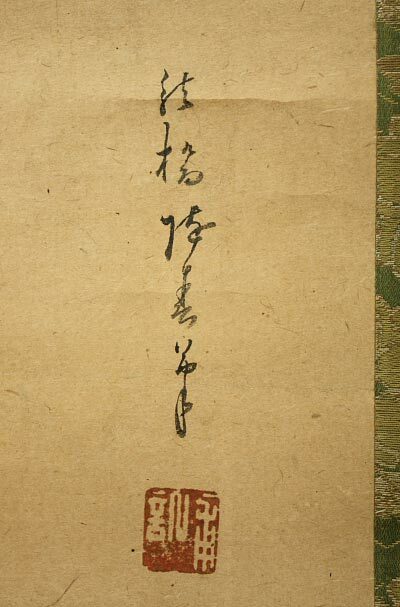 During his lifetime, Bashō was recognized for his works in the collaborative haikai no renga form; today, after centuries of commentary, he is recognized as a master of brief and clear haiku. His poetry is internationally renowned, and within Japan many of his poems are reproduced on monuments and traditional sites. Matsumoto Fuko (1840～1923)Japanese painter.His given name is Takatada.Fuko is his pen name. 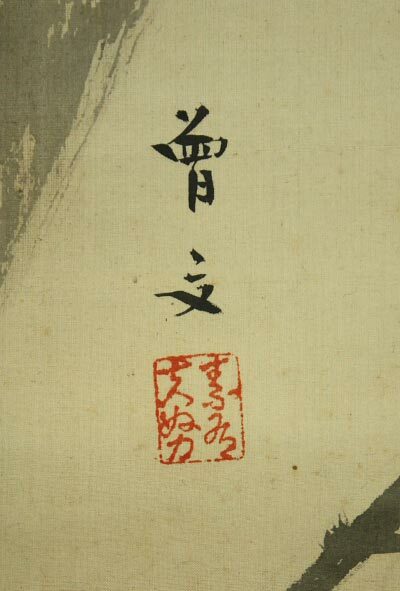 Another pen name is Angado.Learned painting technique from Kikuchi Yosai and others, then became a leading figure of historical paintings.Educated Imamura Shiko and Omoda Seiju and others. Megata Unsen (act 17-18 century)He was a eldest son of Megata Toun,born in Yonezawa.He was a Varlet of Uesugi family and studied painting under Kano Tanyu. He introduced himself as Unsen in 1680. 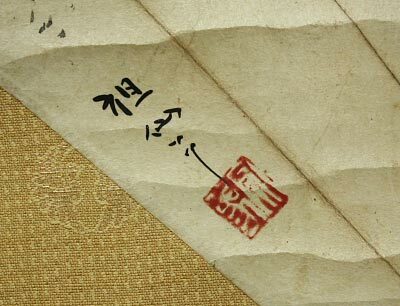 He received the title of Hokyo in 1691. He retired in 1708.Megata family was a painter in ordinary to the Uesugi Family. Miyagawa Chôshun(1682-1752)He was an ukiyo-e artist,founder of the Miyagawa school and heavily influenced by the Kaigetsudô school. He was chiefly active from around 1704-1711 (the Hôei era) until around 1748-1751 (the Kan’en era), just before his death. Mifune Tsunate (1876-1941) He was born in Okayama Pref. in 1876. He be the Tokyo art school graduate. He made the mentor to Ousyun Kimura, Syoueki Watanabe, Gyokusyou Kawabata. At the later time he lived in Osaka. He is the death, 66 years old in 1941. 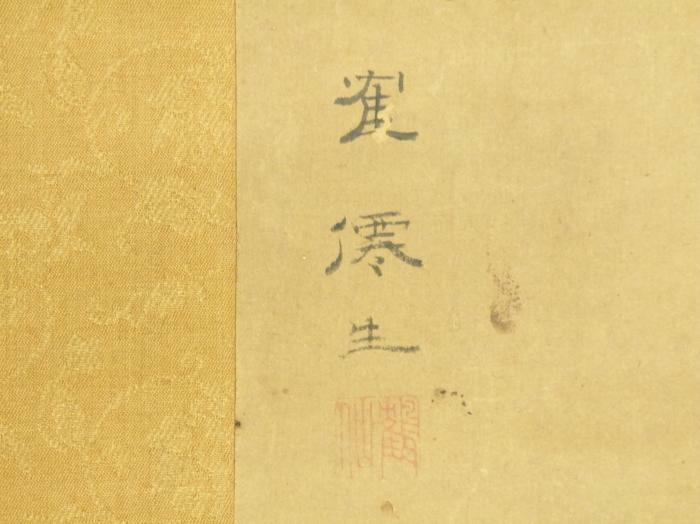 Minagawa Kien (1734-1807)Confucianist in the late Edo period . 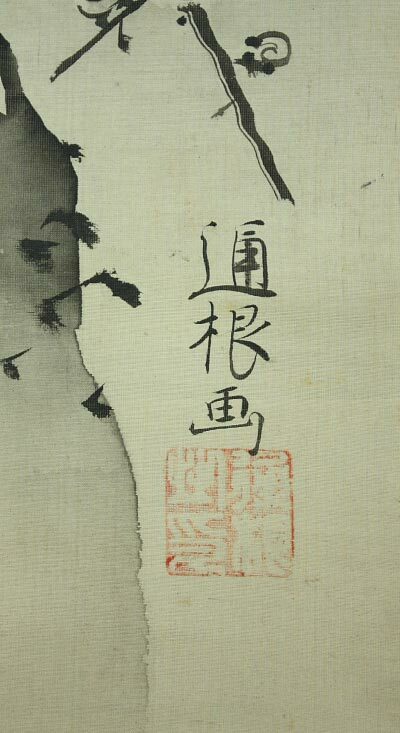 He was good at calligraphy and painting. He studied painting with Michizuki Gyokki. He form a friendshis with Maruyama Okyo and Matsumura Goshun and Ganku . Mio Goseki (1885-1946)He was born in Tokyo. He learned painteing from Kobayashi Gokyou, Ohashi Suiseki. His animal picture is good,especially Tiger. Miyamoto Musashi (1584-1645) was a Japanese swordsman famed for his duels and distinctive style. Musashi became legendary through his excellent swordsmanship in numerous duels,even from a very young age. He was the founder of the Hyoho Niten Ichi-ryu or Niten-ryu style of swordsmanship and the author of The Book of Five Rings, a book on strategy, tactics, and philosophy that is still studied today. 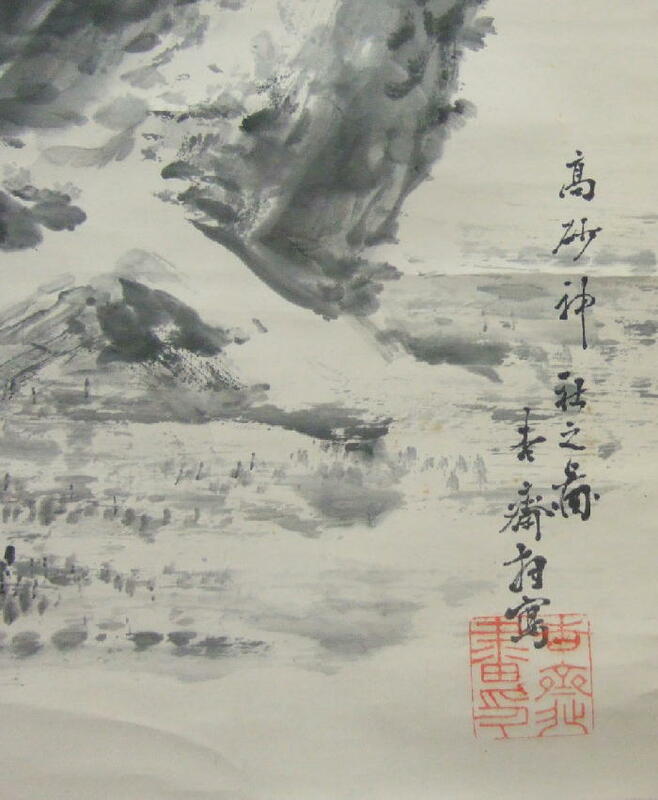 He is also famous as an artist of sumi-e or ink painting. 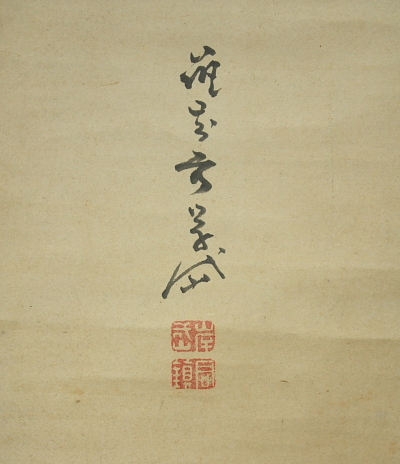 Miyazaki Chikugyo (act : Meiji period) Japanese painter in Kyoto. Kimura Seiun was his pupil. Miyoshi Ranseki (1838-???? )He lived in Osaka.He studied painting under Kojima Chikusho,Yamada Baison & Tetsuo Somon. 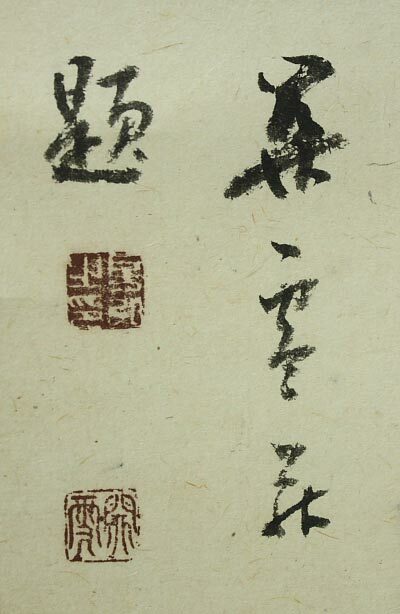 Mochino Kokei (1845~???? )Born in Hyogo prefecture.He studied Nanga painting under Murata Kokoku. Mochizuki Gyokkei (1874-1938) Japanese artist.He was born in 1874 in Kyoto .His real name was Shigenobu .He learned the picture from his father Gyokusen (1834-1913). Mochizuki Gyokusen (1794-1852)He was the third in line of the Mochizuki painters’ family. His real name is Shigeteru. He moved away from his father’s and grandfather’s Nanga style due to the influences of Murakami Toshu, Ganku, Matsumura Goshun, representing the Maruyama, Kishi and Shijo styles respectively. 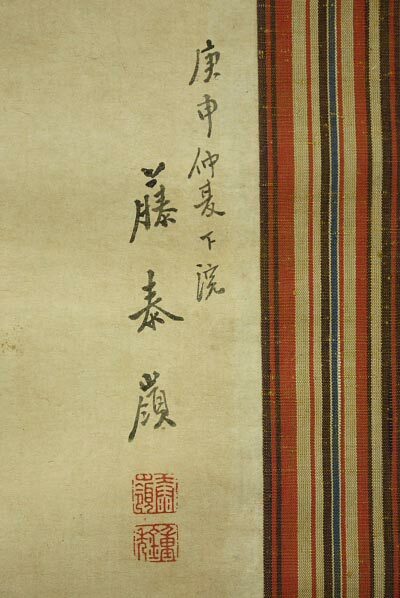 He was a distinguished painter of kachôga and landscapes in Kyôto. Mokuan Shoto (1611-1684)He was ordained at the age of 19 and studied under the eminent Chinese monks Miyun Yuanwu (1566-1642) and Feiyin Tongrong (1593-1661) before training at Wanfu-si on Mount Huangbo (Fujian Province) under Ingen. 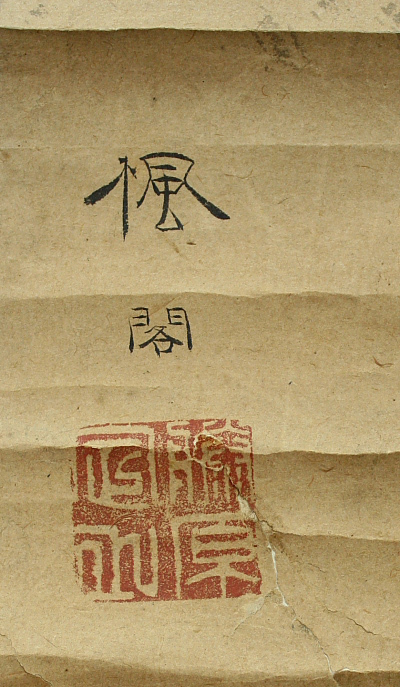 Mokuan received dharma transmission from Ingen in 1650 and went on to serve as abbot of the monasteries Taiping-si on Mount Lianshi and Huiming-si on Mount Xiang in south-eastern China. In 1655, at Ingen’s request, Mokuan emigrated to Nagasaki, where he took over as abbot of the monastery Fukusai-ji and served as Ingen’s senior disciple in Japan. Mokuan became abbot following Ingen’s retirement in 1664. During his 16-year tenure, Mokuan played a prominent role in the spread of Obaku Zen in Japan. In 1670, Mokuan founded the monastery Zuisho-ji in Edo (Tokyo). Mokuan’s religious lineage grew to dominate the Obaku Zen school well into the 19th century. Mori Ippo (1798-1871)Shijyou painter. Born and lived in Osaka. Studied under Tetsuzan Mori, who later adopted him. 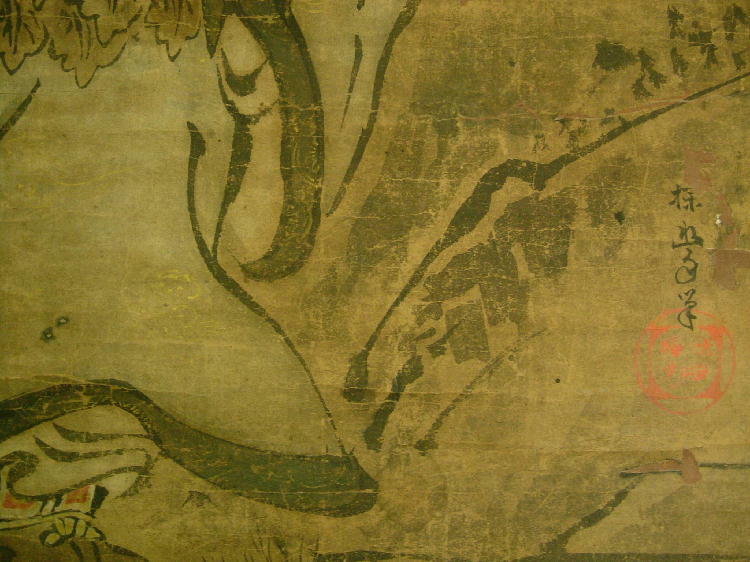 About 1850, executed some of the paintings for the “fusuma” of the Imperial Palace, Kyoto. An admirable painter of birds, even more so of landscapes; also produced scenes of Osaka life rendered in an unconventional manner. Mori Kansai (1814-1894) He was born in Hagi, as Ishida Kōshuku. 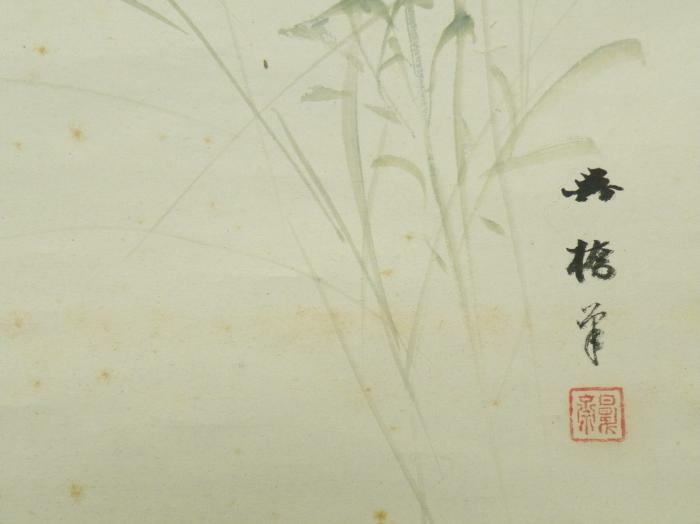 He trained with alocalartist, spent a period in Edo then moved to Osaka in 1831 to study with Mori Tetsuzan. Mori Shuho (1738-1823)He acted in Osaka.His real name was Takanobu.He was an older brother of Mori Sosen.He studied under Yoshimura Shuzan,Tsukioka Settei. He received the honorary title of HOGAN.Mori Tetsuzan was his son. 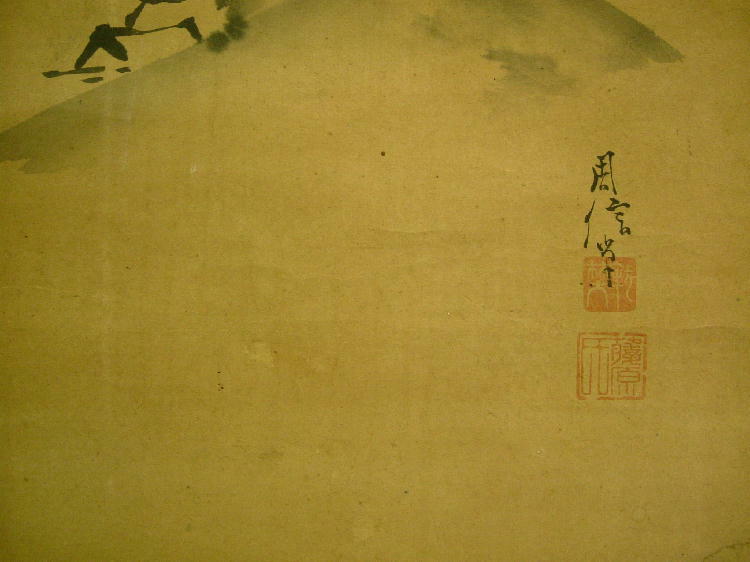 Mori Sosen (1747-1821) was a Japanese painter of the Shijō school during the Edo period. He is famous for his many paintings depicting apes and other animals. It is unknown whether he was born in Nagasaki or Nishinomiya, but he lived in Osaka for most of his life. Mori Tetsuzan, (1775-1841) was adopted by his uncle, Mori Sosen, Japan’s most famous painter of monkeys. 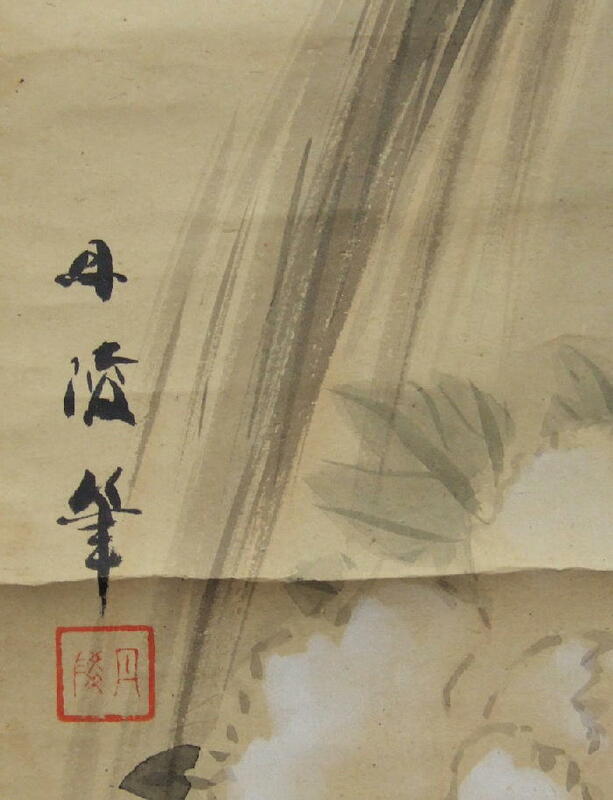 He was also a pupil of Maruyama Okyo, founder of the Maruyama School and champion of a new naturalistic style. Mori Yoshiaki (1801-1873)He was a SHIJO school painter,act in Kyoto.He was pupil of Matsumura Keibun. Morikawa Sobun (1847-1902) was born into a Kyoto merchant family. He began to train as a painter from the age of 20, studying under various masters of the Shijō chool, such as Maekawa Gorei and Hasegawa Gyokuhō. He was sufficiently respected to be chosen as a teacher when the Kyoto Municipal School of Painting was established in 1880. Morohoshi Seisho (1870-1943)Born in Chiba prefecture.He studied Nanga painting under the influence of Watanabe Kazan & Tsubaki Chinzan. He won many prizes in domestic expositions. Maruyama Unsho (1849-1907)Born in Nagano prefecture.He painted in Kakejiku,Fusuma-e & Byobu very well. Nangaku Fujisawa ( 1842-1920 ). 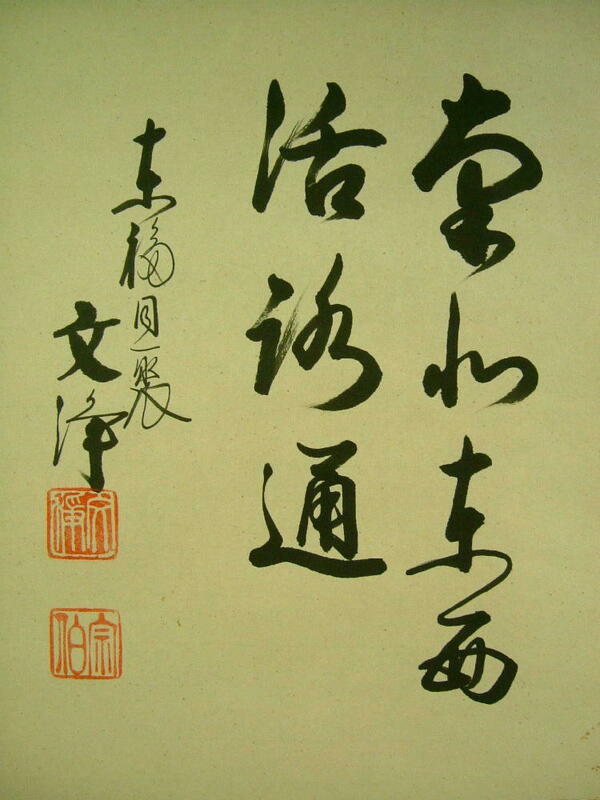 He is a very famous calligrapher from Kagawa prefecture. 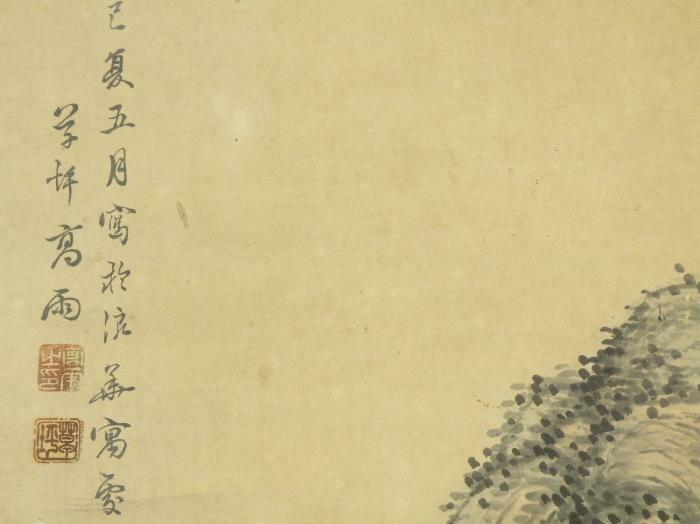 His main profession was a scholar of Confucianism. He had several thousand disciples in those days. He is great man in Japanese history. Nagai Ikka He learned the drawing technique of Maruyama-ha. In 1904, he was discoverd by [huenorosa] doctor who is caused to Tokyo school of fine arts, with the return home of the doctor visits America. 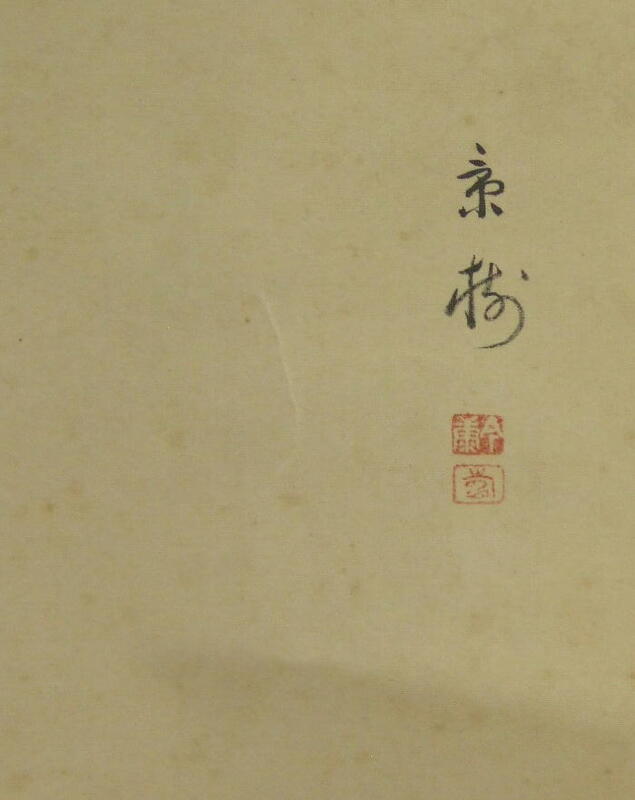 He stayed USA for five years, combine the introduction in the Japanese picture, researching the Western painting. In the Polish large exposition being awarded honorable prize. 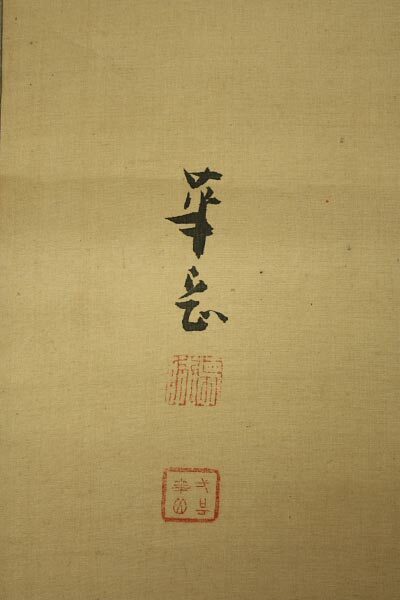 After the returning home, technique of the especially crow picture strange profit, is sent the designation of “crow doctor” from Okuma Shigenobu public. 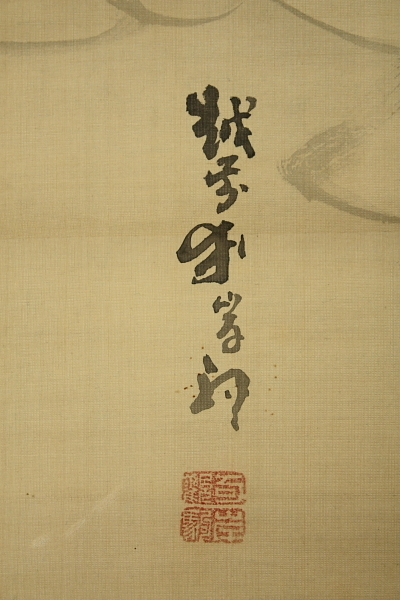 Nagano Sōfū studied painting under Murata Tanryō from about the age of 14. 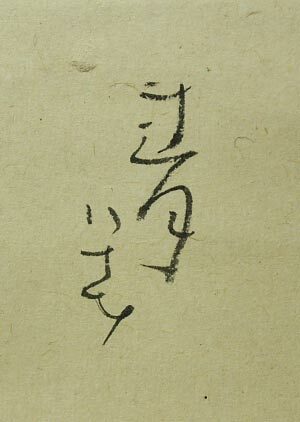 In 1904, he entered the Chōryū Painting Studio led by Kawabata Gyokudō and adopted the art name of Sōfū. 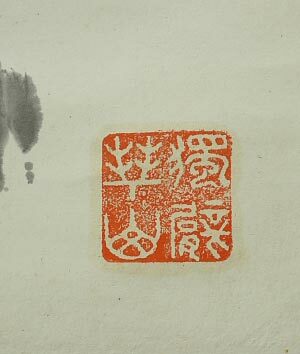 At the end of the Meiji era, he became a member of the Kōji-kai, an elite association of Nihonga painters. He exhibited at the 1st Bunten in 1907, winning a 3rd place prize. At the 7th Bunten his entry won the encouragement prize. In 1914, he joined the Nihon Bijutsu-in Saikō (Reformation of the Japan Art Institute) and showed at its Inten exhibition, where he continued as a frequent exhibitor. 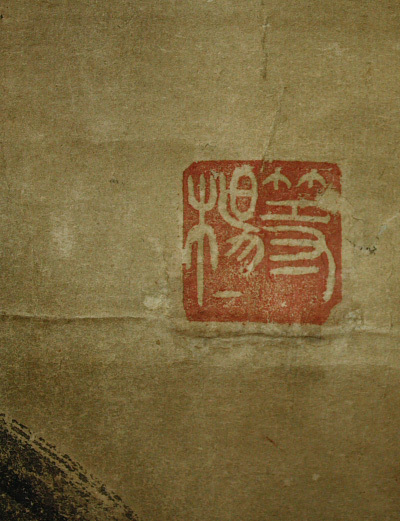 In 1923 and 1925, Sōfū traveled in China. 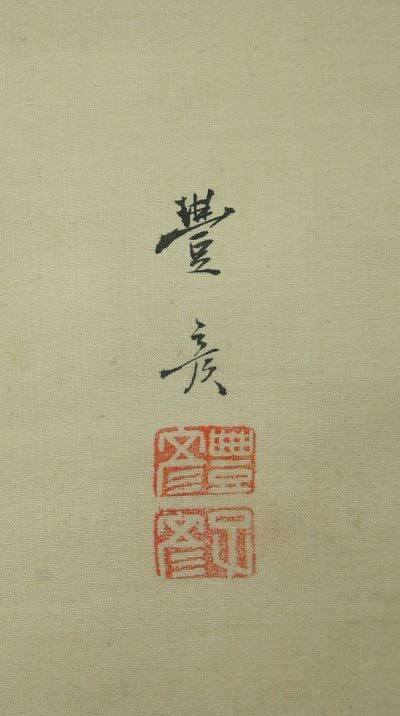 He also exhibited at the Shōtoku Taishi Memorial Exhibition in 1926. 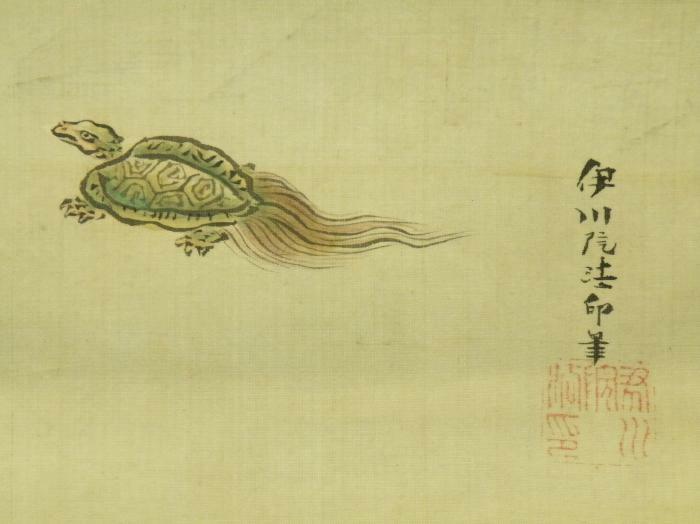 During the early Shōwa period his work changed from one showing Yamato-e style into one with more Shijō influence. After the Pacific War, he last exhibited publicly at the 33rd Inten held in 1948, and passed away in February of the following year. 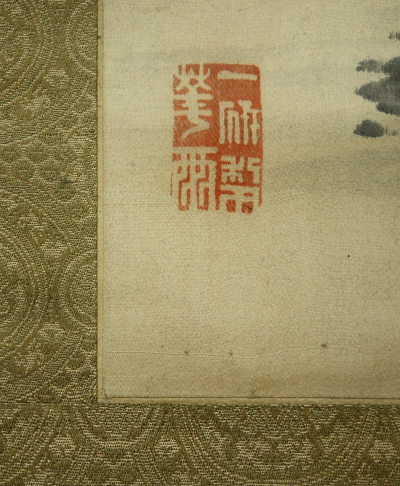 His paintings are in the collection of the National Museum of Modern Art, Tokyo. Nagasawa Roshu (1767-1847) He was a Maruyama School painter who specialized in kachoe or bird and flower paintings. He is the student and adopted son of Nagasawa Rosetsu. Nagata Shunsui (1889-1970)Japanese painter. Born in Ibaraki Prefecture.He studied under Araki Juppo. He was a teacher of Ochanomizu University. Nakabayashi Chikudo (1776 -1853) He was born in Nagoya. He was the son of a doctor, and already when he was 20 he established his own studio. In 1803 he moved to Kyoto together with Yamamoto Baiitsu. Apart from being one of the best Nanga painters of his age he was also known as its main theorist. He was responsible for many treatises on painting, and he also published numerous illustrated books. Apart from landscapes he also painted kachôga. Nakabayashi Chikkei (1816-1867)Chikkei studied under his father Nakabayashi Chikudo (1776-1853) and also under Yamamoto Baiitsu (1783-1856). He is known for his eccentricity as a person and as a Nanga artist with a distinctive style. 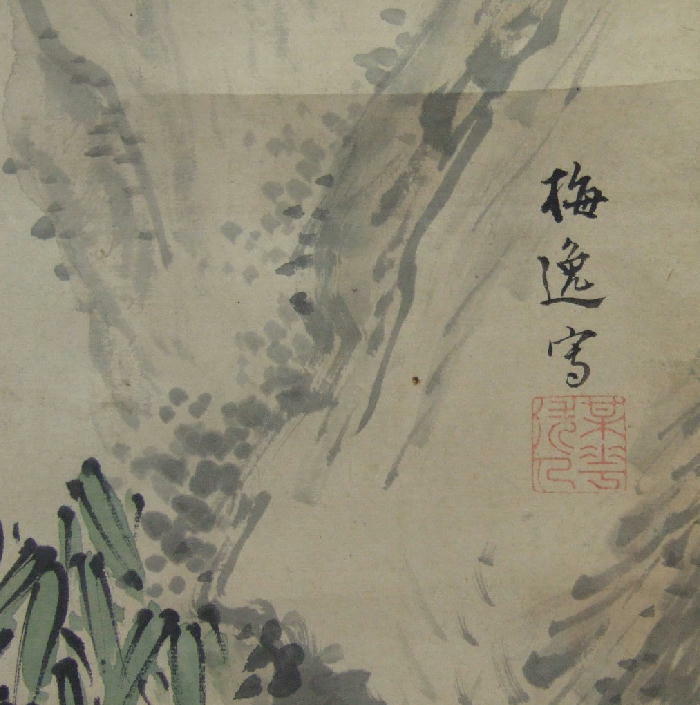 This painting displays a dynamic brushwork in an evocative mountainous landscape. Nakahara Nantenbo (1839-1925) Nantenbo is counted among the greatest Zen masters of the 20th century. The famous statesman Yamaoka Tesshu was Nantenbo’s student. Nogi Maresuke, the Meiji general who lead Japan to victory in the Russo-Japanese war, was also a zen student of Nantenbo. 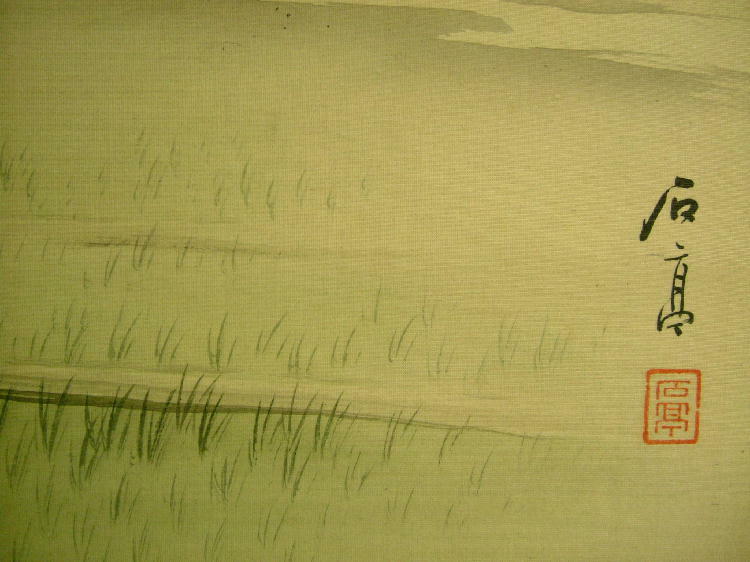 Kodama, another general of the same conflict, was also a zen student of Nantenbo’s. They both held the position of Governor-General of Taiwan in the Meiji era. Nakajima Raishô (1796-1871) was one of the „four great masters of Kyoto“ during his time. 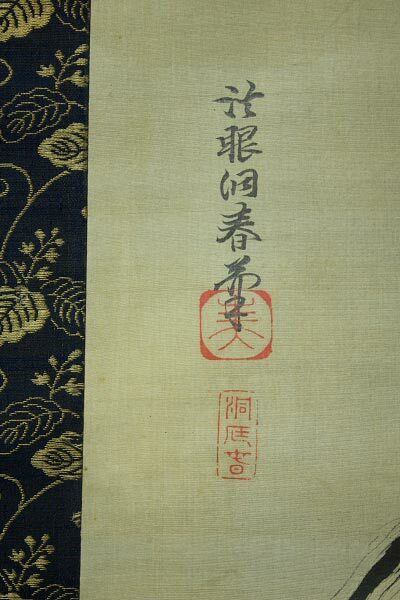 He was the teacher of Kawabata Gyokushô and of Kôno Bairei. 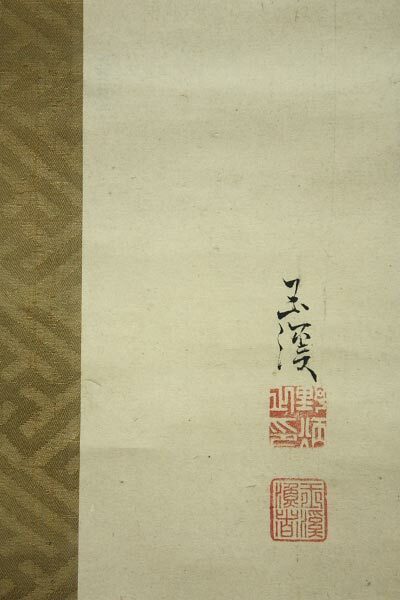 Pictures by Raishô can be seen at the MFA Boston, National museum Kyoto and at other palces. Nakanishi Koseki (1807-1884)He studied under Shinozaki Shochiku & Oda Kaisen.He painted SANSUI,Kacho-ga very well. Nakai Ranko (1766-1830) He lived in Osaka. 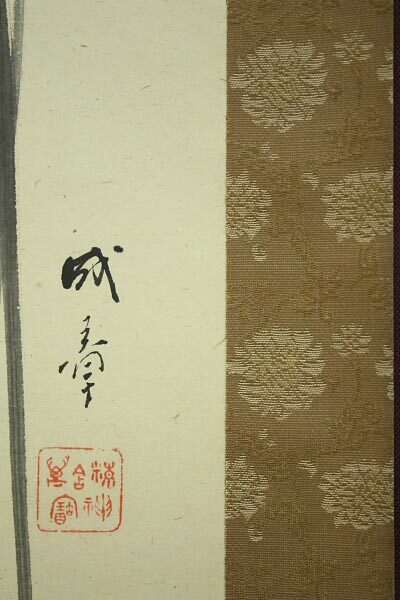 He studied SANSUI under Shitomi Kangetsu(1746-1797)at first.He studied Poet under Nakai Chikuzan(1765-1830)later.Kimura Kenkado(1735-1802)was a one of his friend. 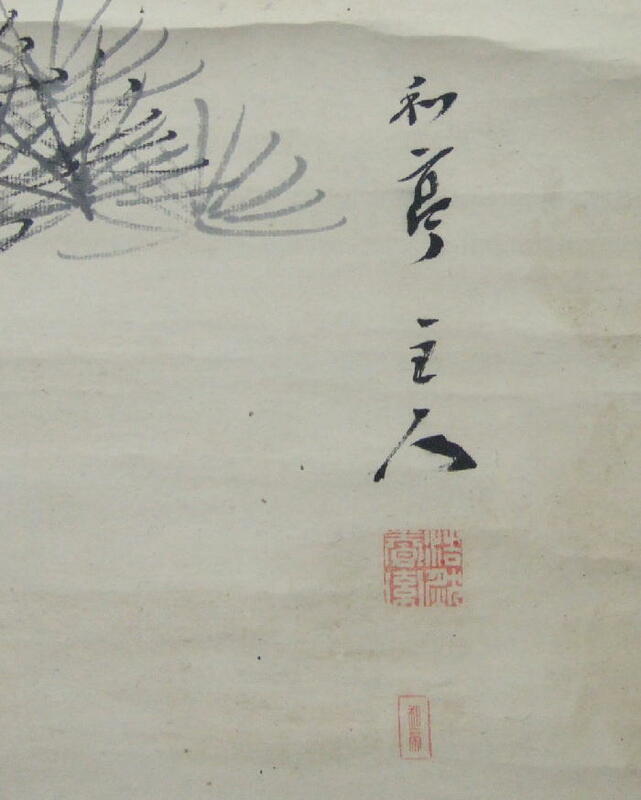 Nakayama Koyo (1717-1780)He was japanese NANGA painter,also Calligrapher & Chinese Poet.He was born in Kochi prefecture. Nishikawa Torei (1865-late Taisho)He was born in Kyoto. 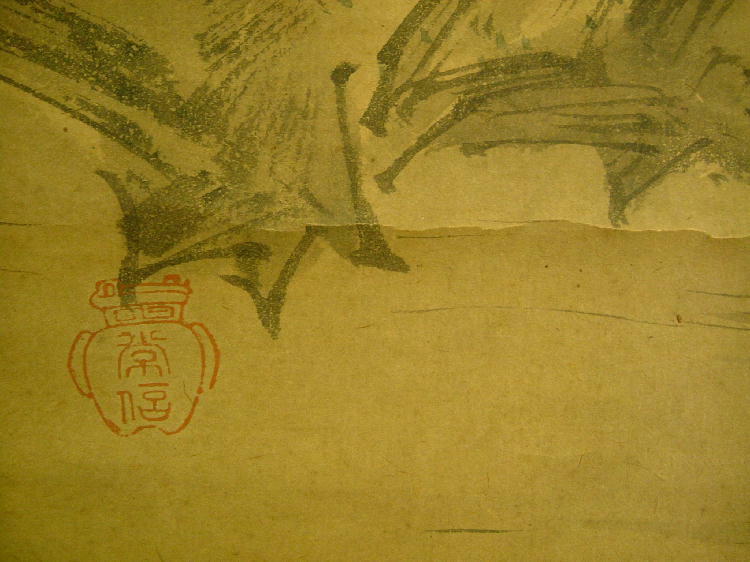 He was a Talented painter who studied under Kono Bairei, He was a promising artist,but he died late Taisho period. Nishiyama Suisho (1879-1958)He was Kyoto born and bred. First he was one of Takeuchi Seihô’s pupils, and in 1915 he married his daughter. 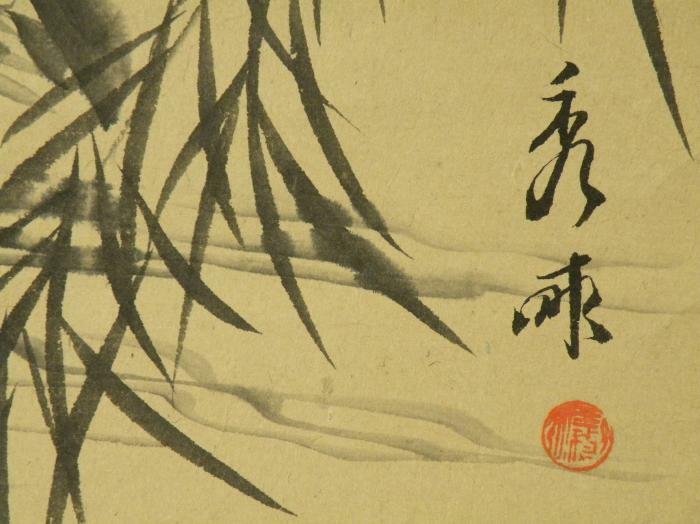 During his career he became one of the most important figures in the Kyoto art world, a.o. Head of the Kyoto College of Fine Arts, where he taught Domoto Insho (1891-1975) and Yanagida Kako a.o.. 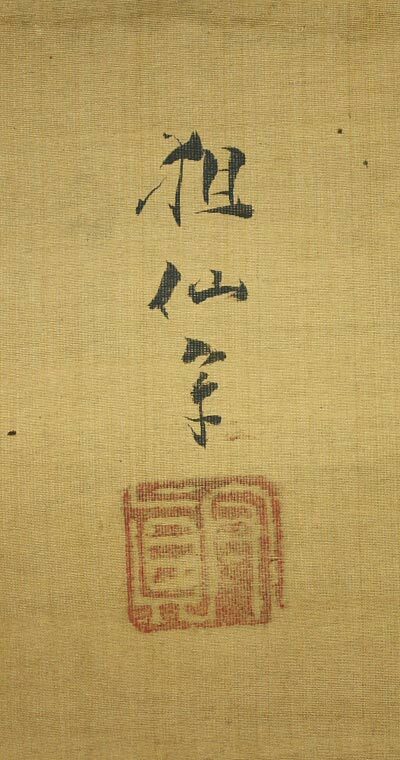 He was also a member of the Imperial Art Academy and of the Art Committee for the Imperial Household. In 1957 he received the Order of Cultural Merit. 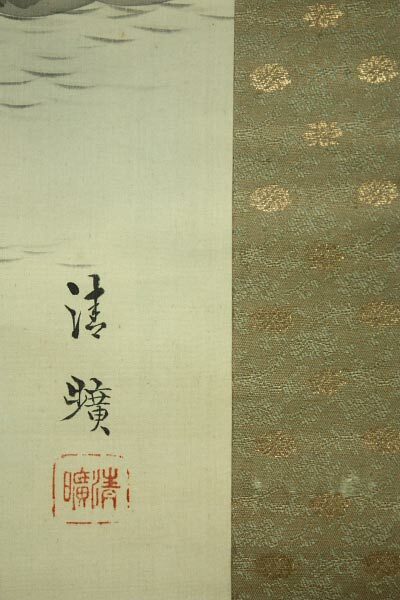 Nishiyama Suishō was born in Kyoto to an established merchant family. 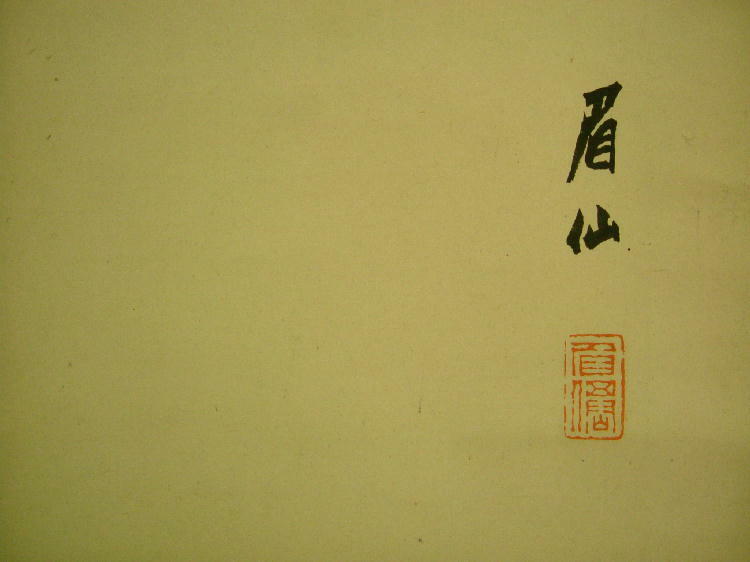 In 1892 he began studying painting under Takeuchi Seihō. 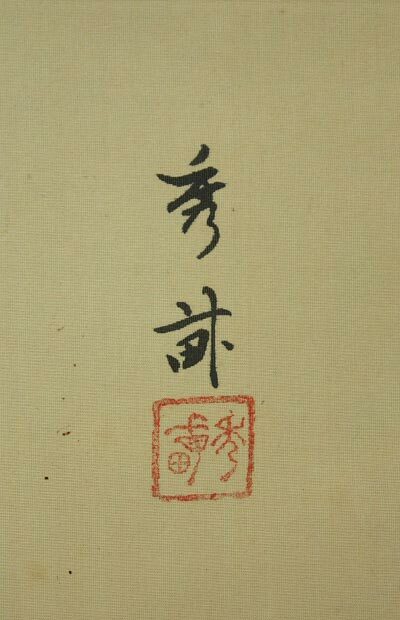 He received an honorable mention at the 4th Naikoku Kangyō Hakurankai (Domestic Industrial Exhibition) in 1895. After graduating in 1899 he returned in 1902 to become an assistant at the Kyoto Shiritsu Bijutsu Kōgei Gakkō (Kyoto Municipal School of Arts and Crafts), where in 1909 he became an assistant professor. 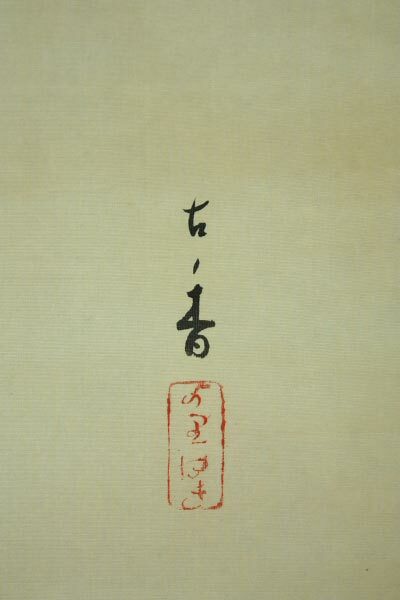 Suishō married Takeuchi Seihō’s adopted daughter, Sadako, in 1912, and in 1916 became a full professor at the Kyoto Shiritsu Kaiga Senmon Gakkō (Kyoto Municipal Special School of Painting). In 1918, he founded his own painting school, the Gajuku Seikōsha, submitting paintings to the school’s periodic exhibitions. 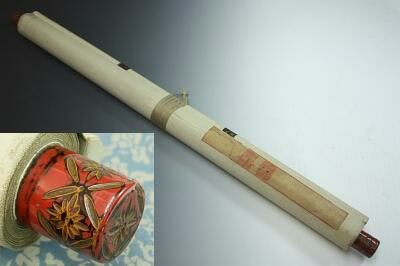 In 1944, he was made a Teishitsu Gigeiin or Imperial Artist. In 1957, Suishō was awarded the Order of Culture. Nishiyama Hōen (1804-1867) was an Osaka-based painter who had trained with Matsumura Keibun (1779-1843), and was one of the most significant Shijō school painters of his time. 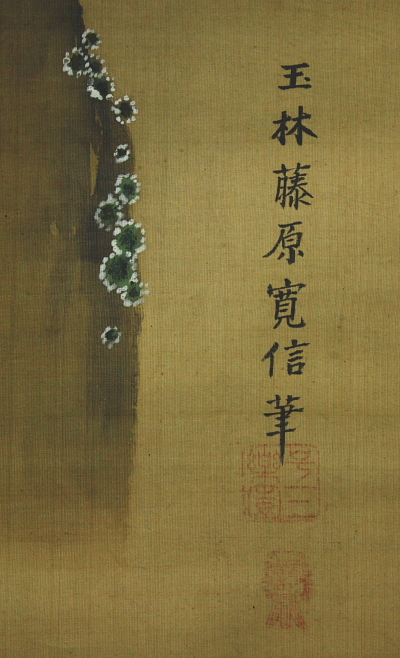 Hōen often expressed the mood of autumn in his works by combining the appropriate flowers with insects. 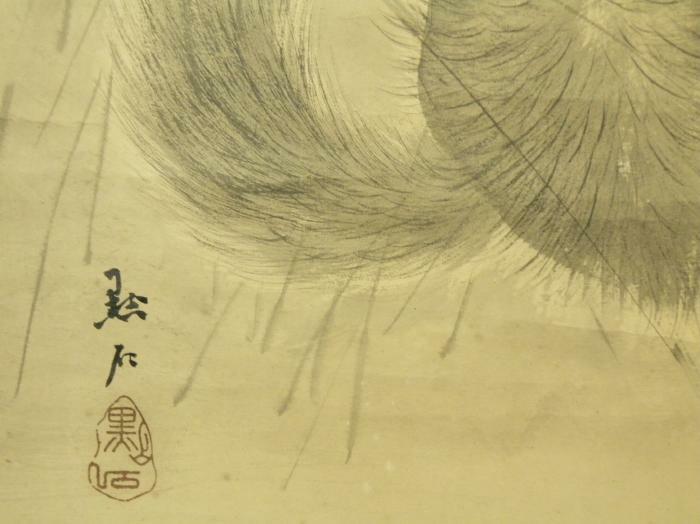 Here, however, he may simply have wished to show his skill at accurately describing such minute creatures, or it may have been an act of rivalry; Mori Shunkei (flourished 1800-20) published a painting of insects using realistic techniques. A version of the same subject is known by Keibun, and it may indeed originate with Maruyama ōkyo (1733-95), founder of the whole Maruyama-Shijō lineage of painters. Nishizawa Tekiho (1889-1965)Tekiho Nishizawa was born in Tokyo where he studied art with Araki Kanpo. He was a regular contributor to the official art exhibitions of Nitten and Bunten. NOGUCHI SHOHIN (1847-1917)Japanese Nanga artist. Her real name was Chikako Noguchi.She was born in Osaka. 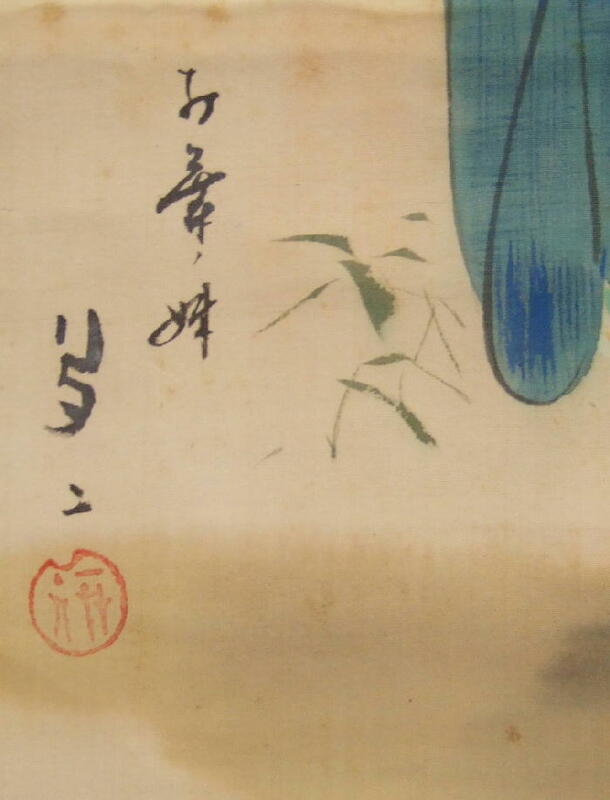 She studied painting with Hine Taizan.She painted Sansui and flowers and birds picture very well.Shohin was called two greatest NANGA painter in Meiji period with Okuhara Seiko. Nomura Sekko (1875-???? 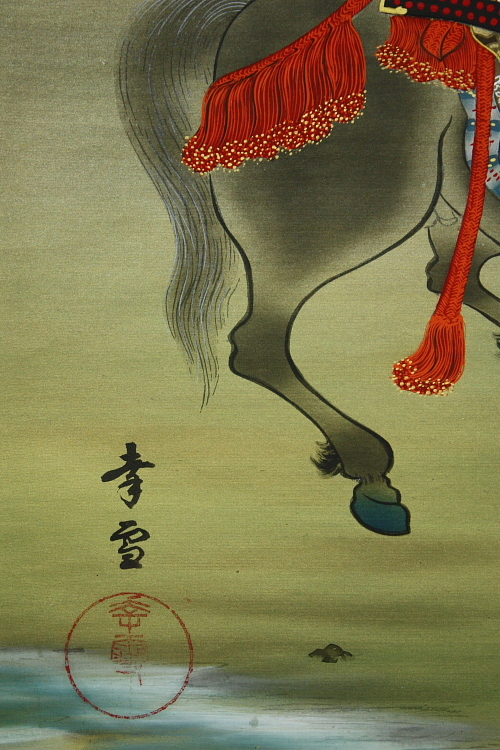 )He was an adopted son of Nomura Bunkyo.He studied under Kondo Shosen,Murase Gyokuden.He painted Kacho-ga,especially Horse very well. Noro Kaiseki (1747-1828)He was born province of Kii in central Japan.He was a famous bunjin (literati) painter in later EDO period. 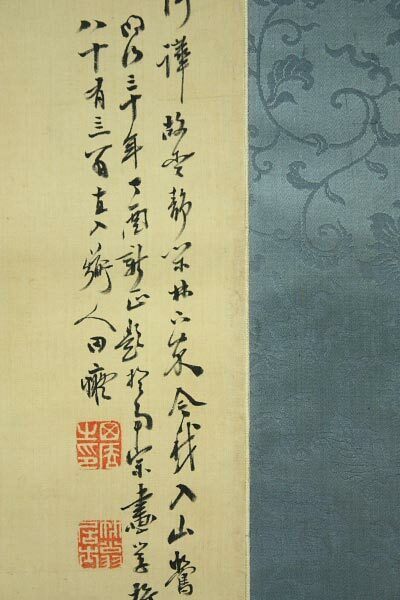 Nukina Kaioku (1778-1863)Japanese painter and calligrapher. Along with MAKI RYOKO and ICHIKAWA BEIAN, he was one of the Bakumatsu no Sanpitsu (Three Brushes of the late Edo period; 1600-1868). Nukina Kaioku was born into a samurai family of hereditary archery instructors to the daimyo of the Hachisuka fief of Awa Province (now Tokushima Prefect). Obaku Mokuan Shoto (1611-1684)He was ordained at the age of 19 and studied under the eminent Chinese monks Miyun Yuanwu (1566-1642) and Feiyin Tongrong (1593-1661) before training at Wanfu-si on Mount Huangbo (Fujian Province) under Ingen. 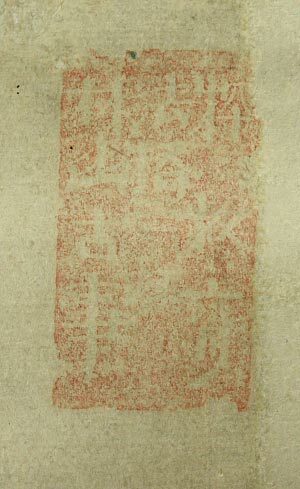 Mokuan received dharma transmission from Ingen in 1650 and went on to serve as abbot of the monasteries Taiping-si on Mount Lianshi and Huiming-si on Mount Xiang in south-eastern China. In 1655, at Ingen‘s request, Mokuan emigrated to Nagasaki, where he took over as abbot of the monastery Fukusai-ji and served as Ingen‘s senior disciple in Japan. Mokuan became abbot following Ingen‘s retirement in 1664. During his 16-year tenure, Mokuan played a prominent role in the spread of Obaku Zen in Japan. In 1670, Mokuan founded the monastery Zuisho-ji in Edo (Tokyo). Mokuan‘s religious lineage grew to dominate the Obaku Zen school well into the 19th century. Oda Kaisen (1785-1862)He had been a pupil of Matsumura Goshun, the artist who began the successful style of the Shijō school of Kyoto. 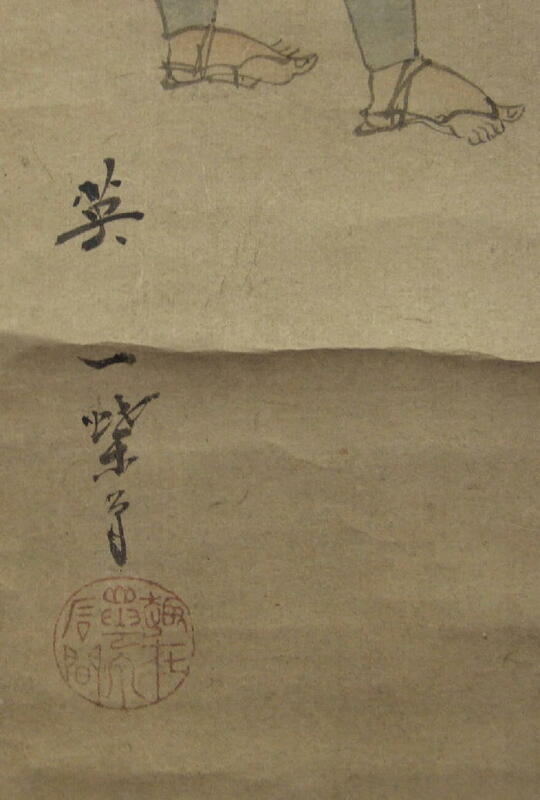 Kaisen left to study under Rai San’yō, however, and moved with him to Kyūshū where for five years he studied Chinese painting of the Yuan dynasty and Ming dynasty. 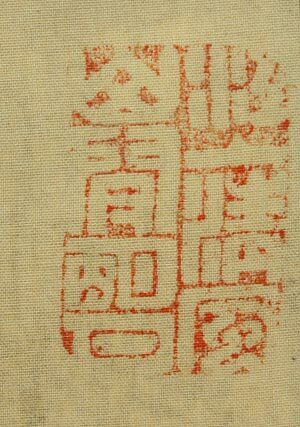 He was later to become a leading artist of the Chinese-derived Nanga (Southern school) style. Oe Ryoki (1874-???? )He studied under Kono Bairei,born in Kyoto.He painted Beauty,Geisha & Maiko very well. Ohara Donkyo (??? ?-1810)Japanese painter & confucian scholar.He was born in Iwate prefecture.He studied confucianism under Inoue Kinga in EDO.His real name is Imada.His another name is Unkyo.Sakingo & Bokusai. Ohara Donshu (1791-1857) He was born in and resided in Kyoto. He was a student of the prominent Shijo school artist Shibata Gito (1780-1819). 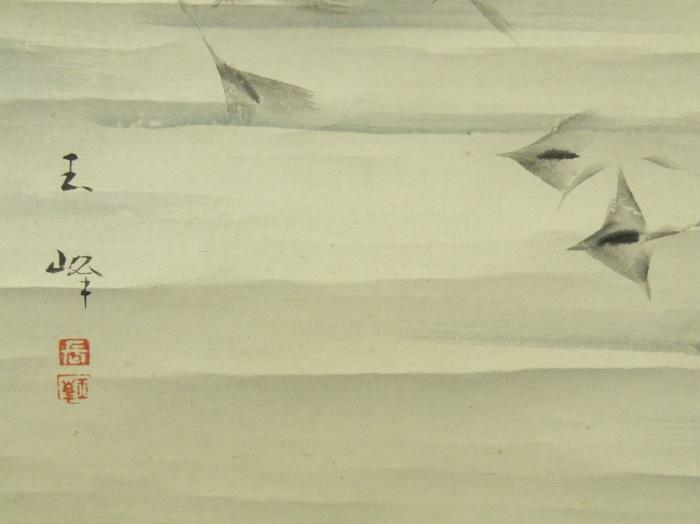 He also studied under his father Ohara Donkyo (died 1810) who was a self taught painter in the Nanga tradition. 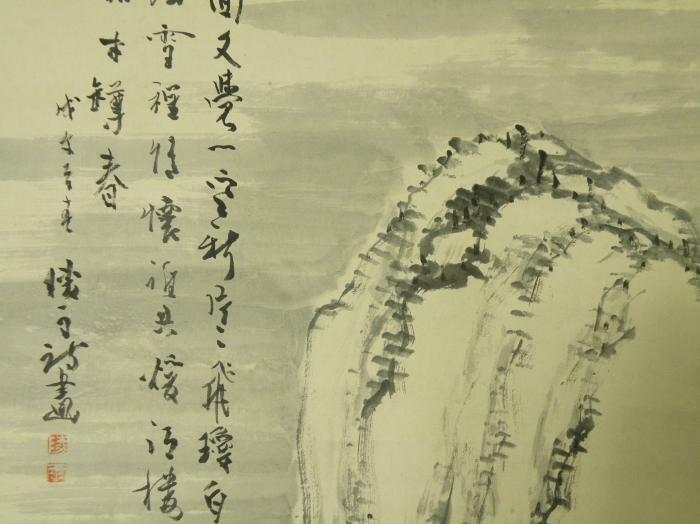 Donshu’s works are held in the British Museum and the Cleveland Museum of Art. Ōishi Yoshio (1659 – 1703) was the chamberlain (karō) of the Akō han in Harima Province (now Hyōgo Prefecture), Japan (1679 – 1701). He is known as the leader of the Forty-seven Ronin in their 1702 vendetta and thus the hero of the Chūshingura. He is often referred to by his title, Ōishi Kuranosuke. 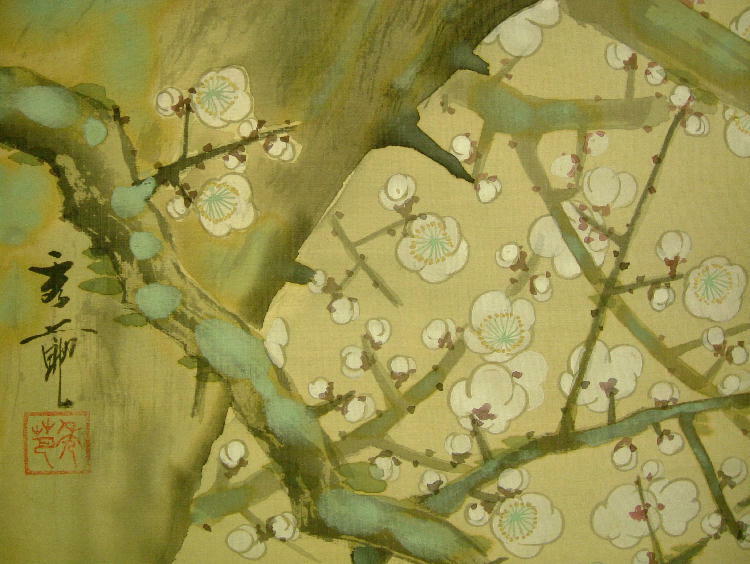 Ogata Korin (1658-1716) Japanese decorator and painter. He is renowned for his lacquer work and paintings on screens, decorated with bold designs and striking color contrasts, and his masterful compositional use of empty space. 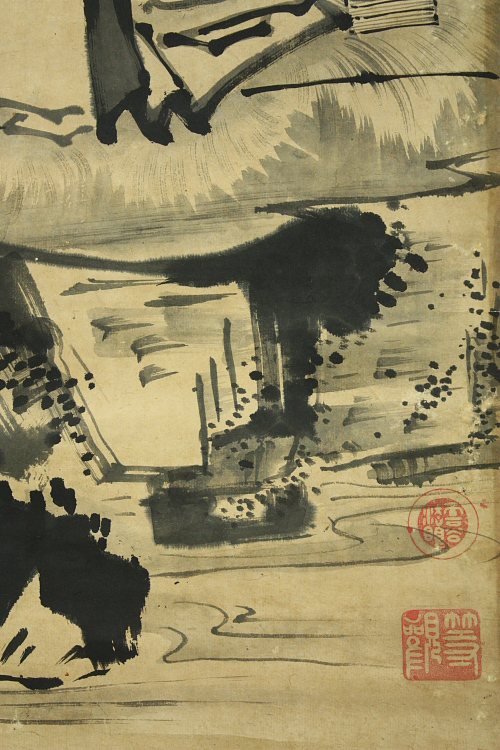 These works show the influence of two earlier artists, Koetsu and Sotatsu, but he departed from conventions, creating his own nearly abstract style. He also excelled as a teacher. 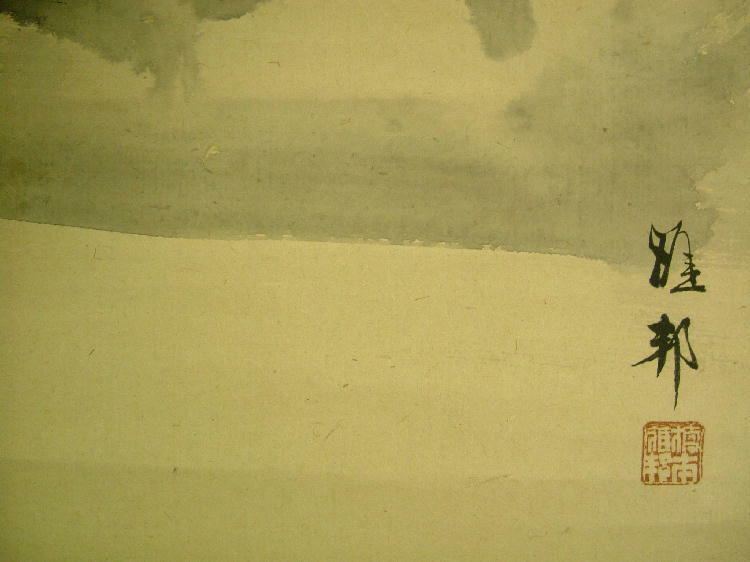 Oguri Sotan (1413 -1481)Japanese Zen monk and painter. He was ordained at the age of 30 at the temple Shokokuji in Heian (now Kyoto). 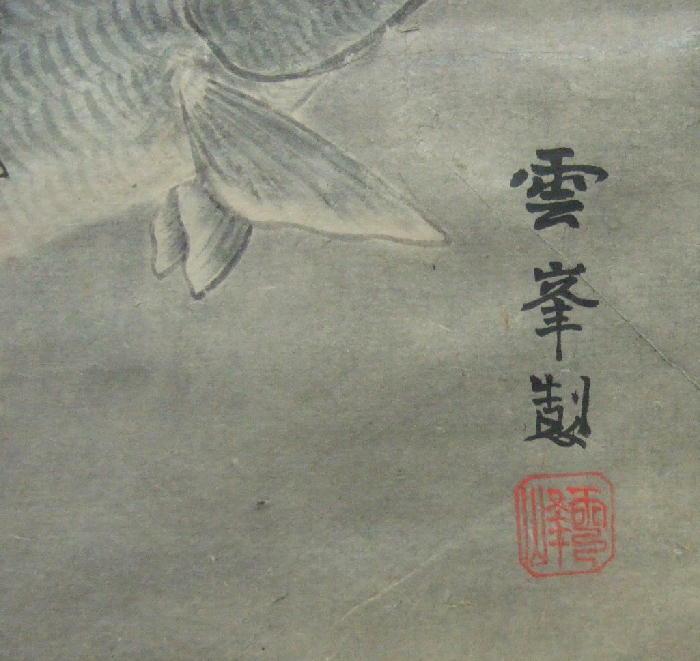 Although no extant paintings can be certainly attributed to Sotan, his biography suggests that he was one of the more important painters of the mid-15th century in Japan. 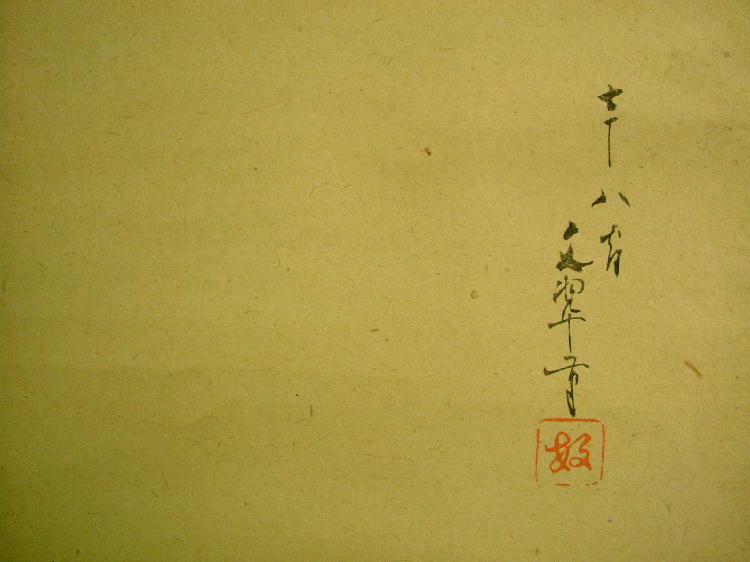 Oka Minzan (1734-1806)He was a painter,feudal soldier(Aki Hiroshima clan).He studied painting under So-Shiseki. Okamoto Shuki (1767-1862)Studied under Onishi Keisai until his death, he then followed Watanabe Kazan. He lived in Edo (Kyoto) as a retainer of Lord Okubo Odawara until his later years when he served the Doi clan. 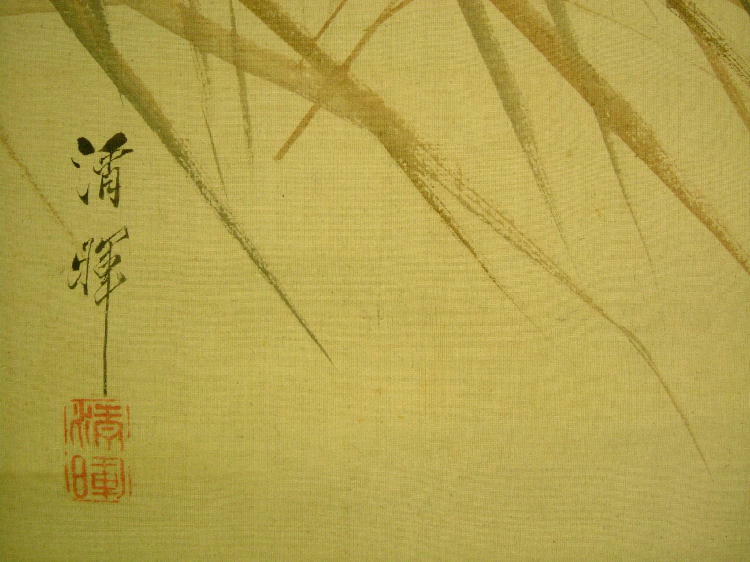 Shuki is best known for his Kachoga (bird and flower paintings) and painted in a style close to Tsubaki Chinzan and Kanzan. Okamoto Toyohiko (1773 – 1845) Toyohiko was born in Bitchu Province where he studied painting under Kuroda Ryozan. He then went to Kyoto where he became Matsumura Goshun‘s best pupil. 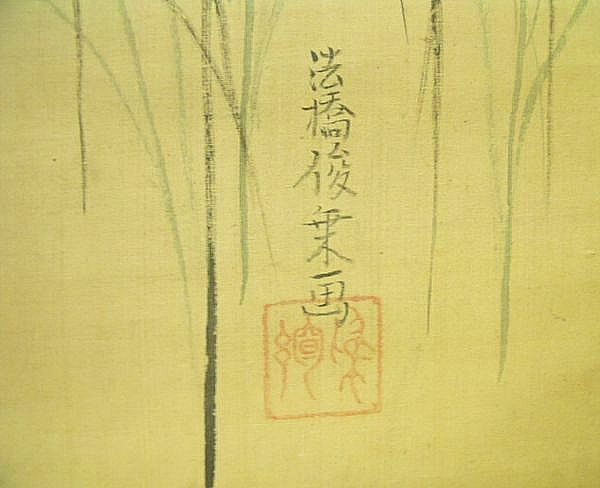 After Goshun‘s death, he and Matsumura Keibun were the leading Kyoto painters of the Shijo school. Shiokawa Bunrin and Shibata Zeshin were among his pupils. He was commissioned to repair the door of the Zoroku-an at the Shugakuin imperial villa, which had been painted by a Kano artist. He received the title of hogen. Generally a painter of landscapes, he was also an excellent painter of figures. 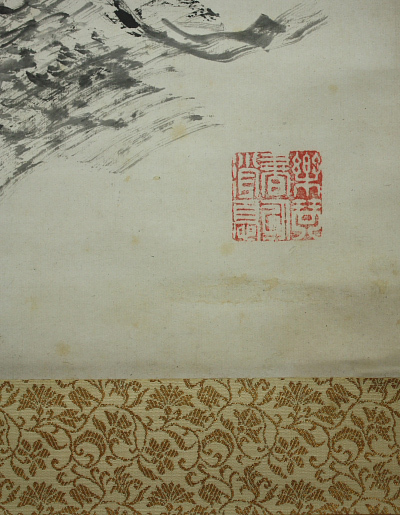 He was much influenced by early Chinese paintings. Okajima Seiko (1828-1877)He was born in Kanazawa. He went to Kyoto and studied Shijo-school painting under Yokoyama Seiki.He painted portrait/flowers and birds pictures very well. 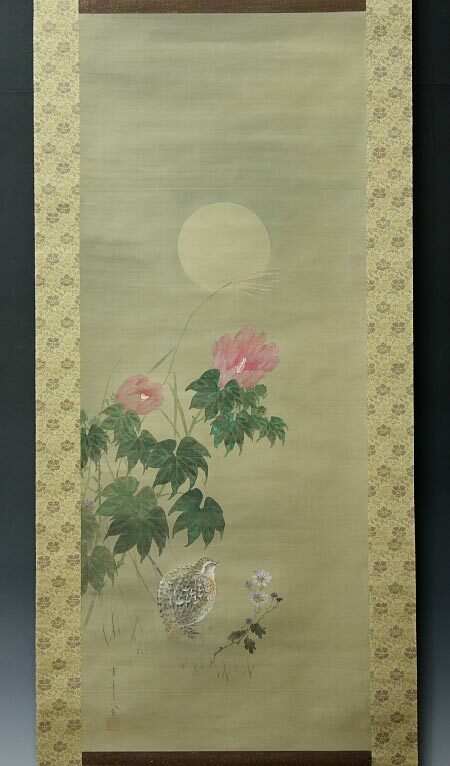 Okada Kanrin (1775-1849)Born in EDO.He studied under Tani Buncho.He painted flower & birds very well. Okada Yosai (1784-1864) Painter and Confucian at Edo latter term.He was born KAGA(kanazawa), good at drawing the SUMIE and Calligraphy. Okubo　Fukaku (1880-???? )Born in Ibaraki prefecture.He started to study painting under Matsumoto Fuko when he was 17 years old at Tokyo Art School.Later, He was an ardent admirer of Okuhara Seiko and Fukaku started painting NANGA. 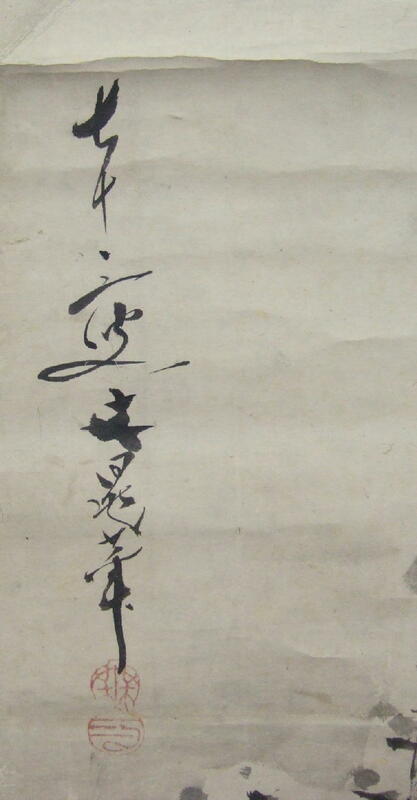 Okubo Shibutsu (1767-1837)He was a Chinese poet, calligrapher & painter,born in Ibaraki pref.His another name was Ko,Tenmin.His common name was Ryutaro.His another GO was Shiseido. Omata Bokutei (1879-1951)Kyoto Japanese painter. He was Tsuji Kako’s wife’s younger brother. He studied painting under Morikawa Sobun &Kikuchi Hobun. Onishi keisai (1773~1829) The buzen Nakatsu feudal retainer. 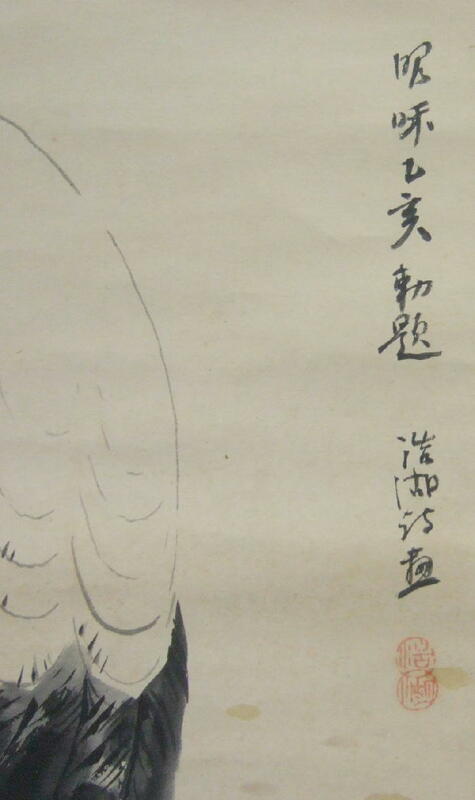 He drew Sansui, the flower bird picture with the Chinese Ming ,Qing dynasty style of painting. Oishi Obai (1864-???? 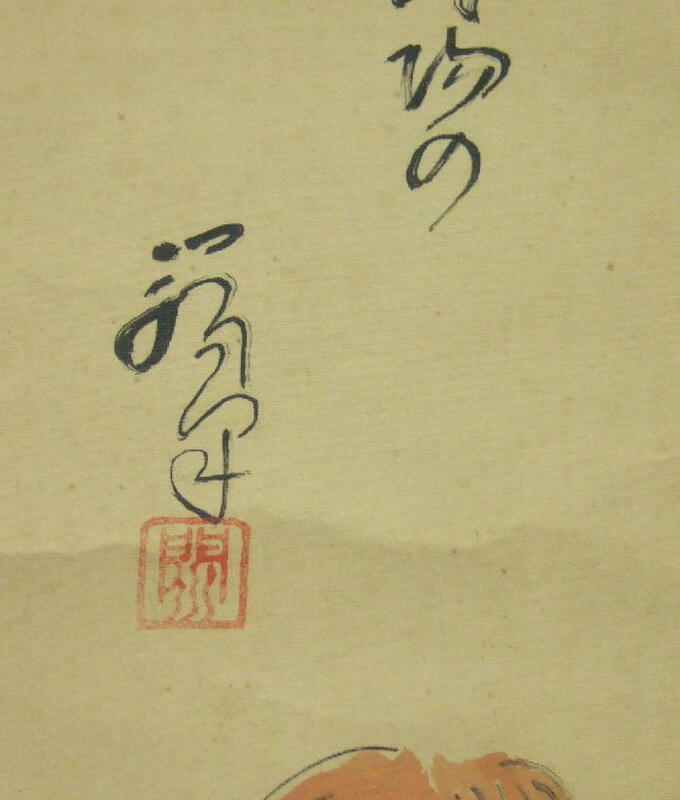 )He was a monk & painter.His another name was Daitoku-an.He studied under Tanomura Chokunyu. Ōtagaki Rengetsu (1791-1875) was a Buddhist nun who is widely regarded to have been one of the greatest Japanese poets of the 19th century. 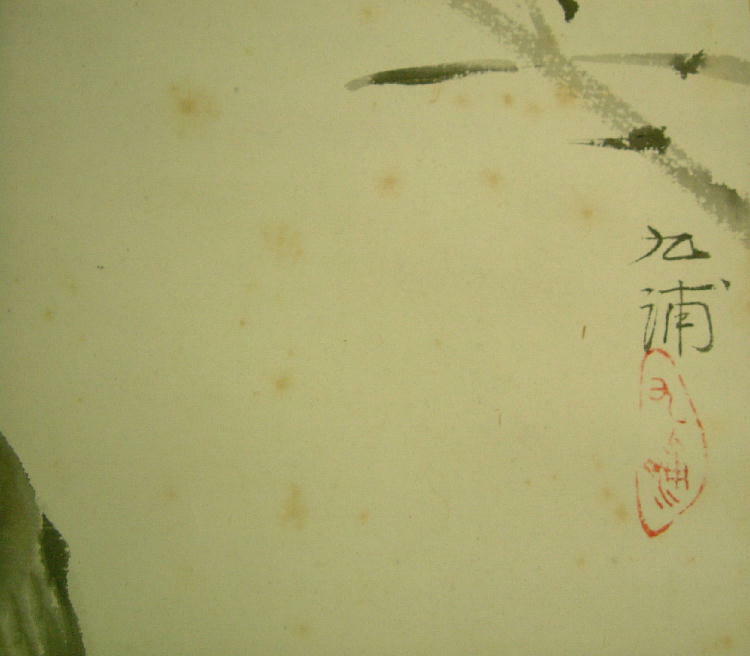 She was also a skilled potter and painter and expert calligrapher. Ōta Nampo (1749-1823) He was the most oft-used penname of Ōta Tan, a late Edo period Japanese poet and fiction writer. 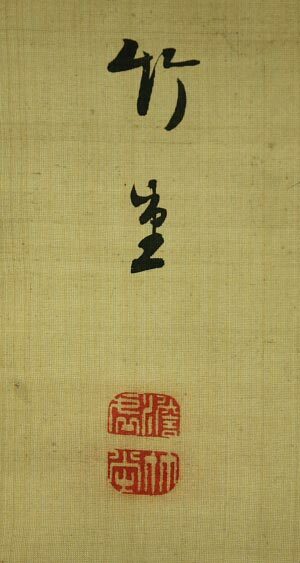 He wrote primarily in the comedic forms of kyōshi, derived from comic Chinese verse, and kyōka, derived from waka poetry. His pennames also include Yomo no Akara, Yomo Sanjin, Kyōkaen, and Shokusanjin. Rai Sanyo (1780-1832) was a famed Japanese philosopher and historiographer who lived and worked in Hiroshima towards the end of the Edo period. RAISHO NAKAJIMA(1796-1871). He is a very famous Japanese painter from Shiga prefecture. 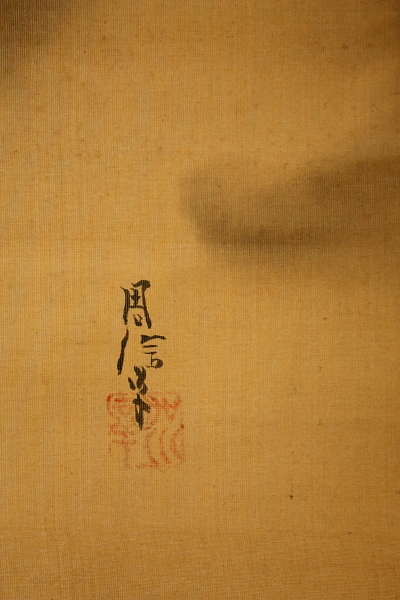 He studied under great painter Nangaku Watanabe and Ozui Maruyama. He was good at person painting and painting of flowers and birds. And he brought up many famous painters such as Bairei Kono. Saeki Ganryo (1797-1852)Japanese artist of the Kishi sect. He was the foster child of Ganku. His real name was Shoryo Hamatani . He died in 1852 at the age of 55. Sakai Hōitsu (1761-1828) was a Japanese painter of the Rinpa school. He is famous for reviving the style and popularity of Ogata Kōrin, and for creating a number of reproductions of Kōrin‘s work. Sakai Oho (1808-1841)Born the son of a monk, Oho was adopted when he was twelve by a mistress of the Rin School, or Rinpa, master Sakai Hoitsu. He became the heir to Hoitsu’s artistic lineage, which went back to Ogata Korin in the early 1700s and to the school’s founder, Sotatsu, in the early 1600s. Sakaki Hyakusen [Sakakibara Shinen; Hassendo, Hoshu, Hyakusen] Born into a family that owned a pharmaceutical shop and was probably of Chinese descent, Hyakusen went to Kyoto when he was about 30 and established himself first as a haiku poet and then as a professional painter. 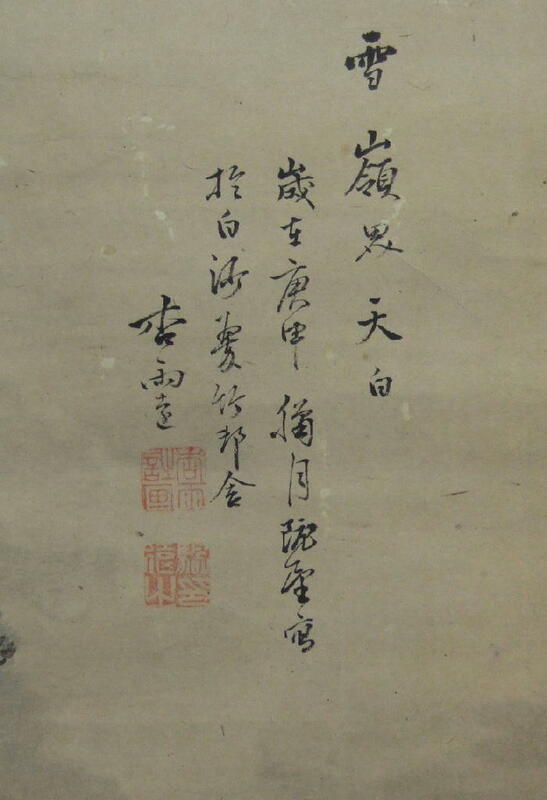 In 1738 he was awarded the honorary priestly title hokkyo (‘Bridge of the Law’) given to artists of merit. 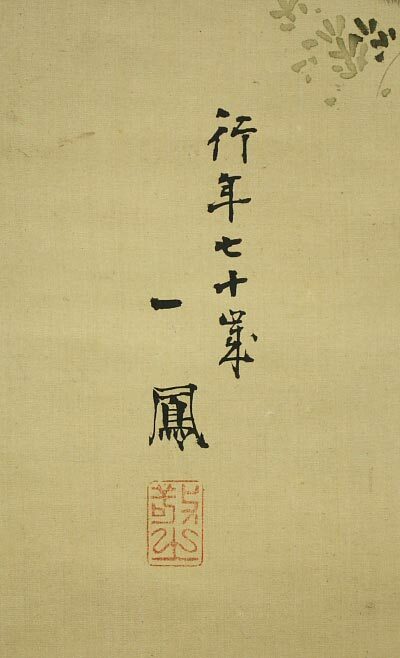 In 1751 he published the Gen min gajinko, a record of Chinese painters of the Yuan (1279–1368) and Ming (1368–1644) periods, taken from a single Chinese source, the Pei wen zhai shuhua pu (‘Compilation of painting and calligraphy from the Pei wen studio’; 1708), a publication supervised by Wang Yuanqui (see WANG (ii), (2)). 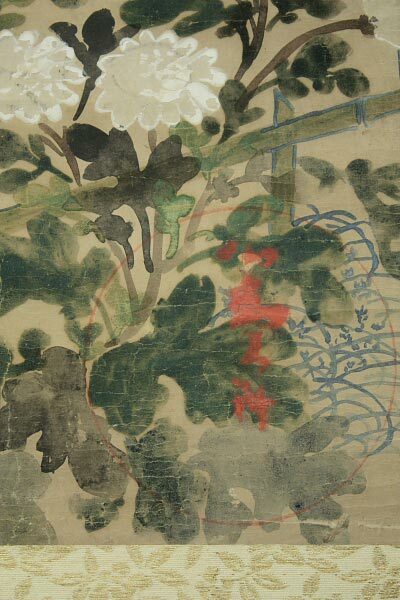 Also in 1751 he executed, at the Suhara House in Tonomine, Nara Prefecture, the earliest set of fusuma (sliding-door) paintings to be done by a Nanga artist. Sasaki Senkei (1772-1848) He was an official artist to the Kaga maeda clan. He studied painting under Tsurusawa Tansaku & Tsurusawa Tansen in Kyoto. He received the title of hogan. Sato Ryusho (1848-???? )Nanga painter.His common name was Yujiro.He was born in Tosa(Kochi prefecture). Sekiho Ritsuzan (1805-1870) He acted in EDO. He painted flower & birds well. 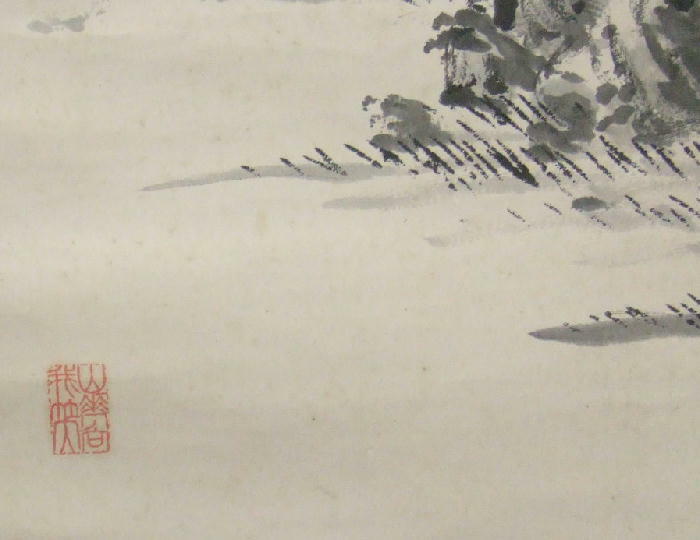 Sesshū Tōyō (1420 – 1506) was the most prominent Japanese master of ink and wash painting from the middle Muromachi period. He was born into the samurai Oda family (小田家), then brought up and educated to become a Rinzai Zen Buddhist priest. However, early in life he displayed a talent for visual arts, and eventually became one of the greatest Japanese artists of his time, widely revered throughout Japan and China. 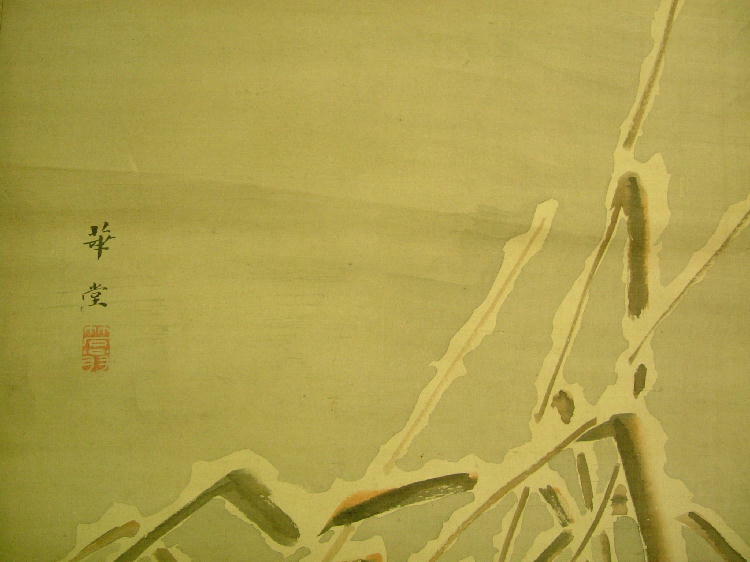 Sesshū studied under Tenshō Shūbun and was influenced by Chinese Song Dynasty landscape painting. 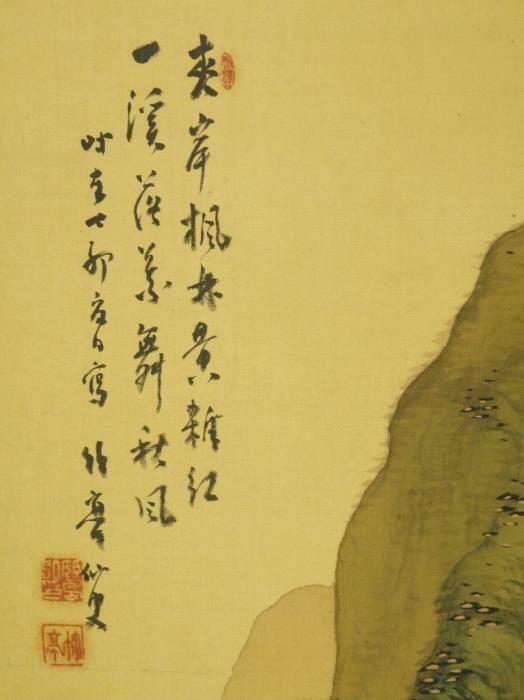 In 1468–9 he undertook a voyage to China, where too he was quickly recognized as an outstanding painter. 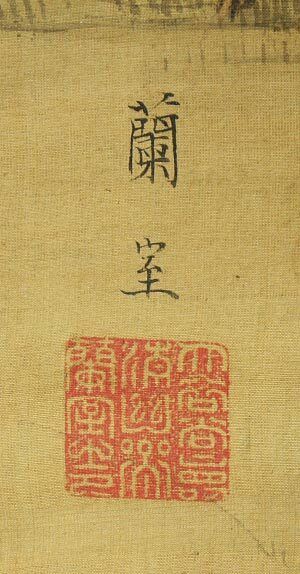 Upon returning to Japan, Sesshū built himself a studio and established a large following, painters that are now referred to as the Unkoku-rin school—or “School of Sesshū”. 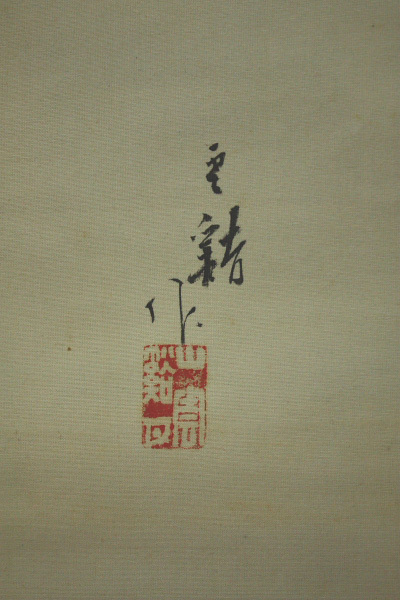 Although many paintings survive that bear Sesshū’s signature or seal, only a few can be securely attributed to him. 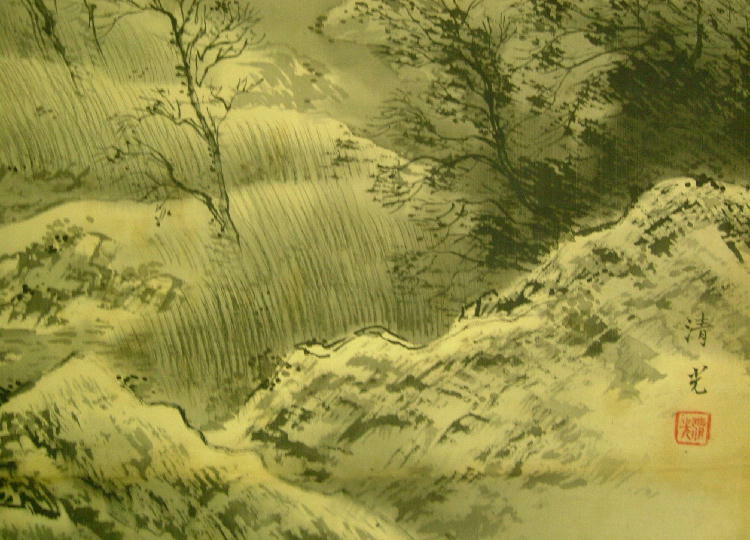 His most well-known work is a very large landscape scroll, Landscape of the Four Seasons (Sansui Chokan), which has been described as probably the best Japanese ink painting in history. SETSUDO (act 1568～1600)His another name is DOSETSU.He lived in Aizu which is an area comprising the westernmost third of Fukushima Prefecture in Japan.He worked in the styles of Sesson and Sessyu. Shibata Gito (1779 – 1819)He was born in Bizen province (modern Okayama Prefecture). His other names included Ichu, Kinsho and Kinkai. His nickname was Kitaro. Gito studied painting with Matsumura Goshun and was respected as a painter of kachoga (birds and flowers) and of portraits. Shibata Zeshin (1807-1891) was a famous and revolutionary Japanese painter and lacquerer of the late Edo period and early Meiji era. In Japan, he is ironically known as both too modern, a panderer to the Westernization movement, and also an overly conservative traditionalist who did nothing to stand out from his contemporaries. Despite holding this odd reputation in Japan, Zeshin has come to be well-regarded and much studied among the art world of the West, in England and the United States in particular. Shinran (1173-1263) was a Japanese Buddhist monk, who was born in Hino (now a part of Fushimi, Kyoto) at the turbulent close of the Heian Period and lived during the Kamakura Period. Shinran was a pupil of Honen and the founder of what ultimately became the Jodo Shinshu sect in Japan. 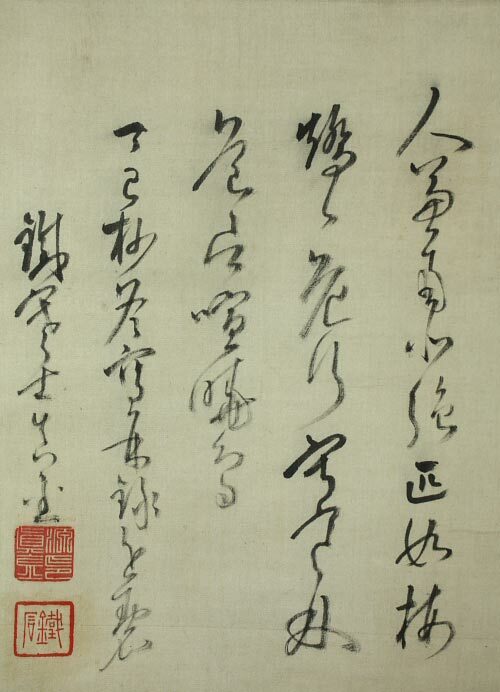 Shinozaki Shochiku (1781-1851)He was a Confucian and a calligrapher. He was excellent in poetry and writing. At that time, most of the person who issued a book requested sentences from him. Shiokawa Bunrin (1808-1877)He was born in Kyoto in 1808 as the son of a samurai. At his father’s death he moved to relatives in Fushimi, where he started to study painting with a local artist called Toryō at the age of fourteen. Later, he was a pupil of Okamoto Toyohiko and also studied nanga style painting and western style painting. Shirai Kayo (??? ?-1836) He was born in Echigo Province which is modern Niigata prefecture. He moved to Kyoto and studied under both Kishi Ganku and Kishi Gantai. 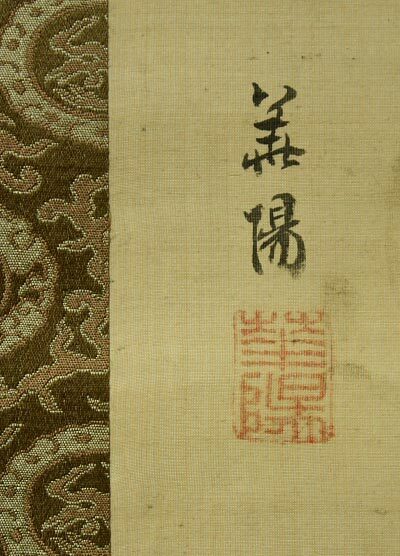 Kayo is most famous for his book ‘Gajo Yoryaku‘, ‘Abrreviated essentials of the vehicle of painting’ which was published in 1831 and contributed greatly to the study of Japanese painting. Shuko Nakayama, born in1876 and his exact death date is unknown. He is a famous Ukiyo-e painter. His specializes in portraits, Buddhist subjects and historical events. He studied from Master Nenpo Mizuno. Sō Shiseki (1715- 1786) He was a Japanese painter of the Nagasaki and Nanpin schools.Originally from Edo, he spent some time in Nagasaki, where he studied under the Chinese painter Song Ziyan, who was known as Sō Shigan in Japanese. The name Sō Shiseki is a pseudonym, derived from an imitation of his master’s name. 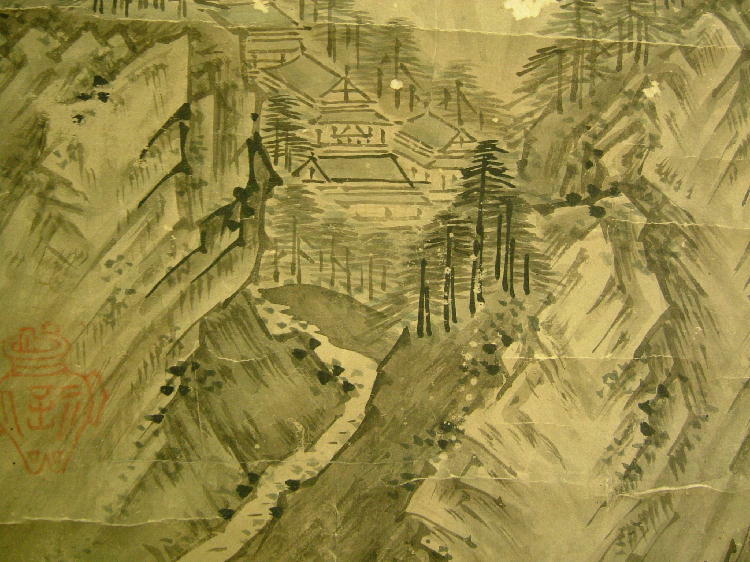 Sōami (died 1525) was a painter and landscape artist in the service of the Ashikaga shogunate who is claimed to have designed the rock garden of the Ginkaku-ji. 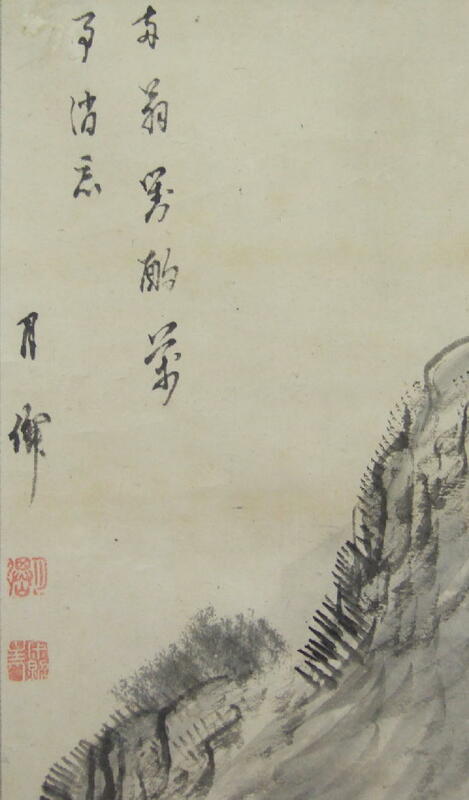 Unlike many of his contemporaries, Sōami‘s paintings were in the style of China’s Southern School; some of his greatest pieces covered over twenty panels, and depicted Japanese landscapes using Chinese methods. 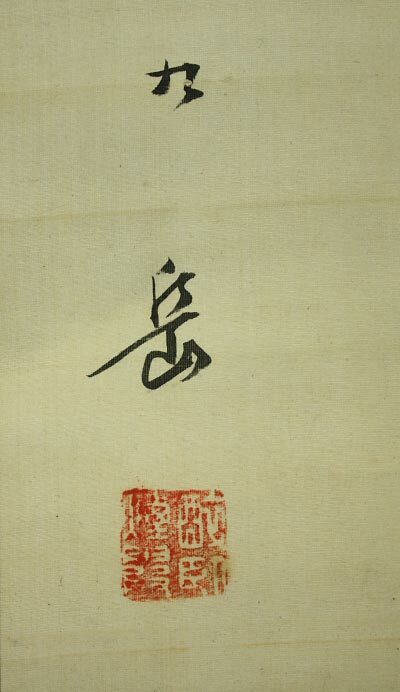 His work was among the first nanga or Southern School work in Japan. 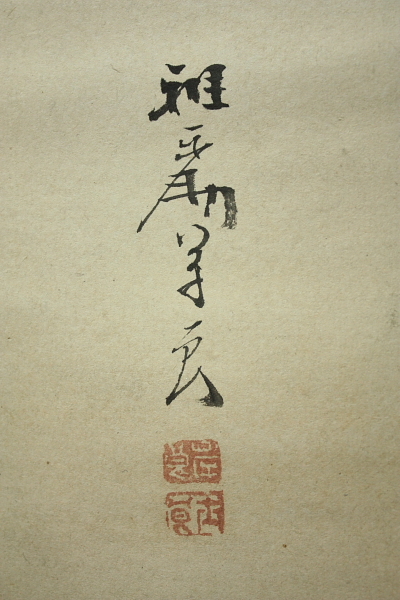 Sōfū (Nagano Sōfū, the gō or art name of Nagano Moriyoshi, 1885 – 1949). 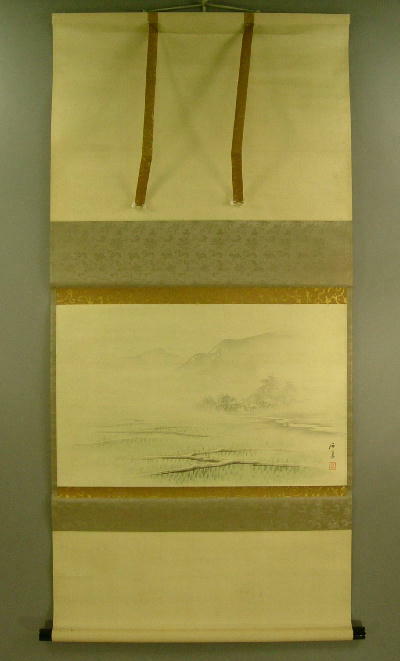 Late Taishō – early Shōwa era, circa 1920 – 1930. Soga Shohaku (1730-1781), who has long been believed to come from the province of Ise (now Mie Prefecture). His many works in this area even today appear to confirm this. 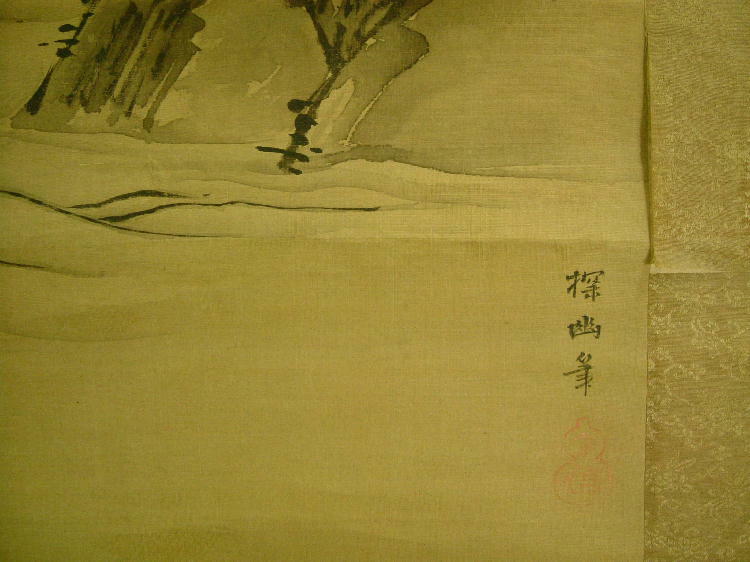 However, records indicate that from his father’s generation the family lived in Kyoto, where many eminent painters, including Yosa Buson, Ike no Taiga, Maruyama Okyo, Nagasawa Rosetsu, and Ito Jakuchu, were active. Ranking in line with such figures, Shohaku developed his own distinctive style by deviating from the contemporary art scene and professing to the then outdated style of the Muromachi (1392-1572) painter Soga Jasoku (d. 1483), undoubtedly in an attempt to undermine the overwhelming popularity of the realist painter Maruyama Okyo (1733-1795). He was born in the merchant’s family of Kyoto as the second son between father Kichiemon and mother Yotsu, he made a living as a painter on an end of 20′s. 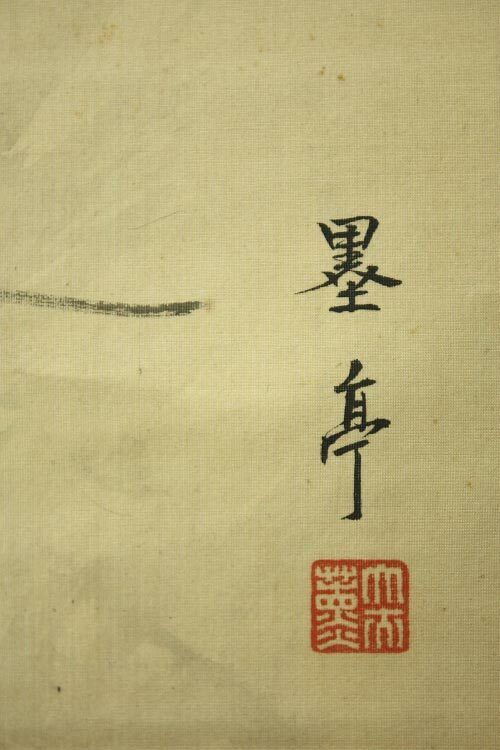 He learned from Takada Keiho (1674～1755),in addition, it is recorded that he learned drawing technique from Soga school and Unkoku school, it is supported in his real work. He created individual person groups such as expression of maniac, hands and feet of beast, or putting on clothes of a beggar, moreover, he added deformation to a traditional subject such as painting of flowers and birds and landscape painting,he called reputation with a mysterious style of painting that made full use of prominent technique from a minute coloration painting to the India-ink drawing which was carelessness.He traveled in the Ise (Mie) district twice at least, produced many works and anecdotes and also visited Harima (Hyogo). 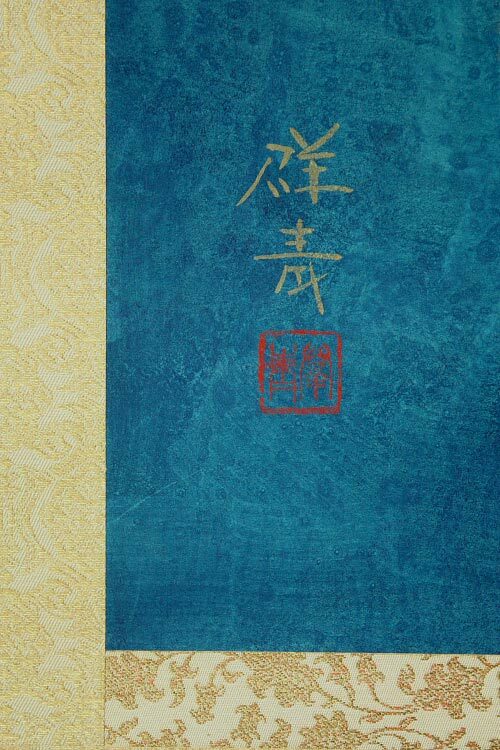 Judging from his friends members such as Matsunami Teisai (1718～1793) scholar of Confucianism or Zen priests, we understand that it seems to have influenced his idea method and action of the scoundrel. His pseudonym is Kiitsu, Dasokukenshohaku, Gotoki, Kishinsai, Shohaku, etc…An innovative, prolific painter active during the Edo period, he is often categorized as an individualist and eccentric. 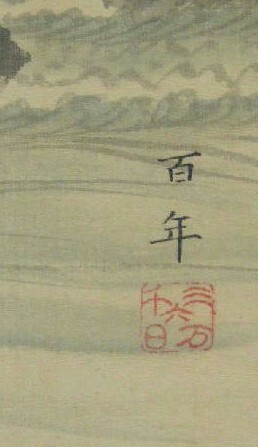 Shohaku seems to have adopted the family name Soga in his mid-20s, probably to enhance his reputation as a painter and to suggest that he was heir to one of the great lineages of Japanese ink painting. 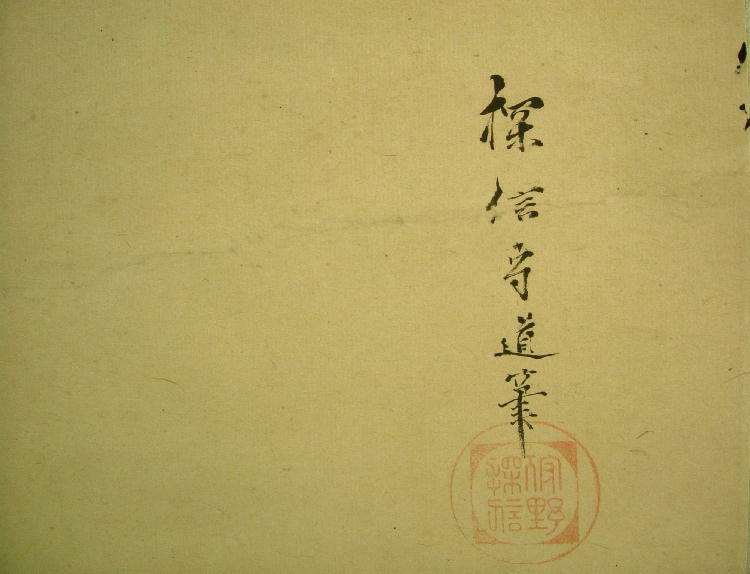 He claimed to be the tenth generation descendant of Jasoku, an artist’s name (go) employed by Echizen Soga artists. 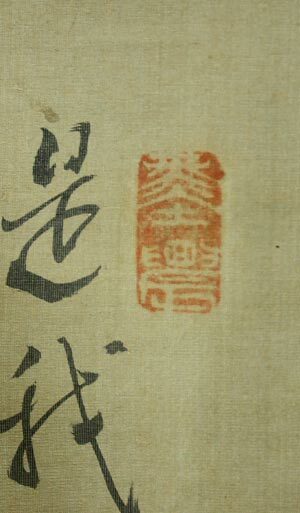 He also used a seal which read ‘Jasokuken‘. 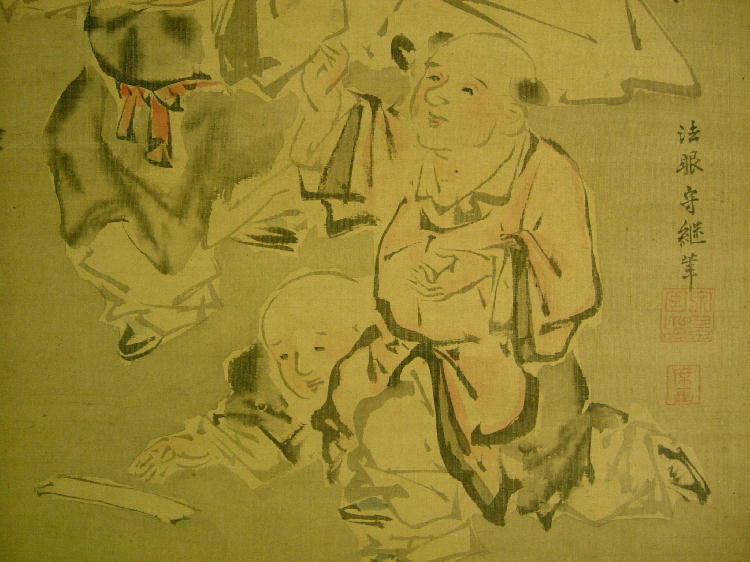 Like several earlier Soga painters, he painted figural subjects based on Chinese legend. 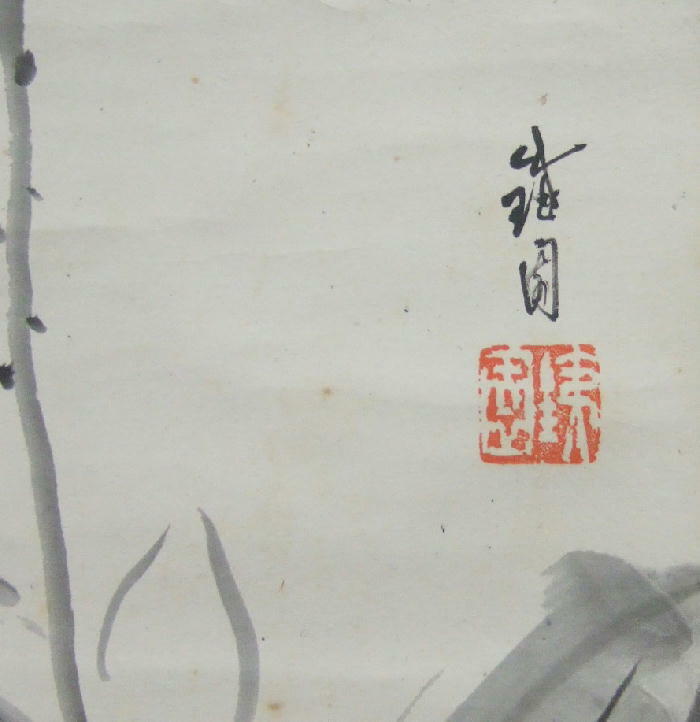 His works include many expressive paintings executed in monochrome ink, but his idiosyncratic style was apparently not based on paintings by other Soga artists. Always charged with great energy, his brushwork is sometimes broad and abbreviated, and sometimes complex and convoluted. 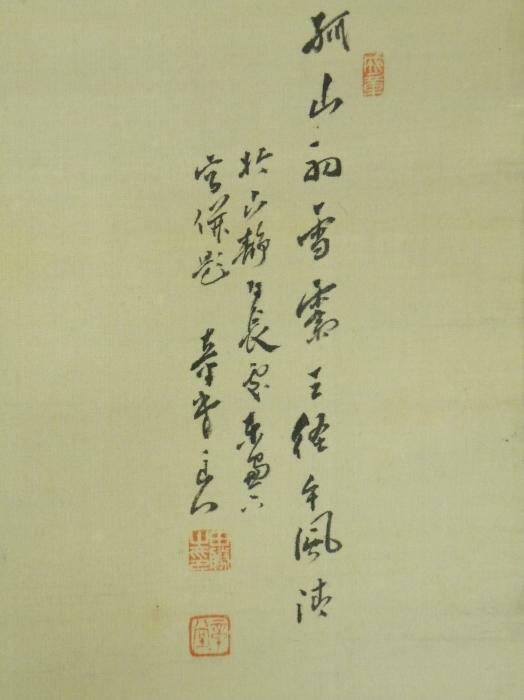 Su Shi (1037-1101) was a writer, poet, artist, calligrapher, pharmacologist, and statesman of the Song Dynasty, and one of the major poets of the Song era. Suzuki Hyakunen (1825-1891)He was born and raised in Kyoto, where his father, an astronomer, trained him in drawing astronomical diagrams. Traditionally he is described as a pupil of Edo artist Ōnishi Chinnen, who was a student of Maryama. Ōkyo. This places Hyakunen in de Maryama tradition, but from early in his career his style was eclectic, ranging from Shijō to Kanō styles. 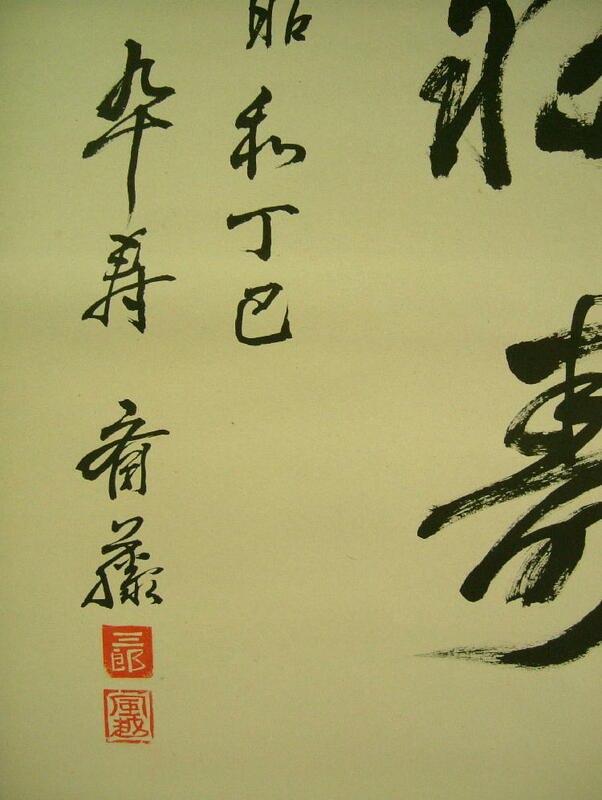 He led a literati lifestyle and his love of Chinese classics are reflected in many of his paintings. Suzuki Kiitsu (1796 – 1858)Japanese painter, poet and illustrator. 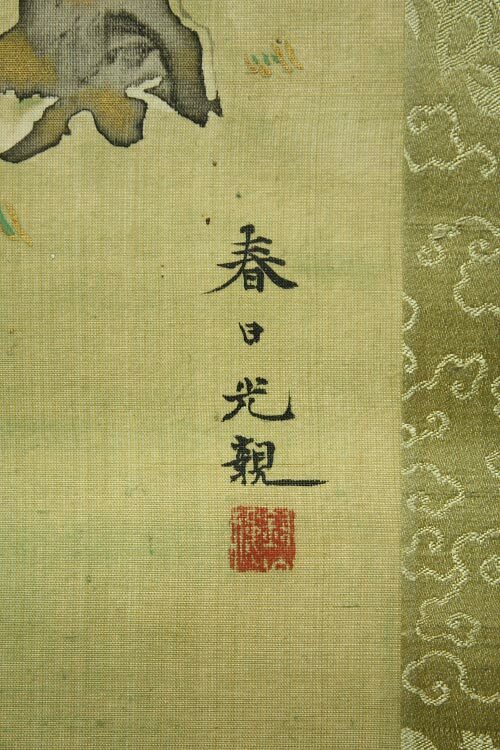 The last master of the Rinpa school of decorative painting, he moved to Edo as a youth and became the leading pupil of Sakai Hoitsu, the instigator of the Rinpa revival in the early 19th century. Suzuki Meimon (??? ?-1840) Born in Awa(Tokushima prefecture).His real name was Kondo.His common name was Seijiro.He was a pupil of Suzuki Fuyo.He became an adopted son of Fuyo after Fuyo’s son,Suzuki Shoren.He painted Kacho,Sansui well. He became a goyo eshi (painter-in-residence) at the Awa clan. Suzuki Shonen (1849-1918)Suzuki Shonen was born in Kyoto as son of Suzuki Hyakunen (1825-1891) who established his own style of painting without adhering to any of the established styles such as the Shijo-Maruyama, Nanga or Kano schools. 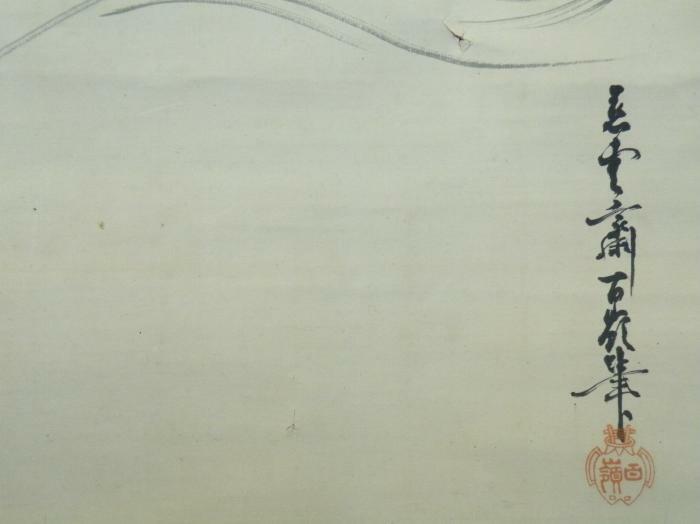 Shônen is considered the best student of Hyakunen’s, and was known for his bold and dramatic brushstrokes. Specialized in landscapes and kachoga. 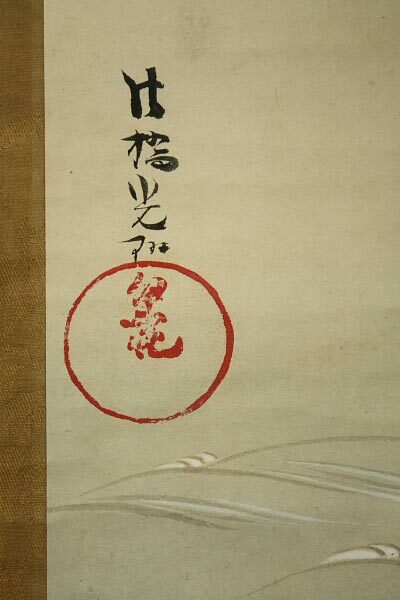 From 1881 to 1888 Shonen was the head of the Northern Division (ink painting in the Sesshu tradition) of the Kyoto Prefecture Painting School (other divisions were: South – nanga school; East – Shijo-Maruyama school; and West – Western style painting). Tachihara Kyosho (1785 – 1840)He was a Mito feudal soldier and NANGA painter. He went to the capital in Edo in 1812, he studied under Tani Buncho. He had the exchange with Watanabe Kazan & Tsubaki Chinzan. His descendant is Tachihara Michizo who was a poet and an architect in Taisho era. 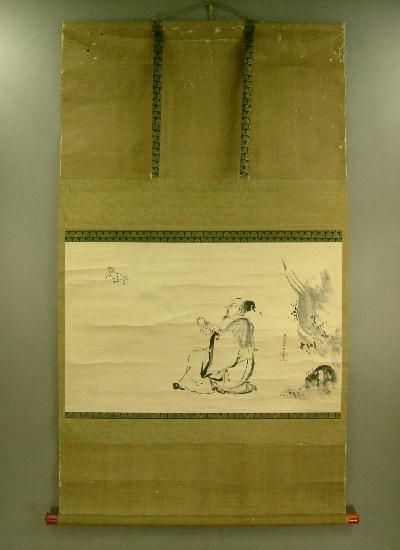 Taigado Seiryo (1806-1869)He was a Monk and painter.He was 37th top of the buddhist priest,Kyoto Sorinji temple. Second son of Taigado Geppo(pupil of Ikeno Taiga). Takebe Ryo_tai (1719 – 1774) He was a contemporary of Japan’s most famous Nanga artists, Ike Taiga and Yosa Buson, but there is no evidence that Ryo_tai knew either of them. 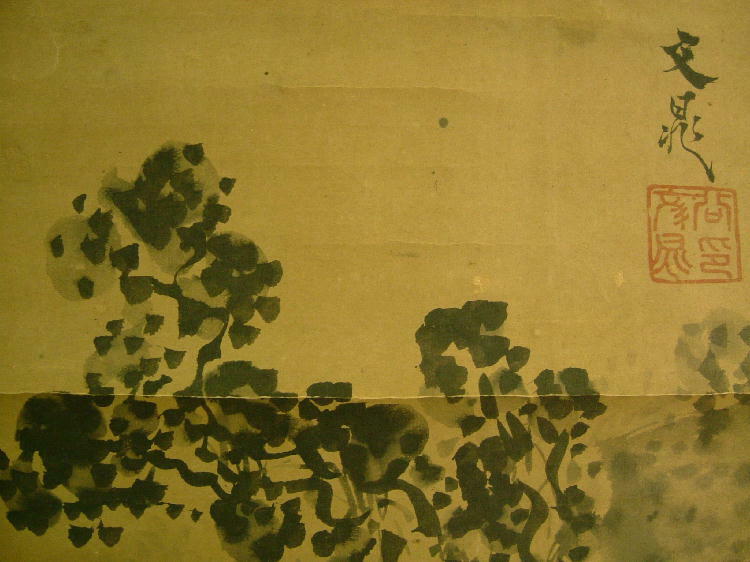 Ryo_tai‘s interest in Chinese-style painting began when he was a Zen monk at To_fukuji temple in Kyoto. 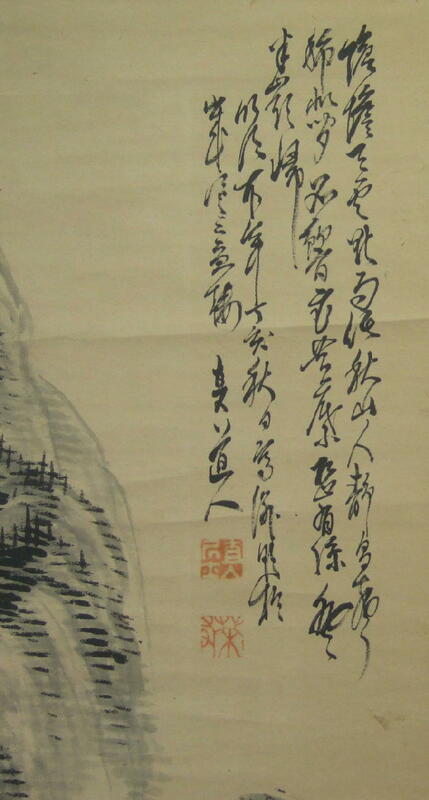 He eventually abandoned monastic life to devote himself to painting and poetry, and sought out noted masters such as Sakaki Hyakusen (Taiga’s teacher) and Kumashiro Yuhi, a Nagasaki painter of birds and flowers. 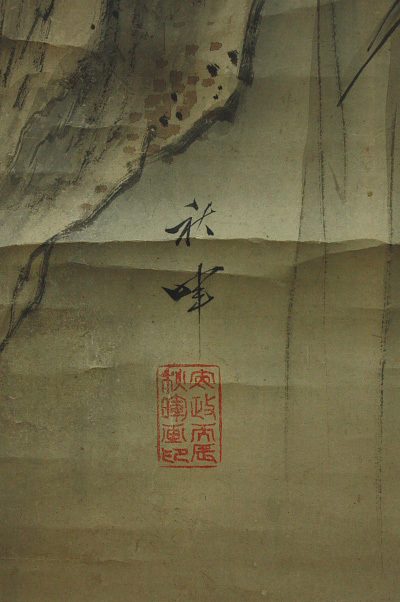 Ryo_tai‘s use of wet, freely applied brushstrokes in this painting, however, reflects the influence of Fei Han-yuan, a Chinese artist who visited Nagasaki and under whom Ryo_tai studied in 1754. Takada Kiseki（1871-1946）He was born in toyama prefecture. He was a teacher of Shimazaki Kison. Takahashi Chikunen (1887-1967) He was born in Aomori prefecture as a eldest son of Takahashi Beishu.He studied Maruyama-Shijo painting under Mikami Sennen & Nomura Bunkyo. 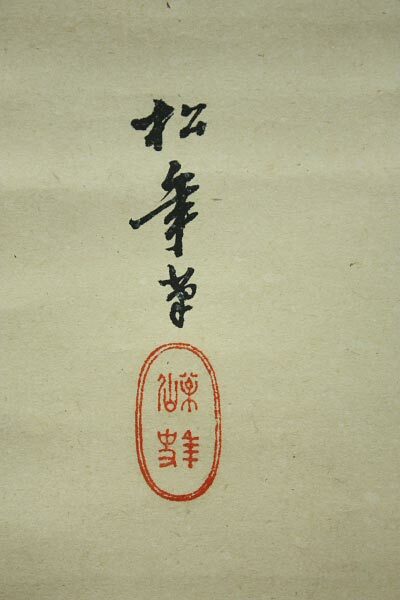 He received the honorary title of HOKYO in 1921. He was given a cultural prize by Aomori prefecture in 1961. Takashima Hokkai (1850-1931) Takashima Hokkai was a professional forester who studied painting and gained a national reputation as a painter in Japan. Through his travels in Europe and North America, he also became well known abroad, especially in France. Takagi Yasunosuke (1891-1941) He was born in Tokyo.He graduated fromTokyo University of Arts.He studied under Kawabata Gyokusho & Matsuoka Eikyu.He exhibited at the Teiten where he was awarded several prizes for his work. Taki Katei (1830-1901) He was born in Edo, the son of a samurai. From his childhood, he had the ambition to become a great painter. He first learned painting from Araki Kankai and Ooka Umpo. In 1850, he went to Nagasaki and joined a circle of famous painters, including Hidaka Tetsuo and Kinoshita Itsuun. In 1873, Taki’s work was exhibited at the international Vienna Exposition. He won a bronze medal for his painting “Peafowl” at the memorial exposition for Christopher Columbus which was held in Chicago in 1893. 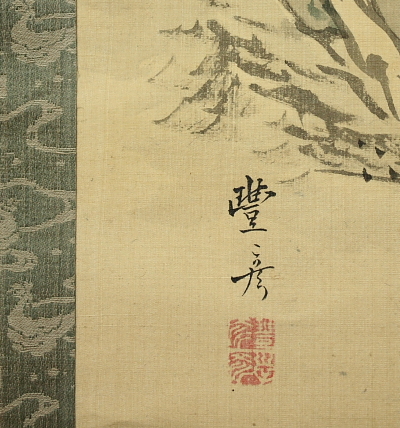 He developed the reputation as one of the greatest “flower and birds” painters of the Meiji era. 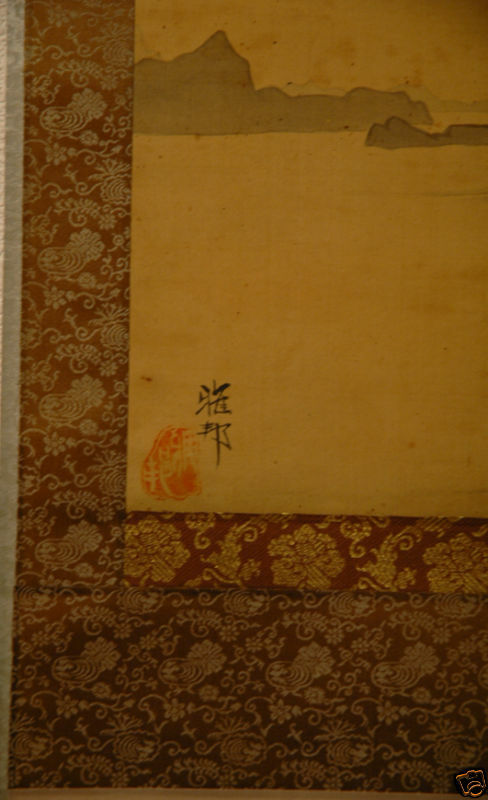 Katei served as a judge in domestic expositions, and later was appointed as a painter to the Imperial Household. Tanaka Hakuin (1866-1934) Born in Shizuoka prefecture.He studied painting under Tanomura Chokunyu when he was 17 years old.He painted SANSUI well. Tanaka Ikka (1864-1924) Born in Kyoto.He studied under Kubota Beisen. 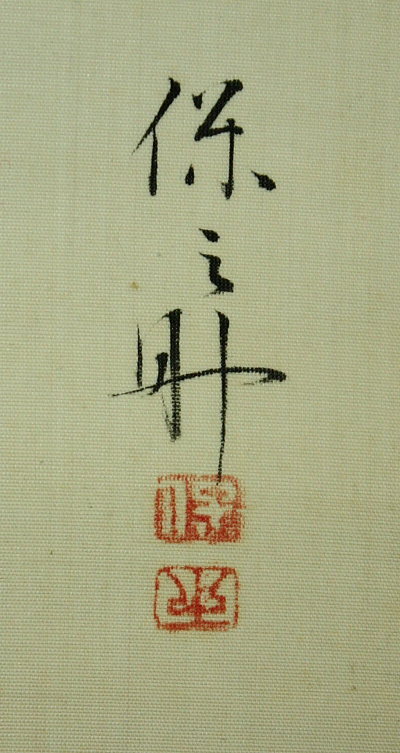 He exhibited many domestic expositions and his works were regarded in Kansai area especially. Tanaka Nikka： He was born in Kyoto.He learned painting from Okamoto Toyohiko(1773-1845) of Shijo school,it is said that he was a best disciple,he also was much more experience than Shiokawa Bunrin(1801-1877) of same disciple.Though he was originally the talented person who led shijo school after death of Toyohiko,he dies with his teacher accidentally in the same year.He was good at a painting of flowers and birds,flower painting and person image,and a tendency to describe the teacher style for a more delicate sense was seen in his style. Tanaka Shozan (1873-????) 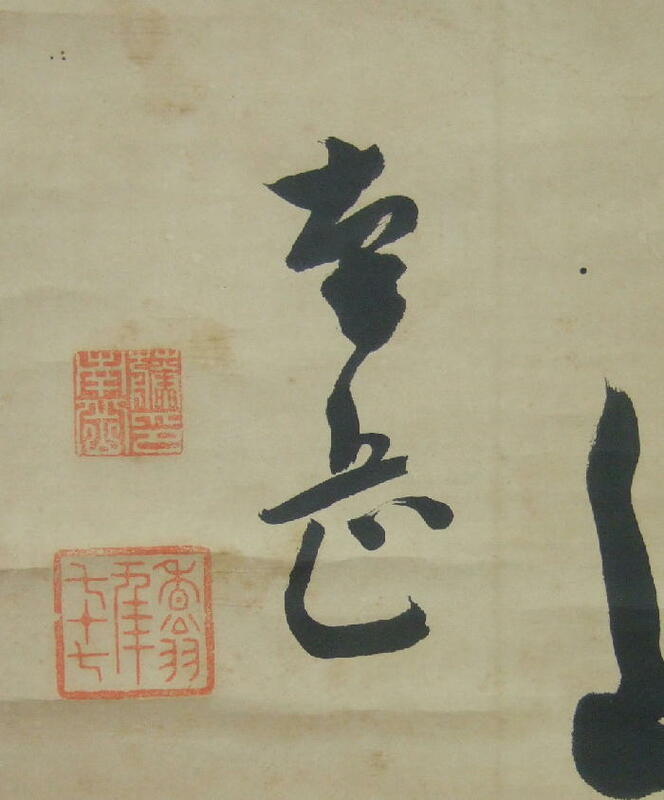 He was a painter & Calligrapher. He was born in Kyoto.He studied calligraphy under Kubota Kinsen. Tanaka Tessai (1871~????) He was born in Ibaraki prefecture.He studied painting under Hashimoto Gaho KAKUSHU (1642-1730)　He was a Buddhist priest and painter. He was invited to Takamatsu feudal lord, Matsudaira Yorishige and a lot of pictures were drawn by him. 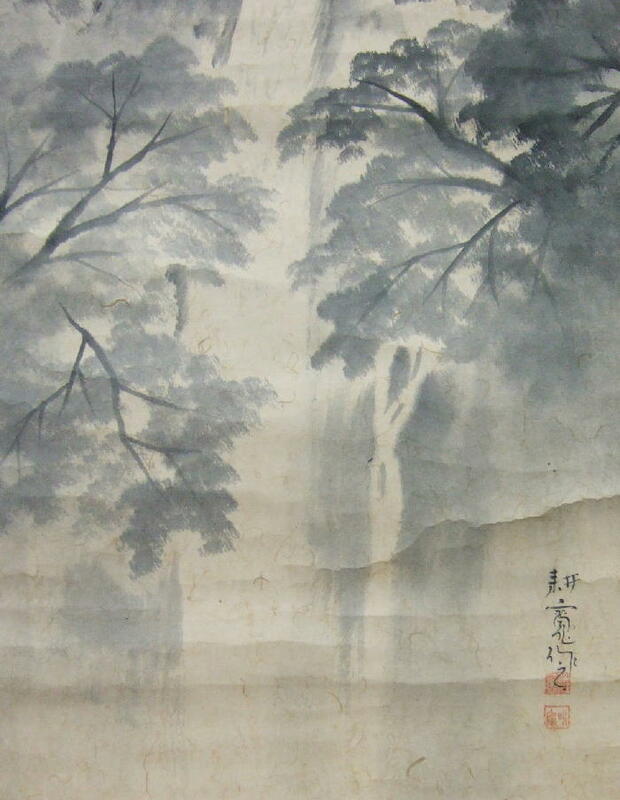 Tani Bunchō (1763 – 1840) was a Japanese literati (bunjin) painter and poet.Like most bunjinga painters of his time, Bunchō focused largely on Chinese-inspired landscapes. Since travel outside Japan was forbidden under the Tokugawa shogunate, Bunchō was unable to study in China; he spent many years in Nagasaki, therefore, studying Chinese art and Western art (Yōga) with the traders there.Watanabe Kazan and Takaku Aigai were among his disciples. Tani Bunji (1812-1850)His popular name is Bunjiro.He was an eldest son of Tani Buncho. Tanomura Chikuden (1777 – 1835) He was a Japanese painter of the Edo period. He is known for his depictions of nature, often melancholic in style. Tanomura Chikuden (July 14, 1777 – October 20, 1835) Born as the second son of the clan doctor, Tanomura Kenan in Bungo Chokunyu county, Taketa village (hence his name Chikuden was from his home vilage). 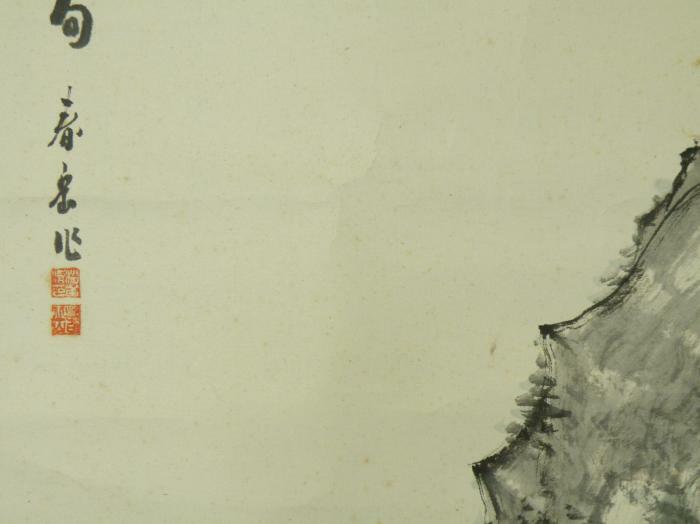 At the age of 20, through his teacher Karahashi Kunzan, Chikuden learns painting from the famous Tani Buncho but not directly in person but if it was today it would have been close to as doing online lessons or using correspondence. By age 22 Chikuden was already famous as a genius and was skilled in the classics and medicine and in order to revise the “History of Bungo” he was given permission to go to Edo. At Edo he was able to meet his teacher Tani Buncho. In 1805 due to an illness with his eye, Chikuden took a vacation and travelled throughout Western Japan, settling in Kyoto for two years. There he became a student of Murase Koutei and in Osaka he befriended Uragami Gyokudo, Okada Beisanjin, and Ueda Shusei and in 1811 he became close friends with Rai Sanyo and Noro Kaiseki. 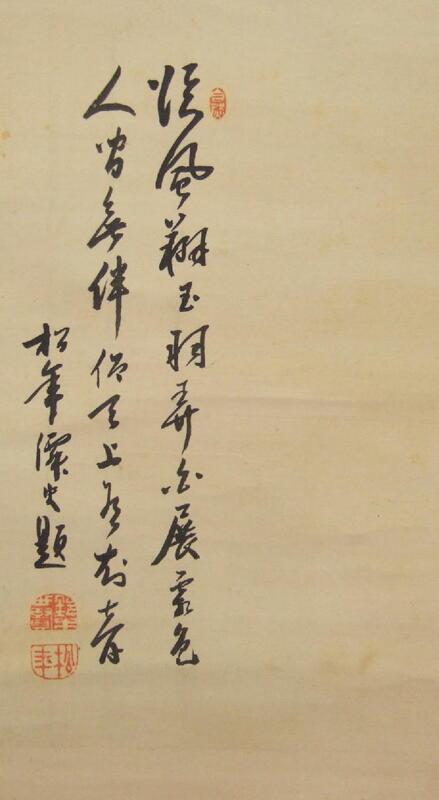 Due to a peasant uprising in 1811 Chikuden resigns his post as government official handling education and social reform and retires at 37, but he continues to paint and became friends with more noted artists during this time. At age 50, he goes to Nagasaki to meet with the artists who immigrated from Qing Dynasty China and the Nagasaki school of art. 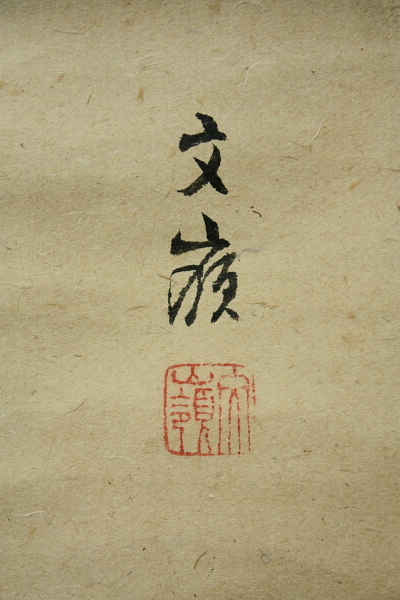 Chikuden was important in spreading the Bunjin movement and refining its art and related subjects. Terasaki Kogyo (1866 –1919) Born in Akita. 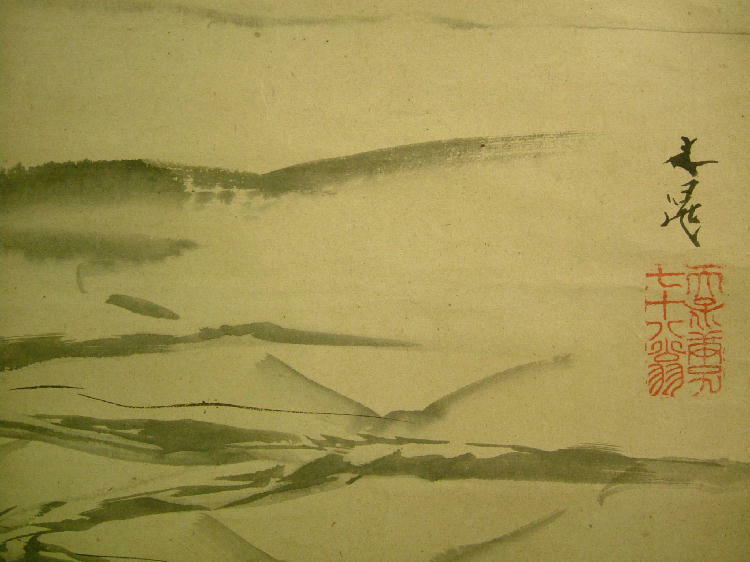 To Tokyo in 1888; studied many styles of Japanese and Chinese painting, finally creating his own rather eclectic manner. Taught at the Tokyo School of Fine Arts until he left with Okakura Tenshin, Hashimoto Gaho, Shimomura Kanzan, and Yokoyama Taikan to found the Nihon Bijutsuin. 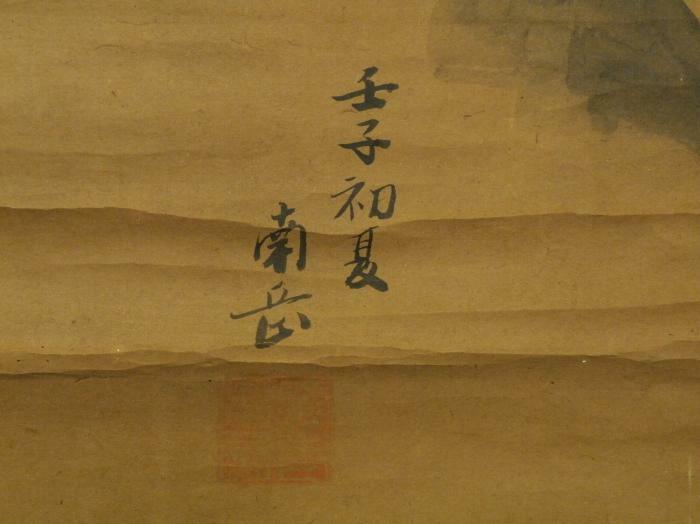 When Okakura retired from this group, Kogyo returned to the Tokyo School of Fine Arts. 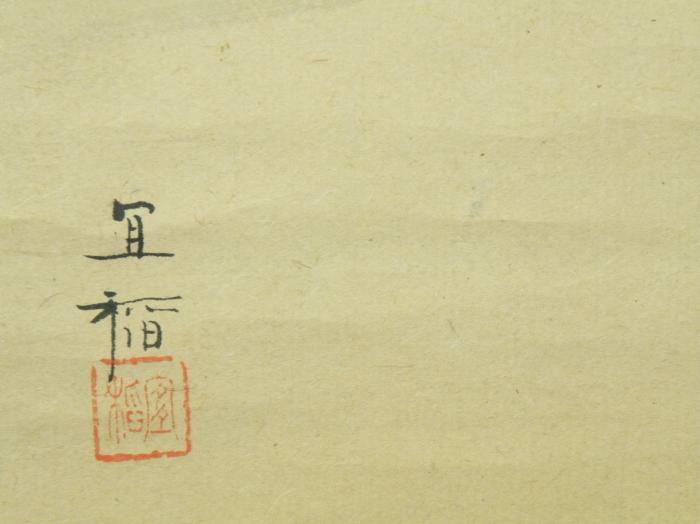 Member of the Nihon Bijutsuin and the Art Committee of the Imperial Household. 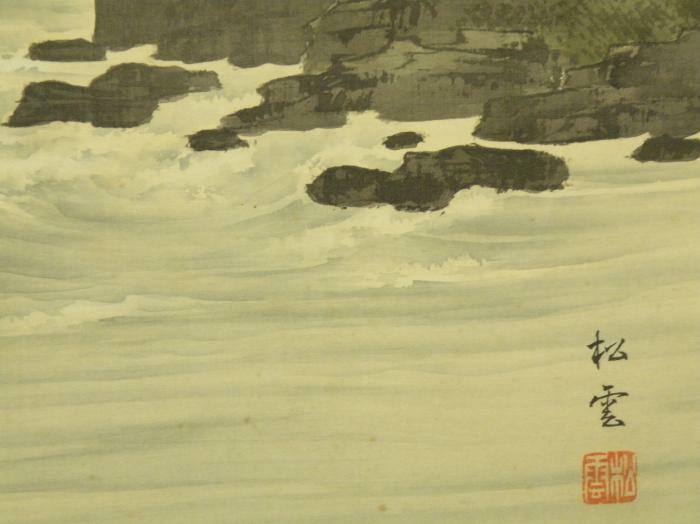 Served as a war correspondent during the Russo-Japanese war, producing prints. 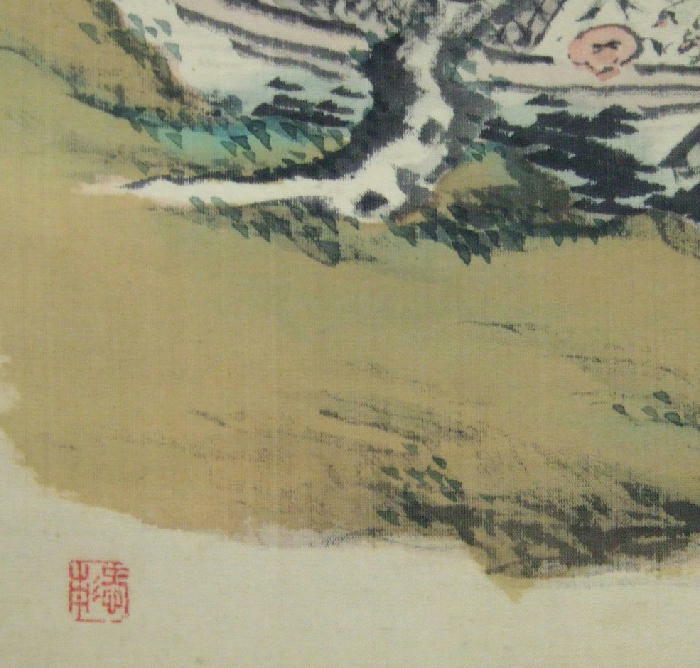 His landscapes are delicately colored and in the Japanese style, yet show much Western influence. TANOMURA CHOKUNYU (1814~1907)Chokunyu was born in Kyushu but moved to Kyoto and became pupil and adopted son of the well-known artist Tanomura Chikuden. 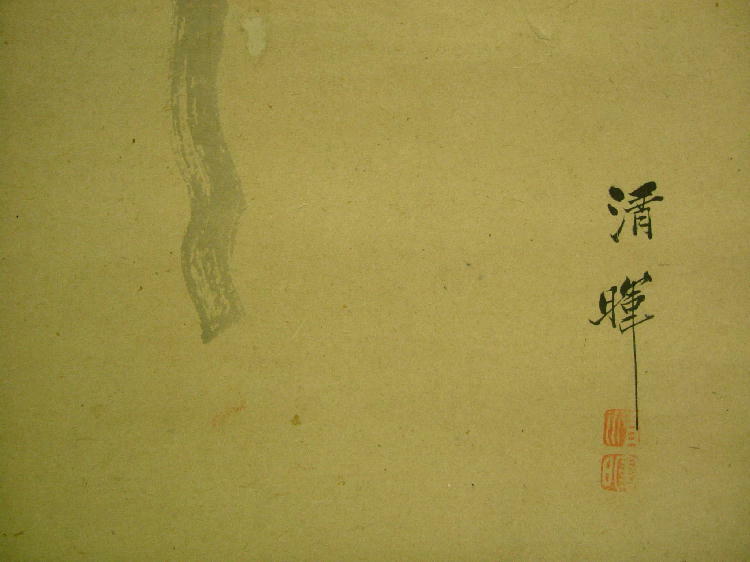 Chokunyu was mainly a nanga artist but he also did calligraphy and some Zen-style paintings. Tetuen Sakuma(1850-1921) He is very famous artist in Japan. He enjoyed to study Zen when he was alive. Tenryu Dojin (1718-1810) He was a Tenryu Buddhist Priest.He grew up to study drawing as well as medicine. When he was 19, he went up to Kyoto, where he determined on his loyalty to the Emperor. So, he joined the on-going movement of overthrowing the Shogunate led by Takeuchi Shikibu. 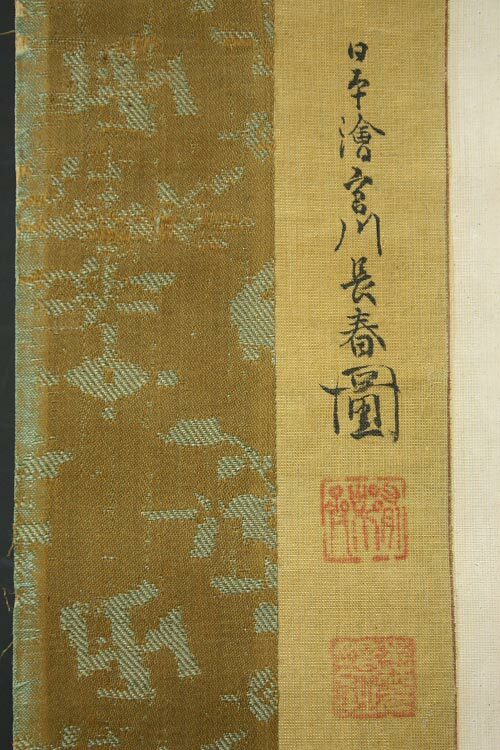 Tenryu Dojin was actively engaged in the movement together with the many Imperial Restoration enthusiasts, such as Yamagata Daisuke.He called himself Shibukawa Kyoan and devoted the rest of his life to reading and writing prose and poetry or drawing. His favorite subjects for drawing were grapes and falcons. 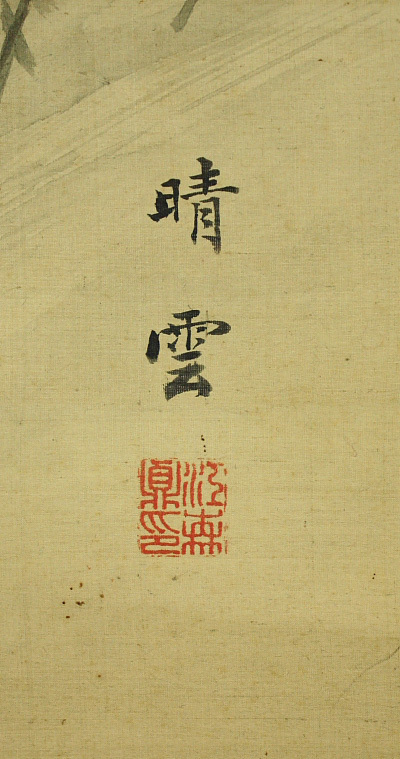 The artist Tsubaki chinzan was a pupil of the bunjin master Watanabe Kazan(1793-1841). Following his teacher. 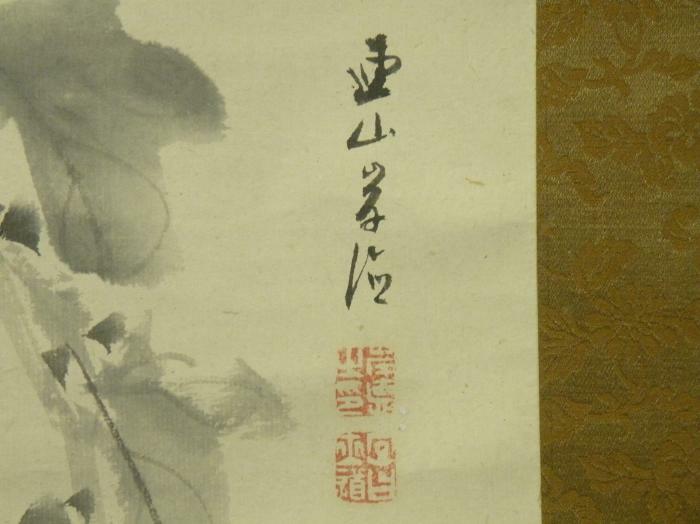 Chinzan painted portraits flowering plants and flower-and-bird pictures. While his paintings have a realism based on sketches from life, he also aimed to capture the poetic spirit of the subject. 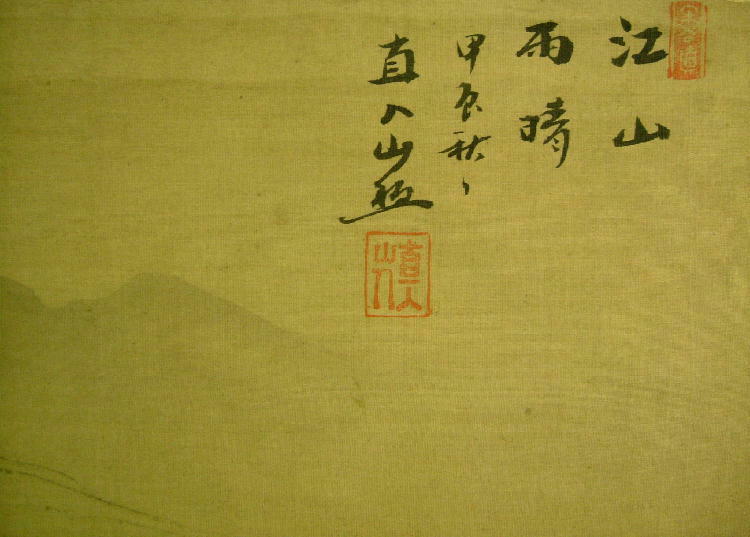 The artist Tsubaki chinzan was a pupil of the bunjin master Watanabe Kazan(1793-1841). Following his teacher. 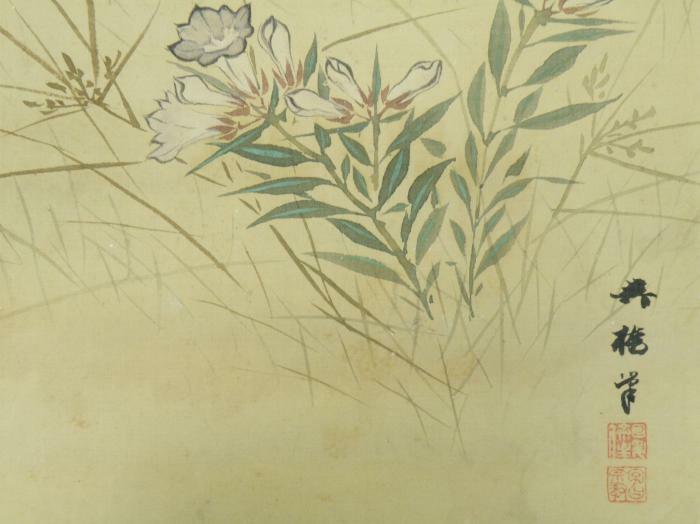 Chinzan painted portraits flowering plants and flower-and-bird pictures. While his paintings have a realism based on sketches from life, he also aimed to capture the poetic spirit of the subject. 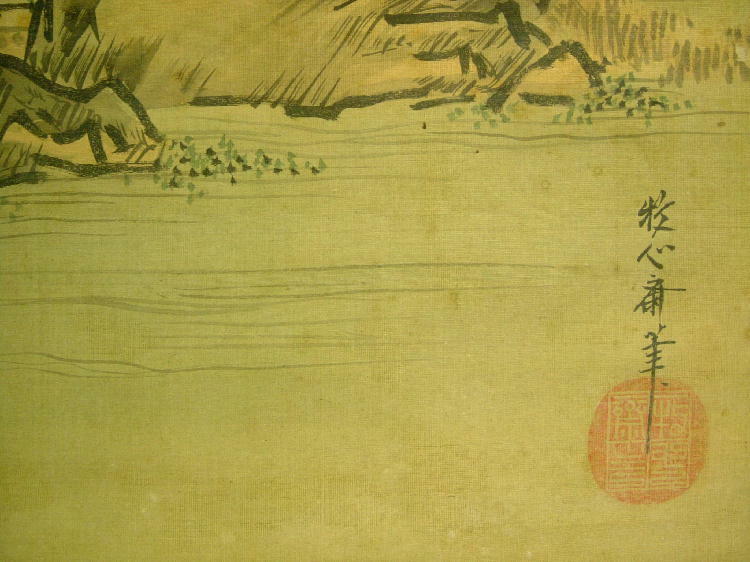 Tenshō Shūbun (周文) (died c. 1444–50) was a Japanese Zen Buddhist monk and painter of the Muromachi period. He was born in the late 14th century in Ōmi Province and became a professional painter around 1403, when he made a voyage to Korea. He returned to Japan in 1404 and settled in Kyoto, then the capital city. He became director of the court painting bureau, established by Ashikaga shoguns, who were influential art patrons. 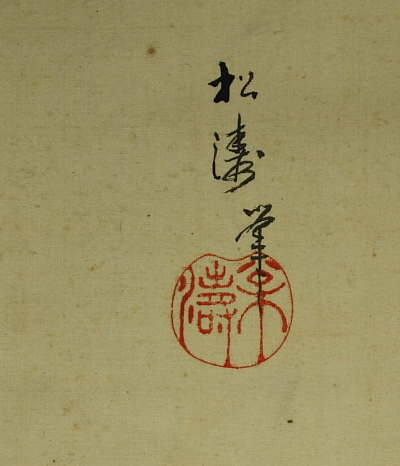 After attaining this position, Shūbun used his new powers to promote suiboku ink painting. 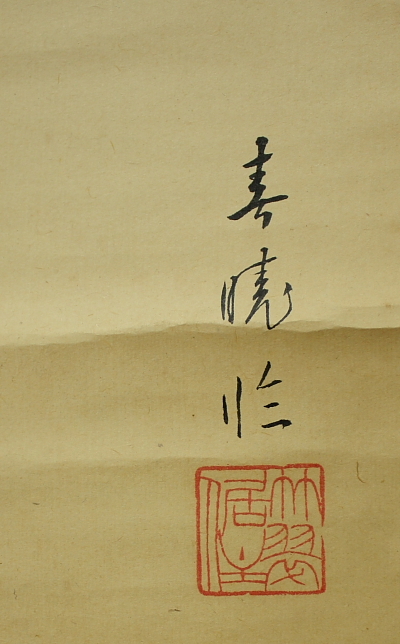 Throughout his life, Shūbun was associated with the famous Zen Buddhist temple, Shōkoku-ji. 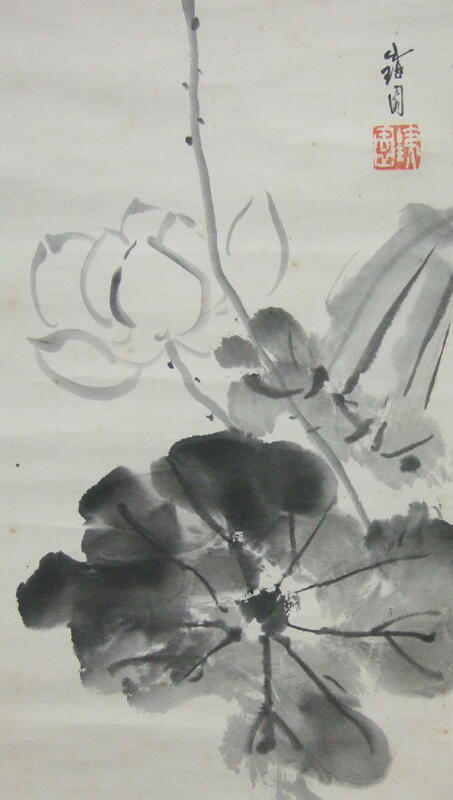 Early in his career, he studied painting there under Josetsu, a Chinese immigrant who became the father of the new Japanese ink painting tradition. 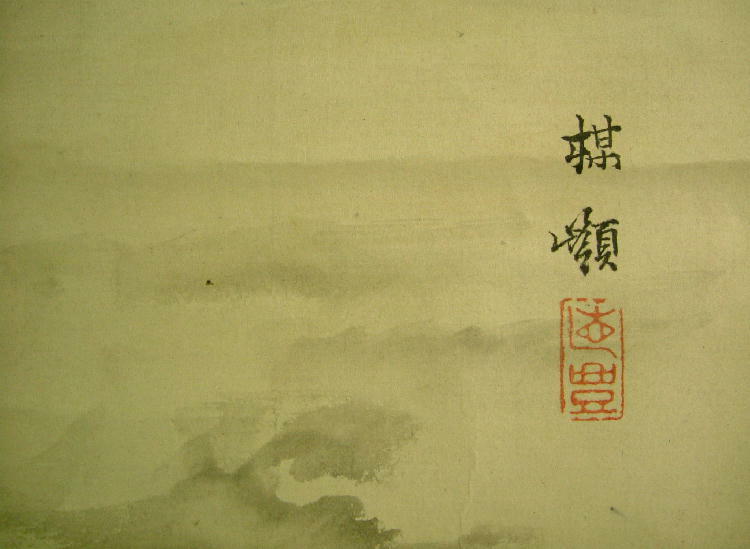 Under Josetsu’s influence, Shūbun started studying Chinese Song Dynasty painting by masters such as Xia Gui and Guo Xi; consequently, Shūbun’s style was an intermediate step between early Japanese artists who imitated Chinese models very closely, and later artists, who developed a national style. Later in life, Shūbun became overseer of buildings and grounds at Shōkoku-ji. In the 1440s he taught the young Sesshū Tōyō, who became his best pupil and the most highly regarded Japanese artist of his time. 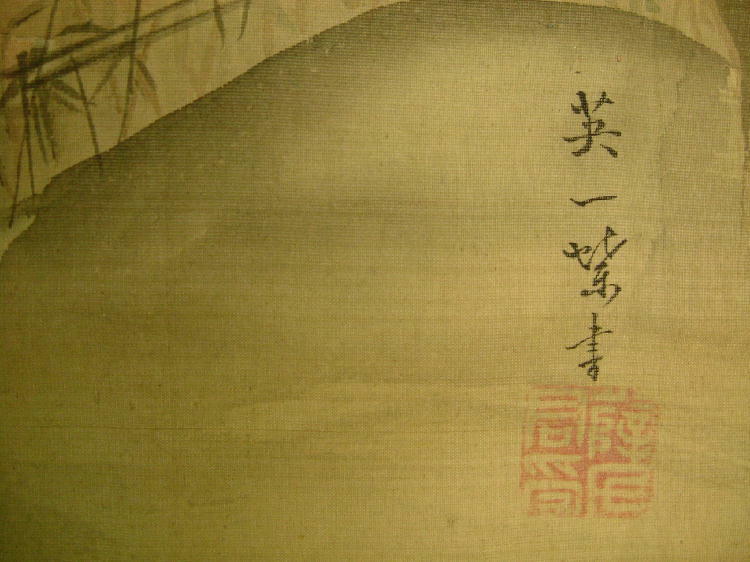 Another important pupil may have been Kanō Masanobu, who succeeded Shūbun as the chief painter of the Ashikaga shogunate, and also founded the Kanō school of painting. 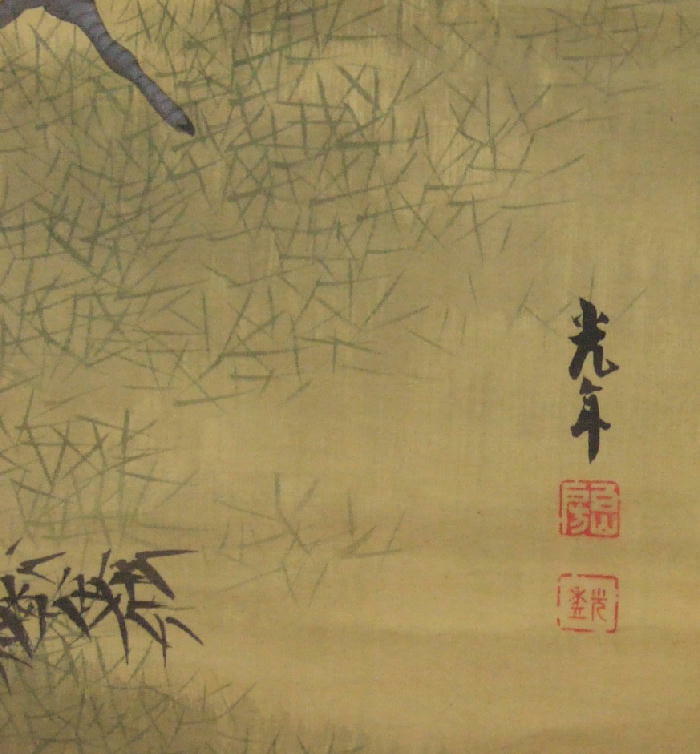 Shūbun’s most well-known painting, designated as a National Treasure in Japan, is Reading in a Bamboo Grove, now kept in the Tokyo National Museum. 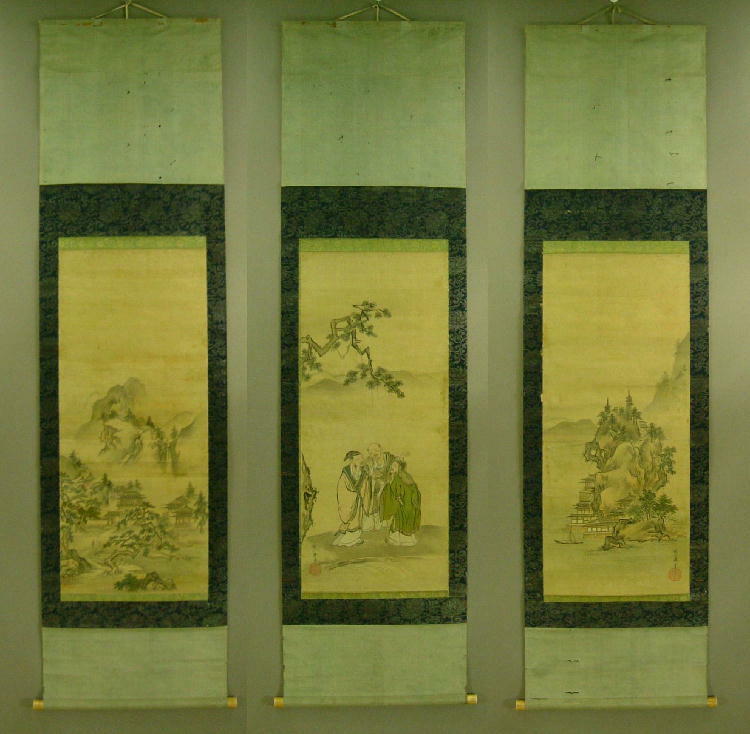 The same museum houses a few other works attributed to Shūbun, among them a large scroll of the Four Seasons type (Landscape of Four Seasons). 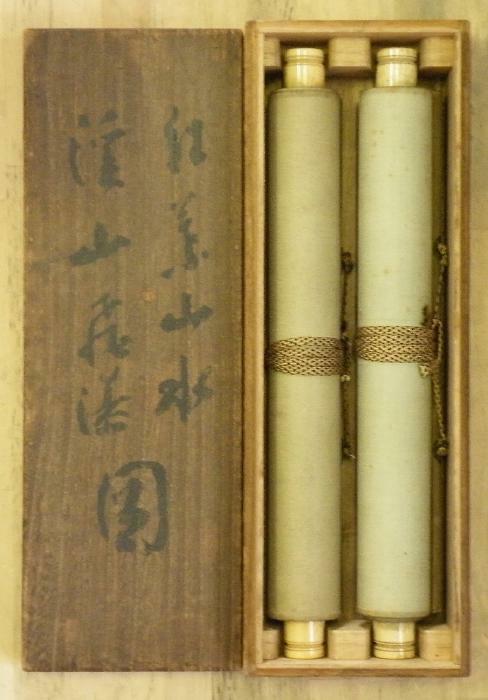 Two more Four Seasons scrolls are in the Seikado Foundation collection. 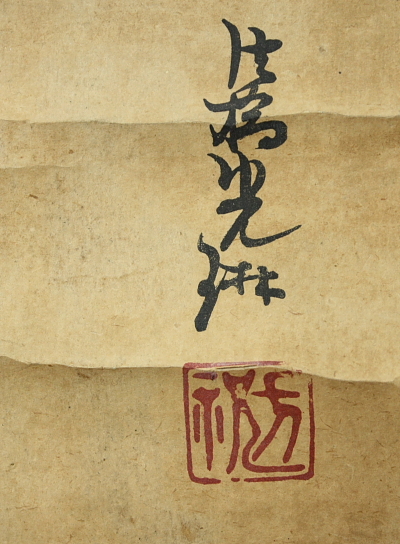 As with many Japanese and Chinese artists of this and earlier periods, many works survive that are attributed to Shūbun, but only for a few is this attribution secure. 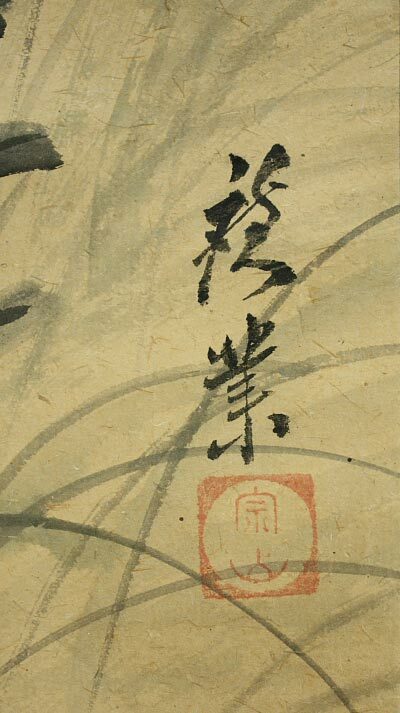 Contemporary accounts describe Shūbun as a very versatile artist, yet the only extant works with the authorship issue resolved are landscapes. Tetsuen Sakuma(1850－1921). He is a very famous Japanese painter from Ibaraki prefecture.He studied under the great painter “Keikoku Gejo”, and raised the fame. Togashi Keido (1876-????) He was born in Akita prefecture.He studied painting under Imao Keinen. 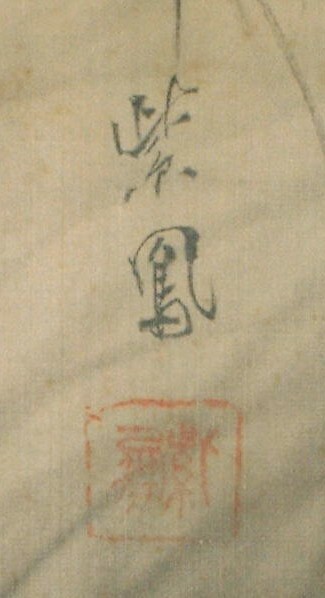 Tosa Mitsuchika (????-1725?) He was a second son of Tosa Mitsuoki.His older brother is Tosa Mitsunari.He worked at Bingo Fukuyama clan.His another name were Soken-sai & Ryosen. precise date of birth & death are unknown. 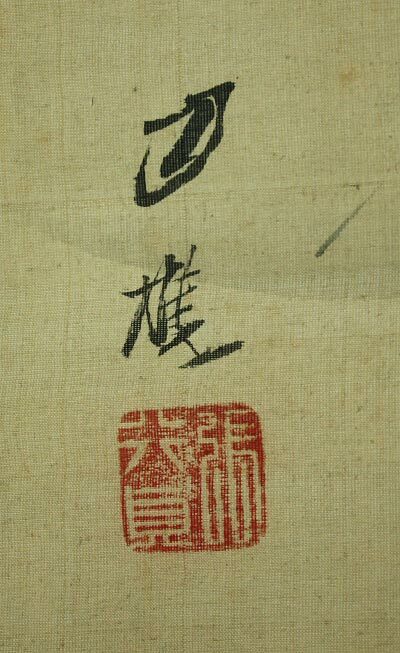 Tosa Mitsusada (1738-1806) Tosa painter. Second son of Mitsuyoshi Tosa, younger brother of Mitsuatsu. In 1754, became Edokoro Azukari. 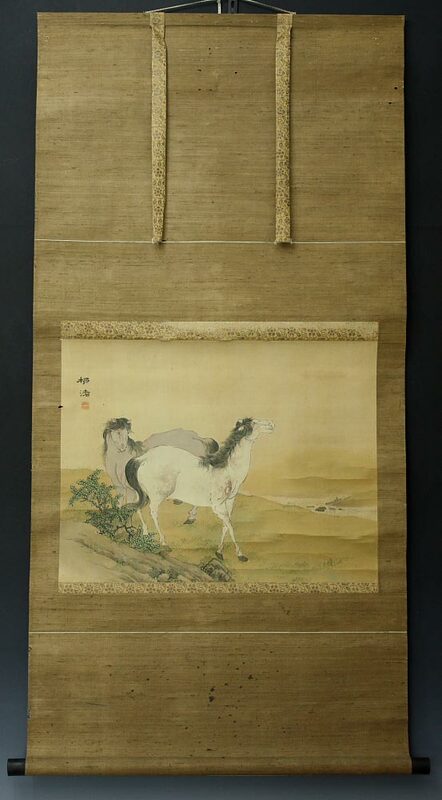 In the 1760s painted Fusuma for the court, and in 1789, when the Kyoto Imperial Palace was being remodeled, was again called on to paint Fusuma. 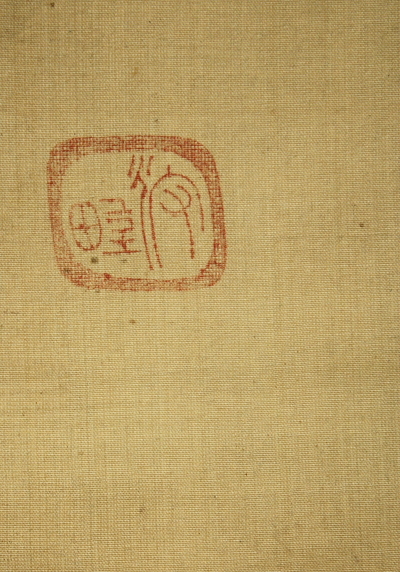 Left a number of admirable copies of ancient Chinese paintings. An adequate painter and a staunch exponent of the Tosa tradition, creating a temporary revival of the Tosa school. Tanaka Totsugen (1767-1823) He was born in Aichi Pref. He was the Fukko yamato-eha artist. He learned painting under Ishida Yutei, Tosa Mitsusada. Ukita ikkei & Watanabe Kiyoki were his pupils. Tosa Mitsunari (1647-1710)He was an eldest son of Tosa Mitsuoki.His young brother is Tosa Mitsuchika He became an Edokoro Azukari (‘head of the court painting bureau’) in 1681. Tosa Mitsuzane (1780‐1852)Japanese artist.He studied painting with his father Mitsuoki Tosa. He died in 1852 at the age of 73.Tosa painter. Second son of Tosa Mitsuyoshi, younger brother of Mitsuatsu. In 1754, became Edokoro Azukari. 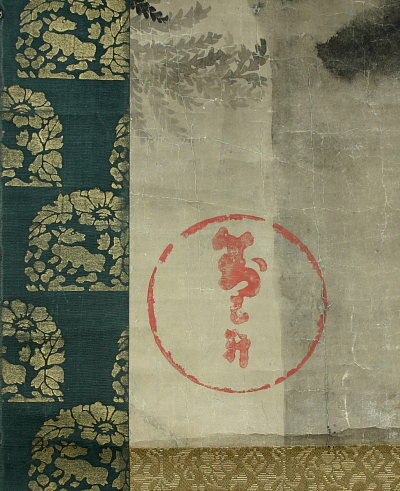 In the 1760s painted Fusuma for the court, and in 1789, when the Kyoto Imperial Palace was being remodeled, was again called on to paint Fusuma. 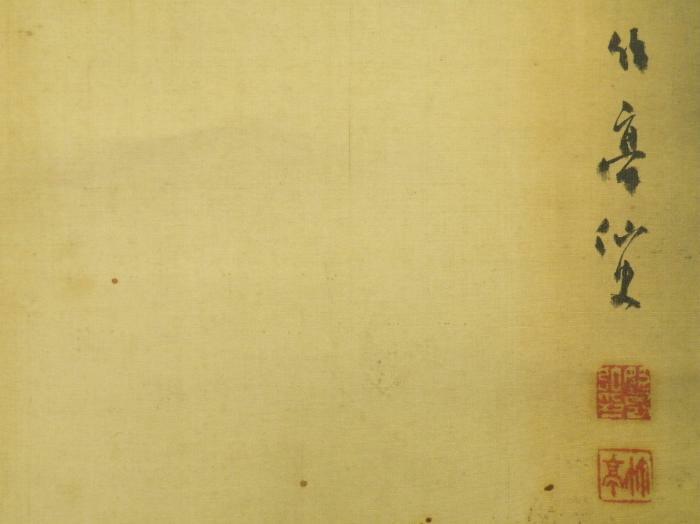 Left a number of admirable copies of ancient Chinese paintings. An adequate painter and a staunch exponent of the Tosa tradition, creating a temporary revival of the Tosa school. 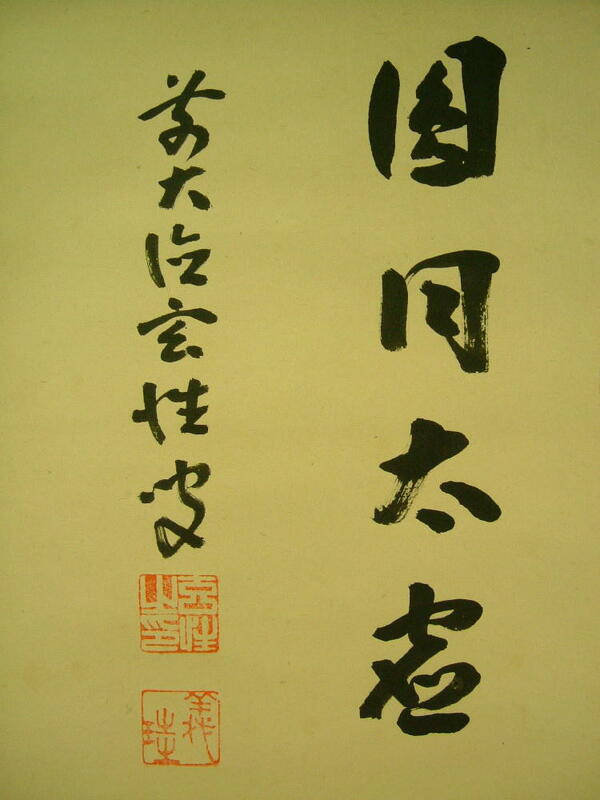 Toshikura Gunjo (1911-)Born in Osaka.He studied under Domoto Insho. He exhibited at the Nitten, Nisshun-ten,and Bunten where he was awarded several prizes for his work. Totoki Baigai (1749-1804)He was a Confucianism person in the middle Edo period,he was also a Calligrapher and a painter,born in OSAKA. Toyohiko Okamoto(1773-1845). He is a very very famous Japanese painter from Okayama prefecture. He was a pupil of great painter Goshun Matsumura. And he brought up many great painters.Great Zeshin Shibata and Bunrin Shiokawa are his pupil. 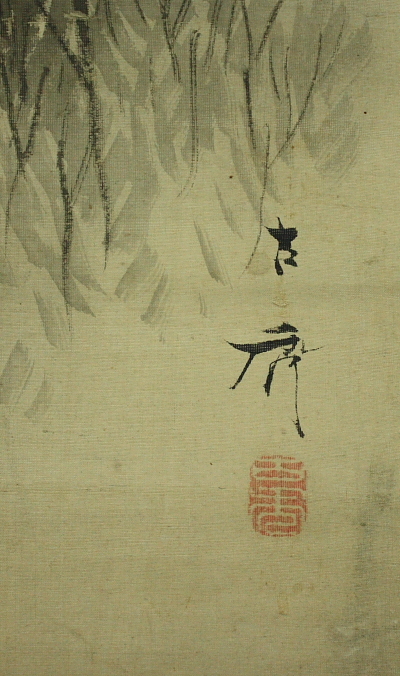 Tsukioka Settei (1710 – 1787)Japanese painter, born in Kyoto. He was a pupil of Kano school paintier ,Takata Koho. He later became UKIYOE painter and went to Osaka. Tsubaki chinzan (1801~1854) The artist Tsubaki chinzan was a pupil of the bunjin master Watanabe Kazan (1793-1841). 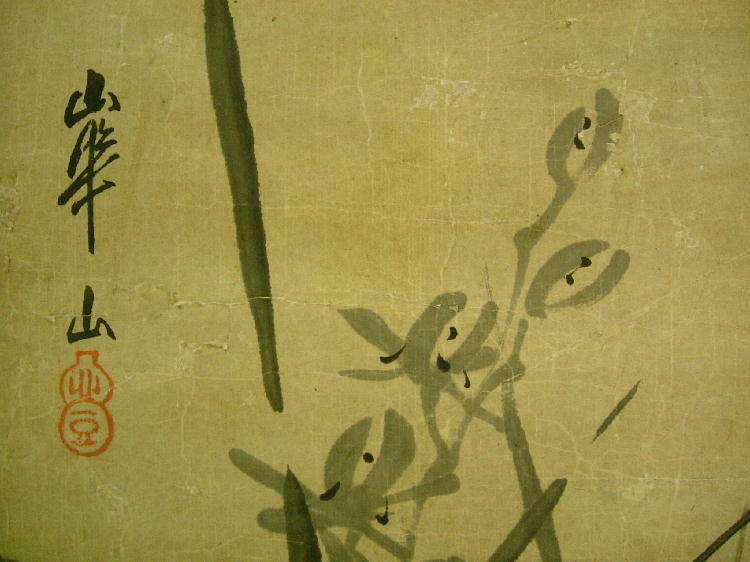 Following his teacher, Chinzan painted portraits flowering plants and flower-and-bird pictures. While his paintings have a realism based on sketches from life, he also aimed to capture the poetic spirit of the subject. Born as the second son under the Hatamoto Yari-gumi doushin group, Tsubaki Kaemon Sadashige (his father) . Due to his father’s death, Chinzan learned traditional martial arts inheriting the Hatamoto Yari-gumi doushin at age 7. In order to maintain himself in many ways, Chinzan began to learn art under Kaneko Kinryo the famous artist following Shen Nan pin’s style of painting. However, due to his master’s sudden death, Chinzan moves on to study under Tani Buncho. At age 17, he learns about Watanabe Kazan and instantly enters his school of painting. 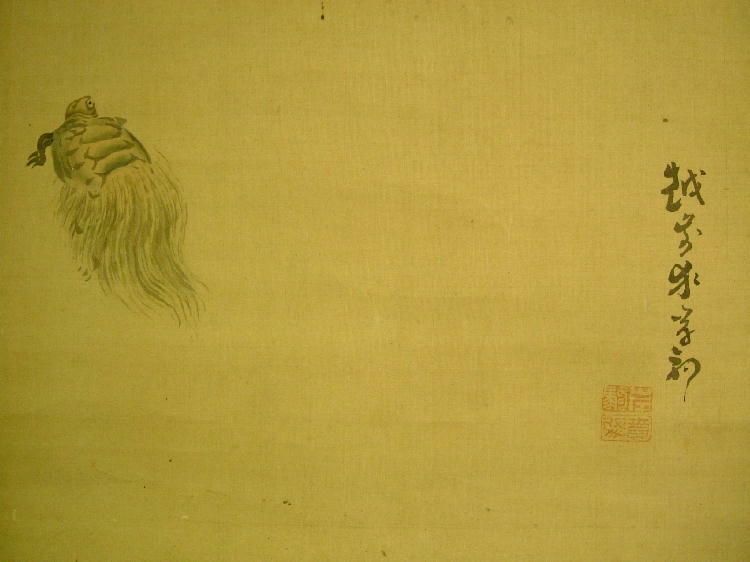 At first one of Kazan’s disciples criticizes Chinzan that he lacked the skill to paint. 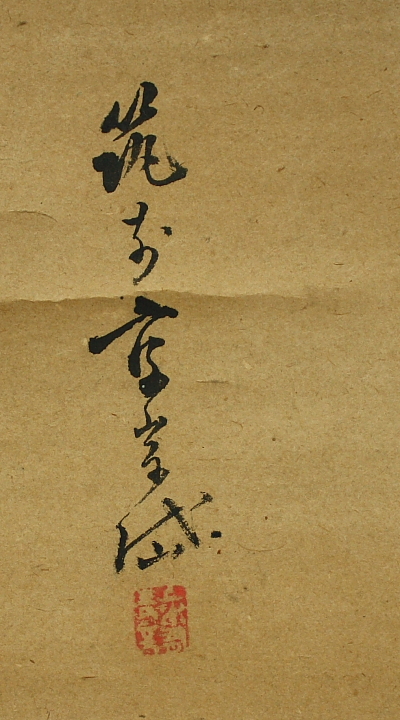 Chinzan never gave up but continued to practice his painting skill in hopes to improve his techniques, and his master Watanabe Kazan knew of Chinzan’s efforts and commented that he would one day become a noted painter. Chinzan faithfully uses Kazan’s realist style, while using subtle colors and soft brush strokes. He was known to have painted, flower-bird, insects, and human subjects. 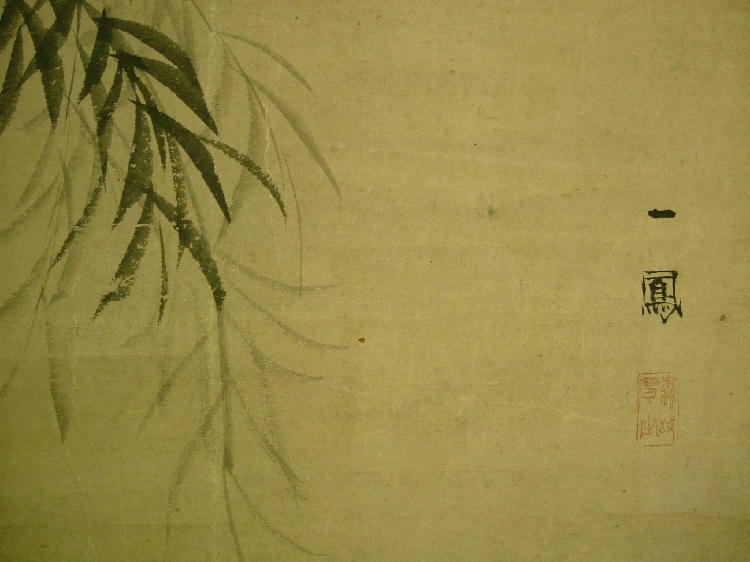 Chinzan was also famous for his skills in poetry, sencha ceremony, and the Shou (Sheng). Chinzan also became famous for his moral standards where he never drank alcohol, go to any brothel, no smoking, playing less, eating less, sleeping less, speaking less, rubbing ink less, using the brush less, and using less color. Due to these standards he was called the man who does the ten lesses. In additional Chinzan was known for his filial piety, where he cared for his aging mother and when Kazan was sentenced to death for a crime during the Bansha no goku period in 1839 ( a time when criticism against the government and Western knowledge was banned in Japan) Chinzan became the center in protesting against the sentence of his master, caring for Kazan’s son and education and even making sure his master would receive a proper burial and funeral. 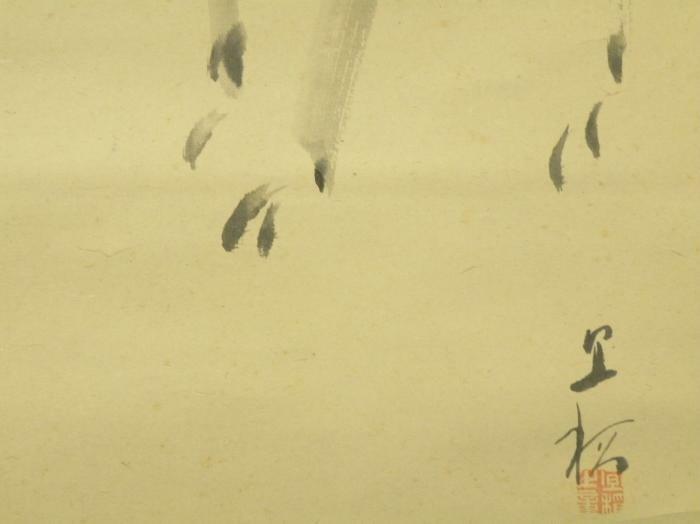 Many considered Chinzan not only as a great painter but also a man of high moral standing. Uemura Shōen (1875 – 1949) She was the pseudonym of an important woman artist in Meiji, Taishō and early Shōwa period Japanese painting. Her real name was Uemura Tsune. Shōen was known primarily for her bijinga paintings of beautiful women in the nihonga style, although she also produced numerous works on historical themes and traditional subjects. Uenaka Chokusai (1885-1977) Born in Nara prefecture,real name is Naojiro.He studied under Fukada Chokujo & Hashimoto Gaho.Also he studied Buddhist doctrine(Nichiren sect)under Tanaka Chigaku. 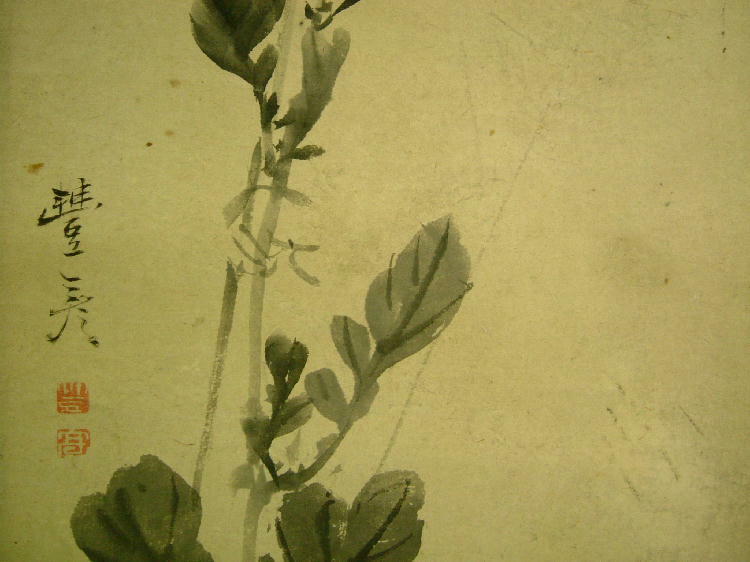 Ueda Kocho (1788-1850) Shijo school painter,born in Osaka.He studied under Matsumura Goshun&Keibun . 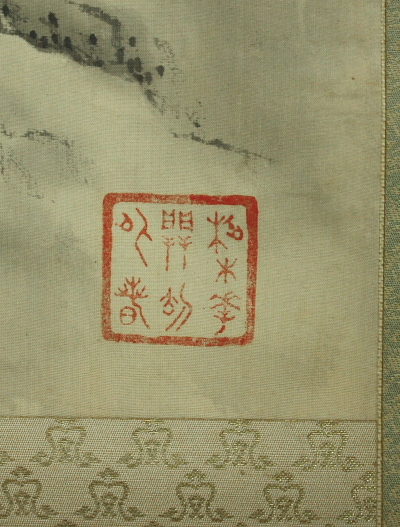 He became a goyo eshi (painter-in-residence) at the shogunal court. 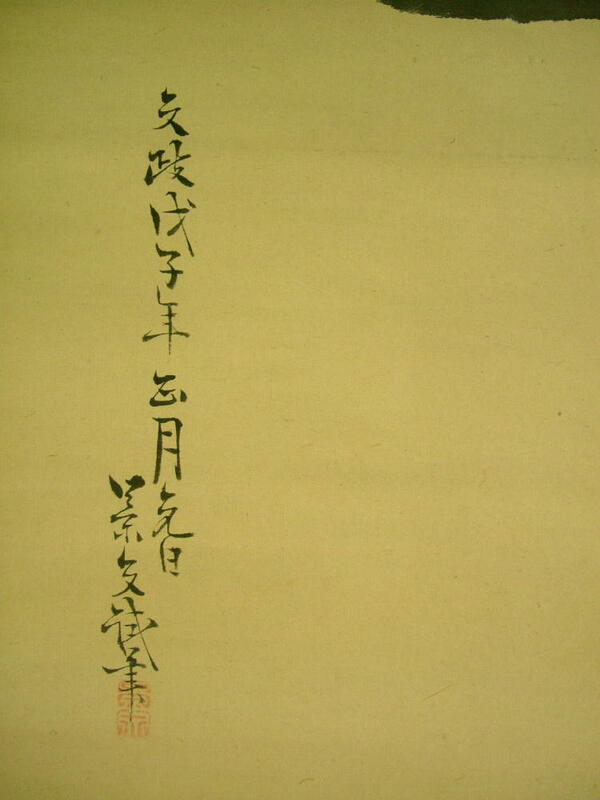 Uragami Gyokudō (1745-1820) was a Japanese musician, painter, poet and calligrapher. 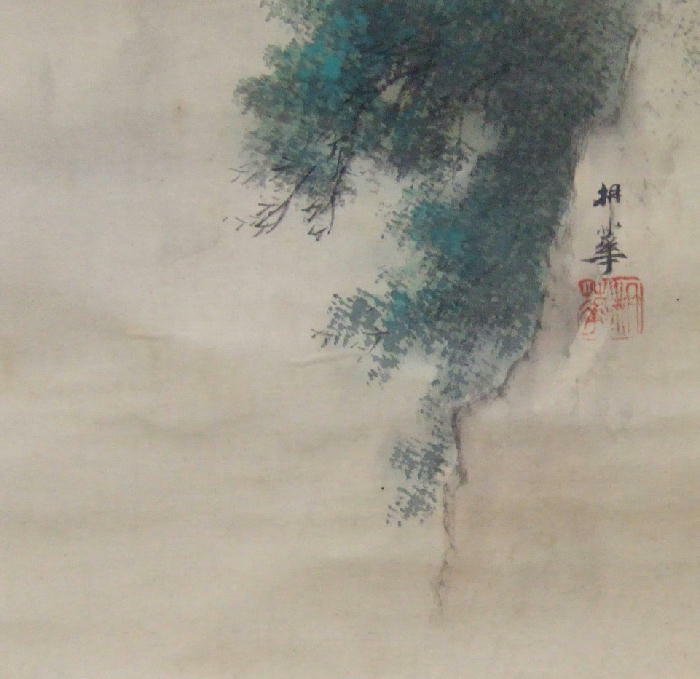 In his lifetime, he was best known as a player of the chinese seven-string zither, the guqin, but people came to appreciate his paintings after his death. Utagawa Kunisada (1786 – 1865)(also known as Utagawa Toyokuni III) He was the most popular, prolific and financially successful designer of ukiyo-e woodblock prints in 19th-century Japan. In his own time, his reputation far exceeded that of his contemporaries, Hokusai, Hiroshige and Kuniyoshi. Utagawa Toyoharu (1735-1814) was a Japanese printmaker and founder of the Utagawa school. Utagawa Toyohiro (1773-1829) Painter, woodblock print designer and book illustrator. He was a pupil of Toyoharu founder of the Utagawa school, and a fellow student and rival of Toyokuni I.
Wakabayashi Shokei (1859-????) He was born in Hiroshima prefecture.He studied Maruyama school painting under Fujii Shorin & Suzuki Shonen. He won many prizes in domestic expositions. Watanabe Gentai　(1748-1822) Japanese painter in middle EDO period, born in EDO.He studied the technique of　NANGA <Southern painting>　under Nakayama Koyo.He became a master of Suzuki Fuyo. More over, though he is known as Tani Buncho’s master, it should be thought the relation that influences rather than the master-apprentice relationship each other. 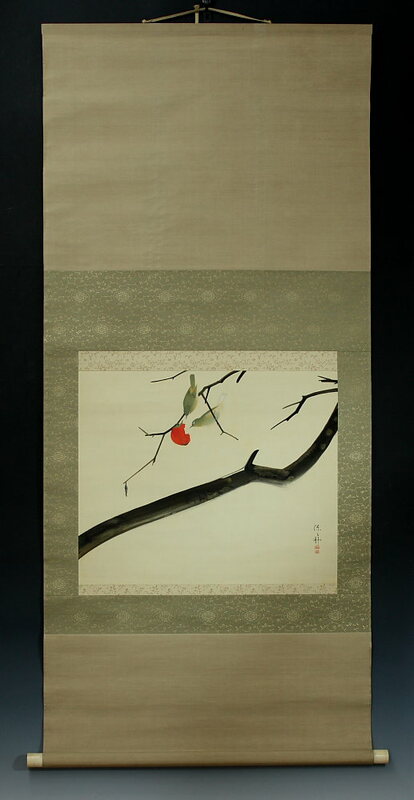 Watanabe Seitei<Shotei> (1851-1918) A well known Japanese artist, Watanabe Seitei is famous for his paintings and prints of birds and flowers (kacho-e). 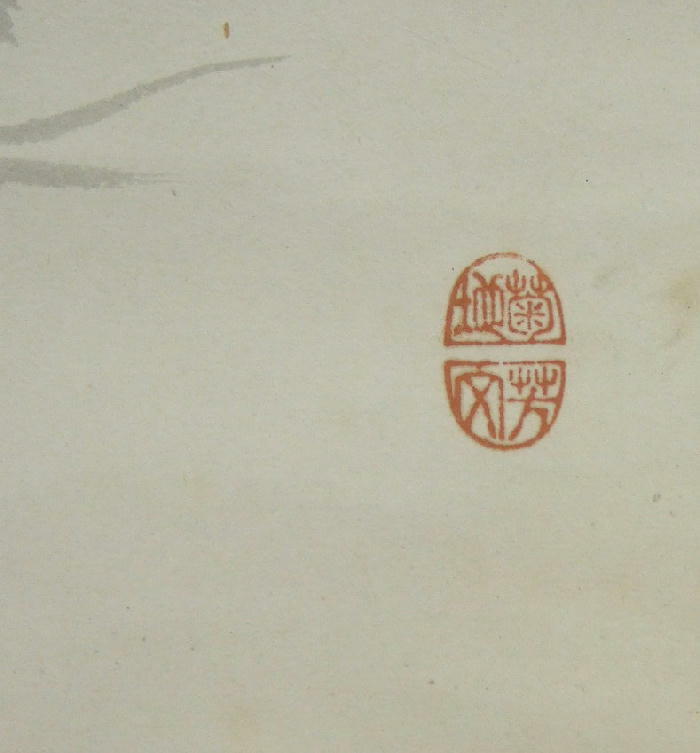 His designs combine calligraphic lines with delicate details and special attention to shading. His simple compositions are both dynamic and asymmetrical, and make good use of negative space. 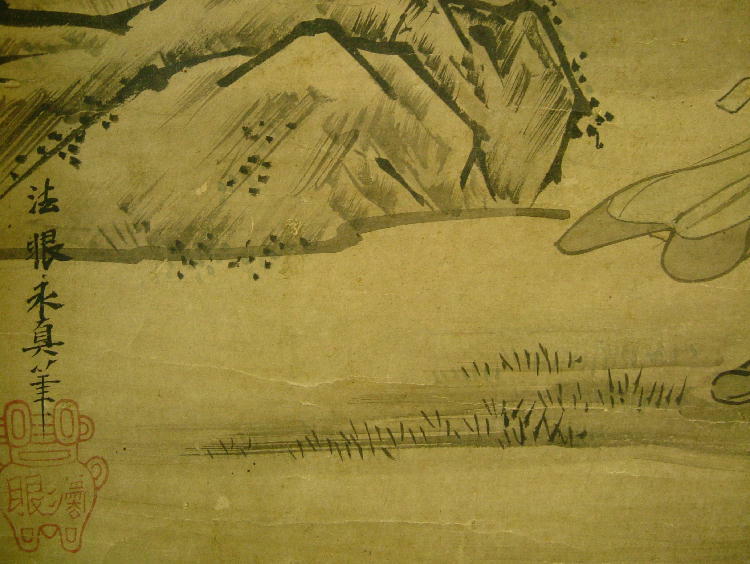 Watanabe Genshu (act middle EDO period) Japanese Nagasaki painter.His another name(GO) is Bunmei. Watanabe Shoka (1835-1887) He was born in Edo as the second son of Watanabe Kazan.He studied painting under Tsubaki Chinzan when he was 13 years old. He succeeded the family estate of the Watanabe family when he 22 years old. 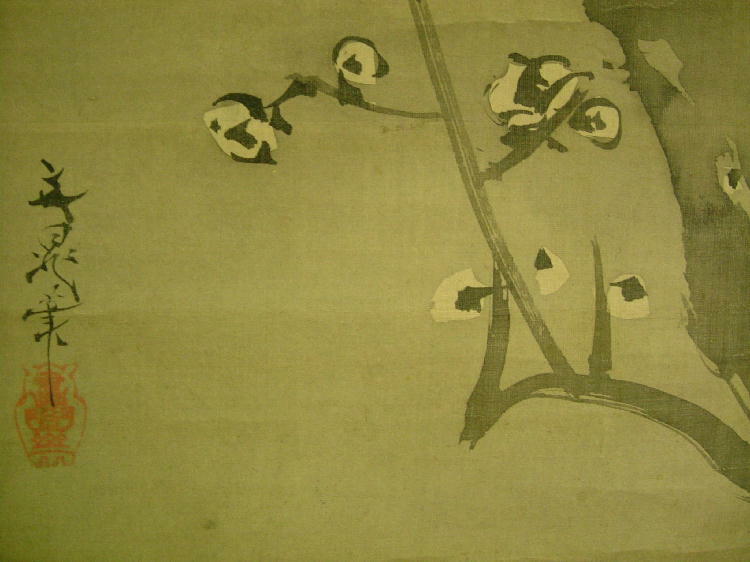 He built the original world in the flower and bird pictures, and had a big influence on a lot of painters. 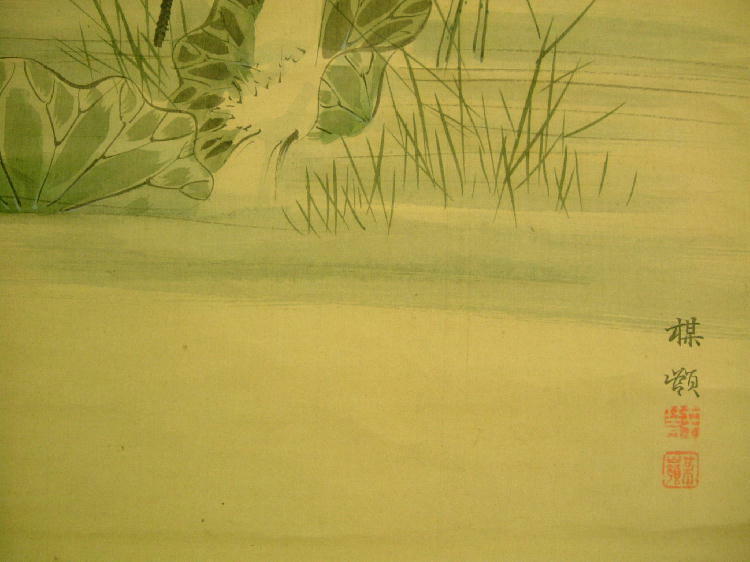 Yabuta Bunki (act 1818‐44) He was an Ukiyoe painter, acted in Kyoto. Yaguchi Kensai (1817-1879) He was born in Saitama prefecture.His real name was Hiroshi Morita.He was a confucian scholar. He studied orthodox Neo-Confucianism later.He joined Boshin war (1868–1869) at Goryokaku with Nagai Naoyuki (1816- 1896). YAMAMOTO BAIITSU (1783-1856) Japanese painter. He was the son of a sculptor, who worked for the Owari clan. He probably first studied with Yamamoto Ranei, a minor Kano school artist, who later switched to painting ukiyoe (‘pictures of the floating world’). Another possible early teacher was Yamada Kyujo (1747-93), a prominent exponent of literati (Jap. 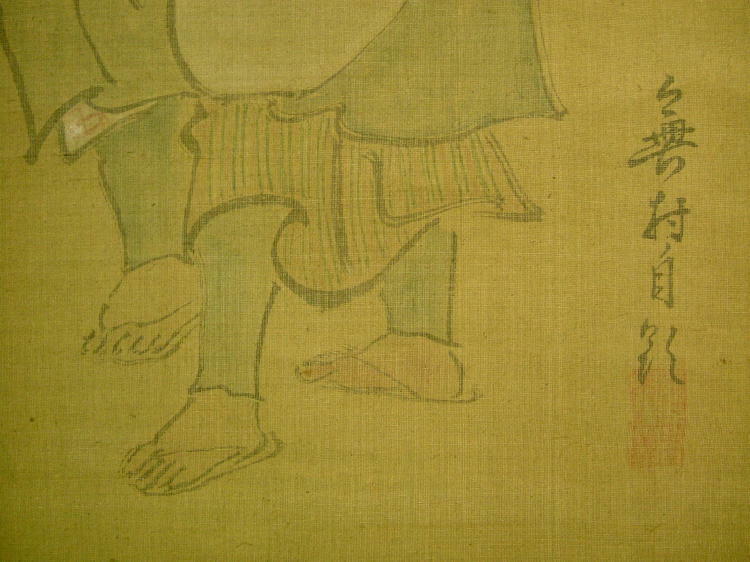 Nanga or Bunjinga) painting in Nagoya, who died when Baiitsu was only ten years old. 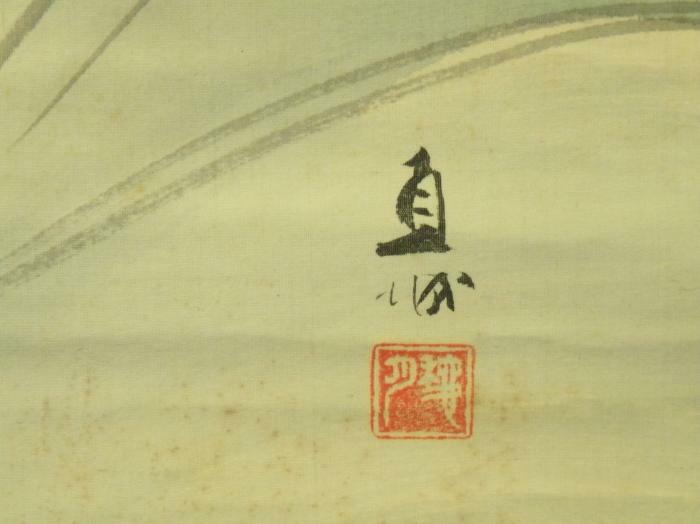 It is more likely that Baiitsu studied under Cho Gessho (1770-1832), a Shijo school painter. Yamamoto Baiso (1846-1921) Nanga painter,born in Owari(Nagoya prefecture).He studied under Nukina Kaioku & Mitani Setsuen.Baiso was called ‘Three Great Painter’ in country with Kodama Katei & Yoshitsugu Baizan. Yamanouchi Shinichi (1890-????) He was born in Kyoto.He studied under Nishiyama Suisho. 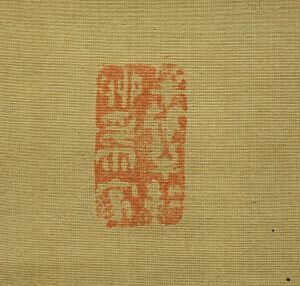 He exhibited at the Bunten and Nitten,Teiten where he was awarded several prizes for his work. 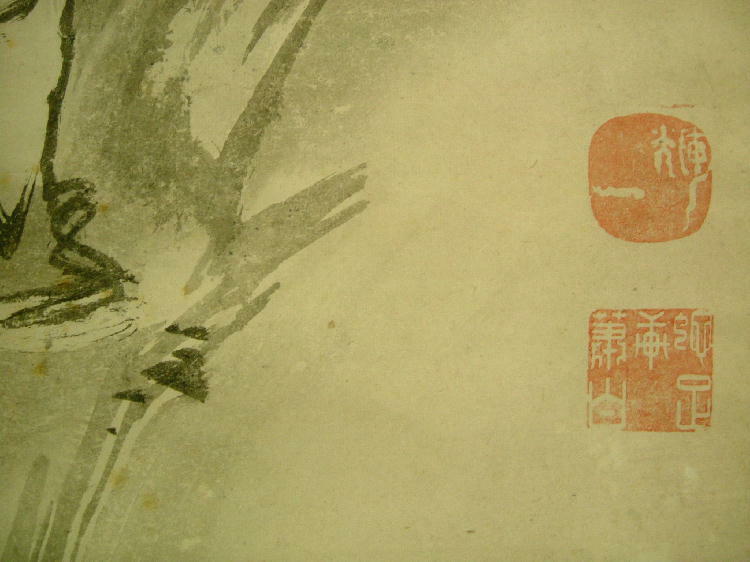 Yamanouchi Shungyojin (1904-1991) Born in Tokushima prefecture.He studied under Nakamura Teii. He won some prizes in domestic expositions. Yoshitsugu Baizan (1846 – 1915) NANGA painter.He was an eldest son of Yoshitsugu Baisen.Real name is Tastutaro.His another name is Shiji, Sodojin,Koko,Dokuhi-o,Dokusho-koji and Sashu Baizan. He was a pupil of Honda Chikudo,Hirose Tanso and Nakanishi Koseki. Yokoyama Seiki： A painter of the Shijo school of the Edo latter period.He was born and raised in Kyoto.He learned a painting of the Shijo school from Matsumura Keibun(1779-1843)but it is also said that he learned from Emura Shunpoin another view.He was good at a painting of flowers and birds,landscape painting and person image.He was praised as Heianshimeike with Kishi Renzan(1804-1855), Shiokawa Bunrin(1801-1877),and Nakajima Raisho(1796-1871).In Tozansyunju art exhibition known as a periodical art exhibition first in Japan,he played an active part as a substantial operator in the center of painting circles of Kyoto. Yamanouchi Katsuharu (act 19th sentury) He was a pupil of Kano Tadanobu(1823-1880).He was an adopted son of Yamanouchi Ison. 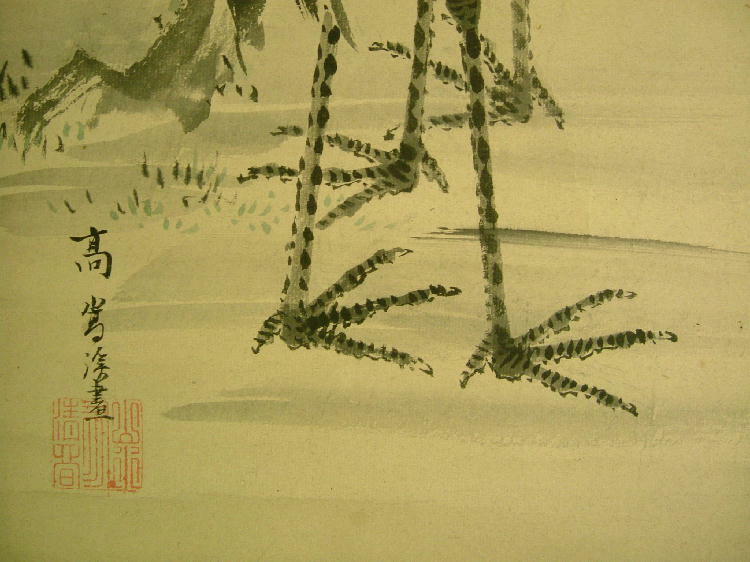 He became a goyo eshi (painter-in-residence) at the Mito clan.He painted figure paintings, Flower & Birds very well. Yamanouchi Shinichi (1890-????) He was born in Kyoto.His real name is Shinichiro. He studied under Nishiyama Suisho. 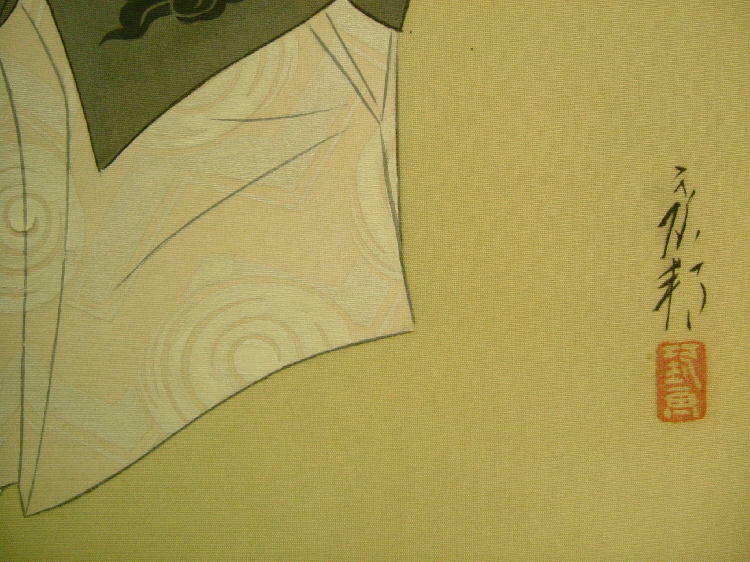 Yokoyama Seiki： A painter of the Shijo school of the Edo latter period.He was born and raised in Kyoto. He learned a painting of the Shijo school from Matsumura Keibun(1779-1843) but it is also said that he learned from Emura Shunpoin another view. 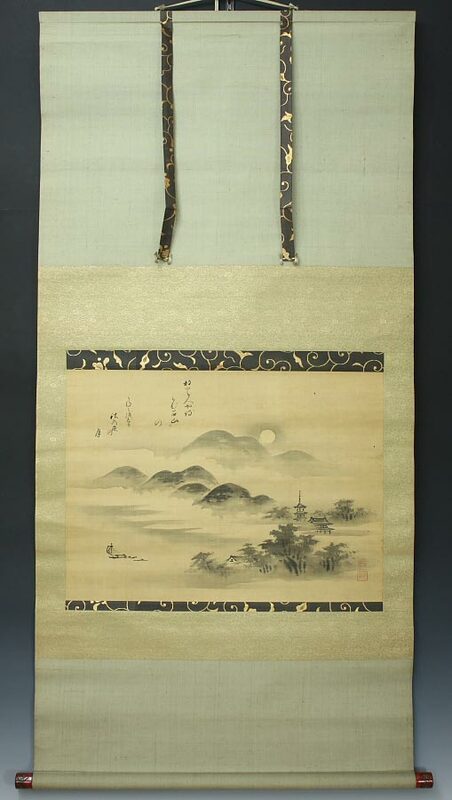 He was good at a painting of flowers and birds,landscape painting and person image.He was praised as Heianshimeike with Kishi Renzan(1804-1855), Shiokawa Bunrin(1801-1877),and Nakajima Raisho(1796-1871). 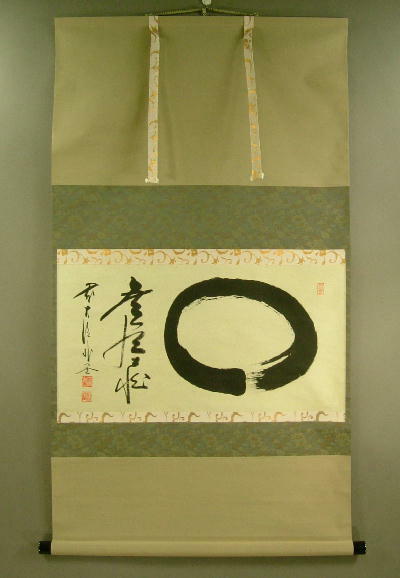 In Tozansyunju art exhibition known as a periodical art exhibition first in Japan, he played an active part as a substantial operator in the center of painting circles of Kyoto. Yoshimura Koichi (1817-1874) He was a grandchild of Yoshimura Kokei.He studied painting under his father Yoshimura Kobun. He lived in Kyoto. 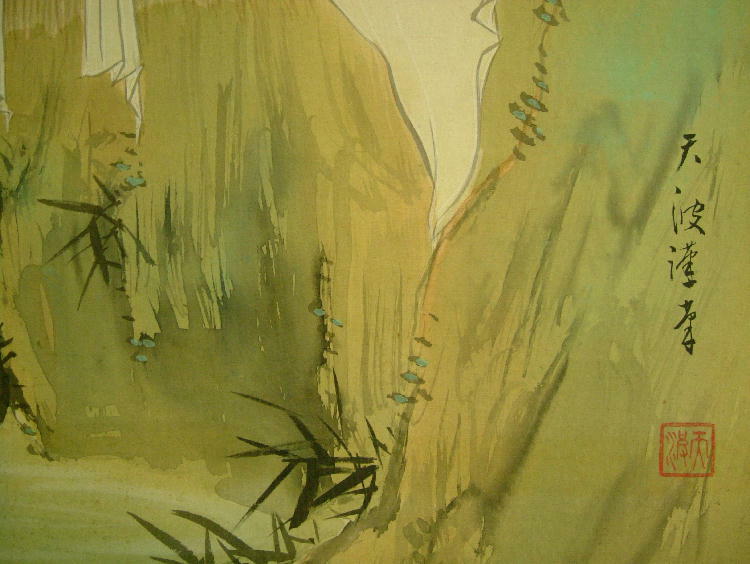 Yukimatsu Shunpo(1897-1962) Bour in Oita prefecture.He studied paintings under Himejima Chikugai & Mizuta Chikuho.He exhibited TEITEN & NITTEN as a Nanga painter. Yumeji Takehisa ( 1884-1934 ). He is one of the most famous Japanese painter. And he is good at a painting of beauties. 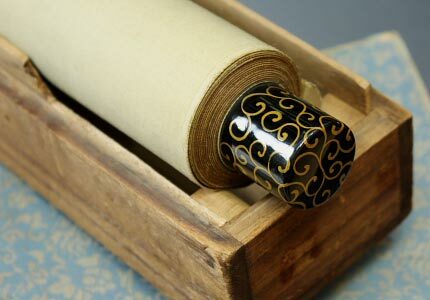 Al, I have written you a note with a number of photos of Japanese scrolls I would love to send you. If it is ok, can you please send me your email address or some means to send you a word document. It is 14 megs in size! Hi John, and welcome. I would love to have anything you can send me. My email is down right now for maintenence. I will get you an email very soon. 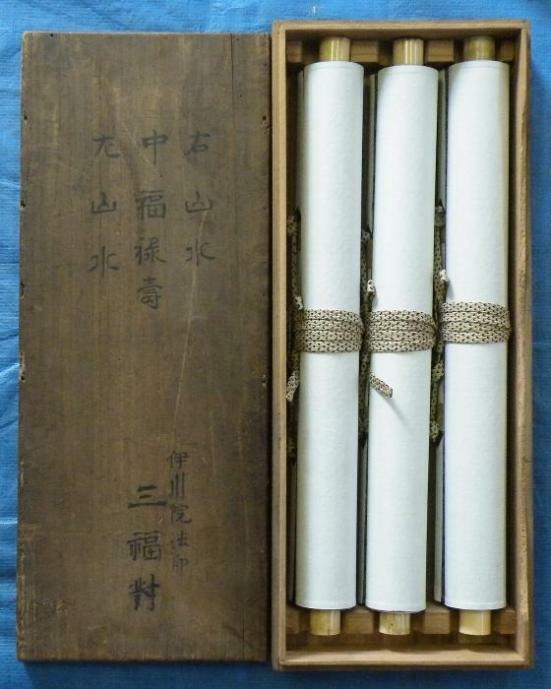 I have found 2 very old Japanese scroll paintings while cleaning a relatives house and am wondering if anyone could help me identify them. 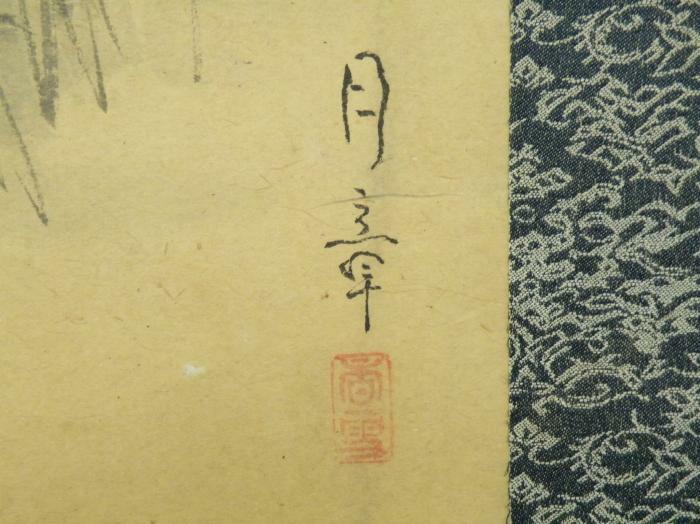 I believe the signature is something like “Torei”. Thanks!